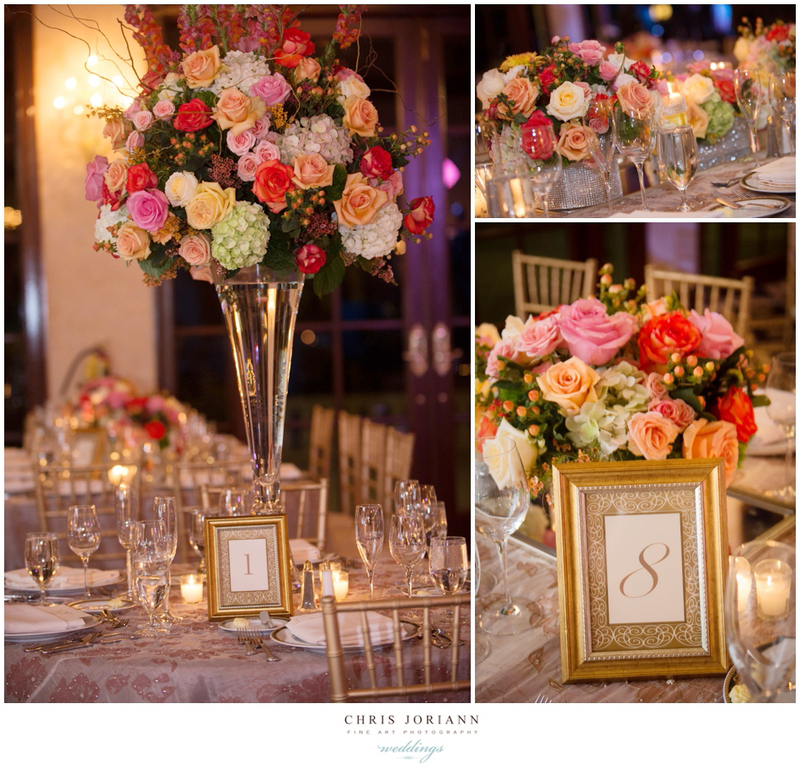 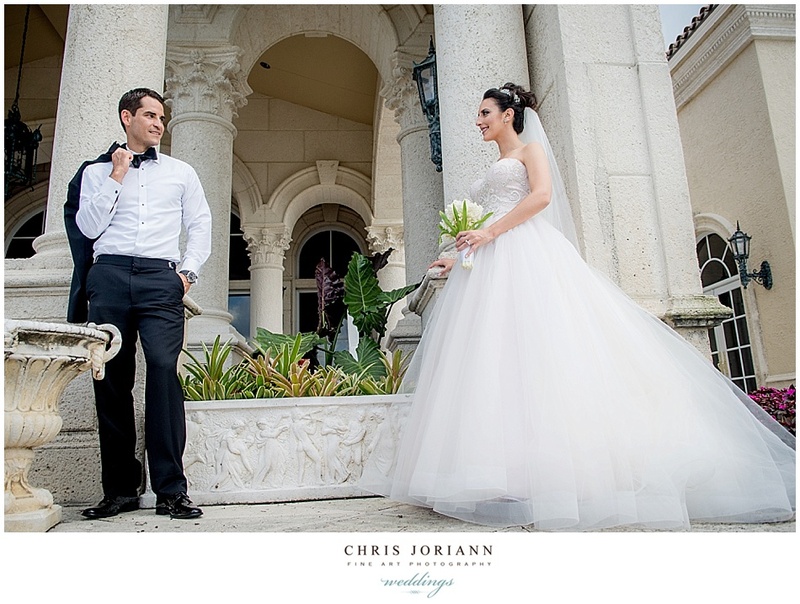 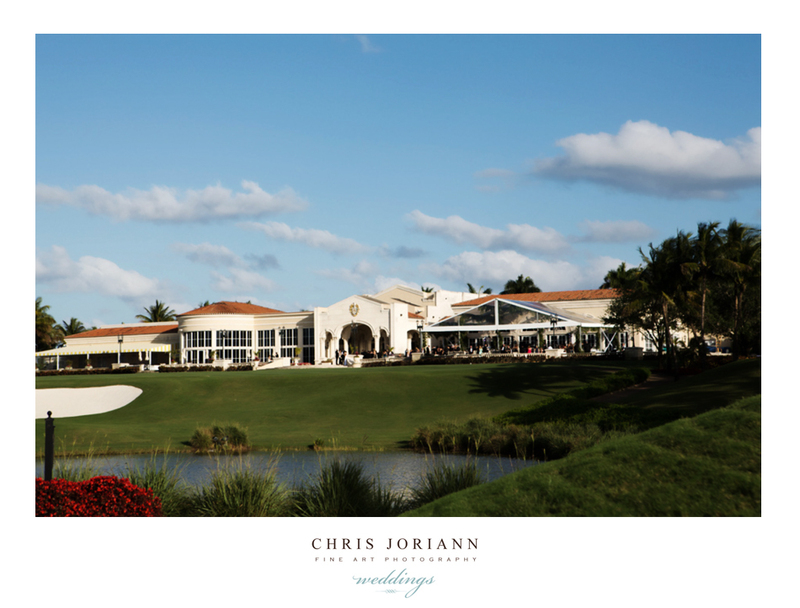 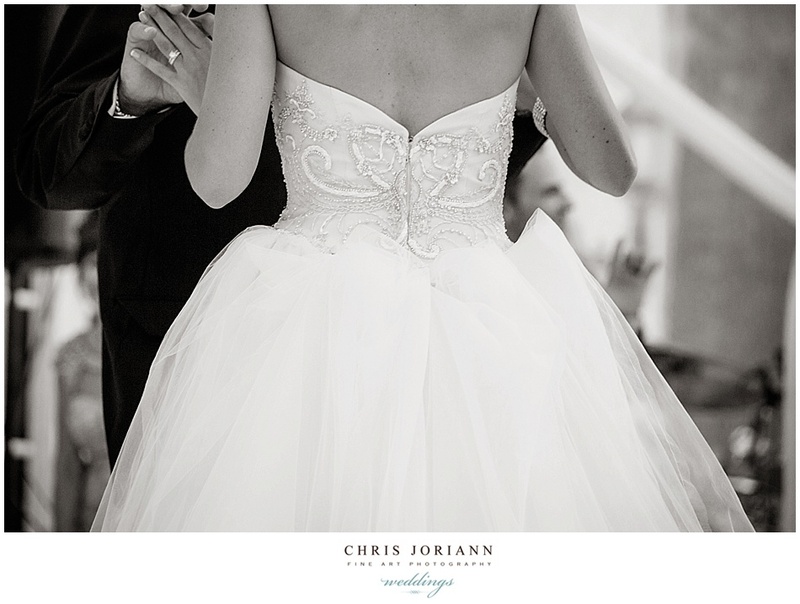 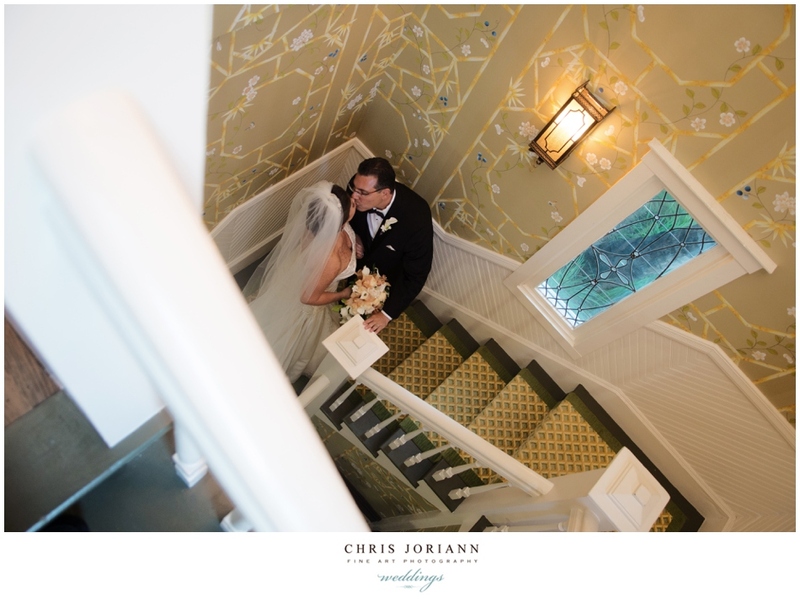 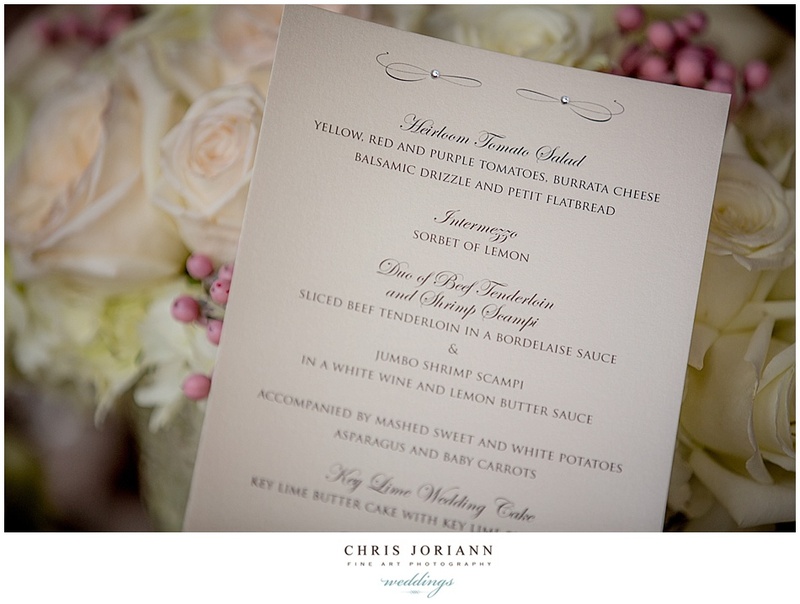 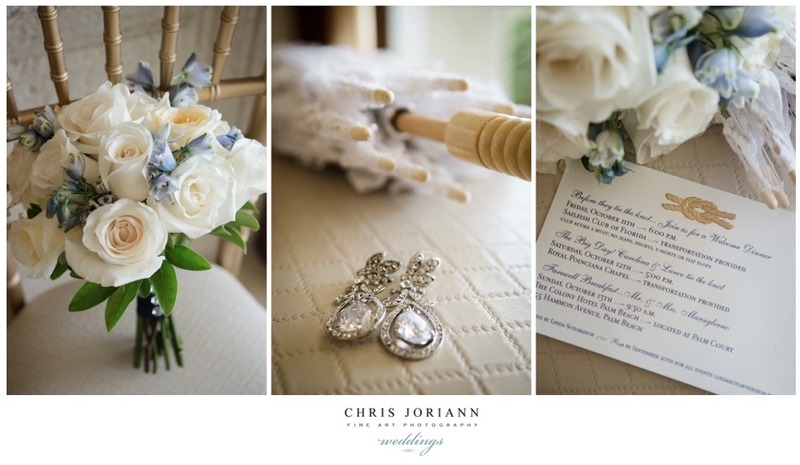 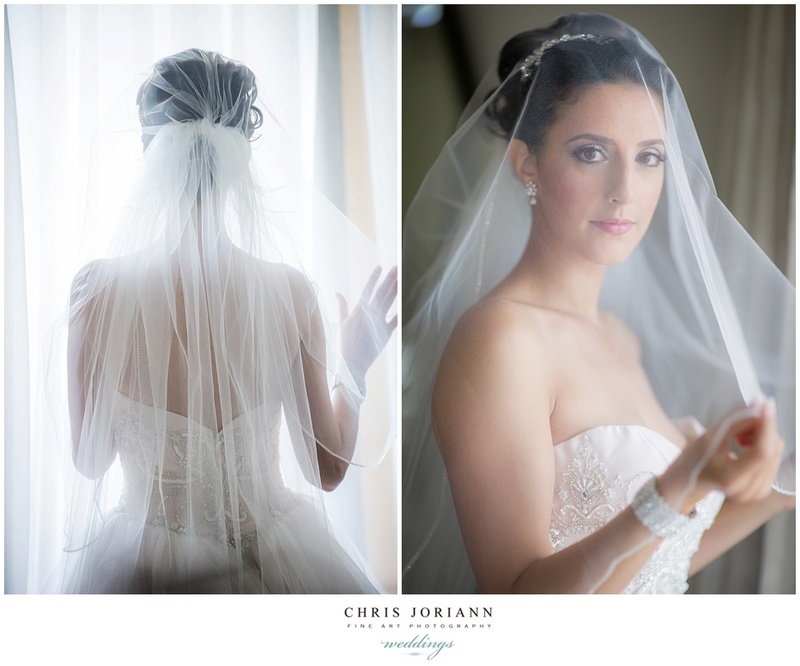 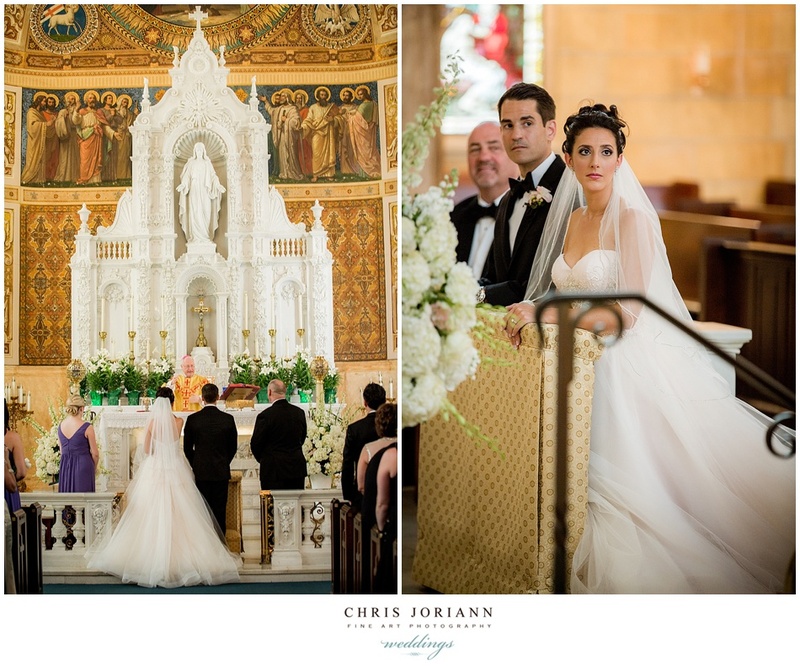 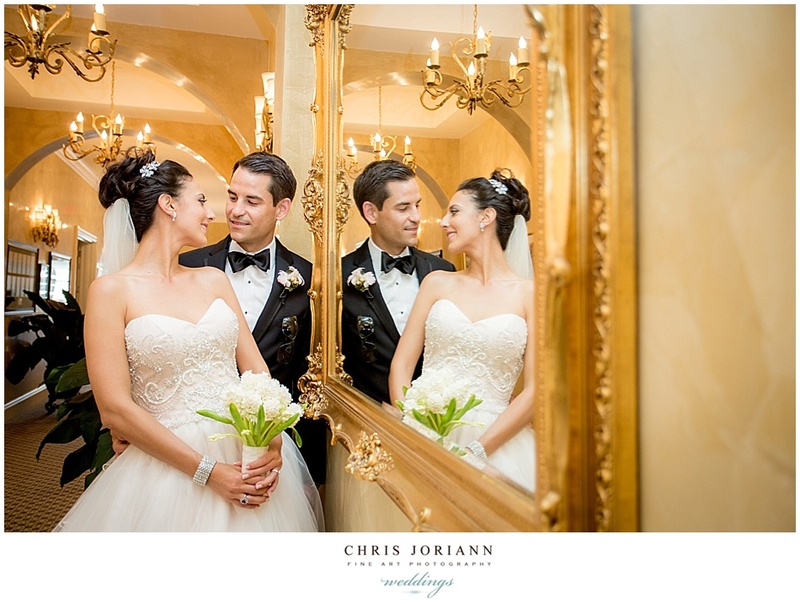 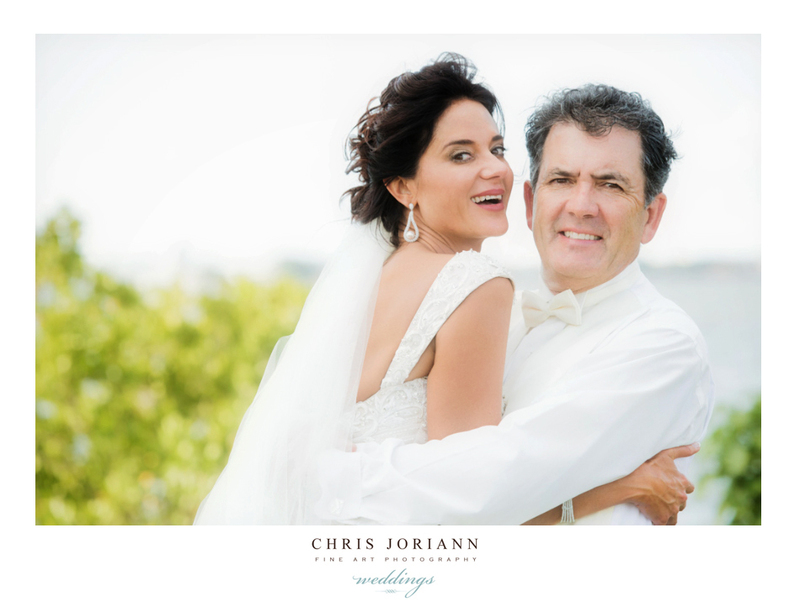 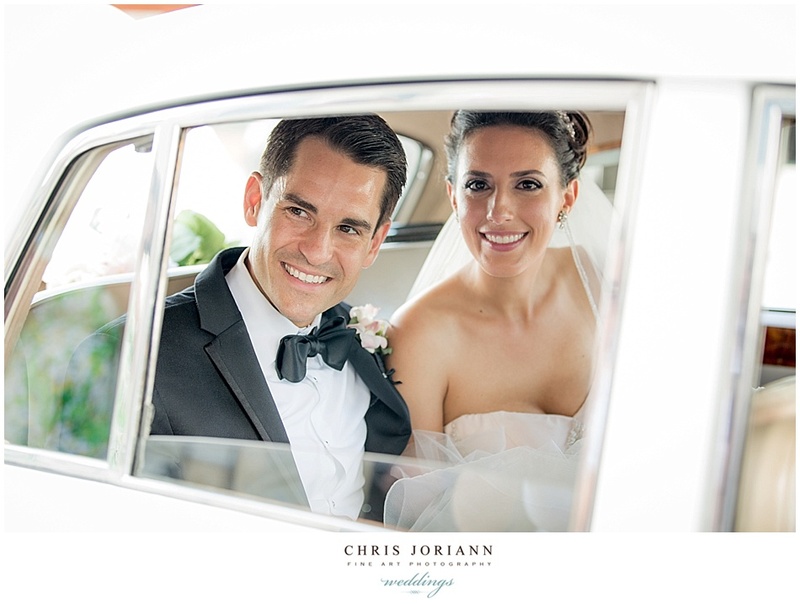 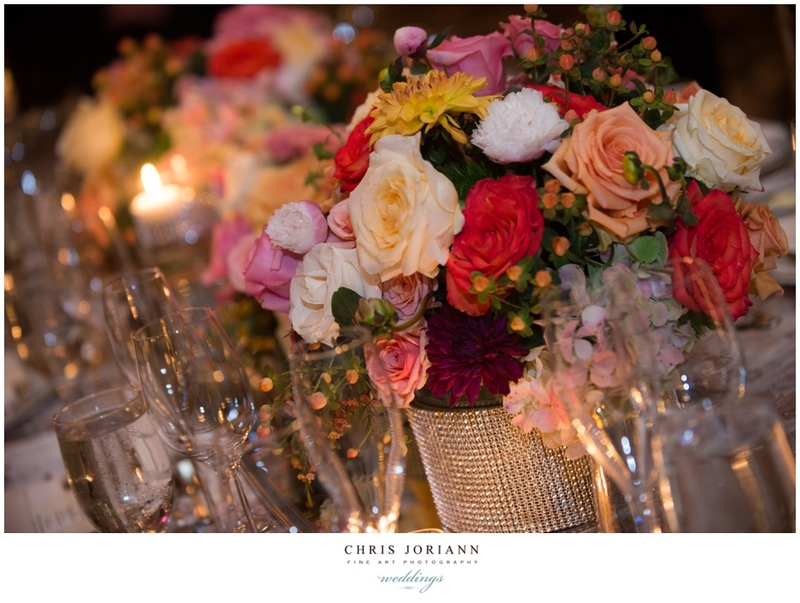 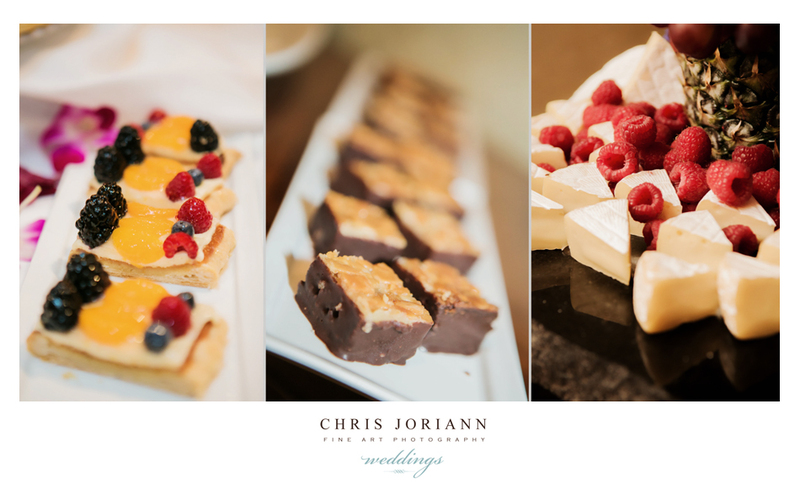 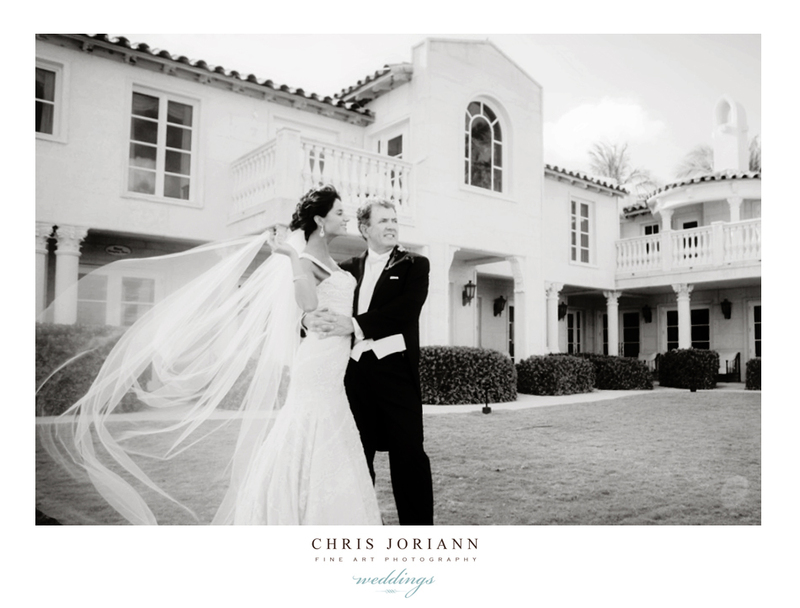 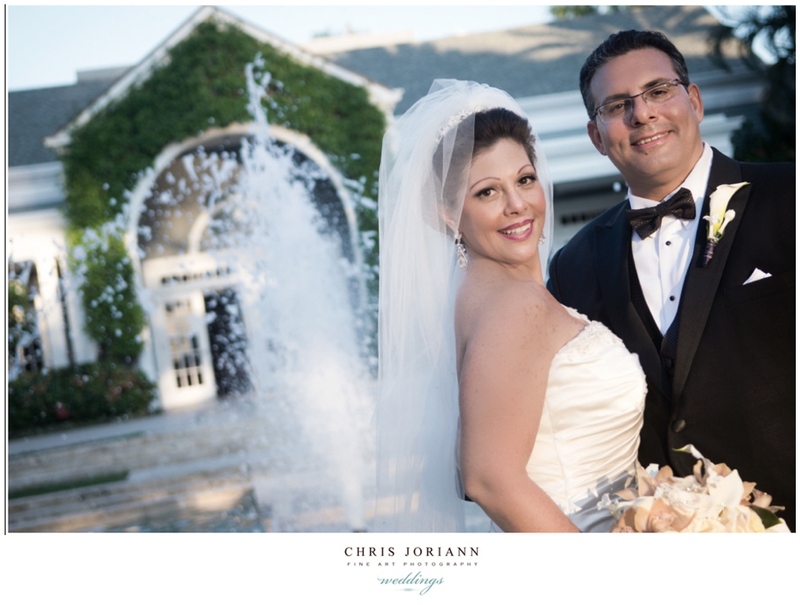 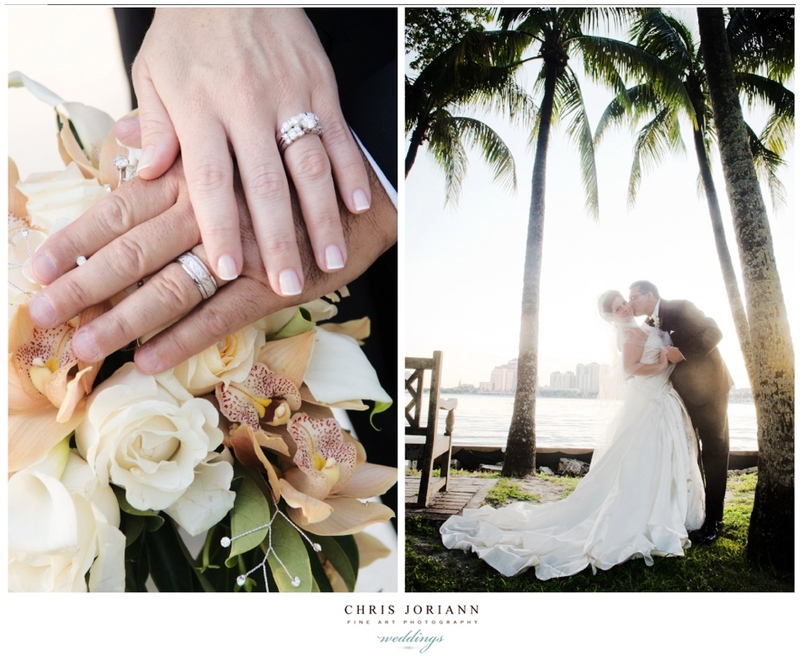 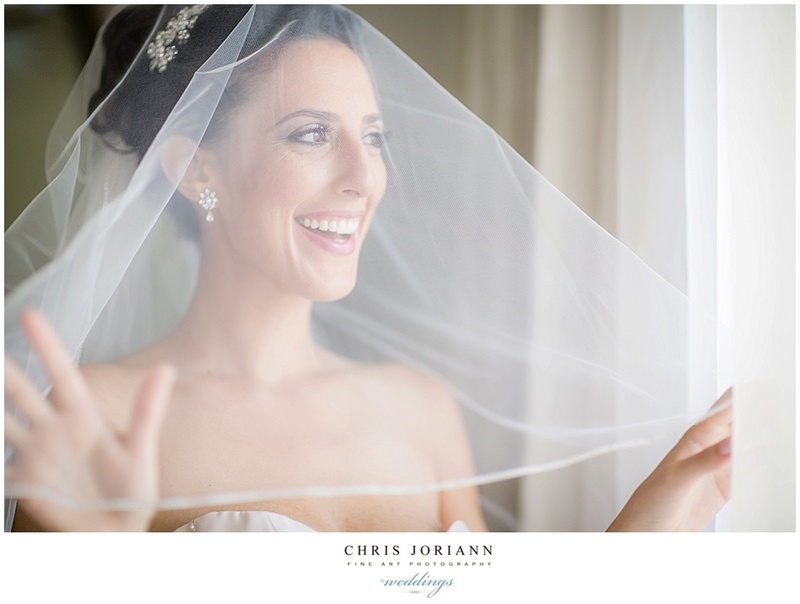 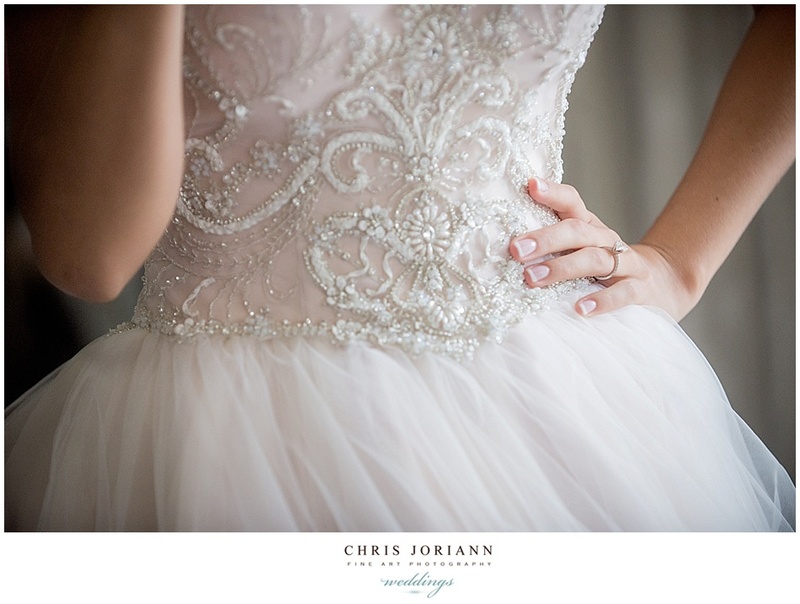 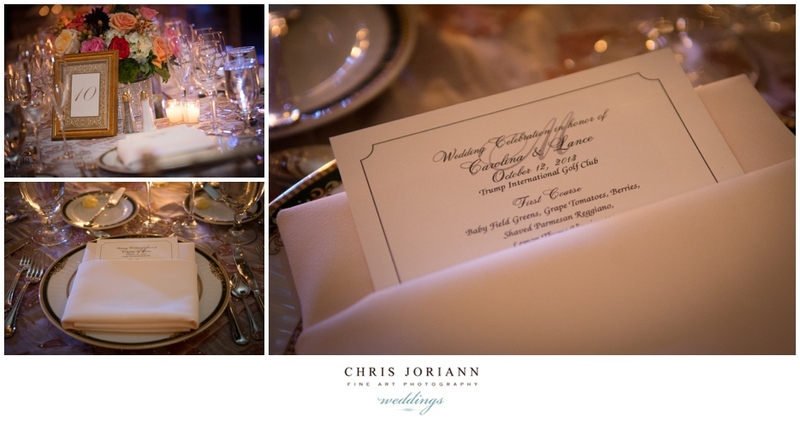 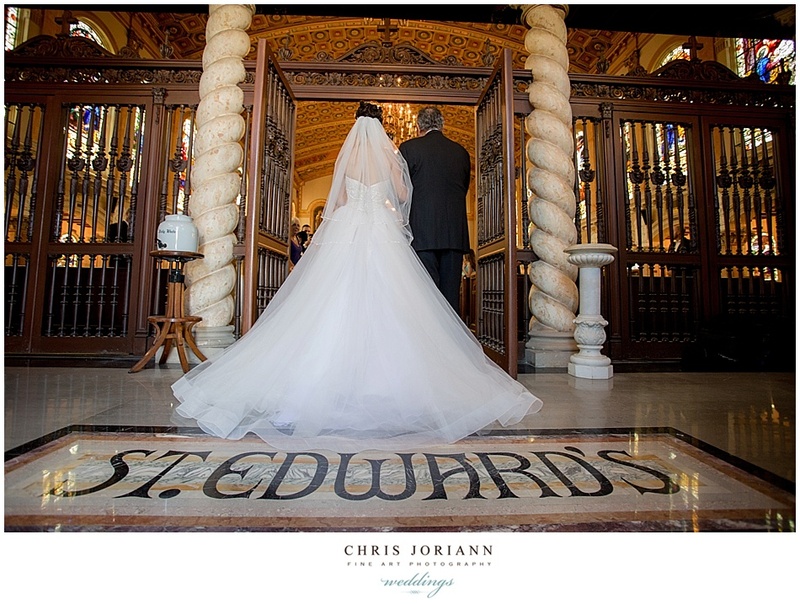 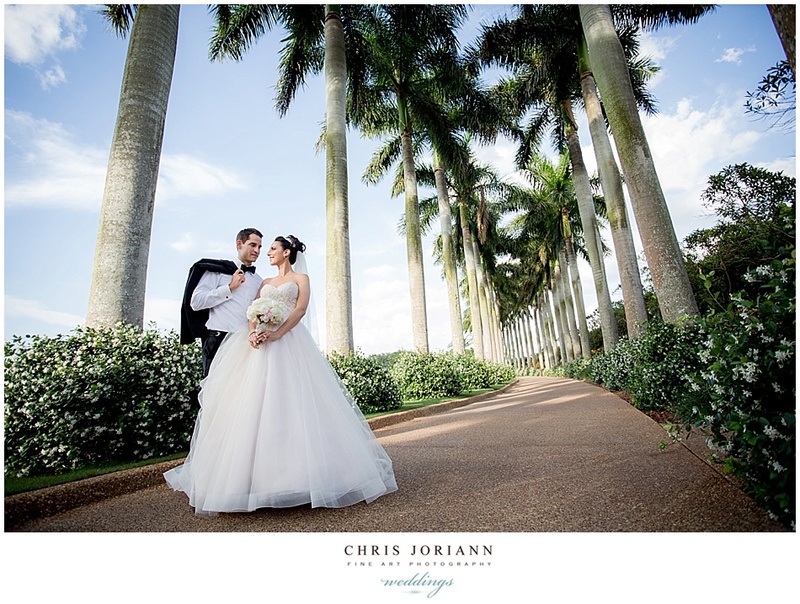 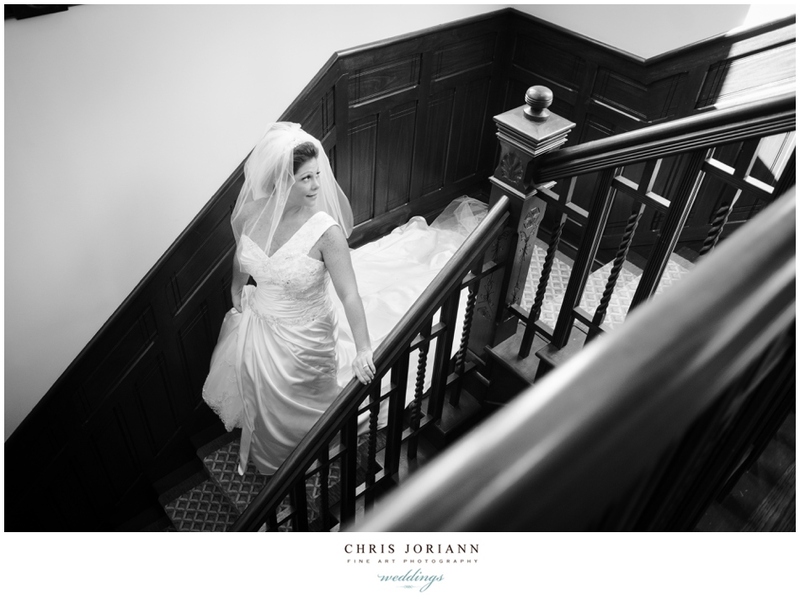 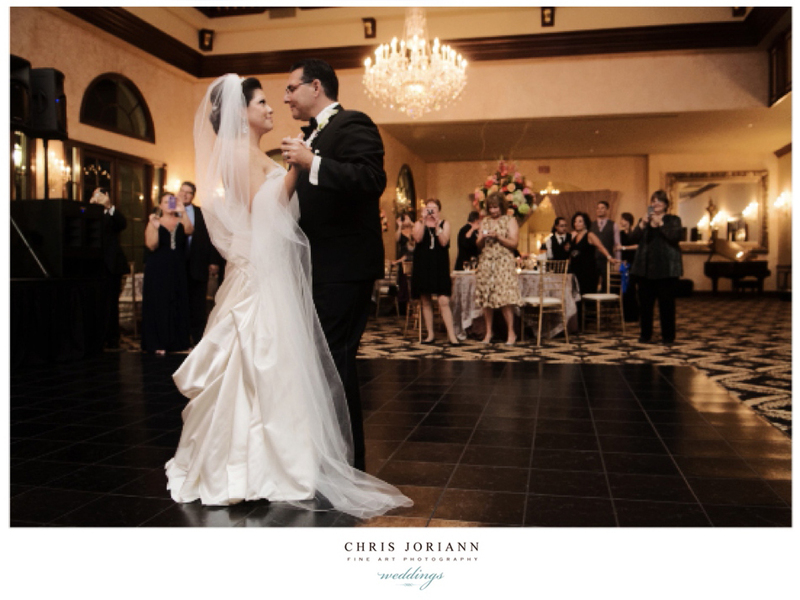 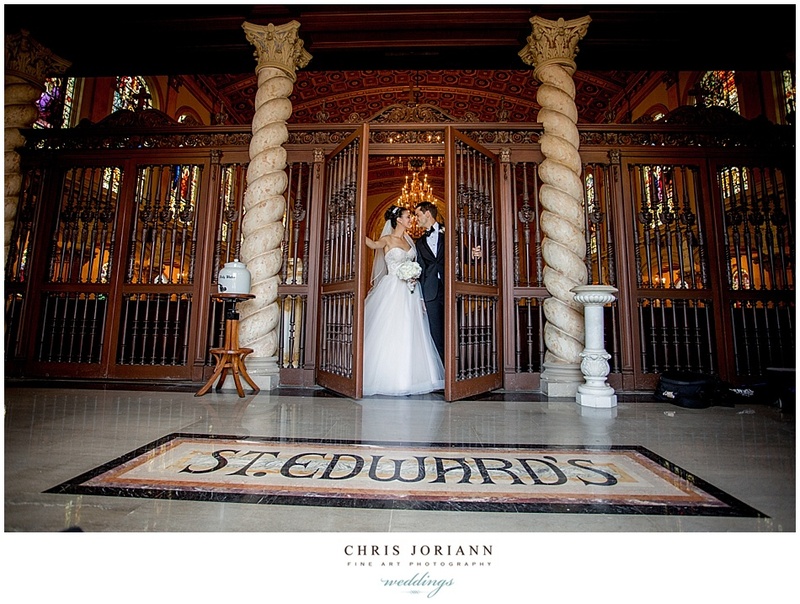 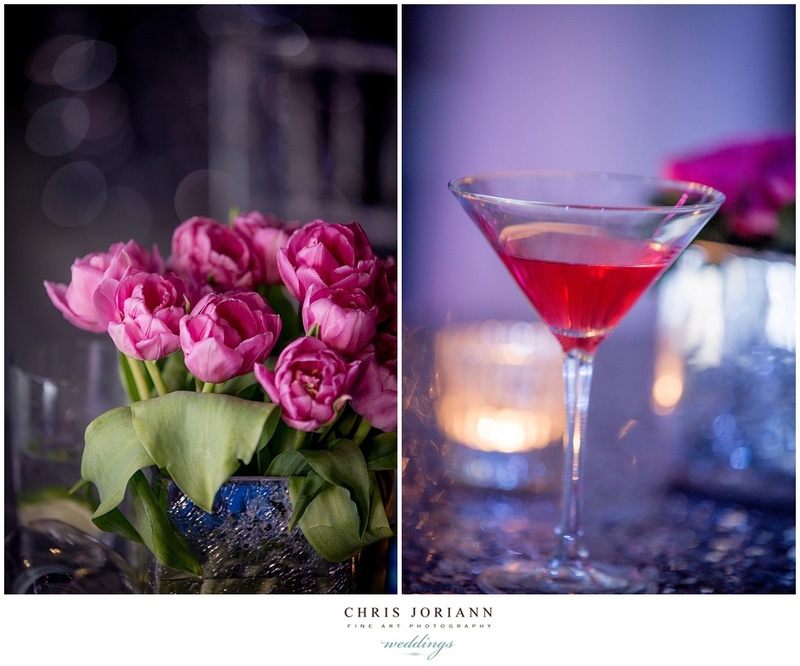 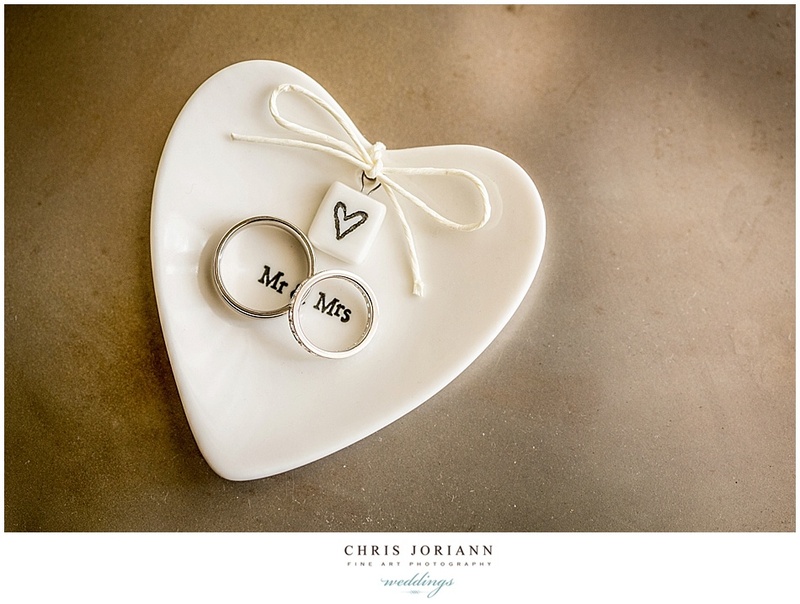 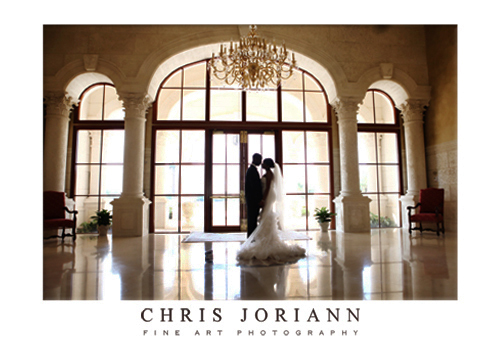 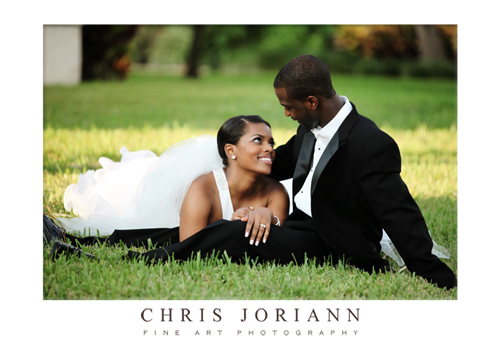 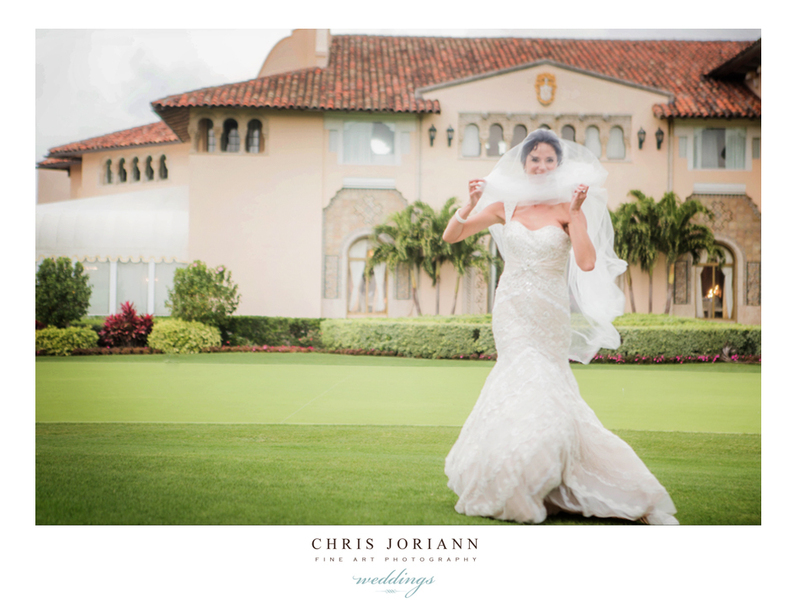 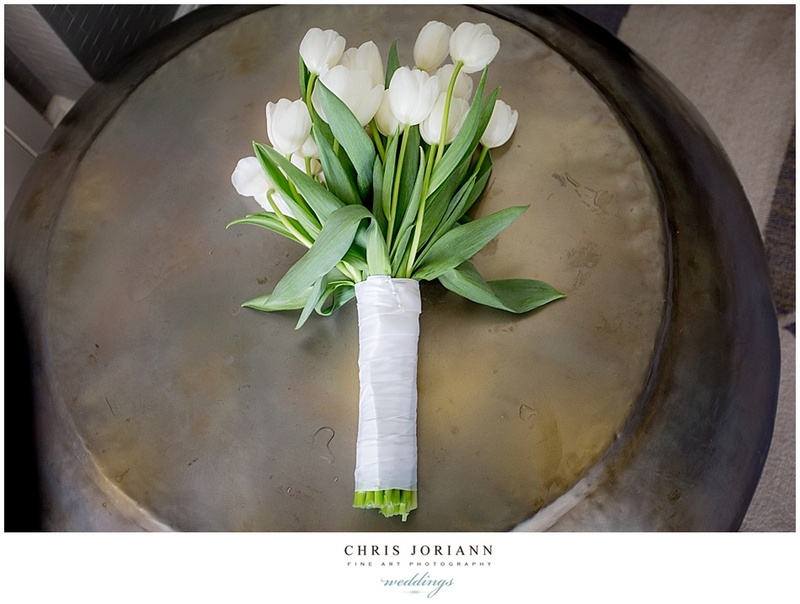 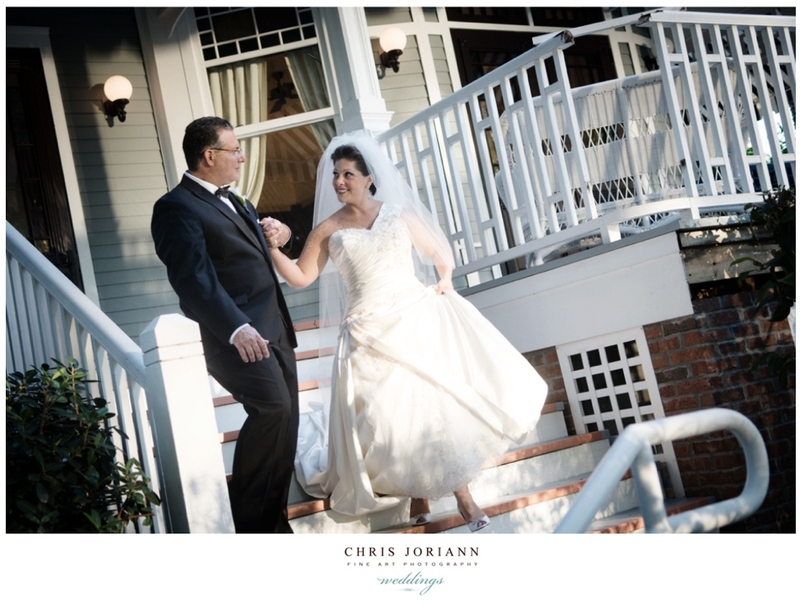 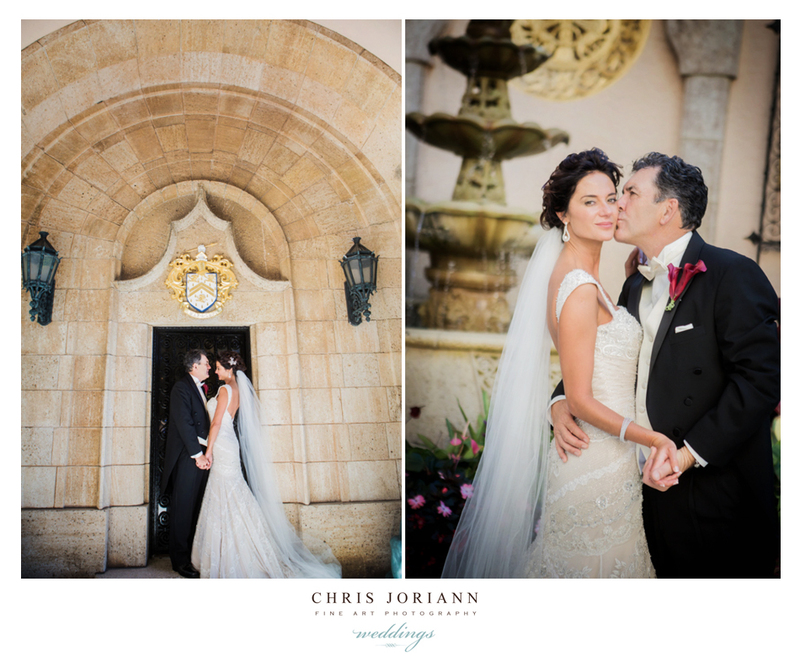 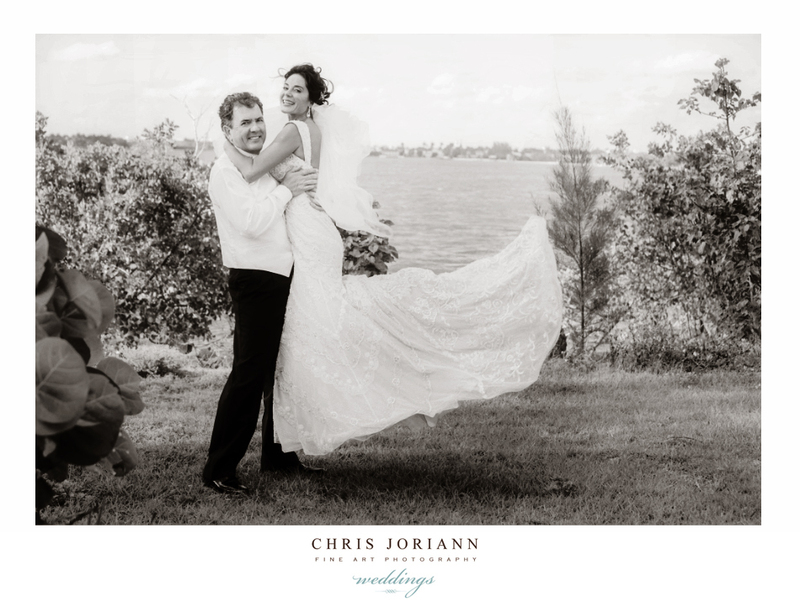 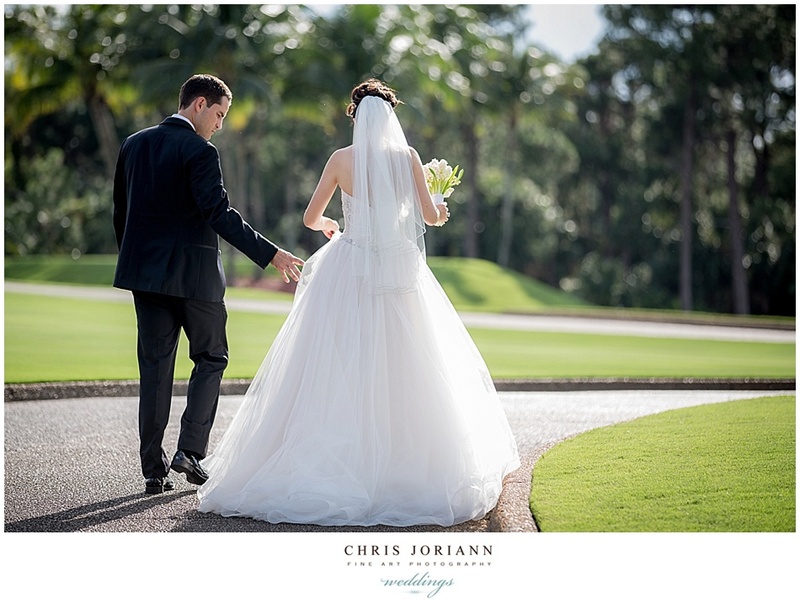 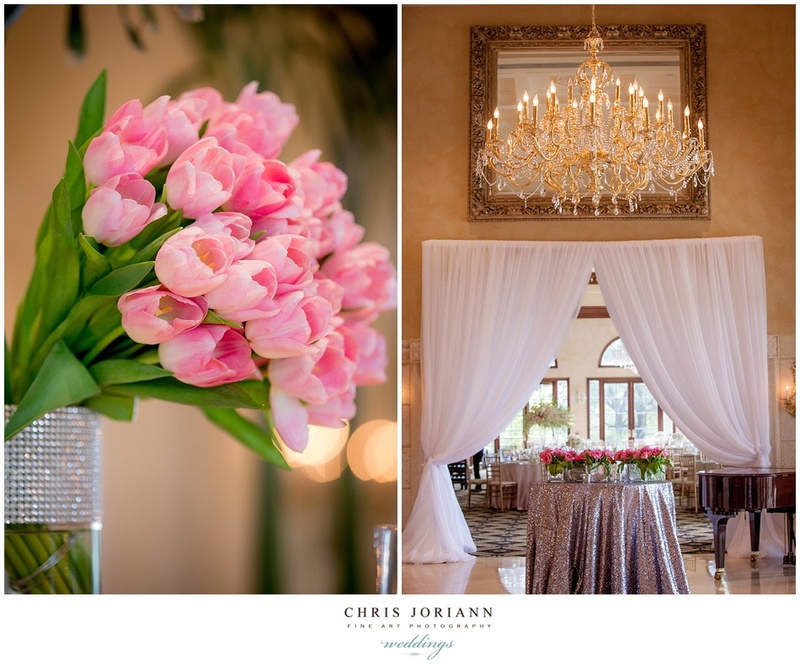 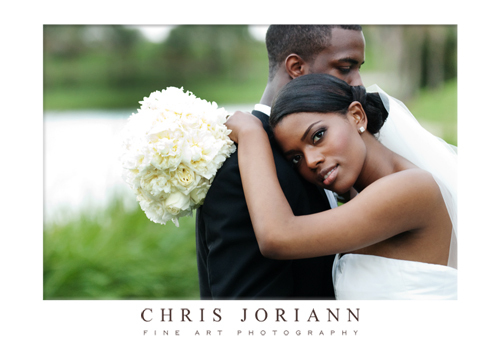 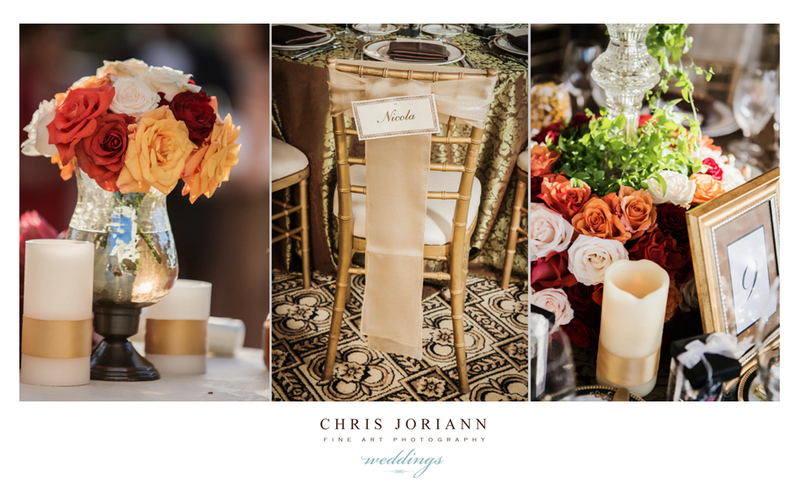 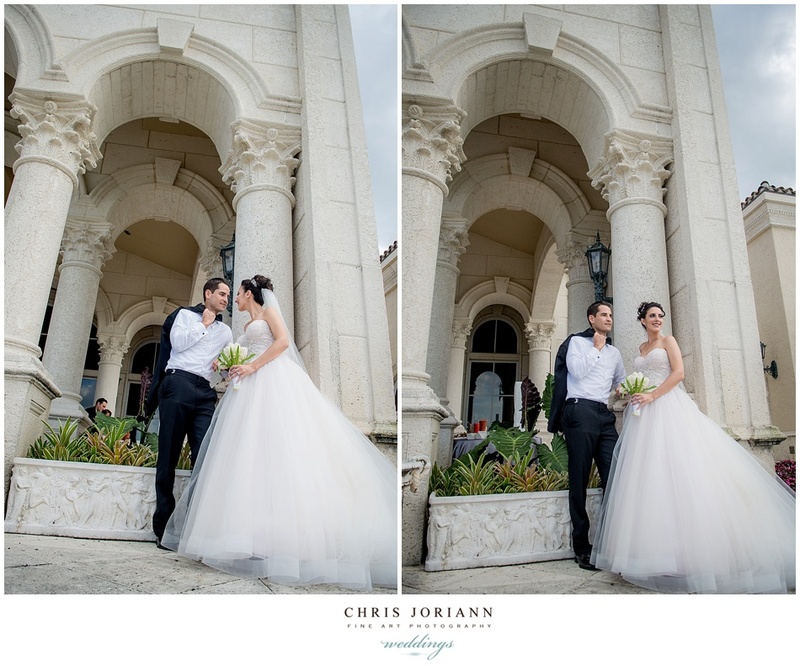 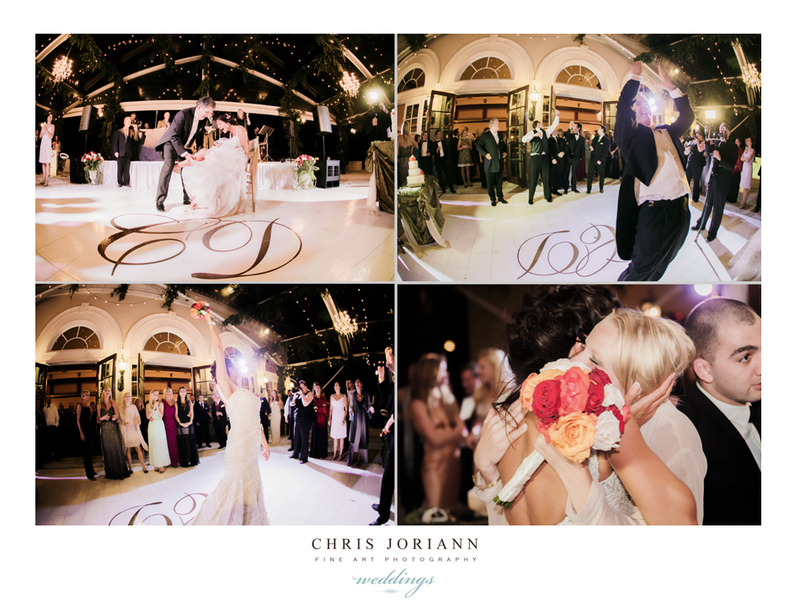 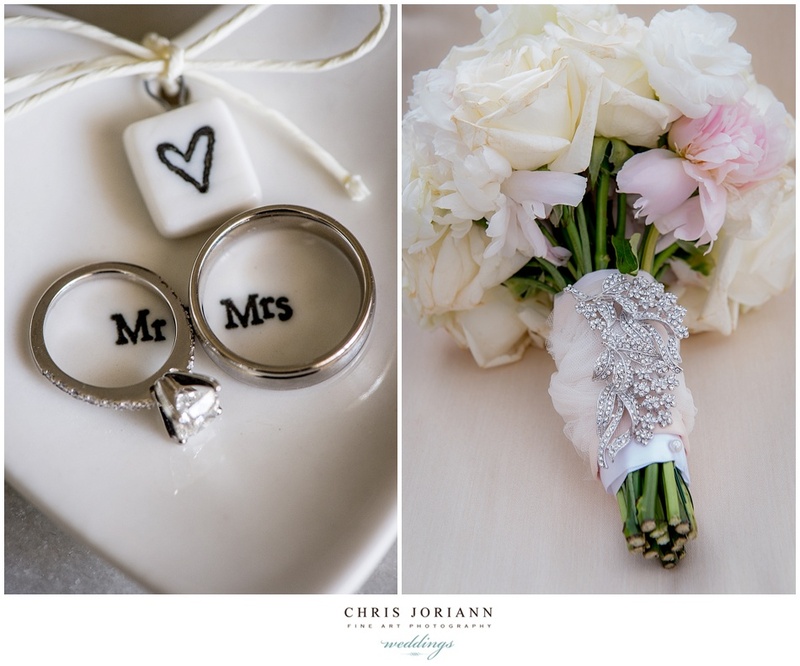 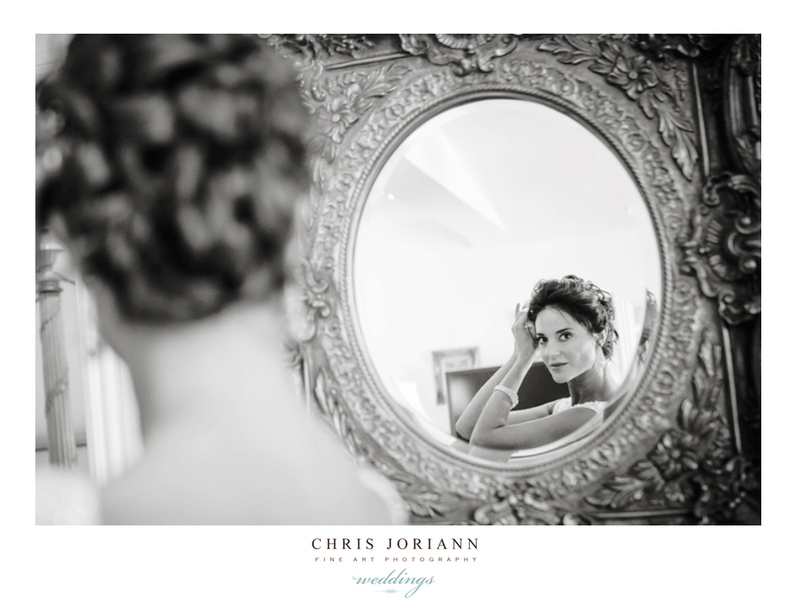 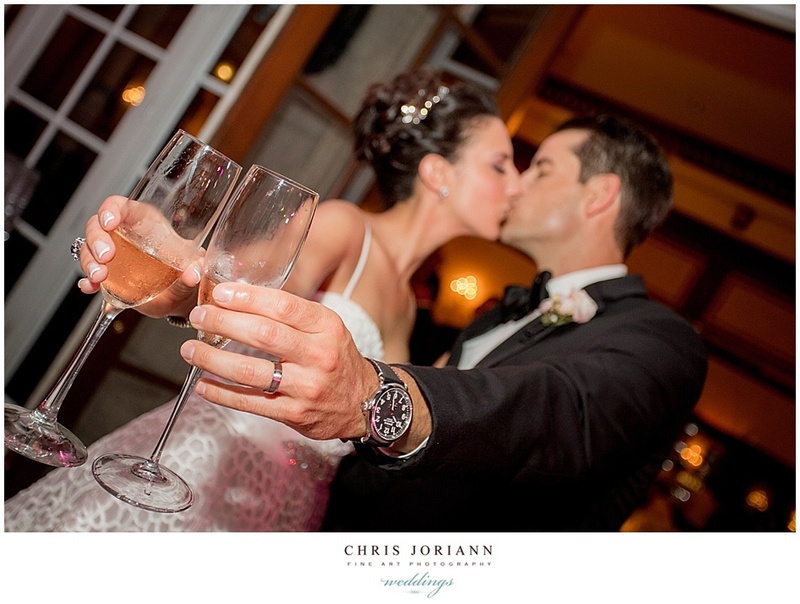 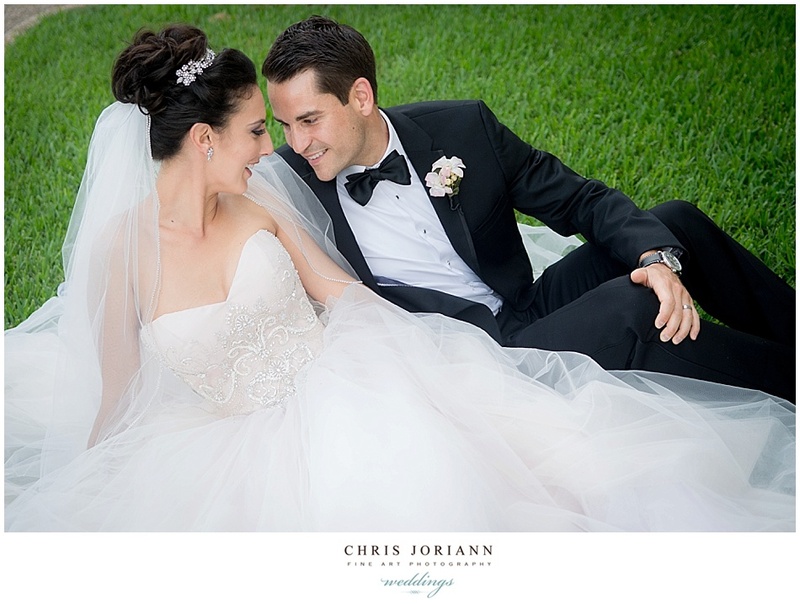 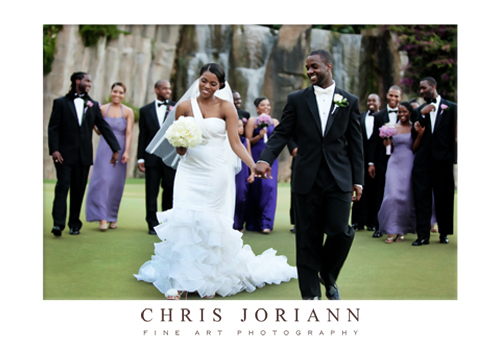 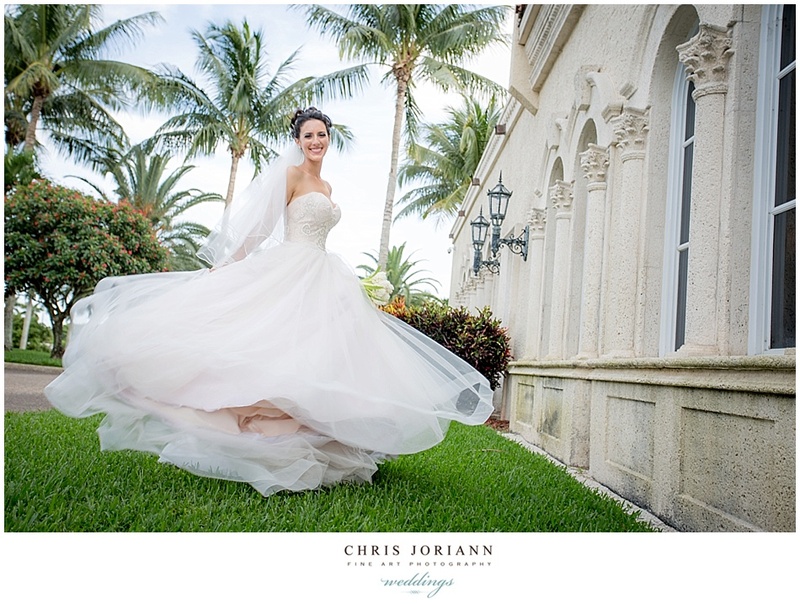 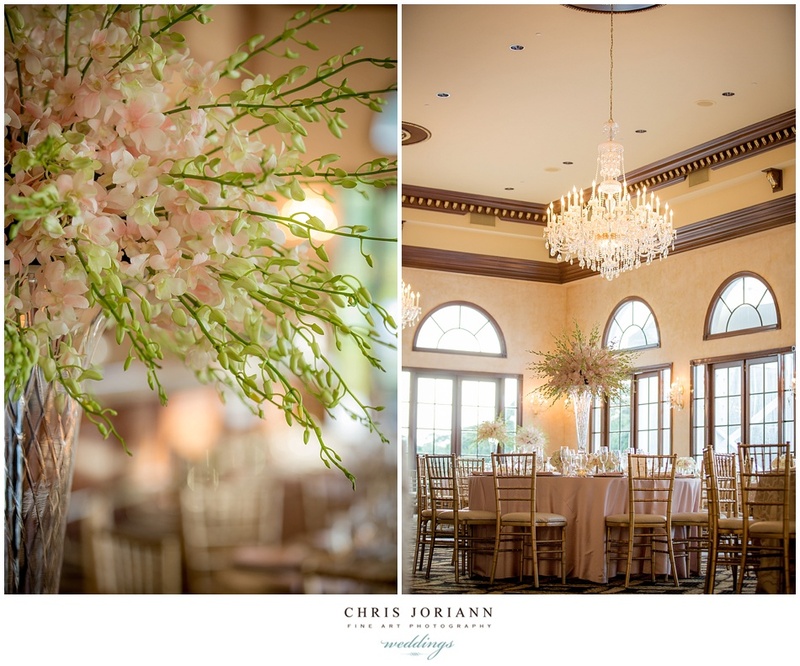 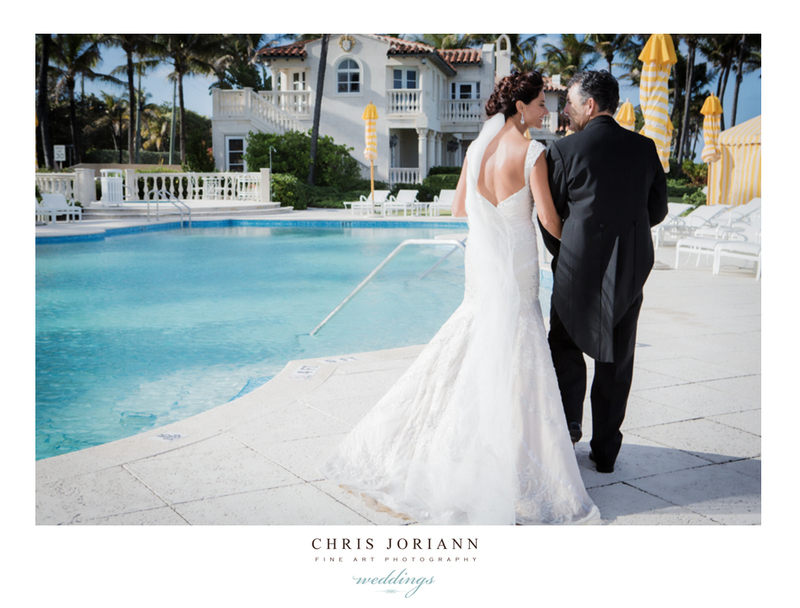 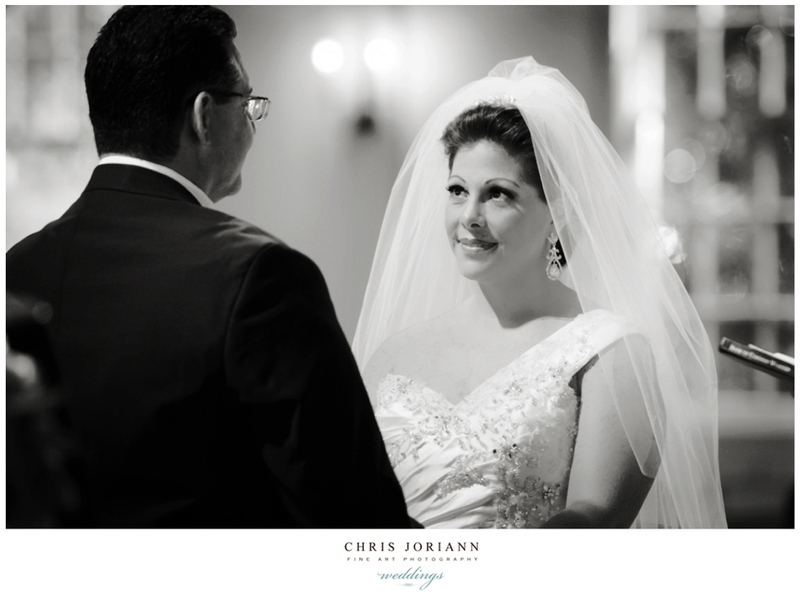 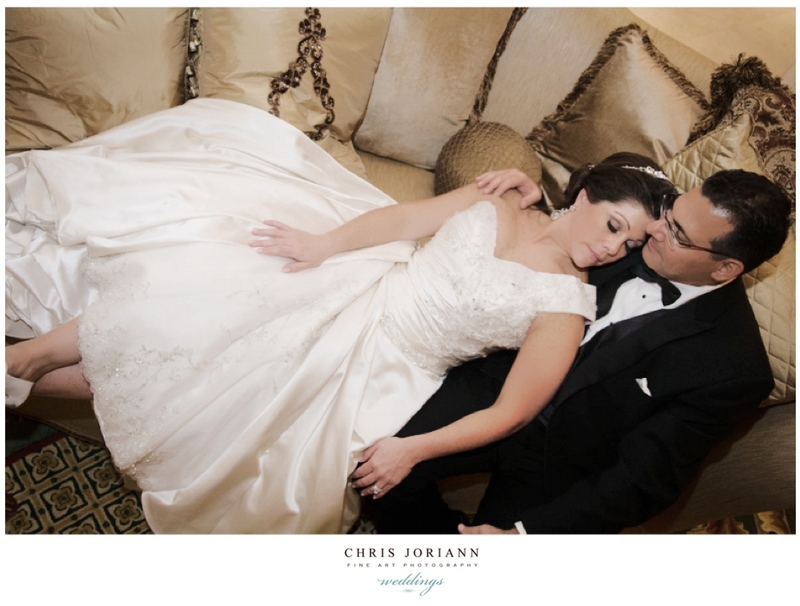 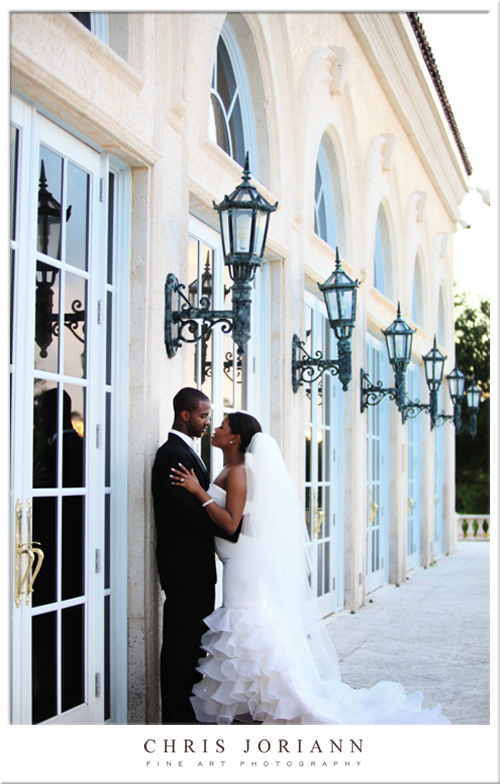 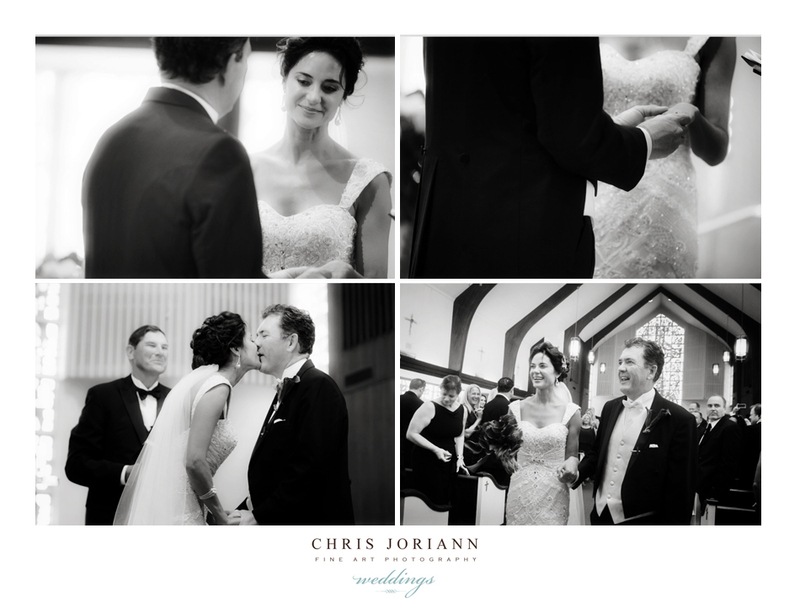 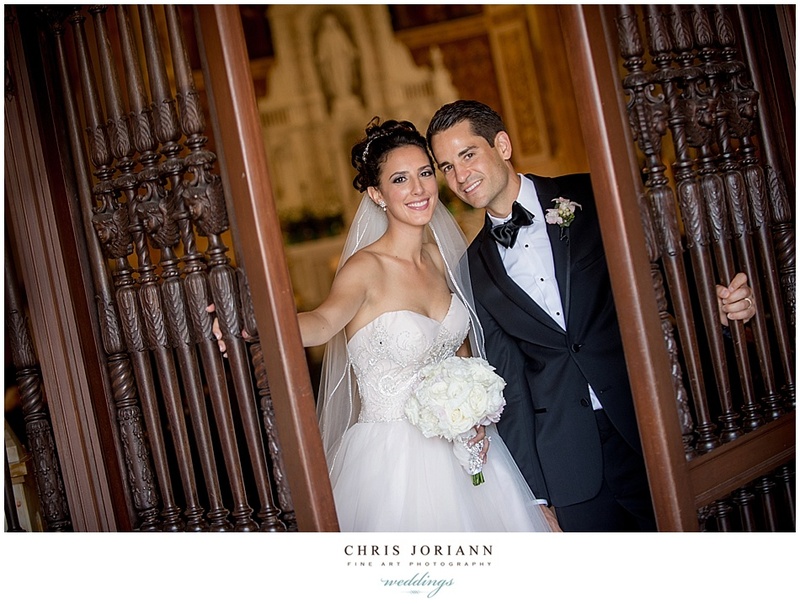 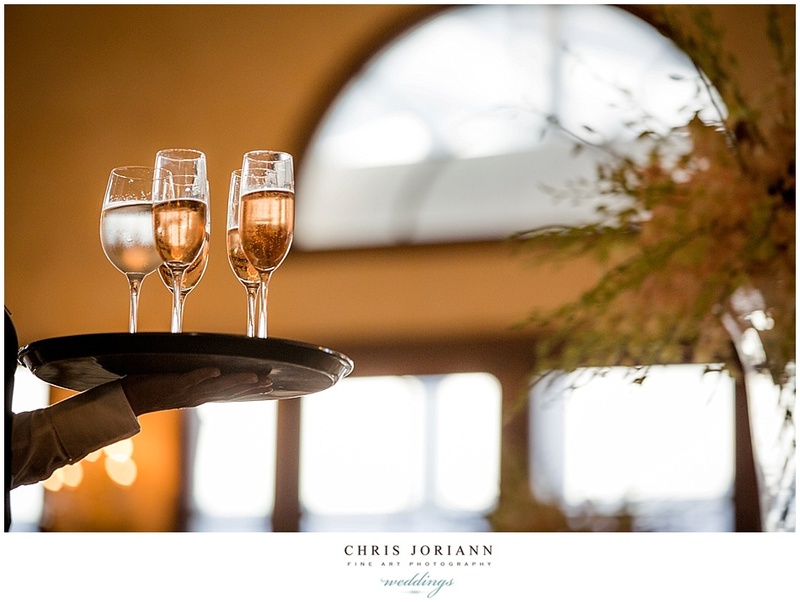 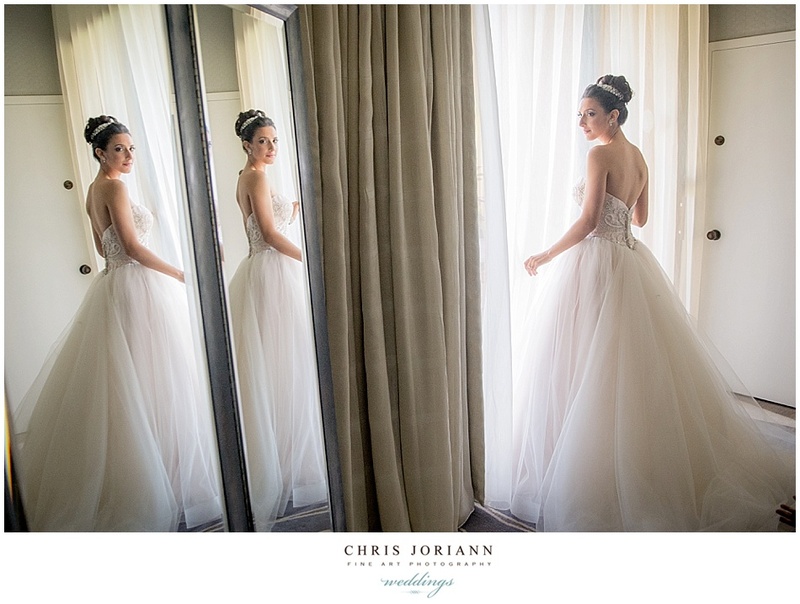 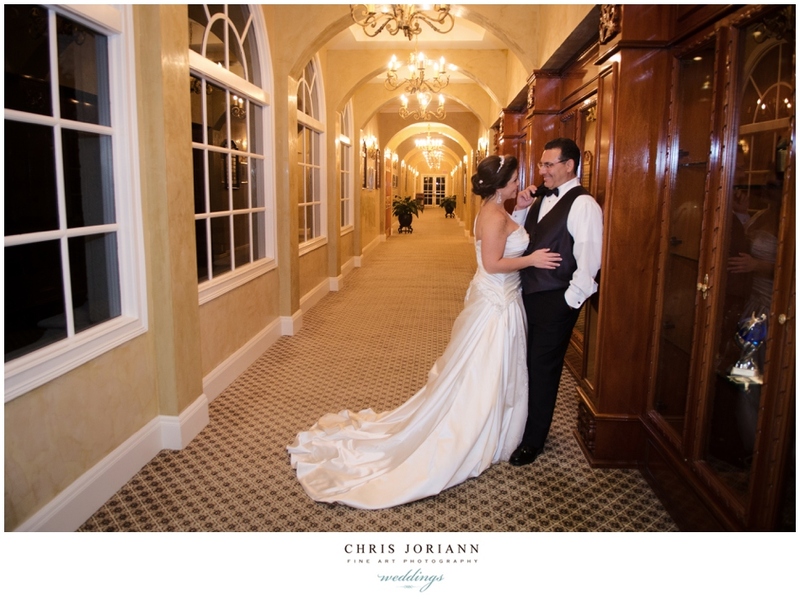 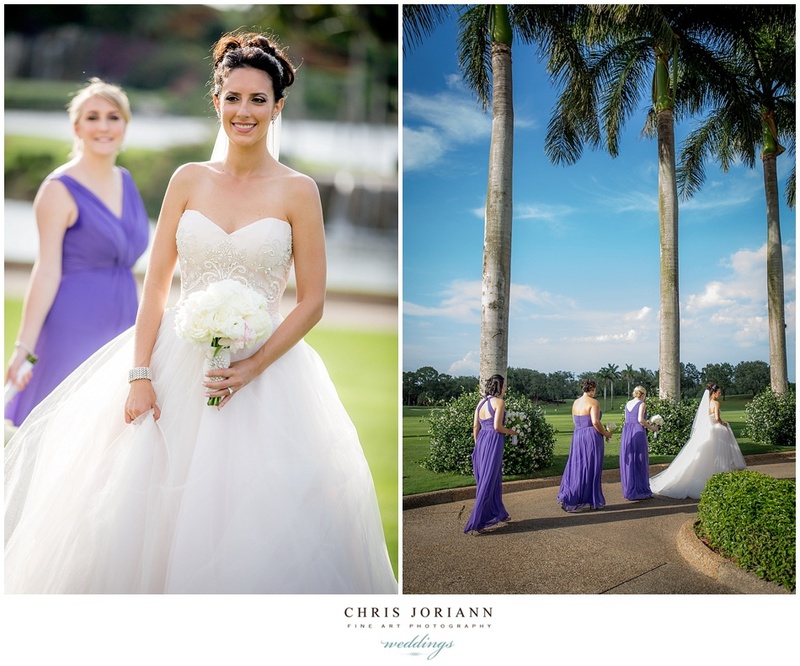 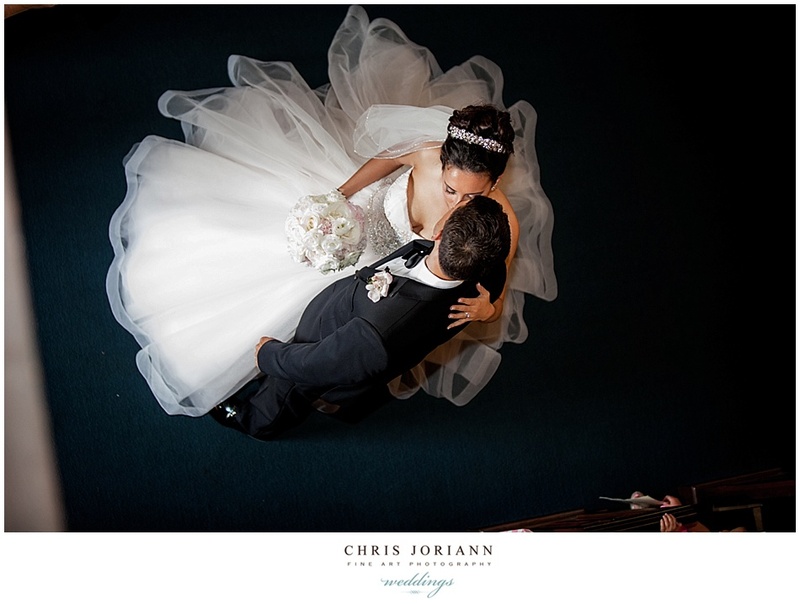 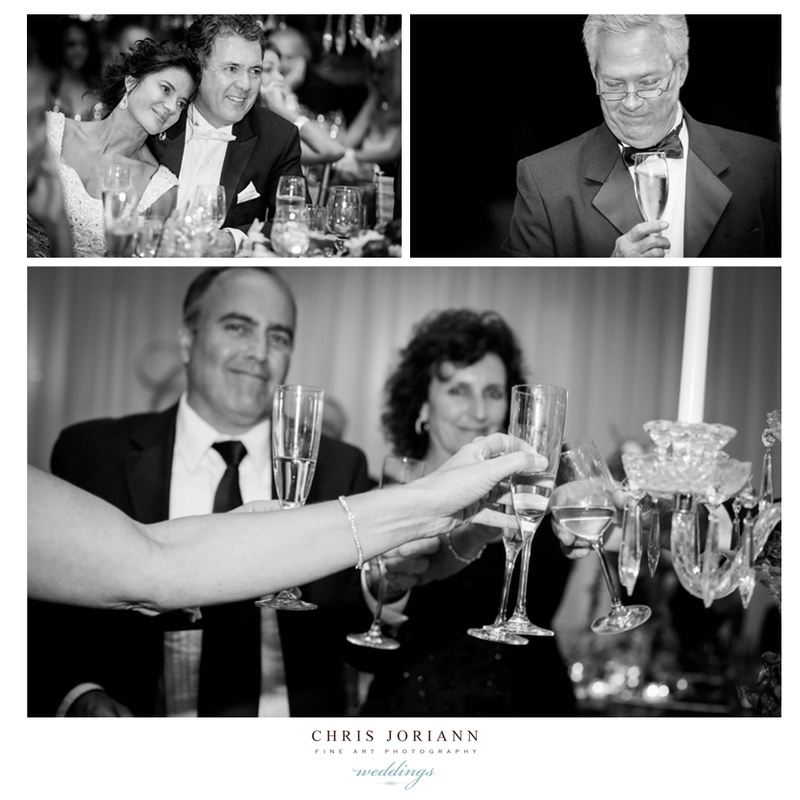 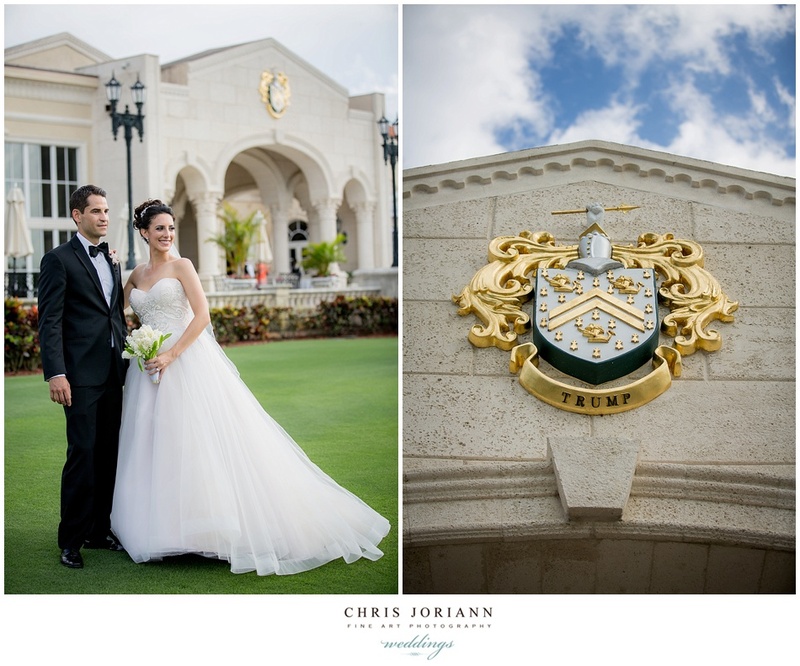 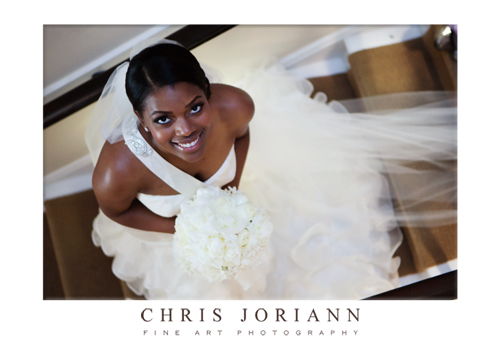 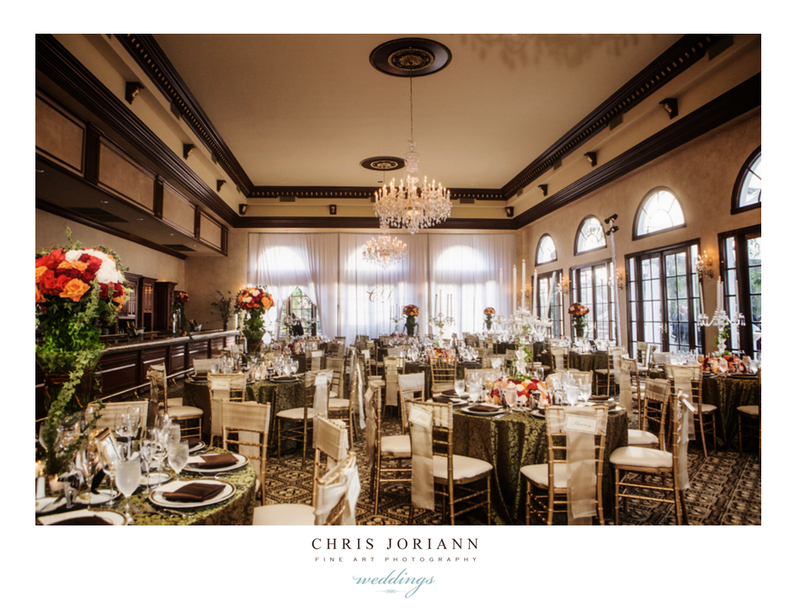 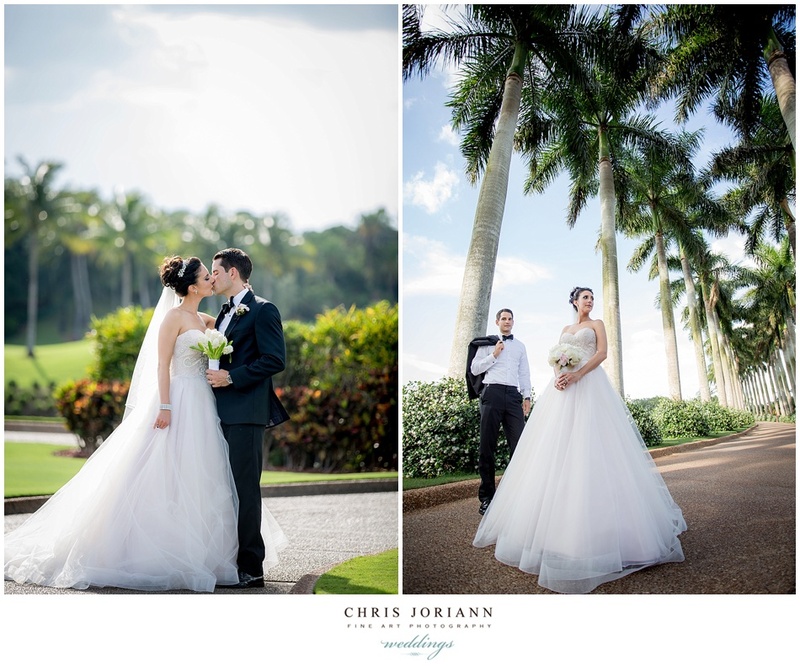 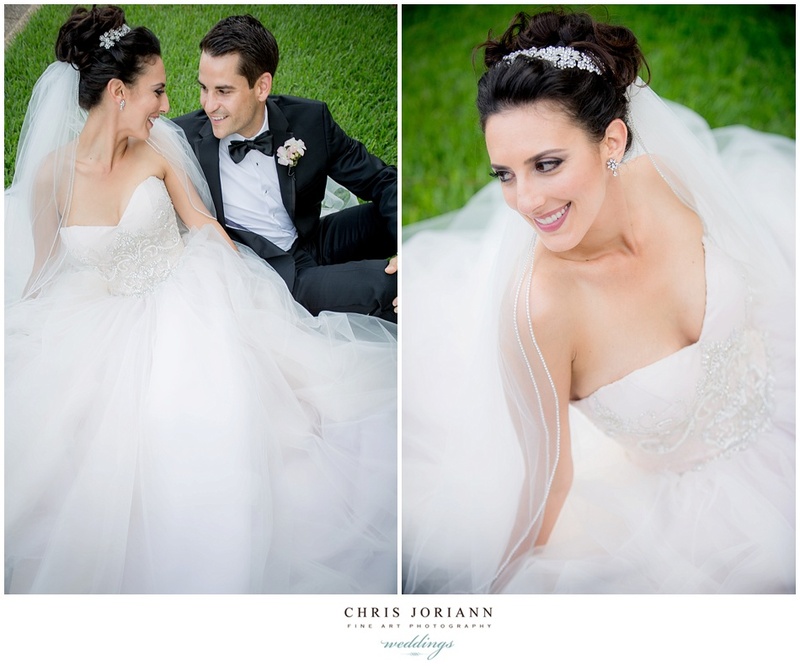 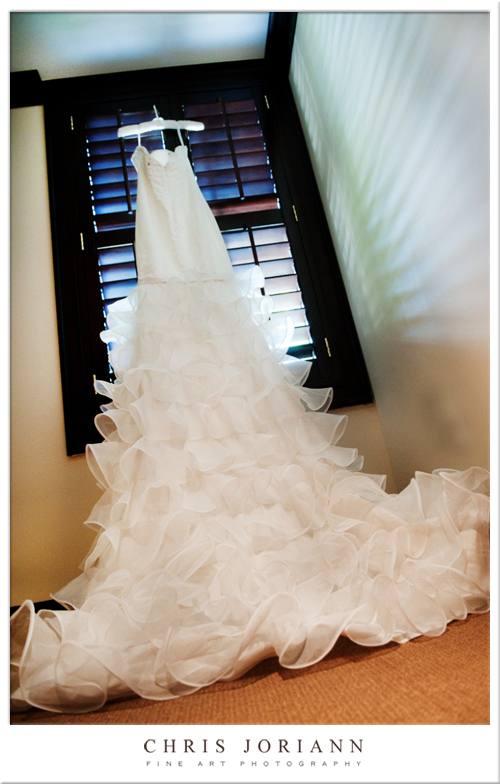 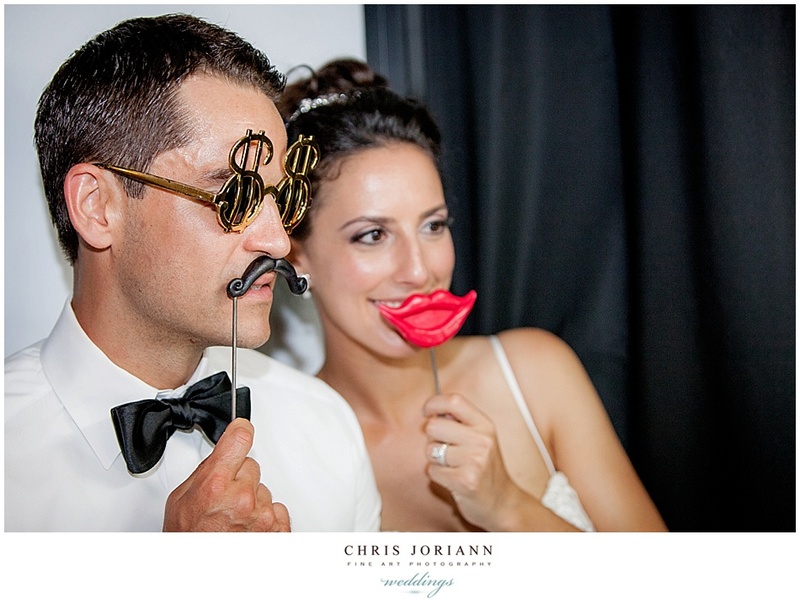 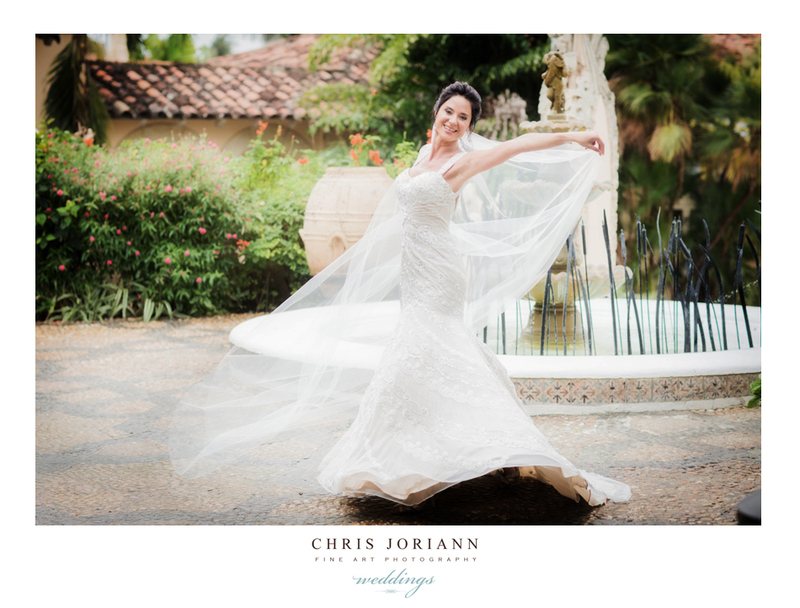 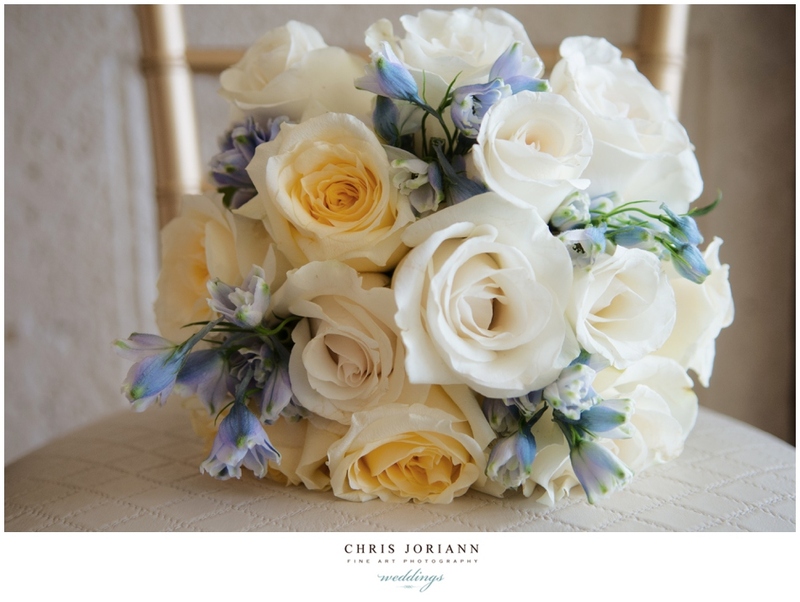 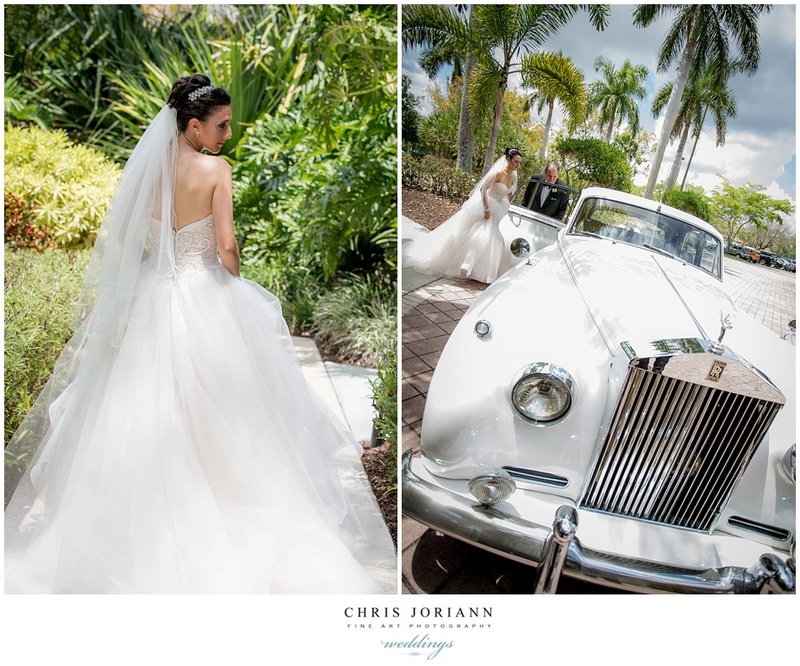 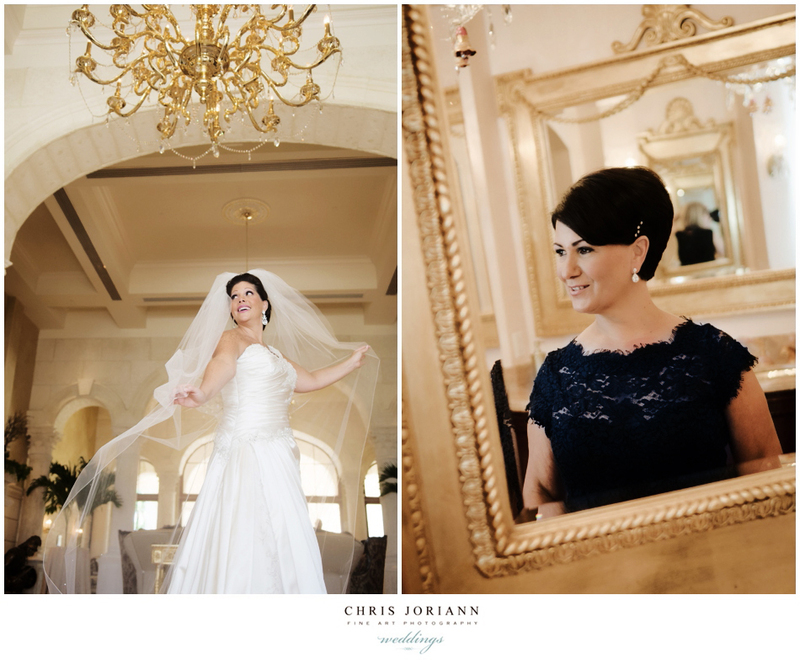 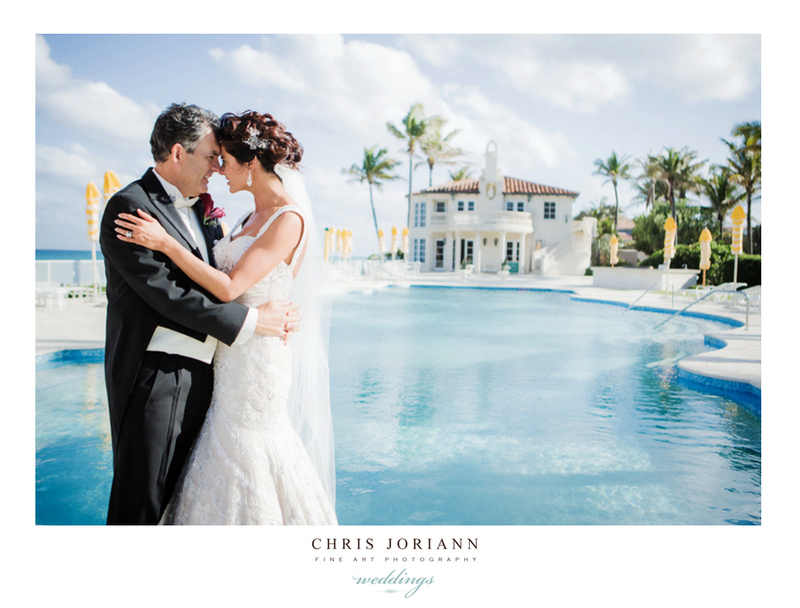 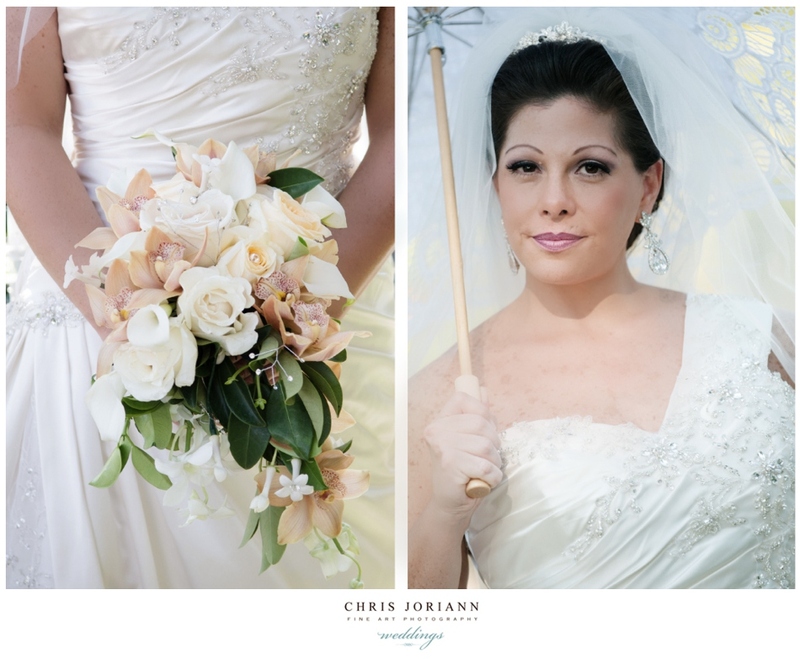 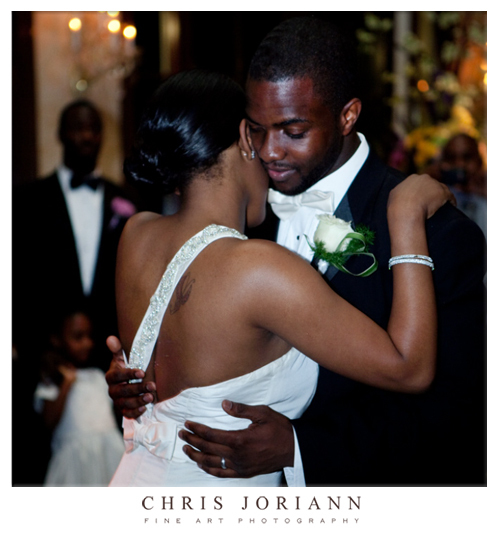 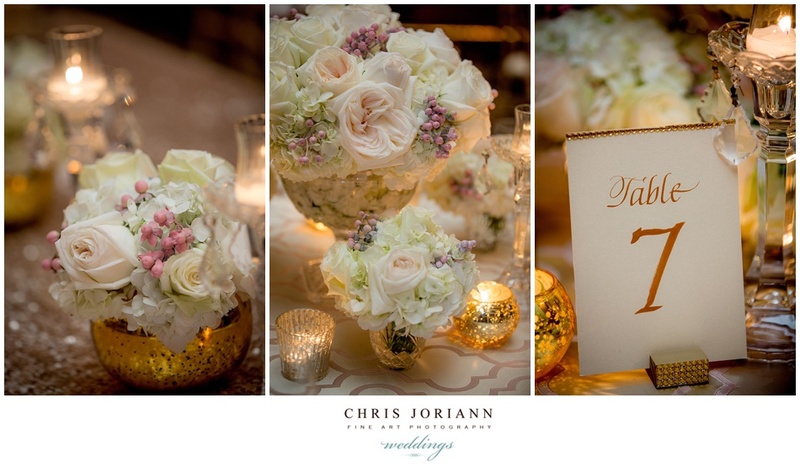 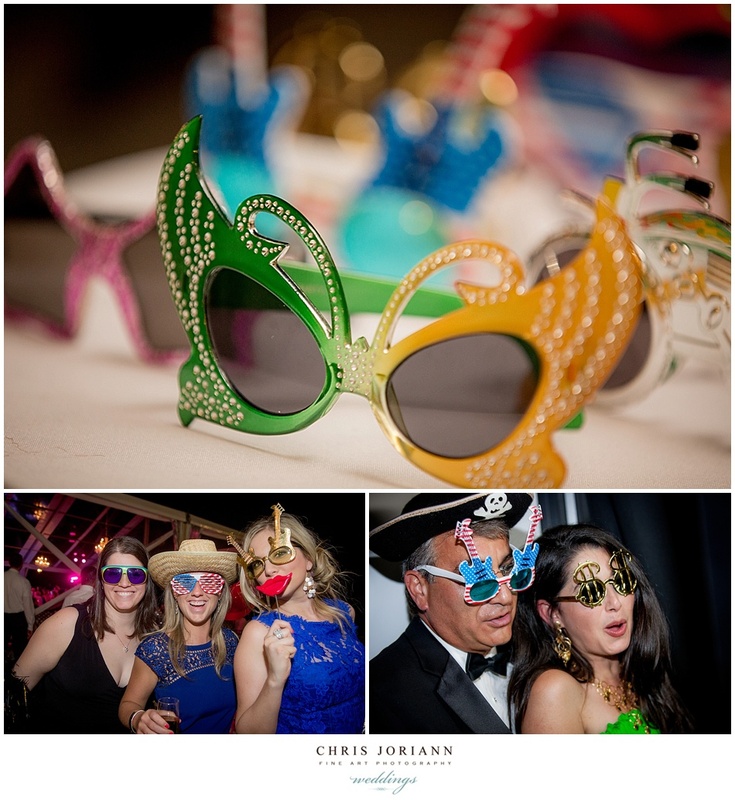 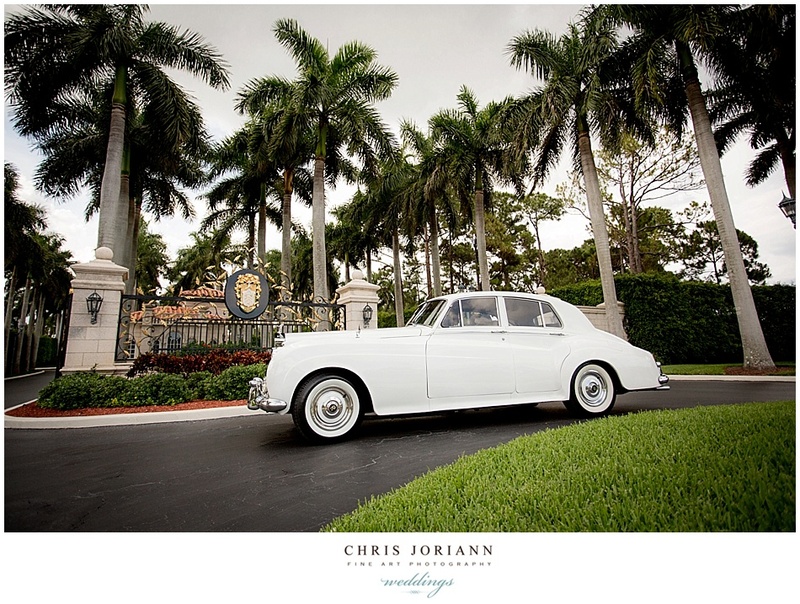 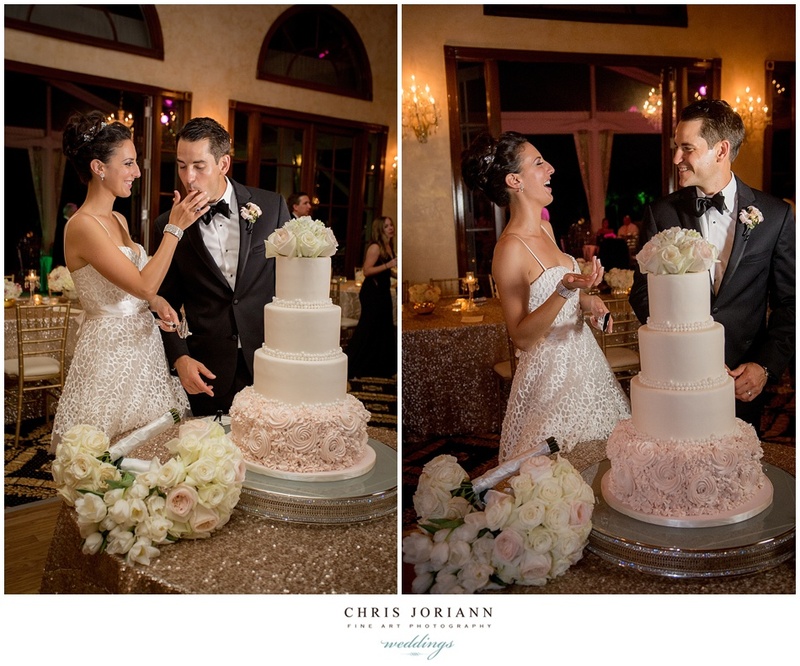 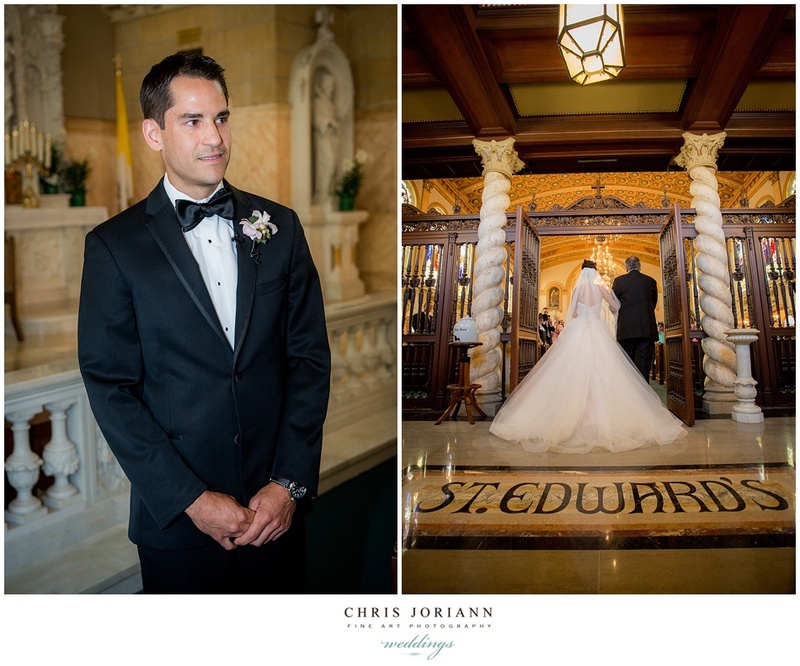 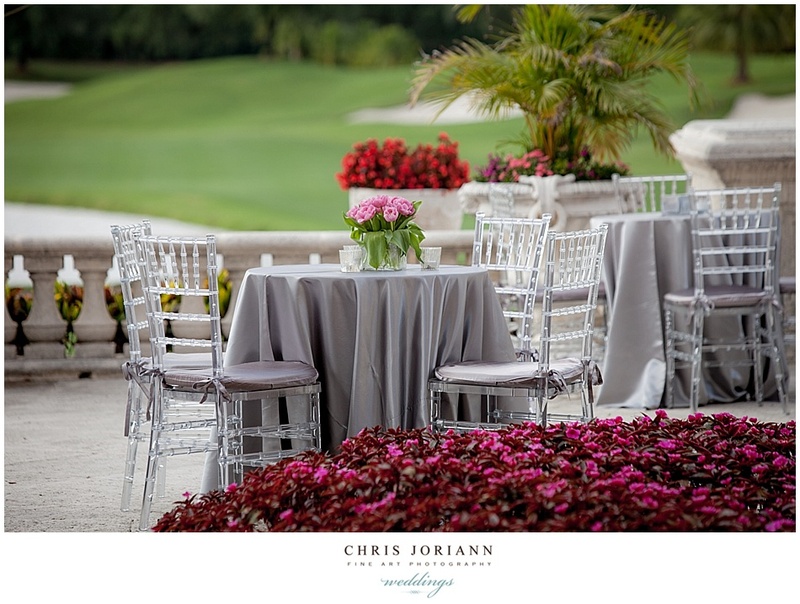 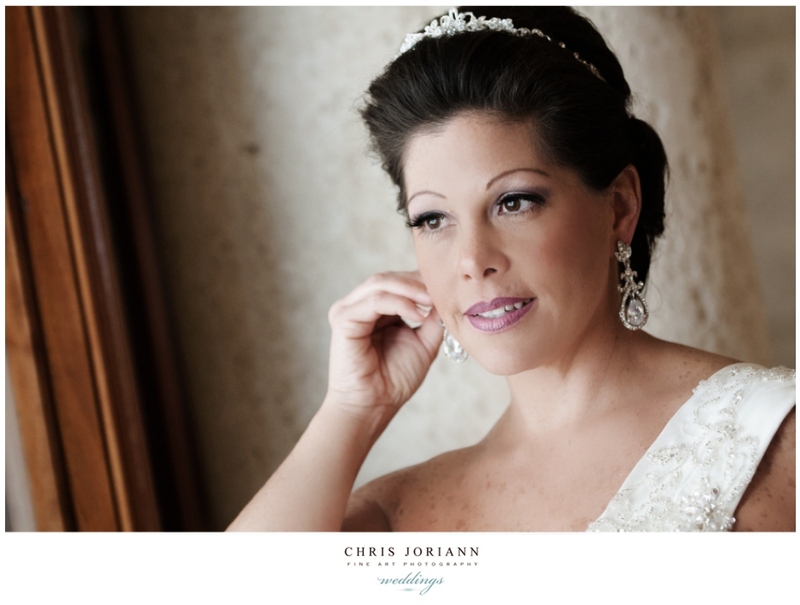 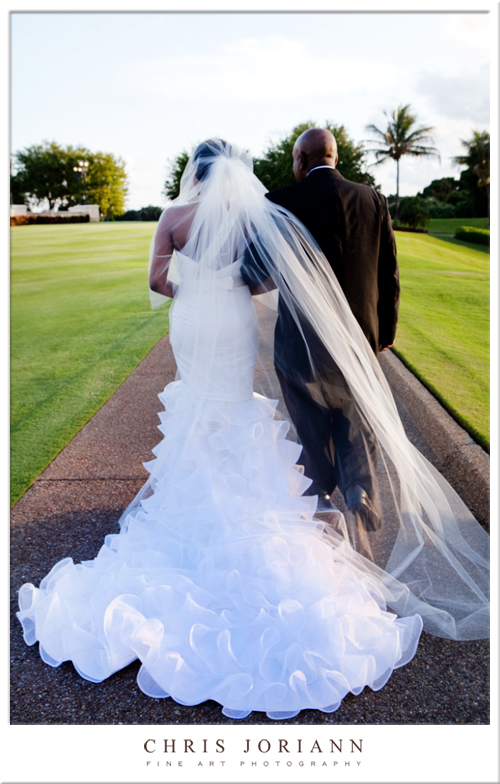 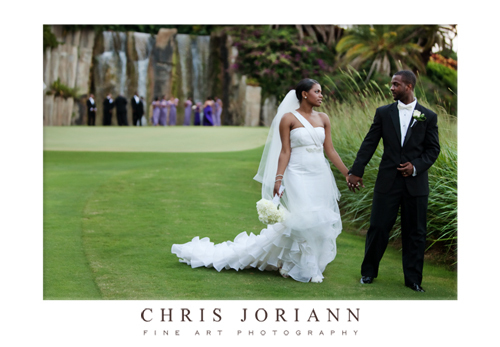 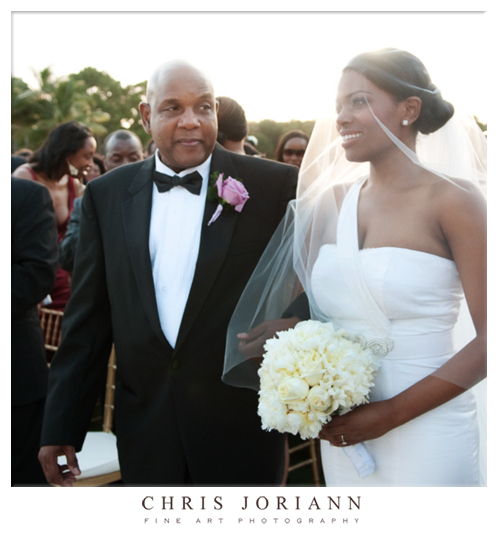 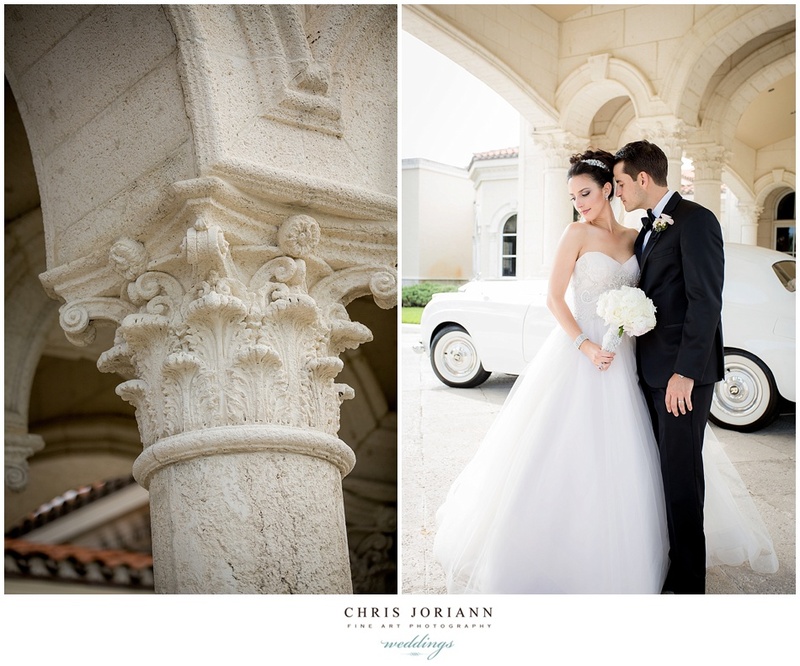 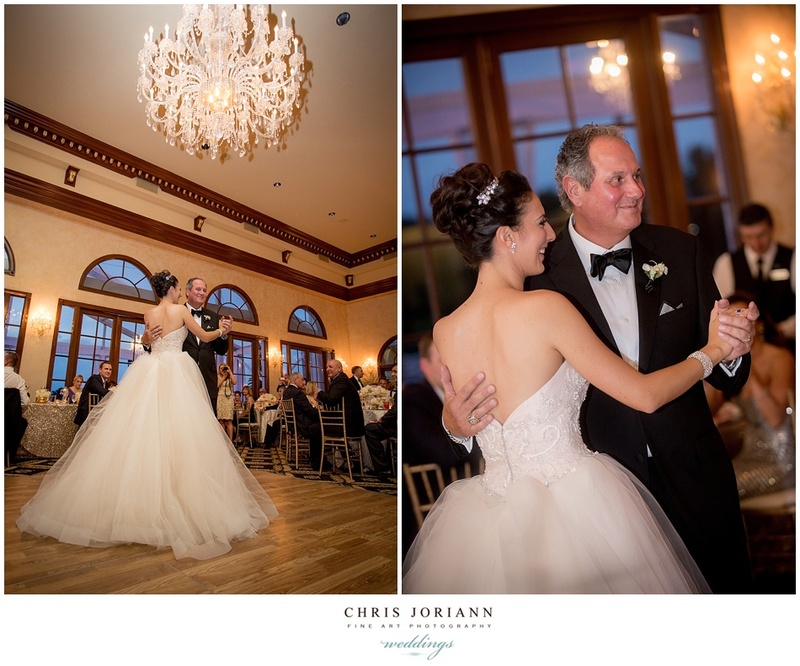 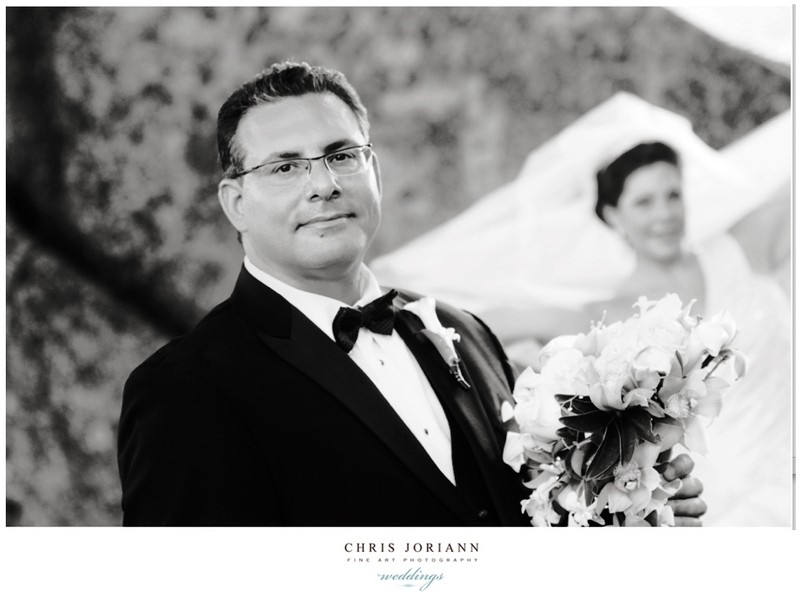 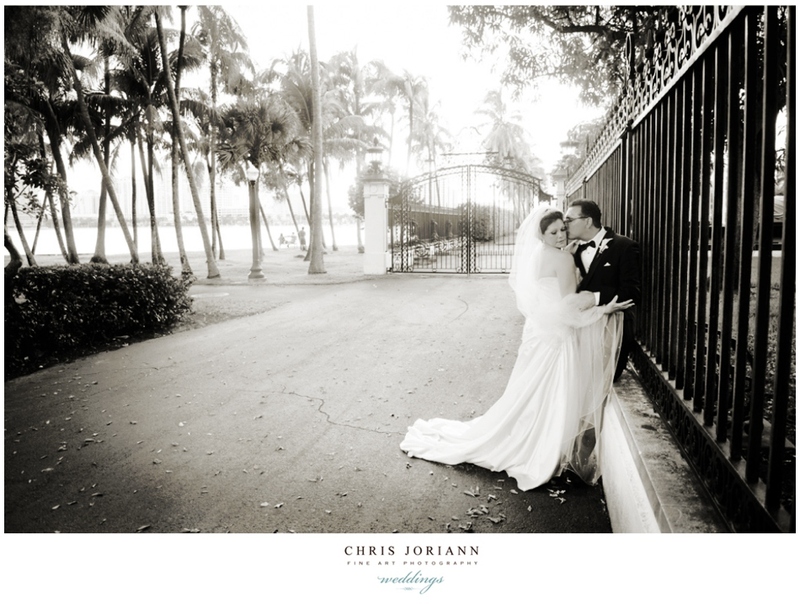 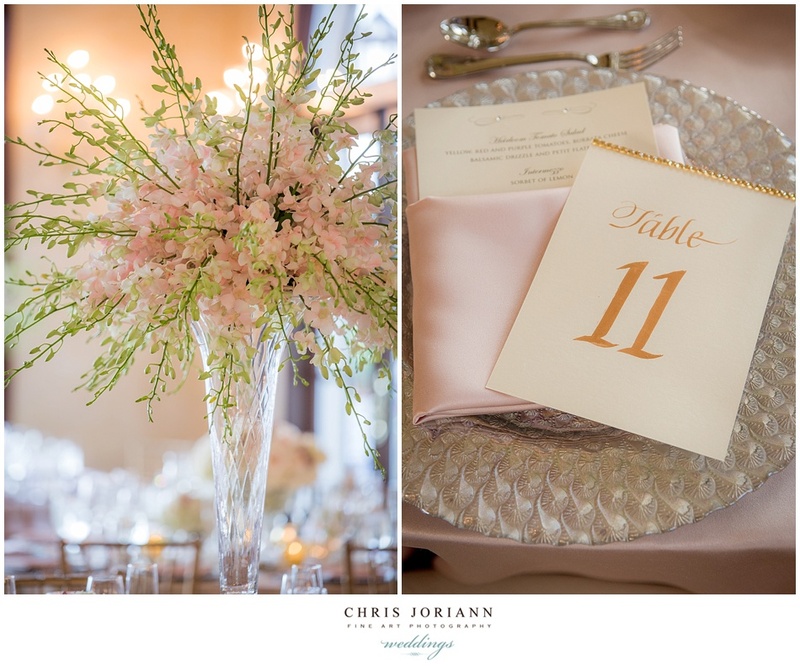 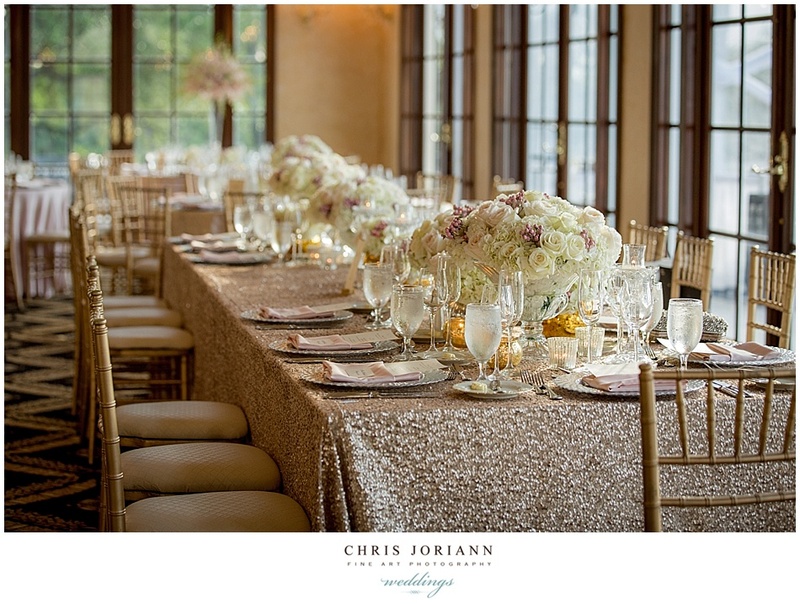 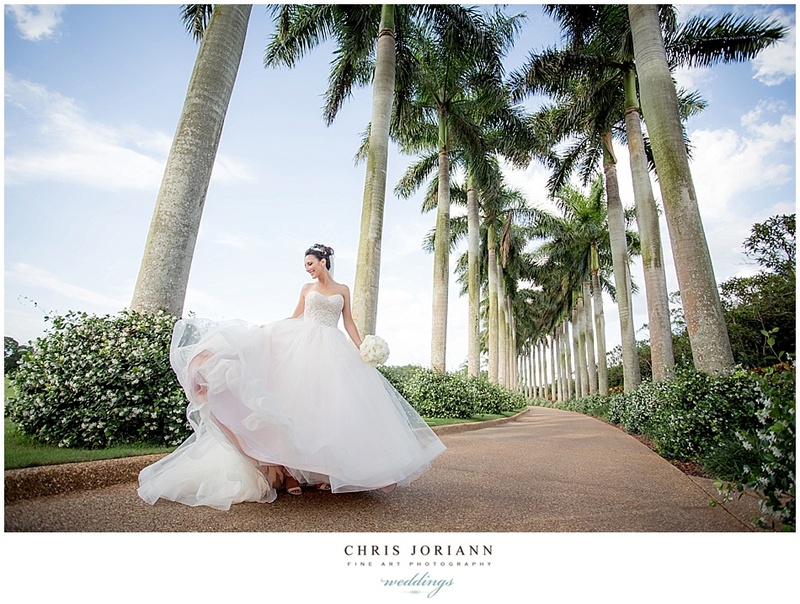 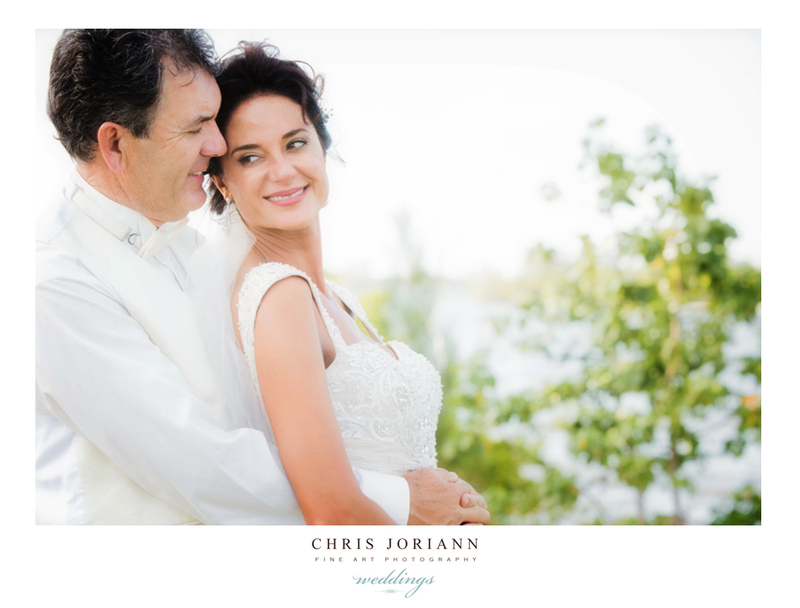 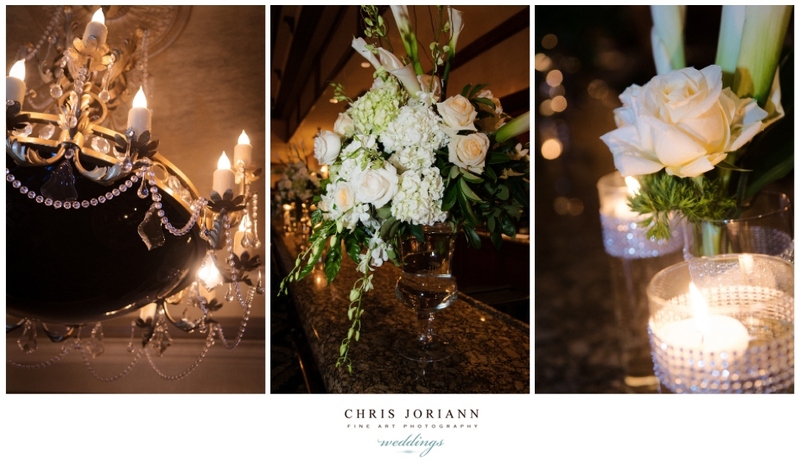 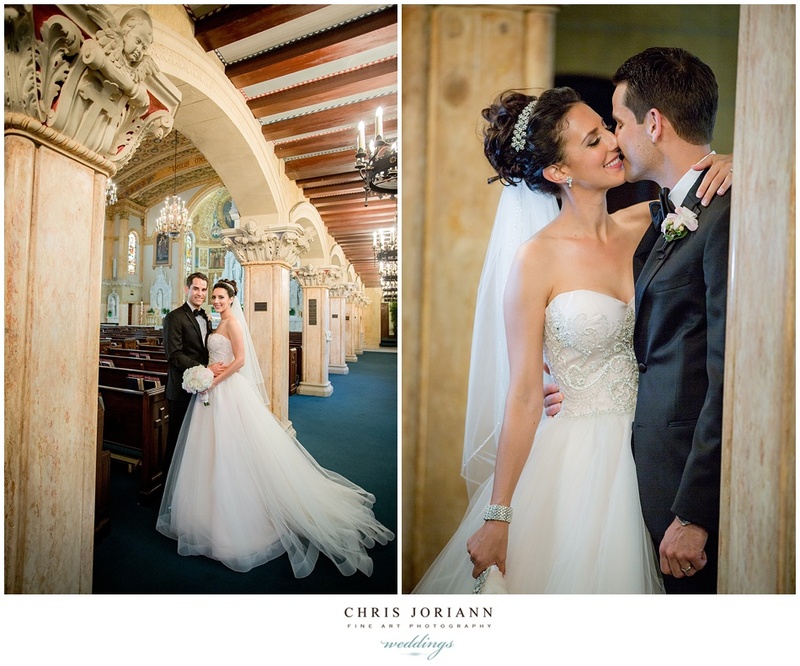 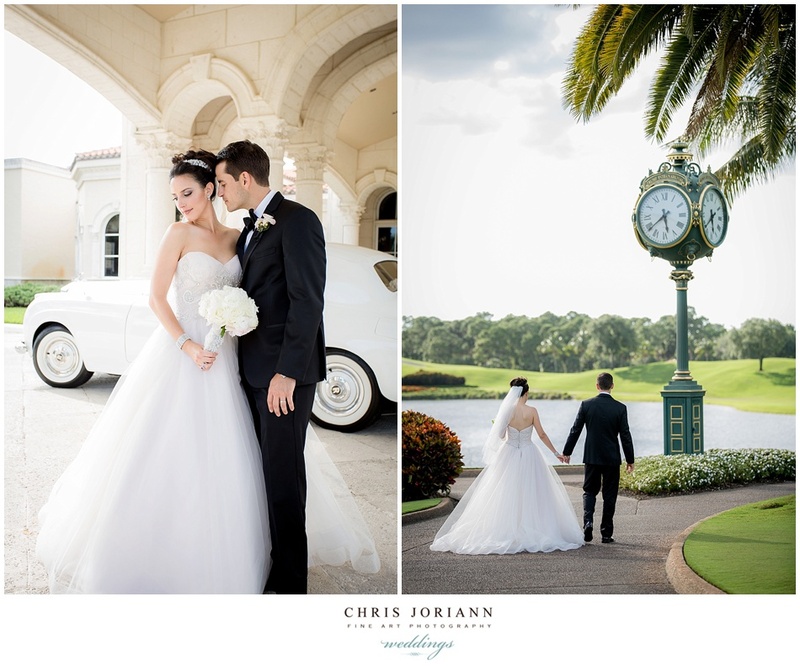 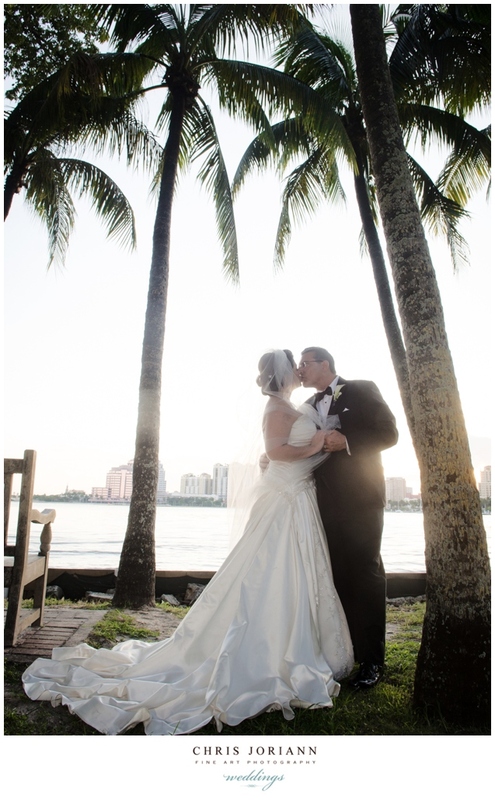 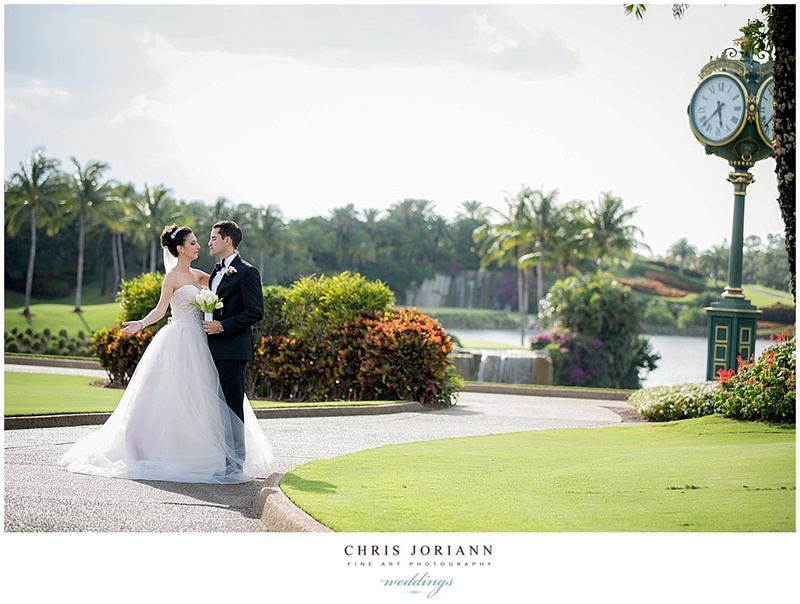 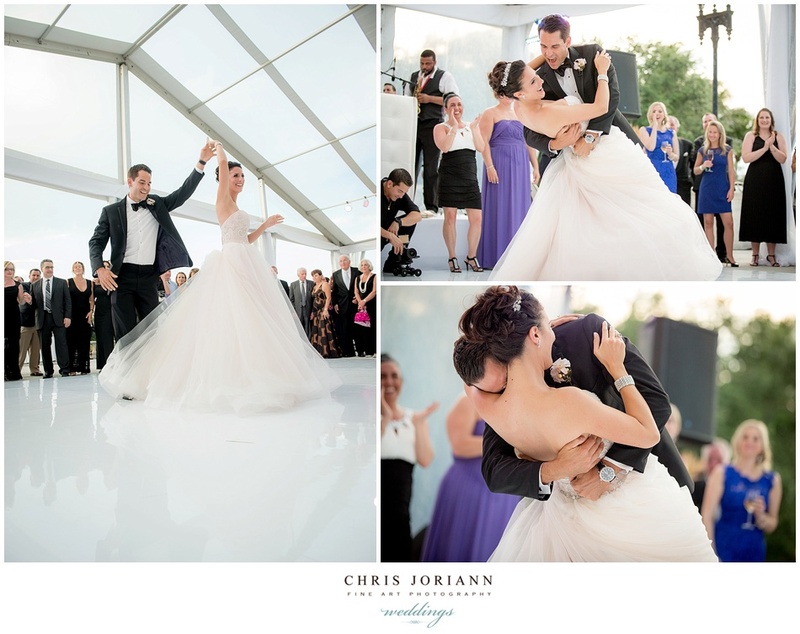 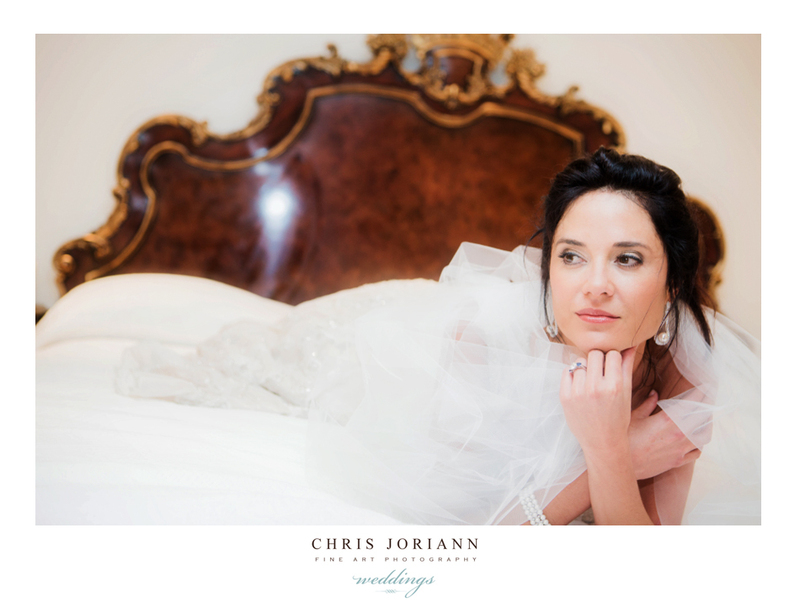 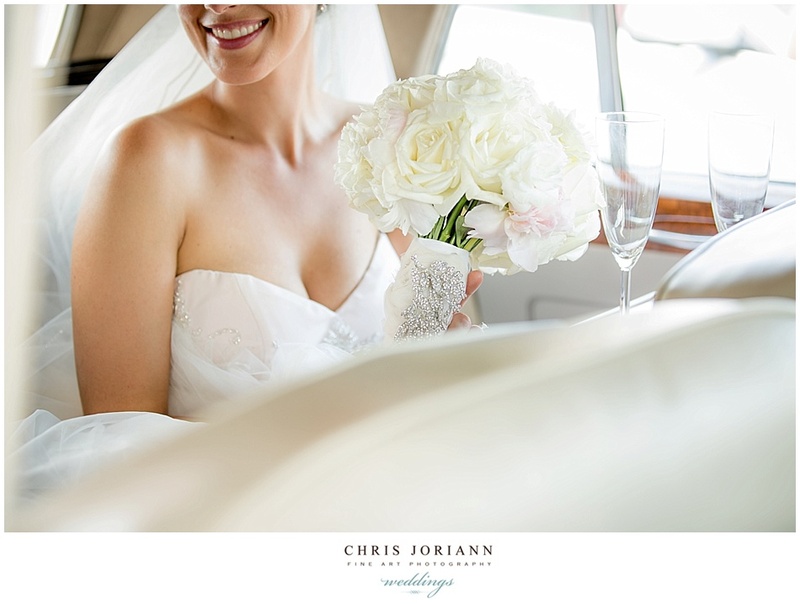 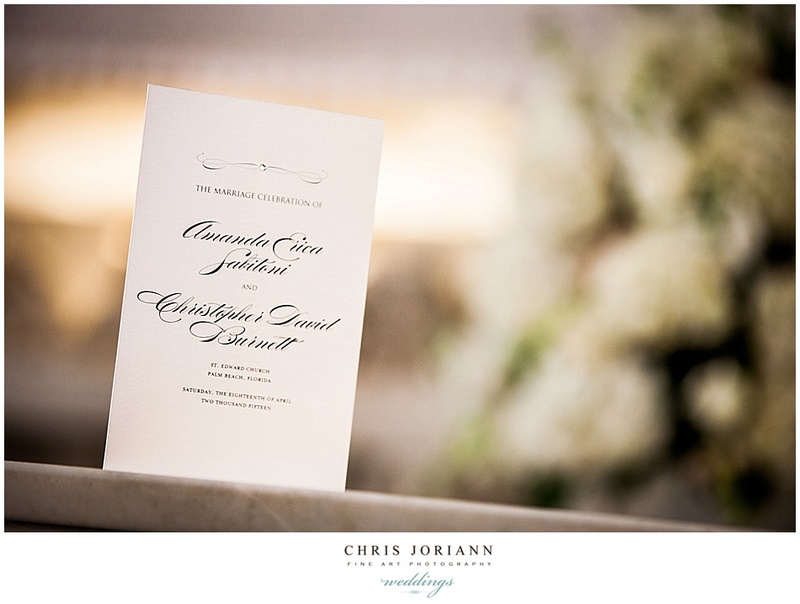 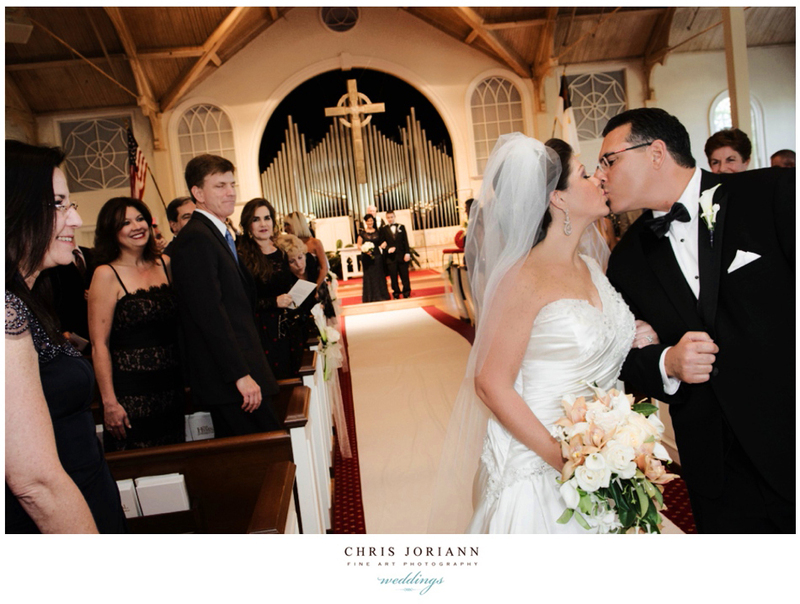 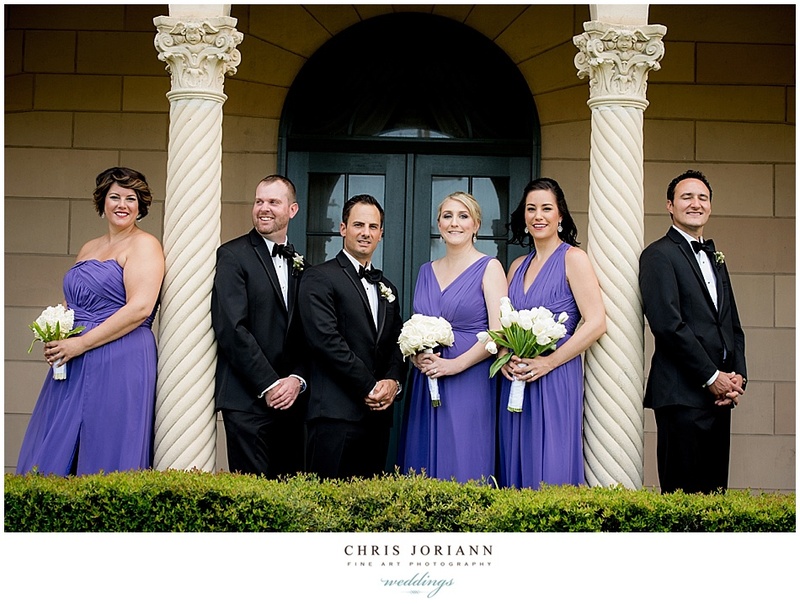 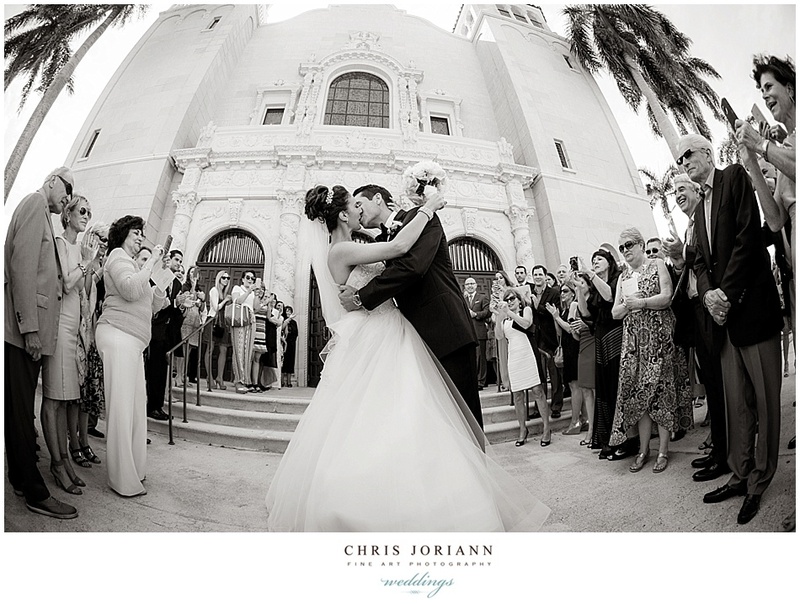 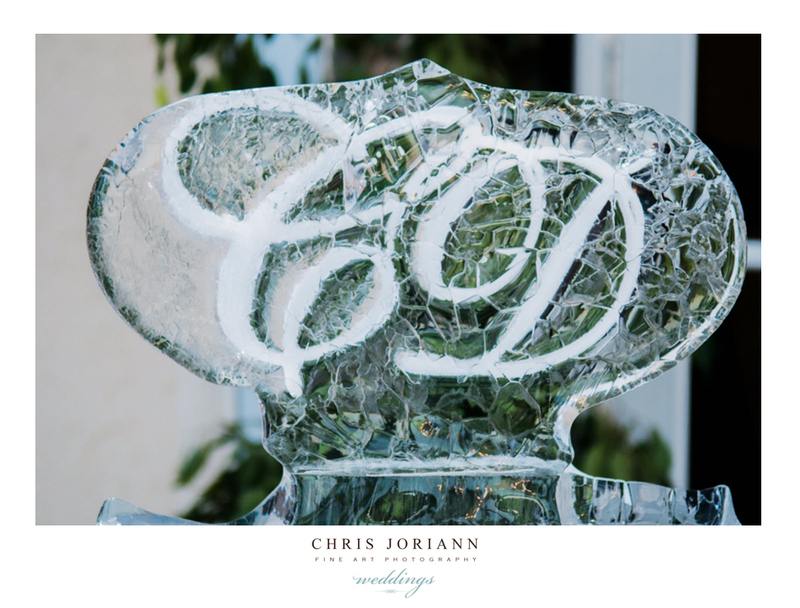 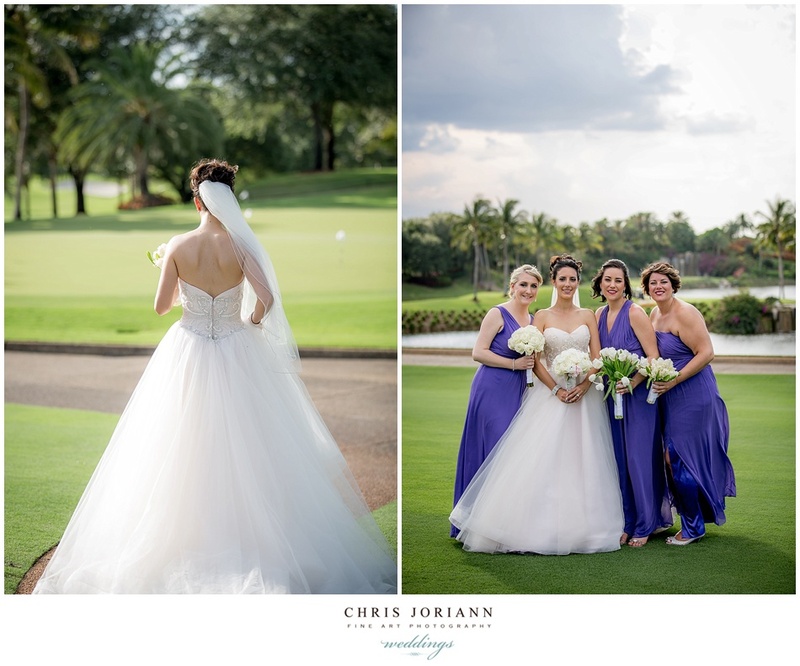 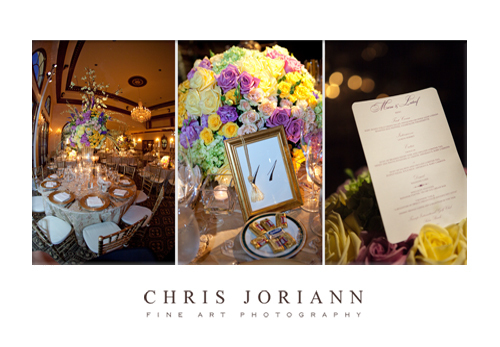 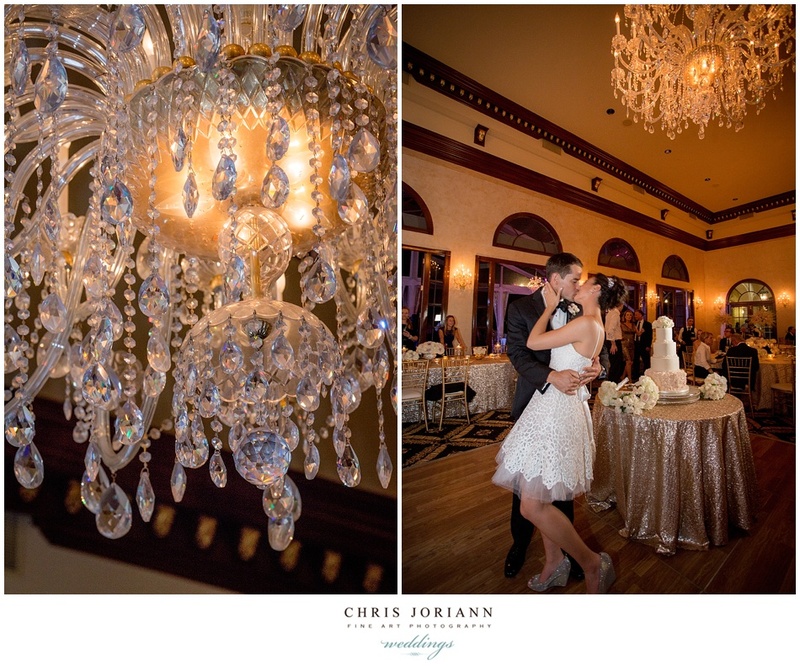 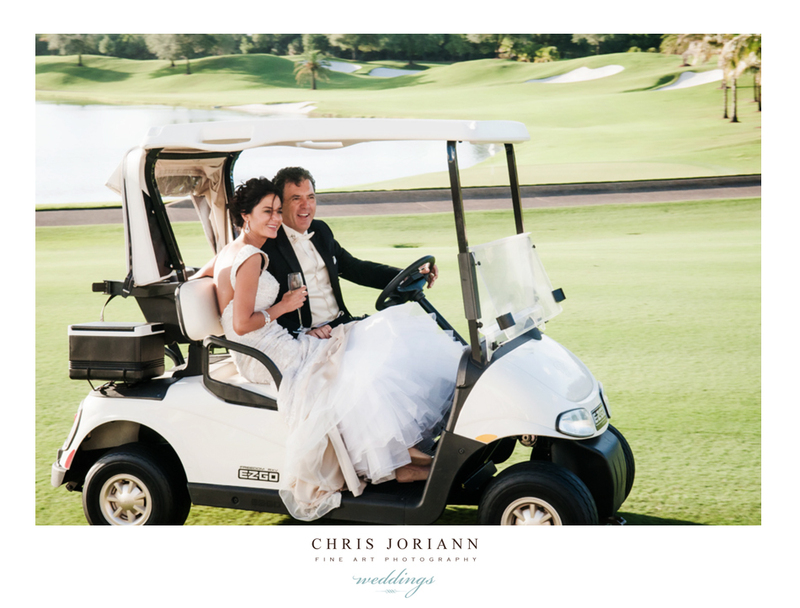 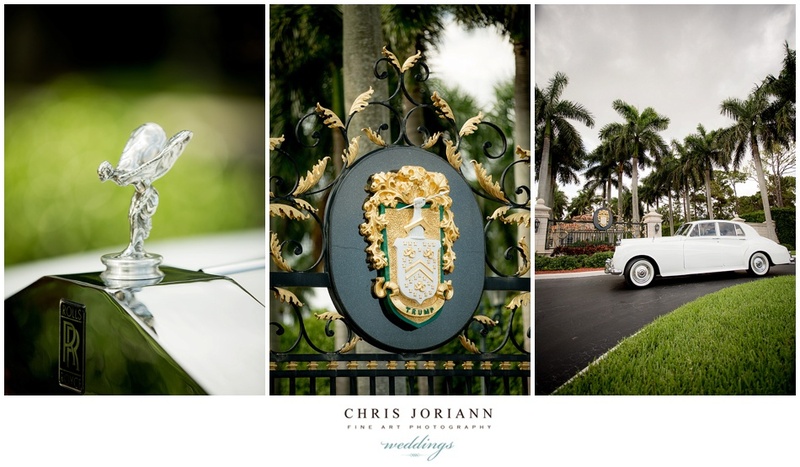 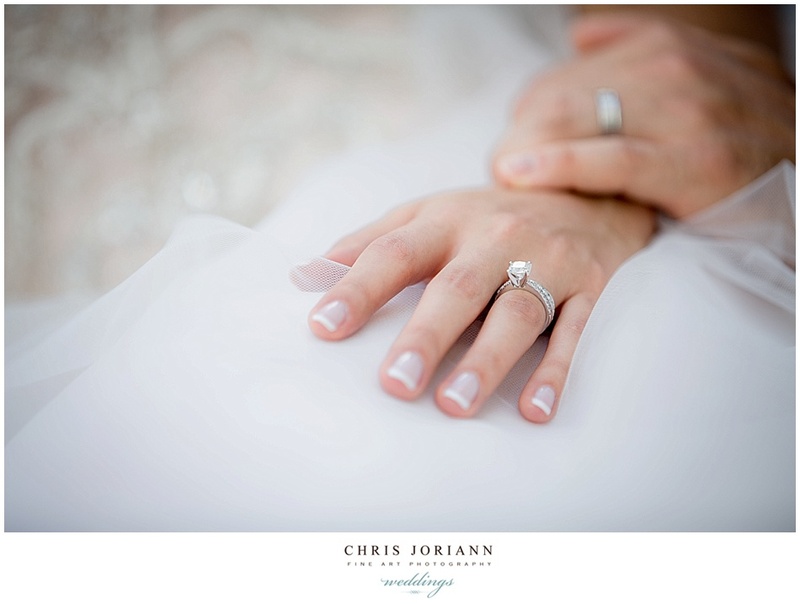 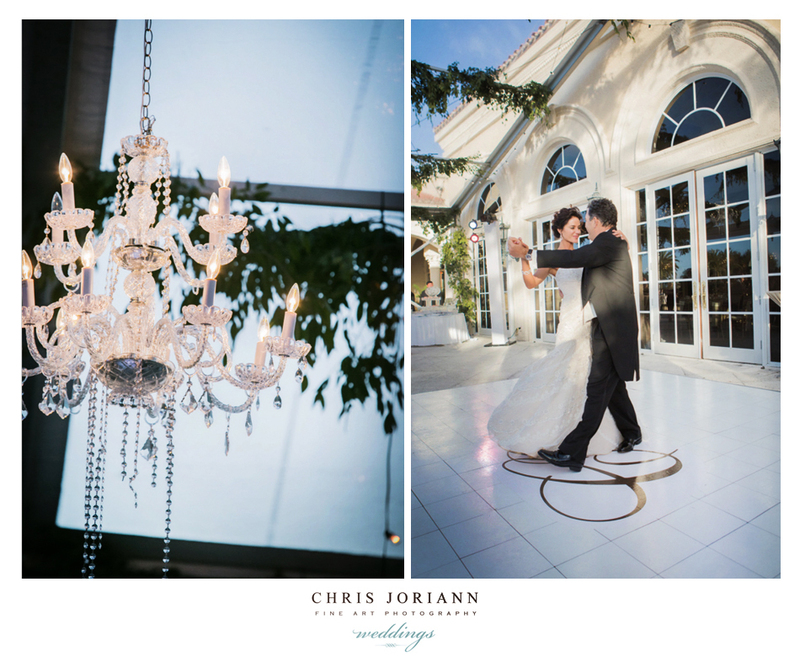 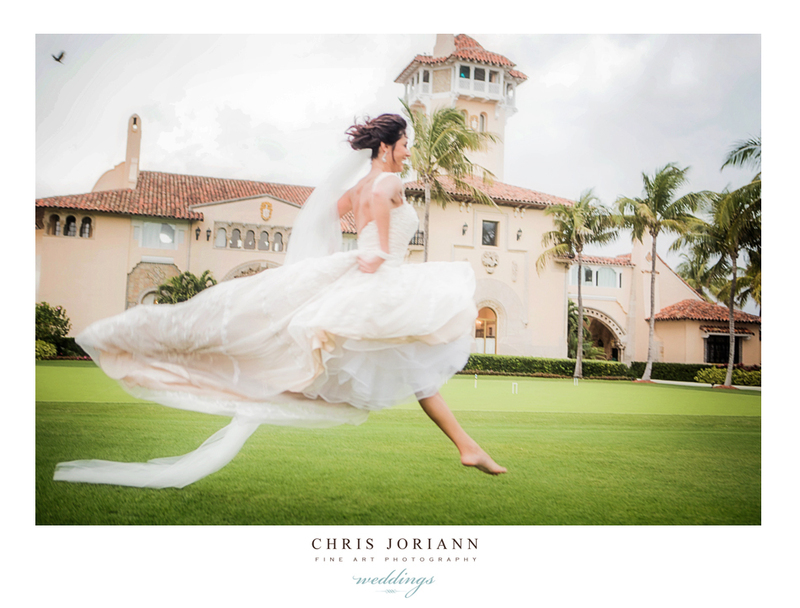 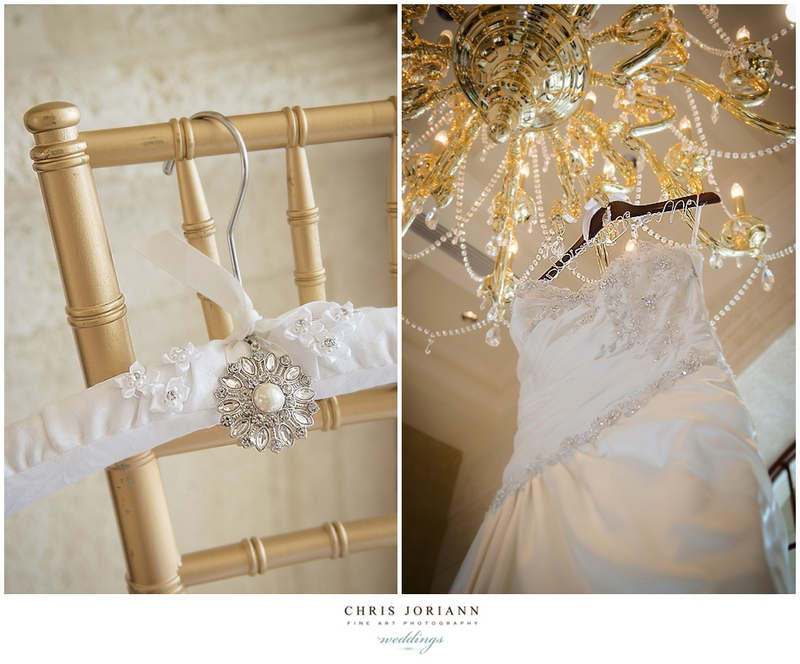 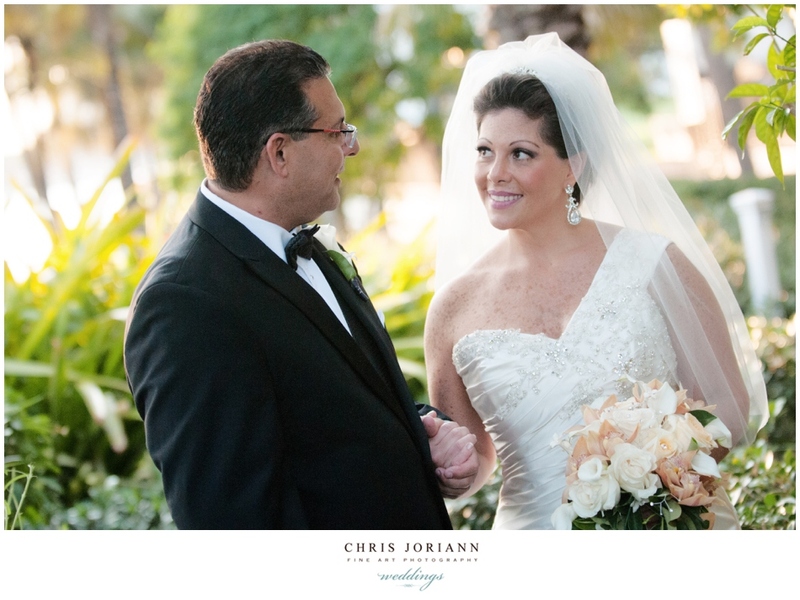 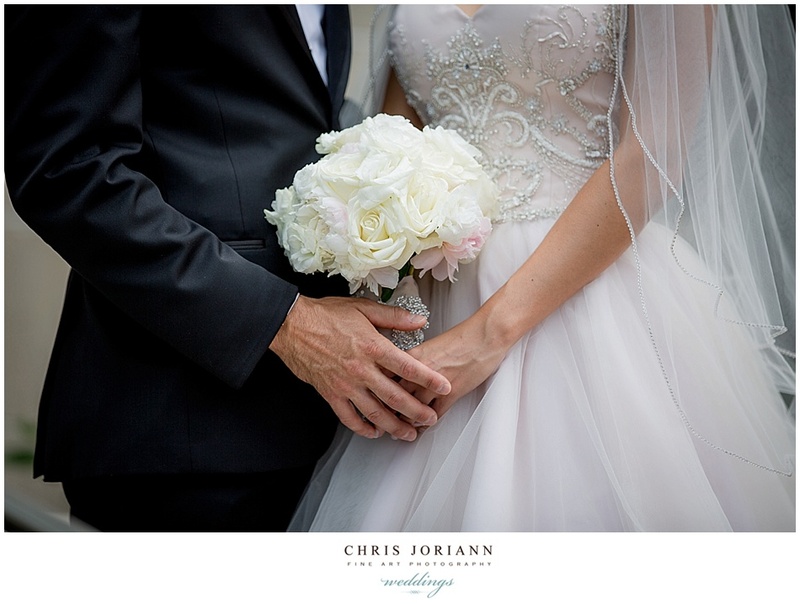 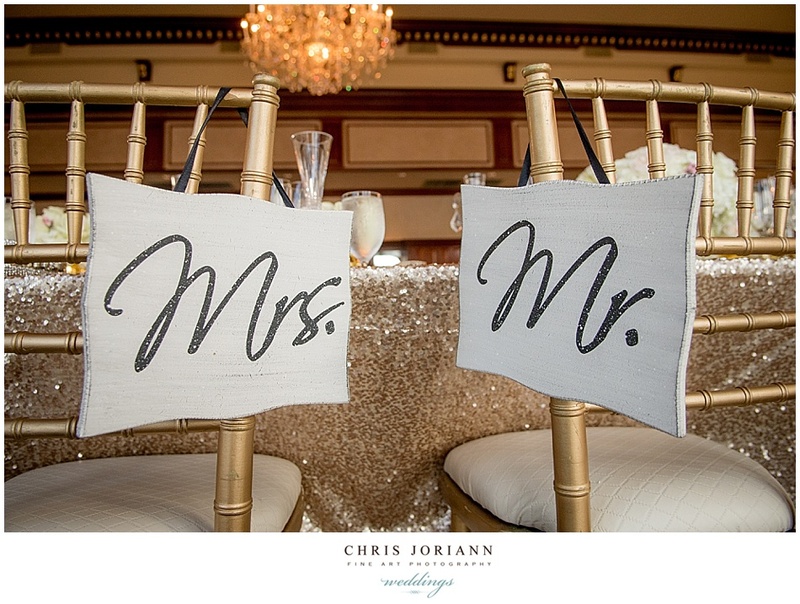 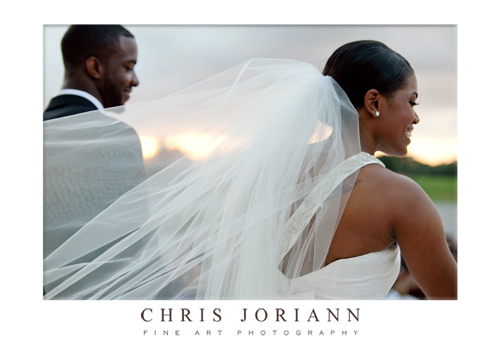 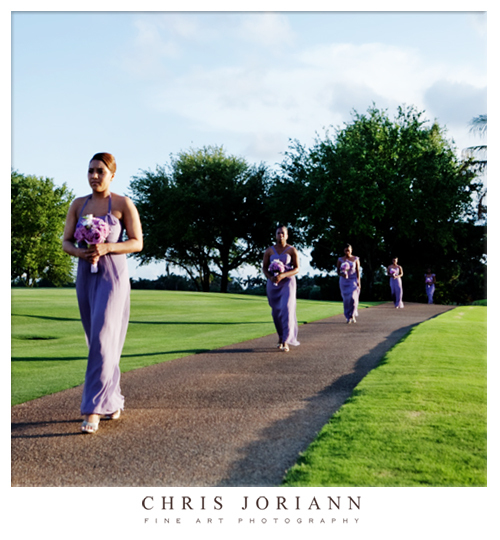 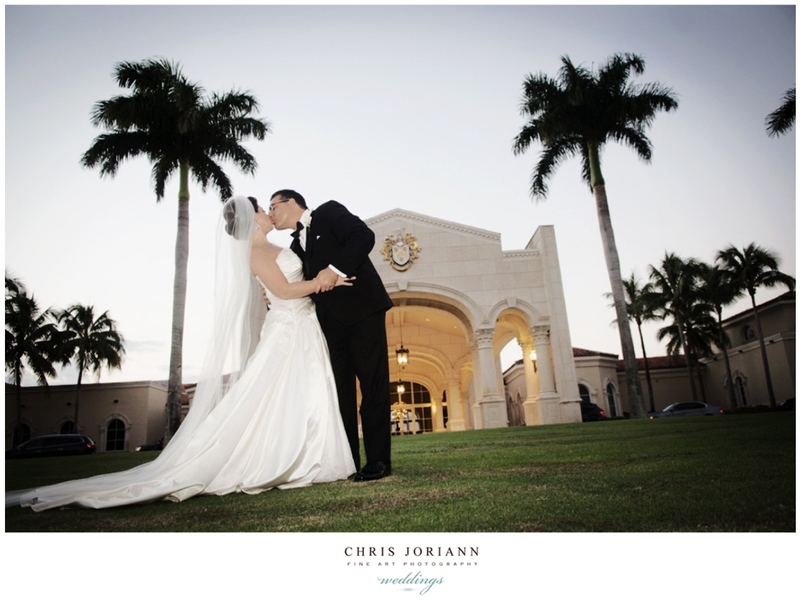 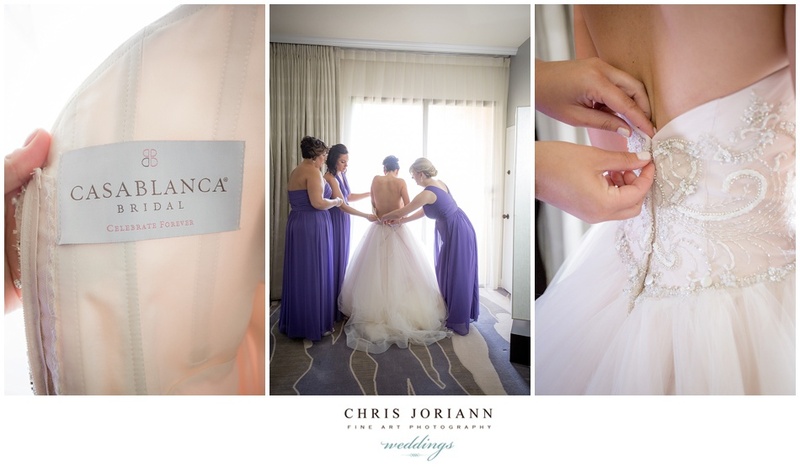 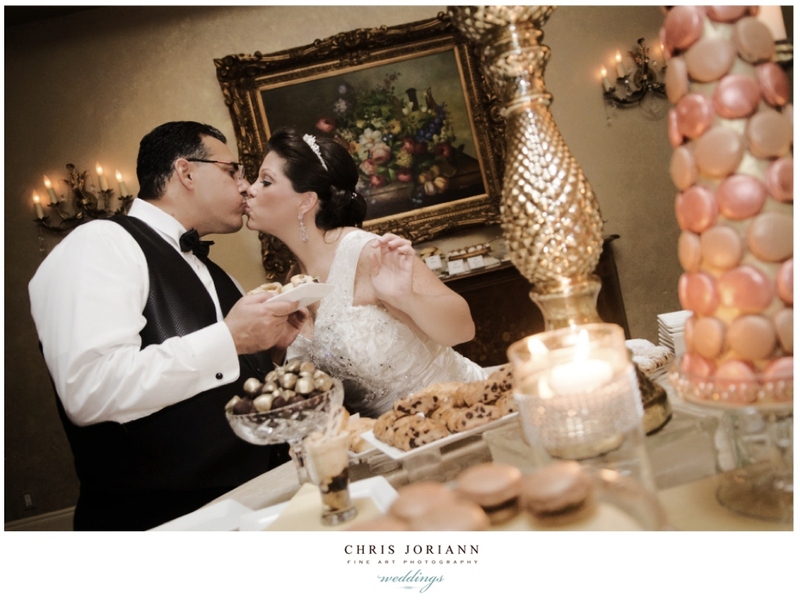 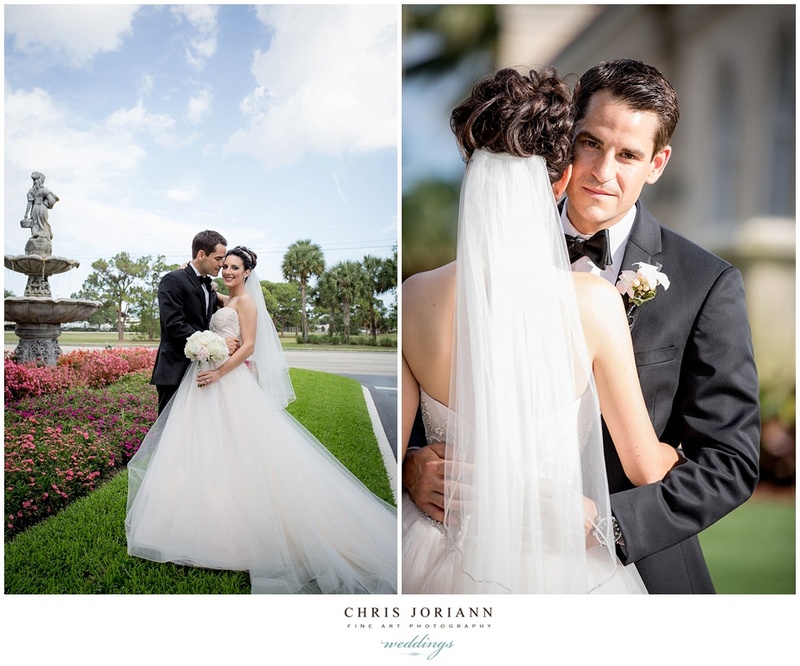 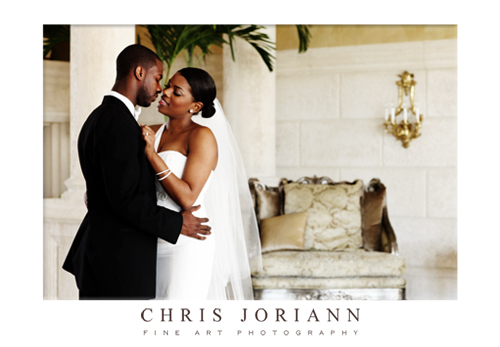 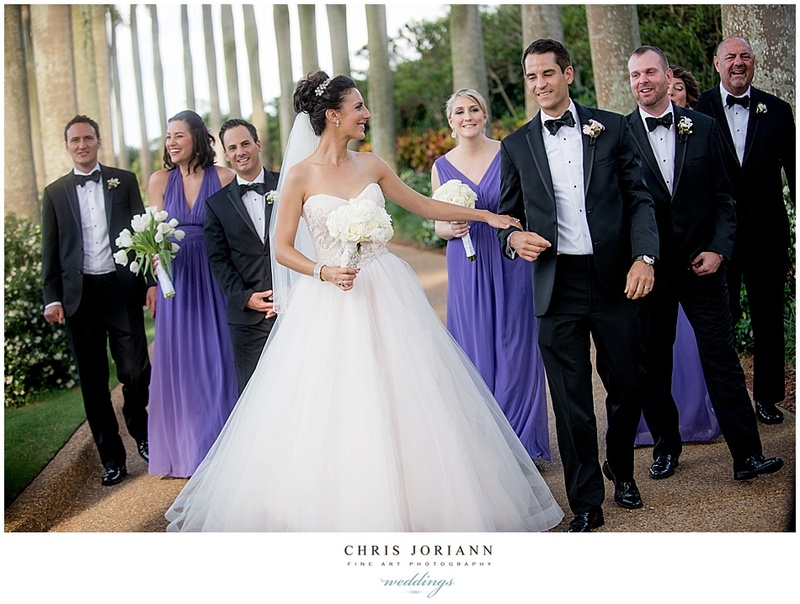 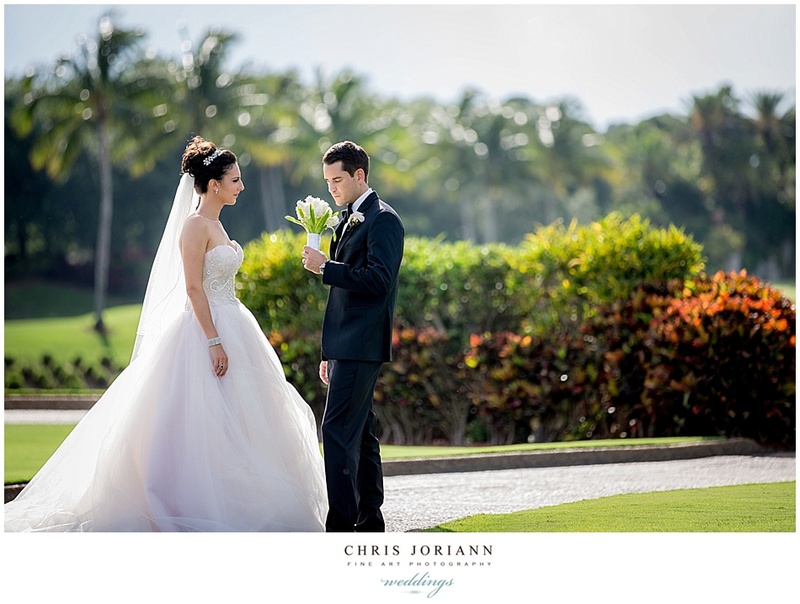 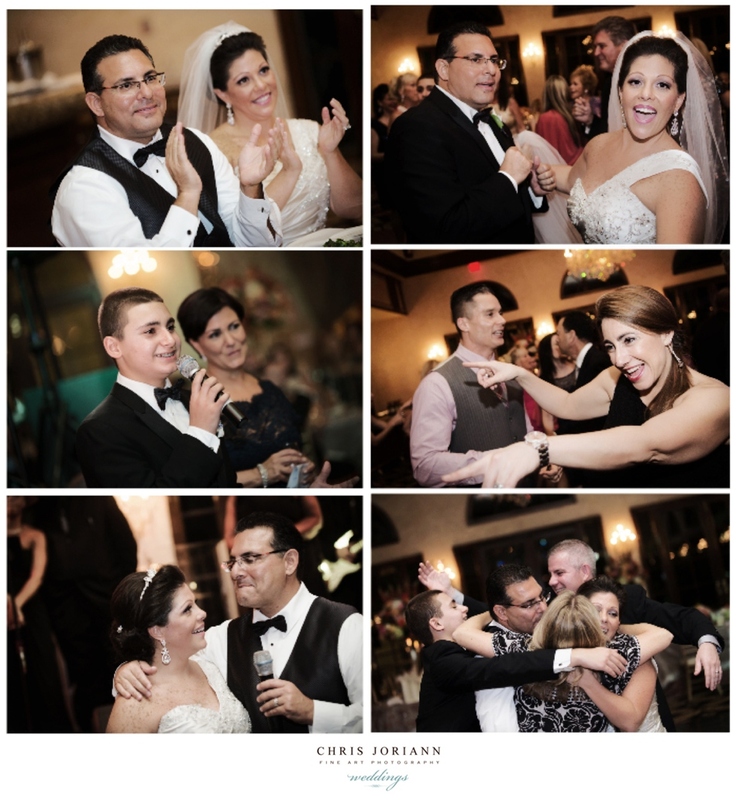 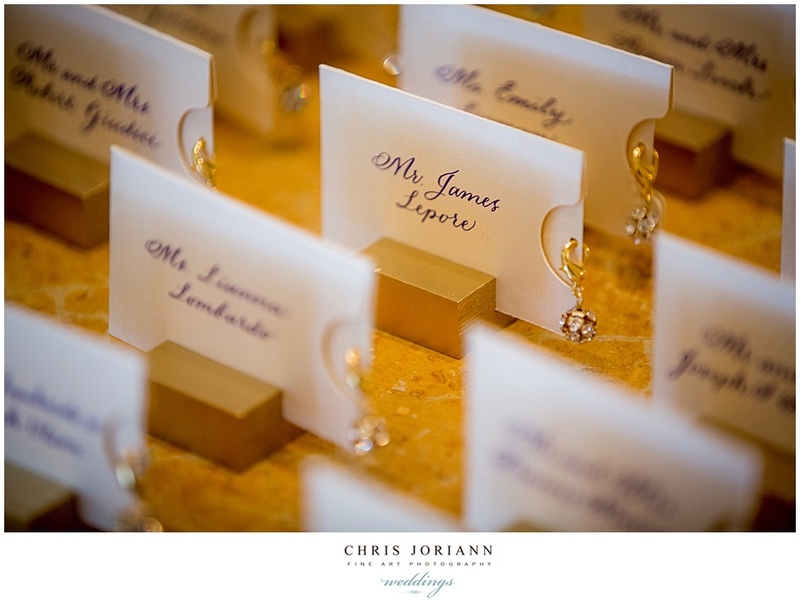 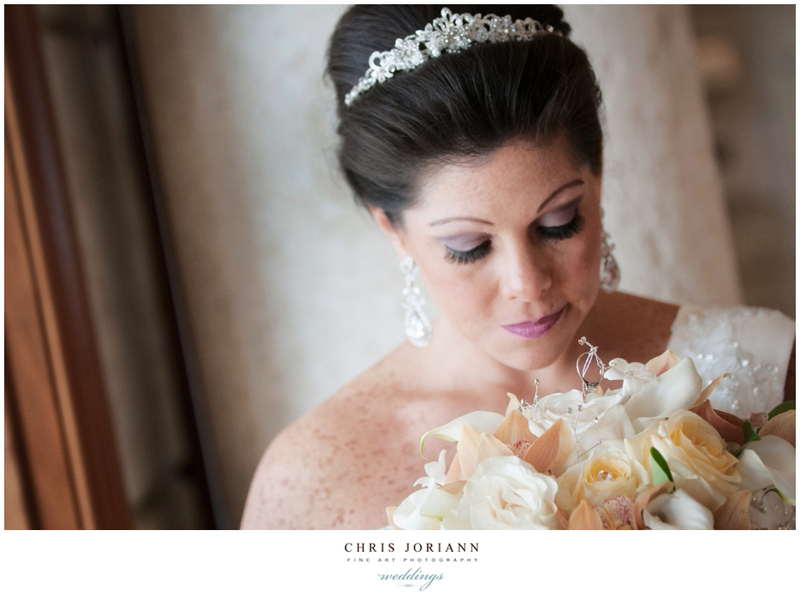 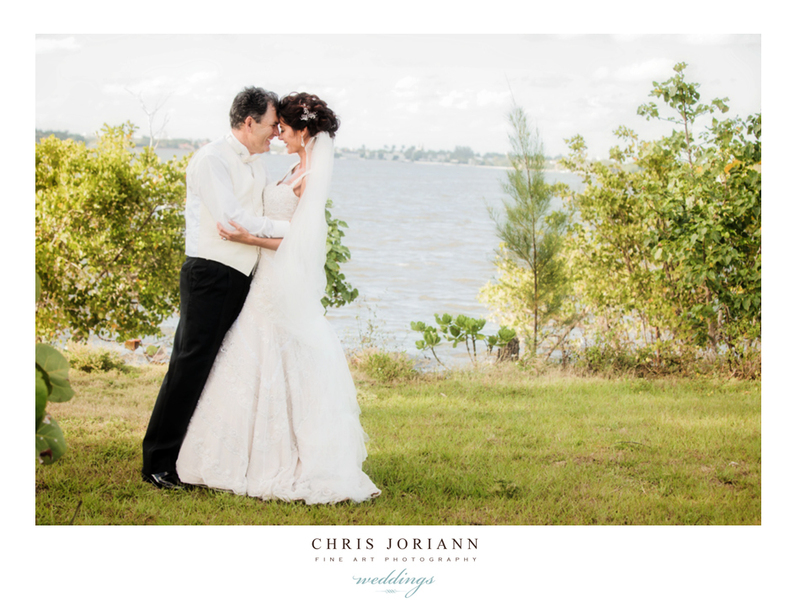 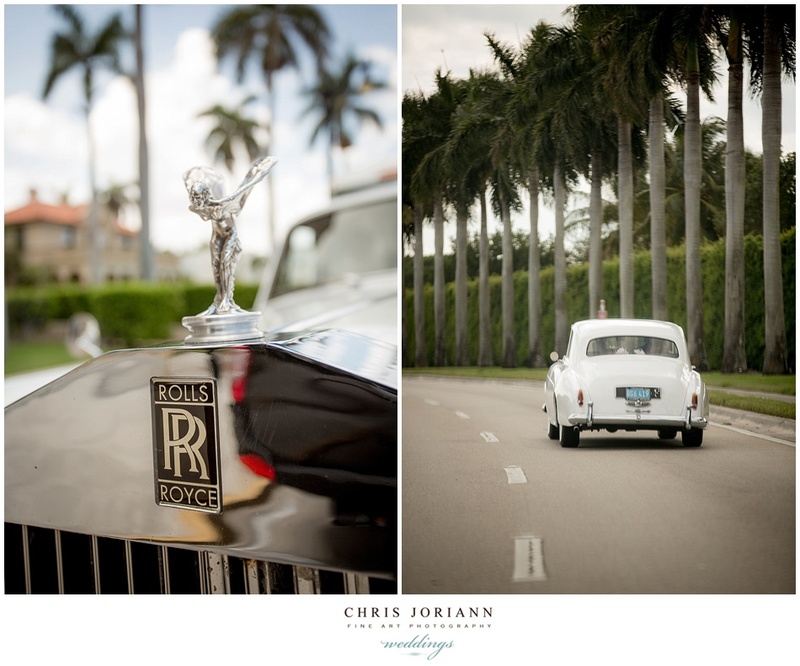 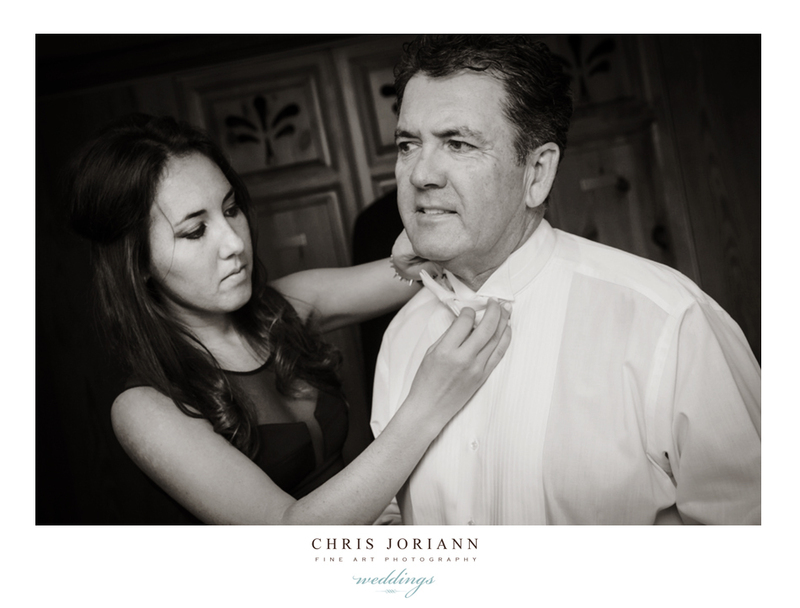 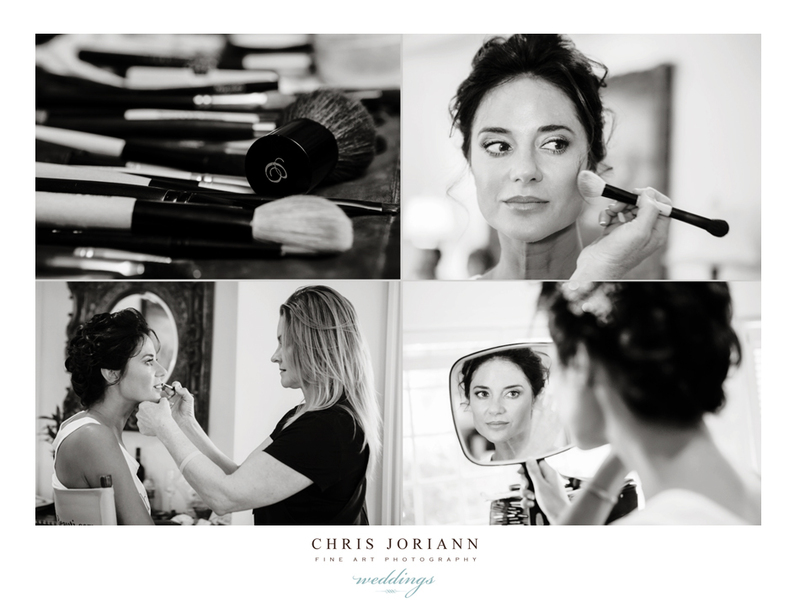 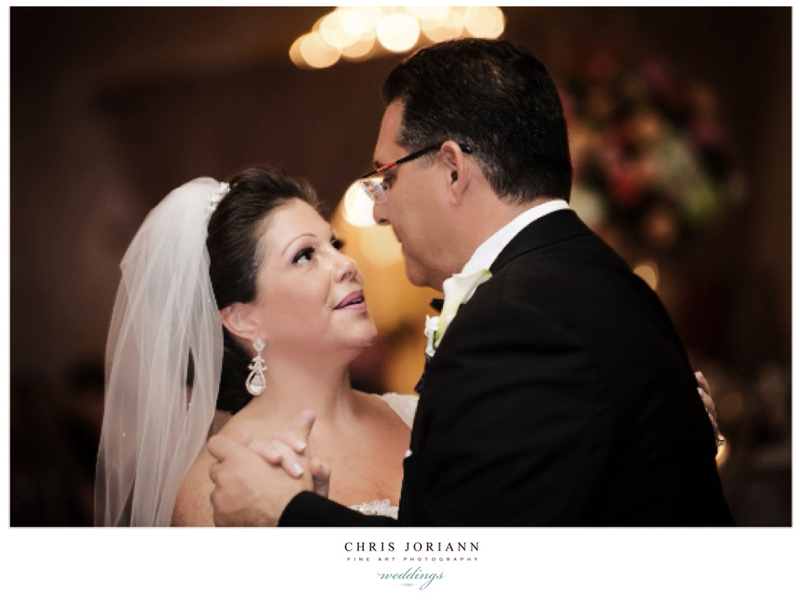 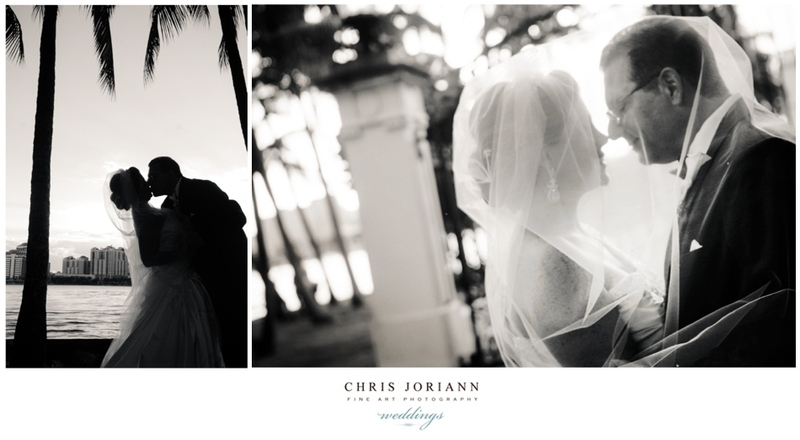 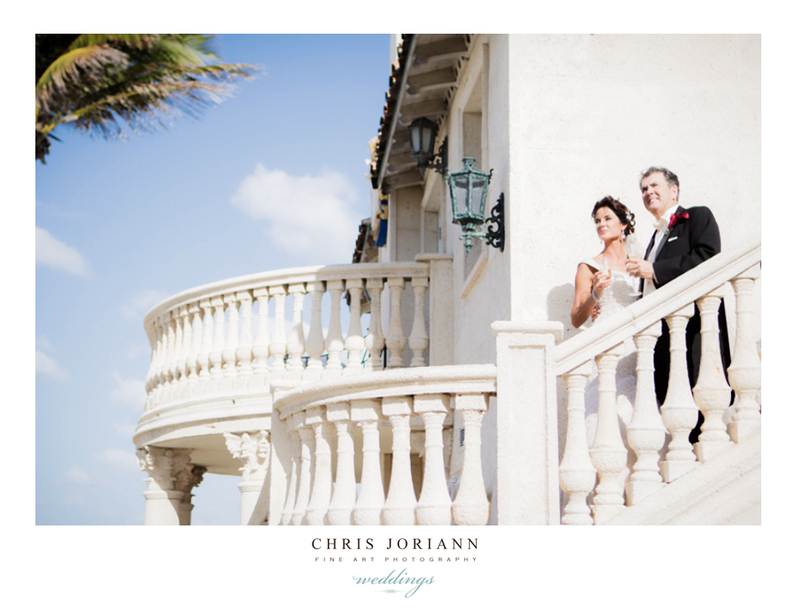 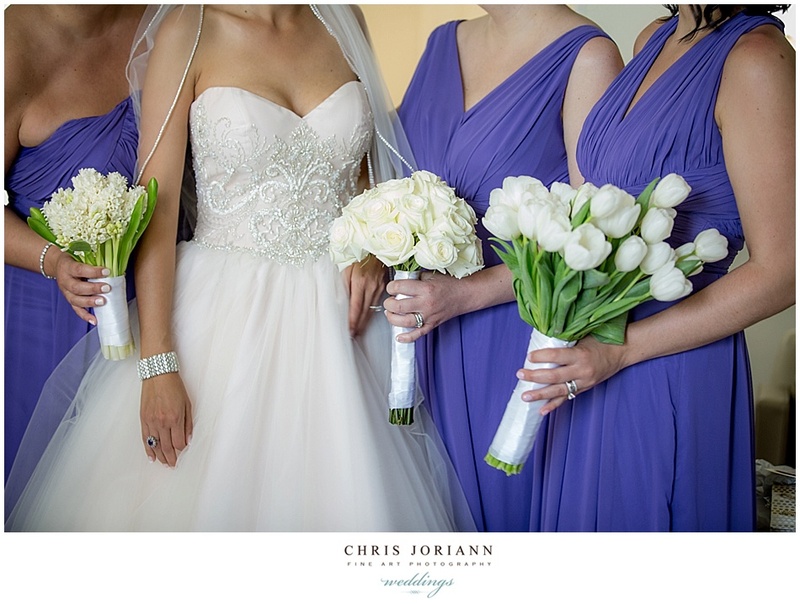 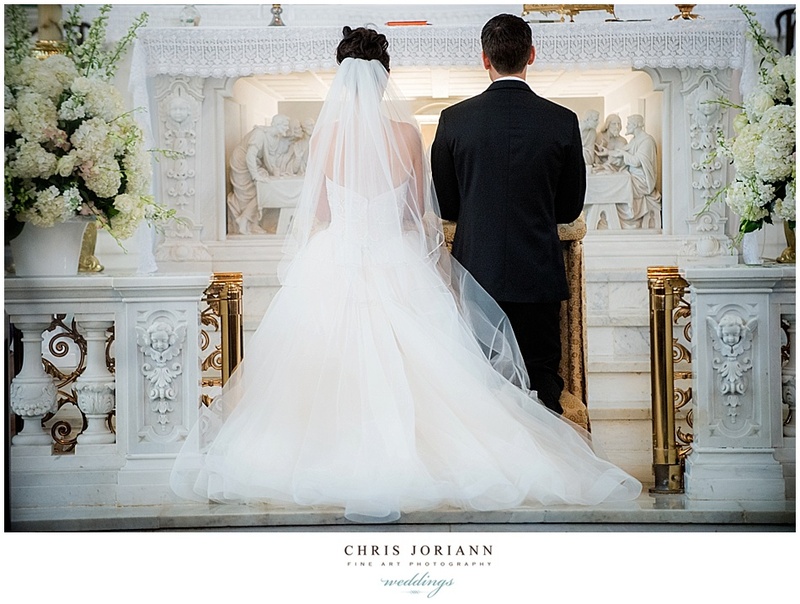 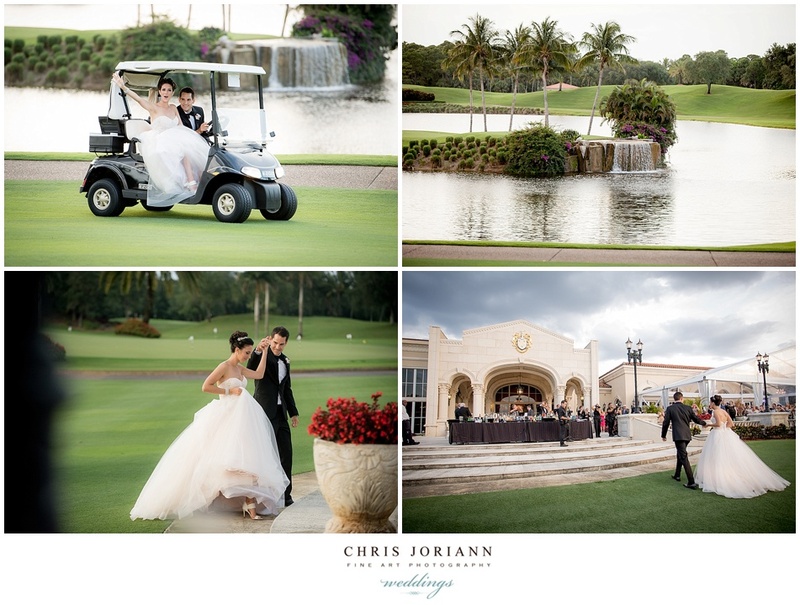 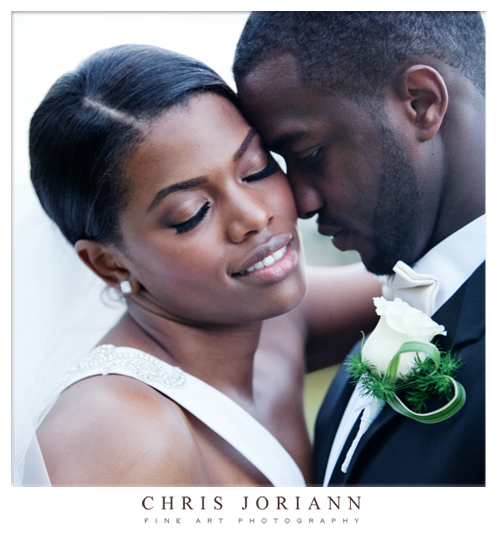 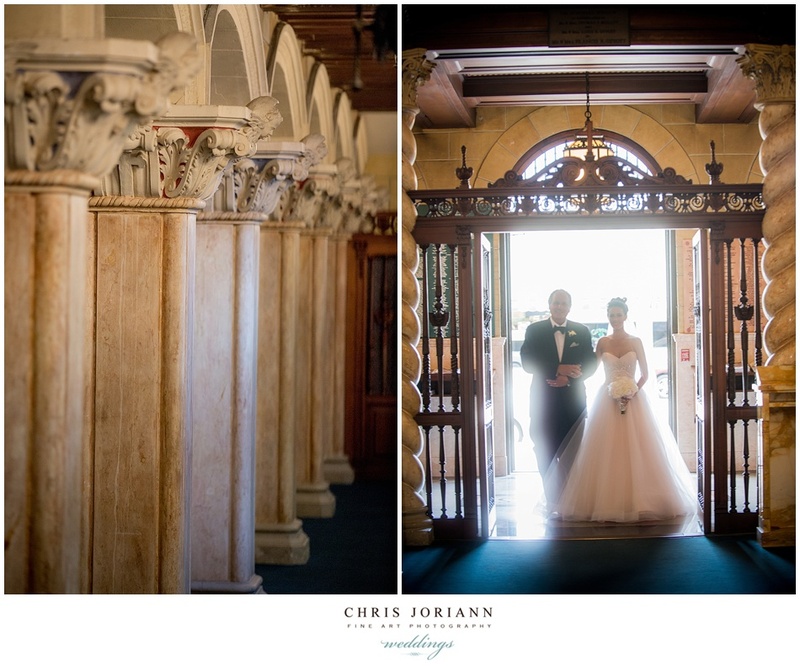 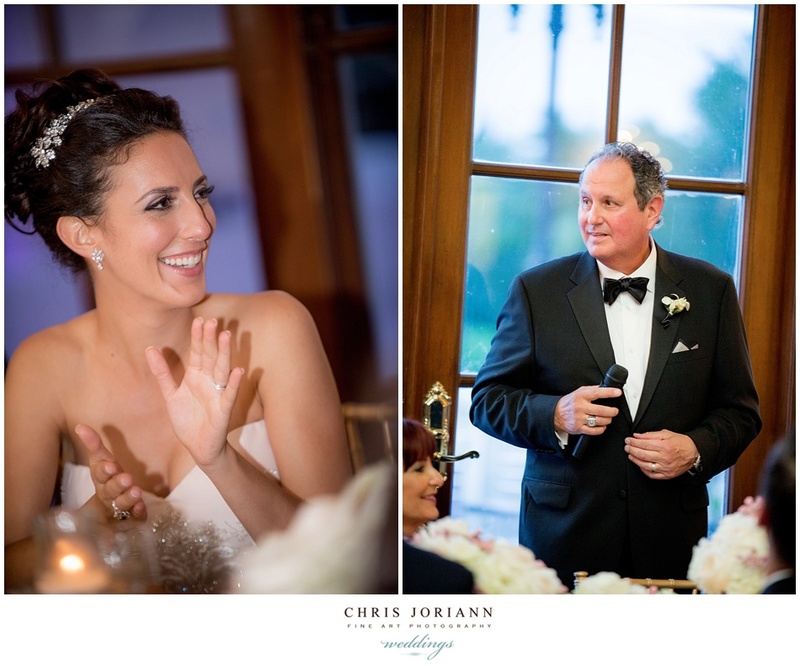 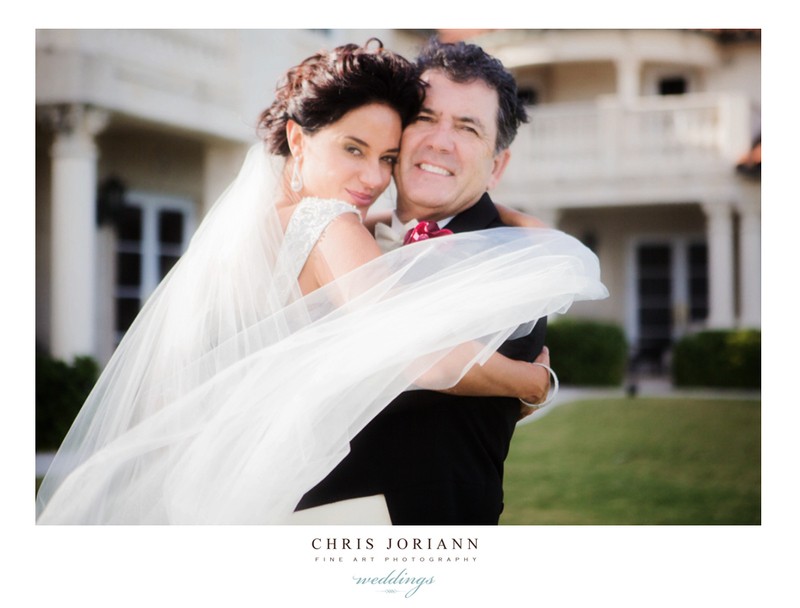 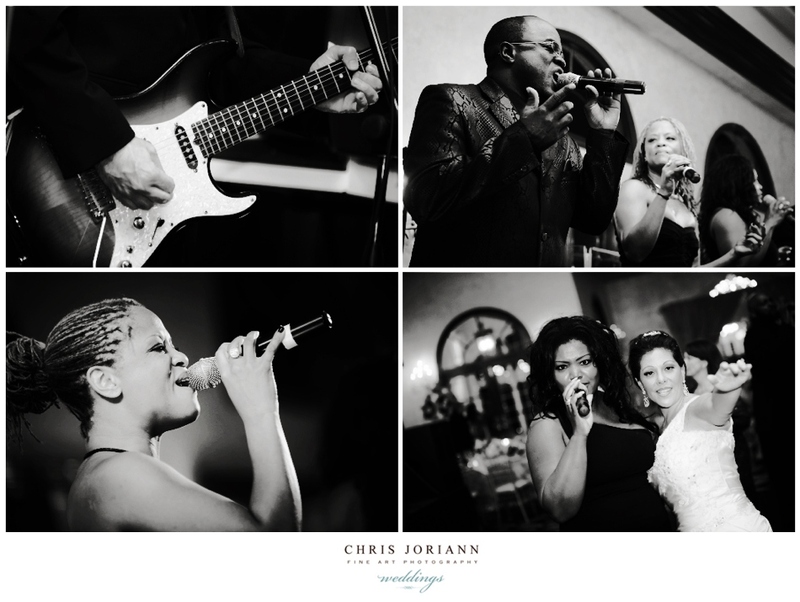 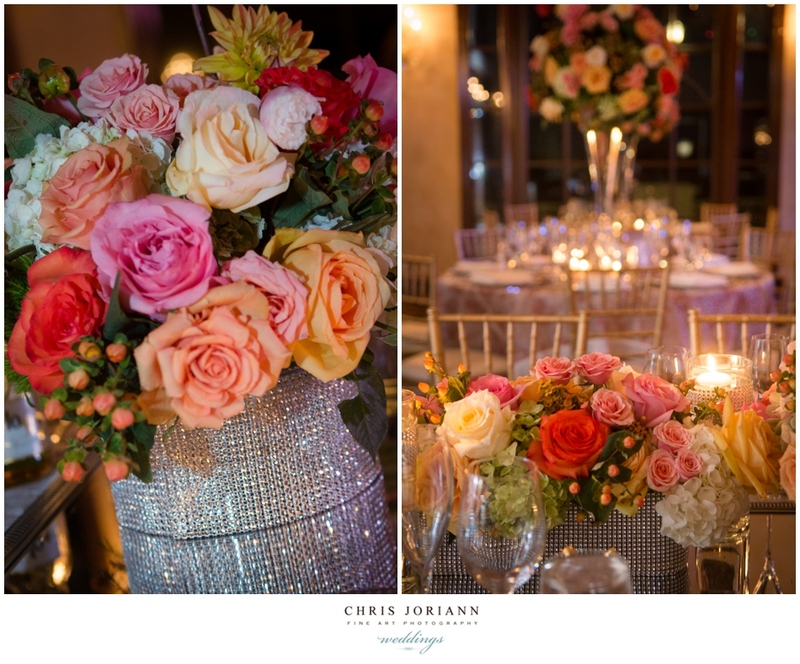 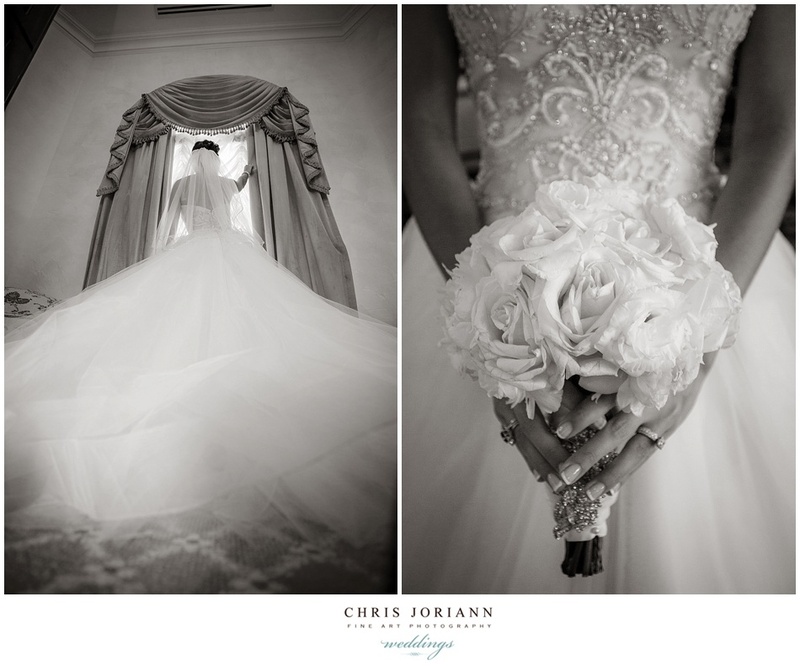 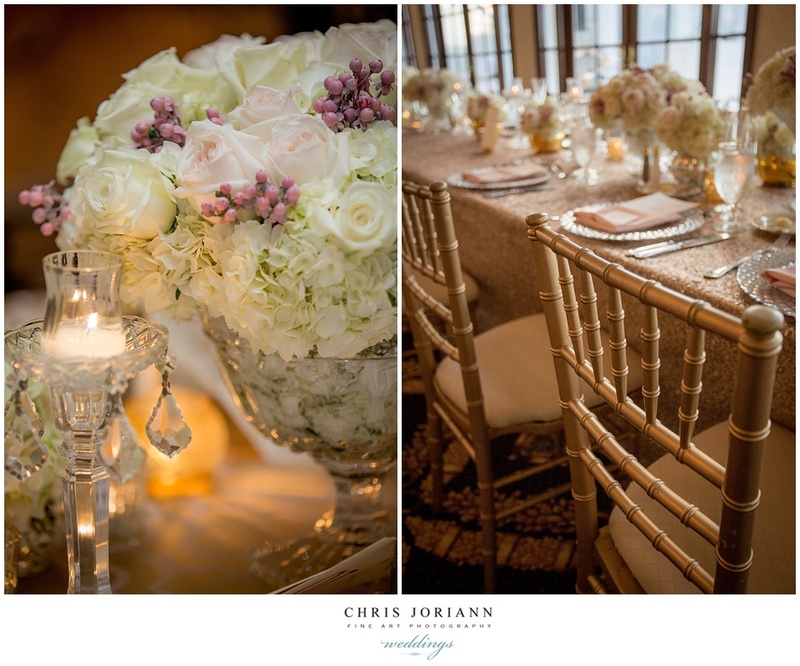 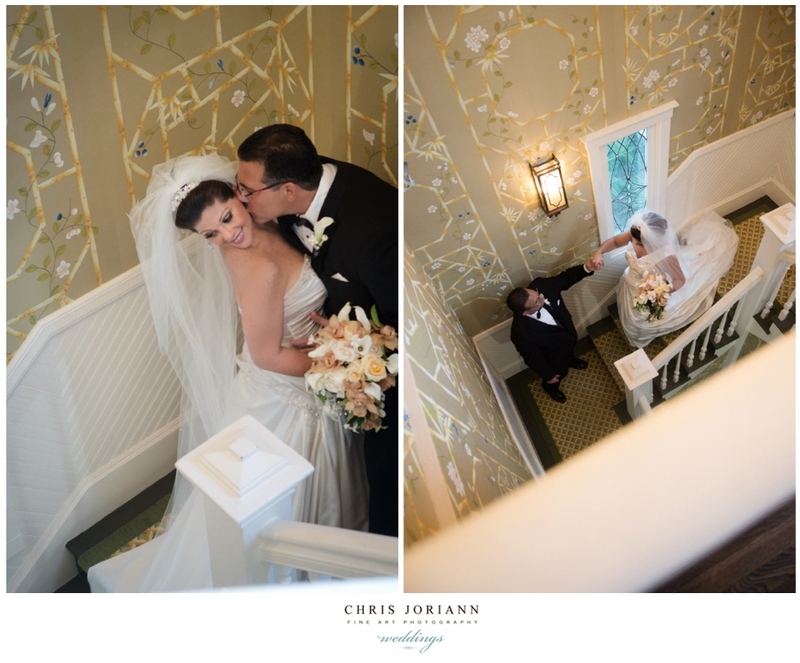 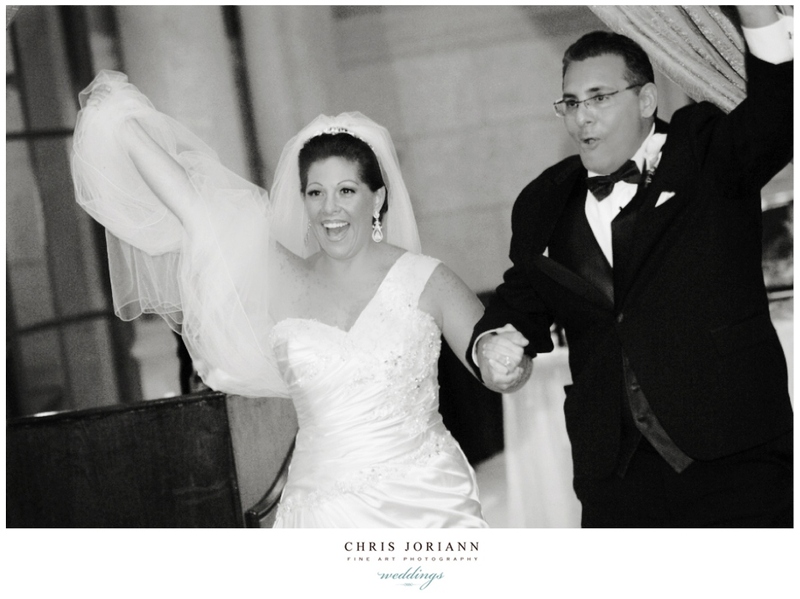 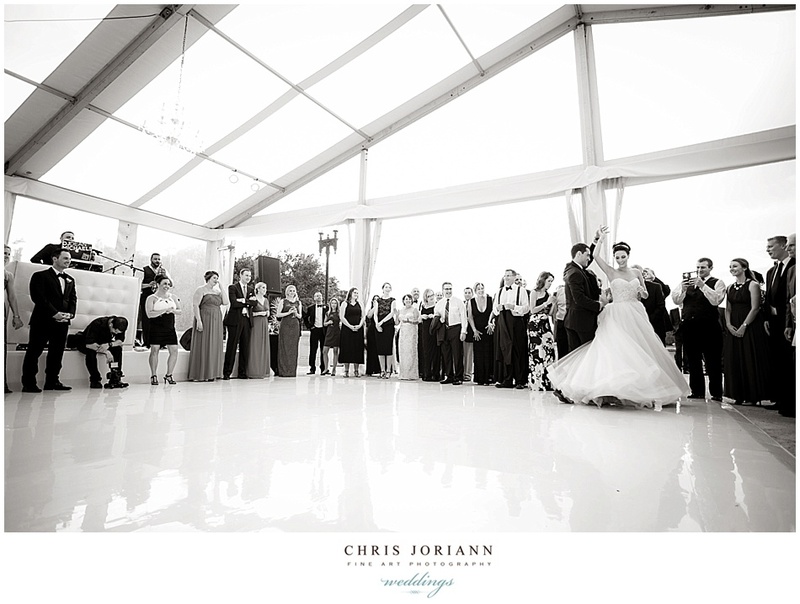 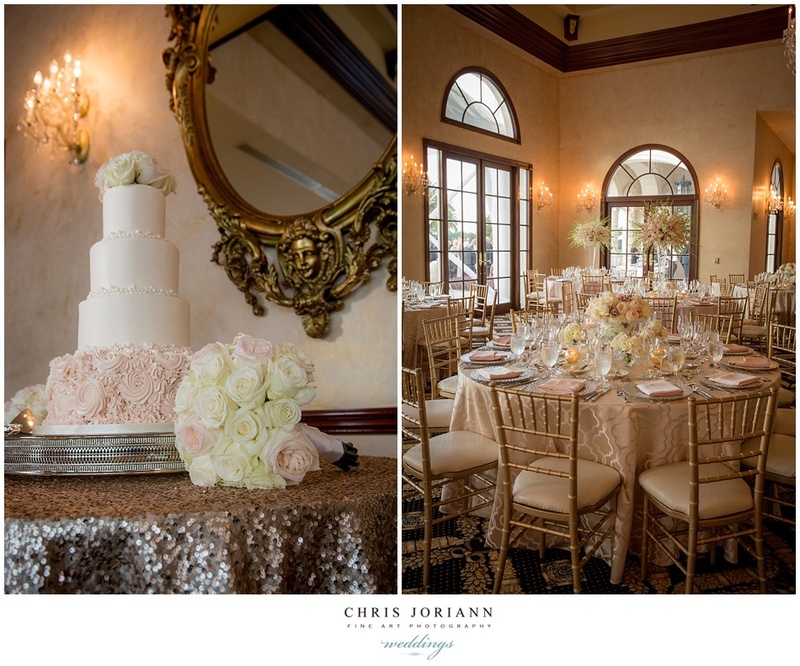 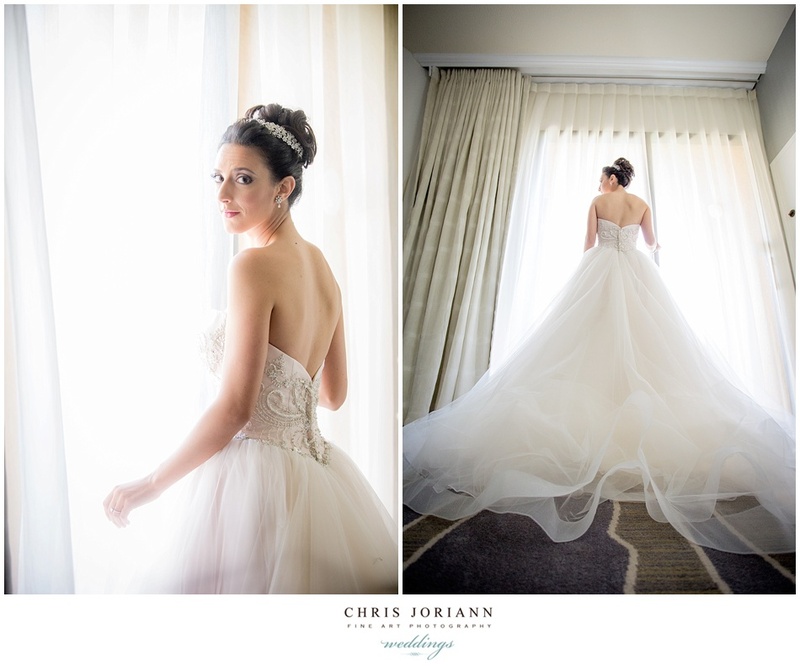 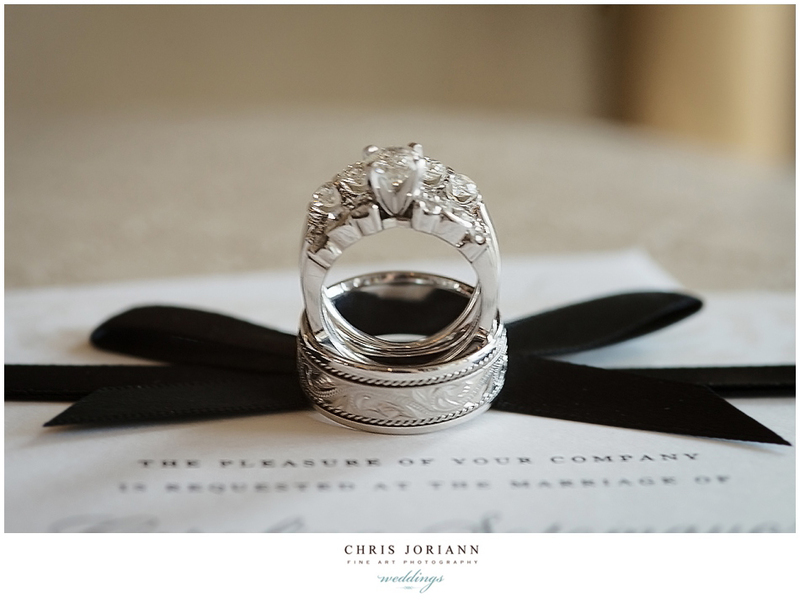 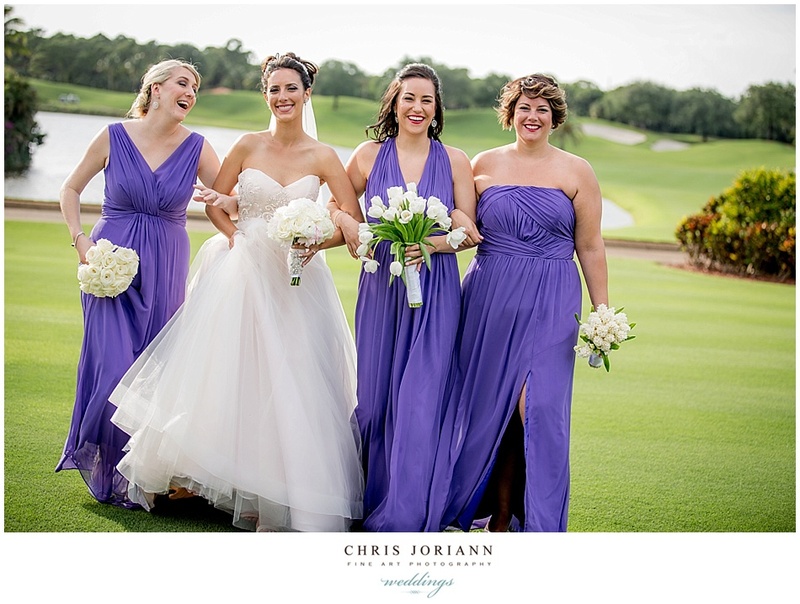 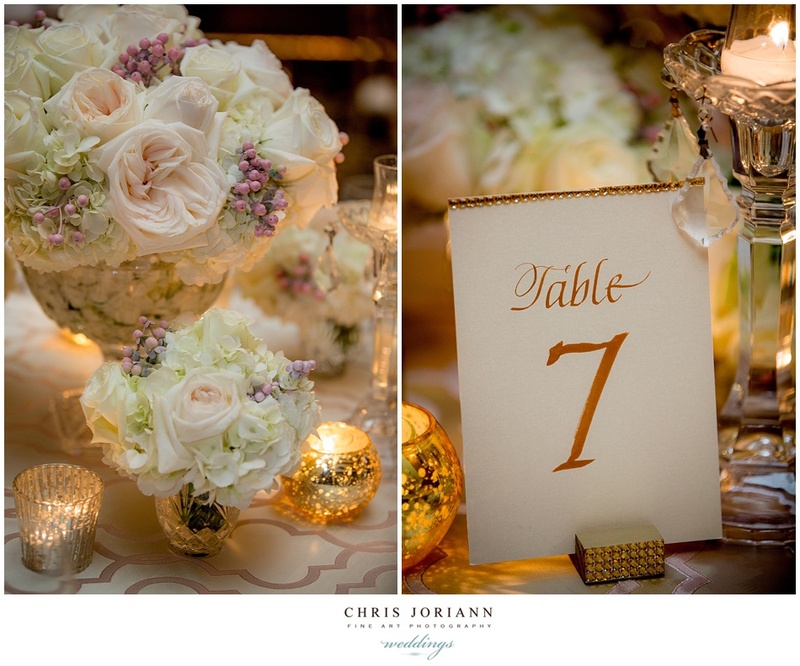 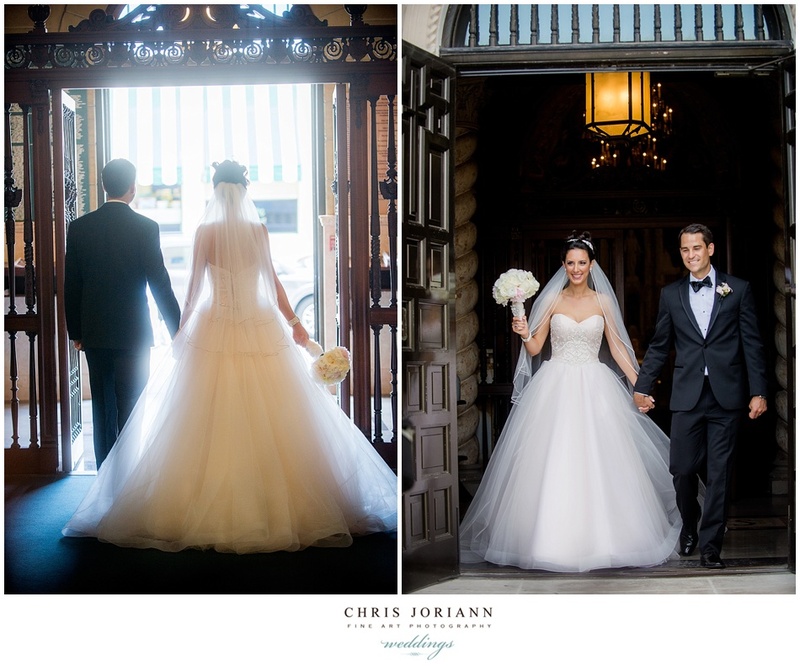 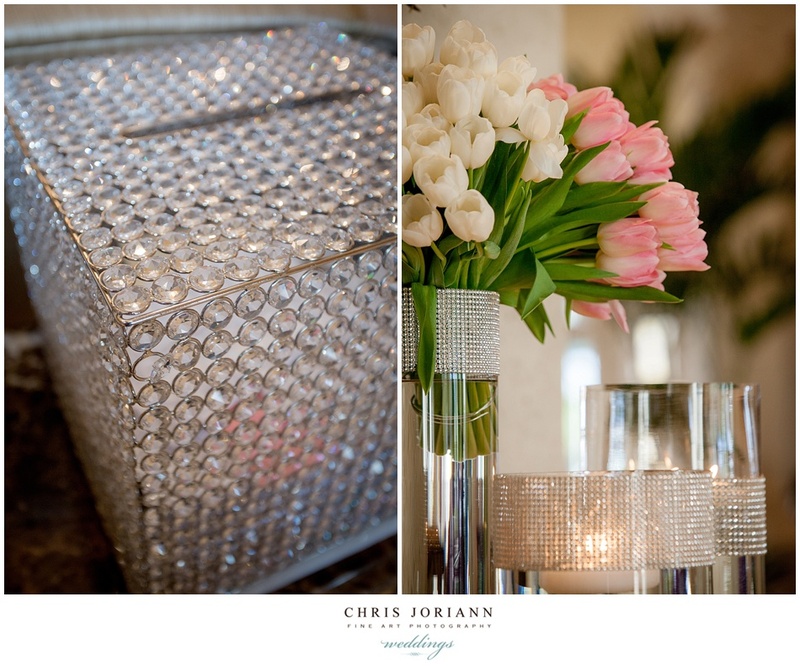 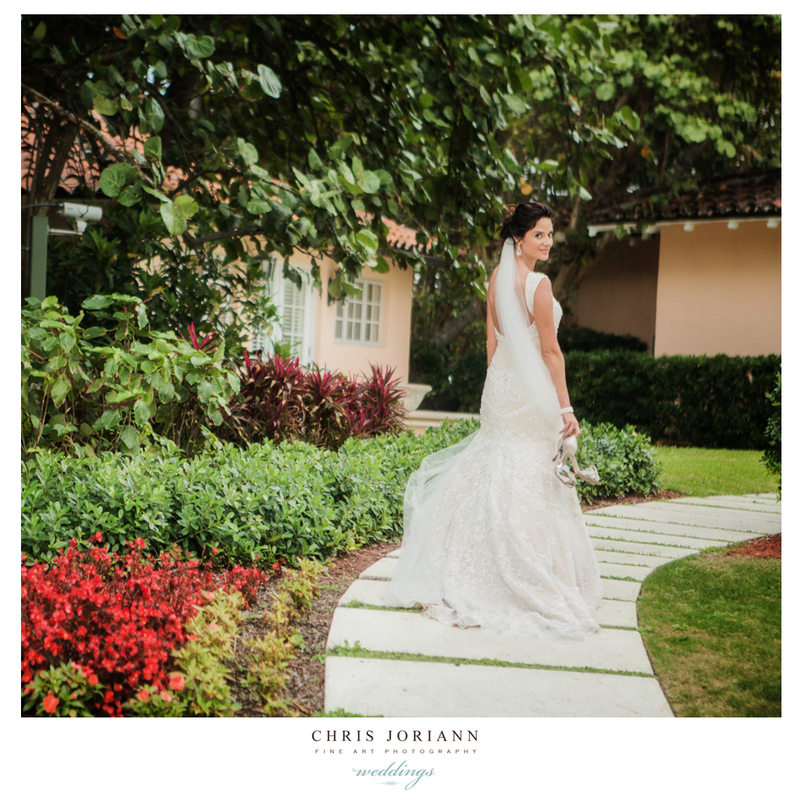 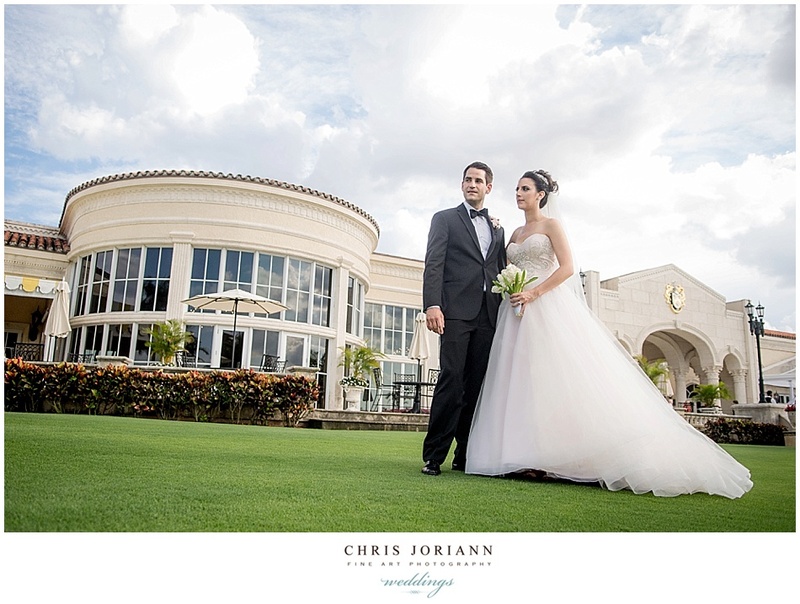 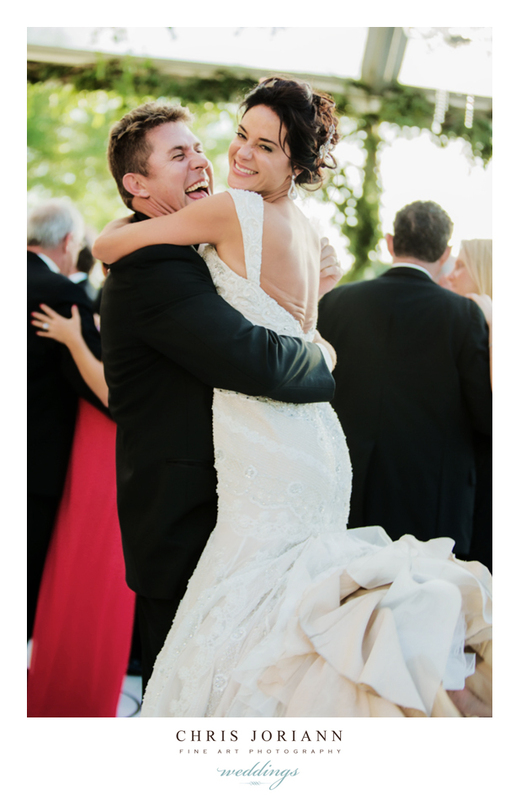 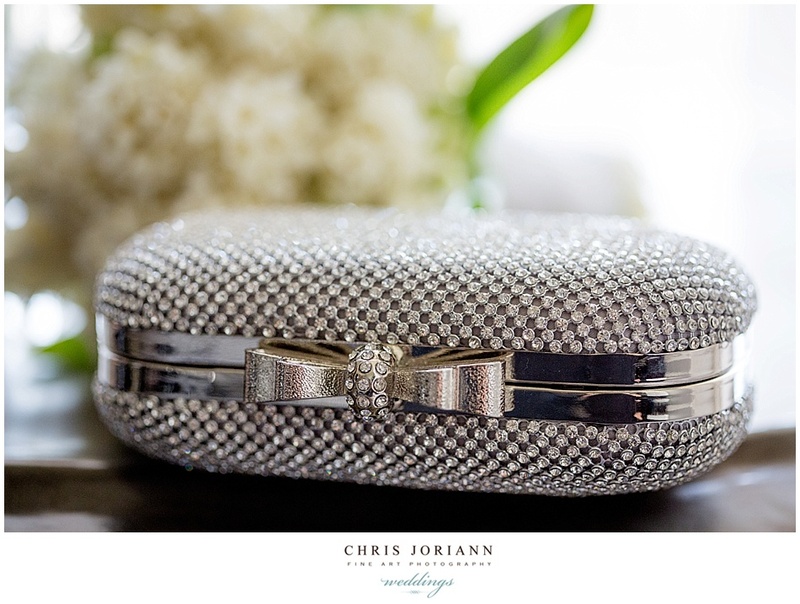 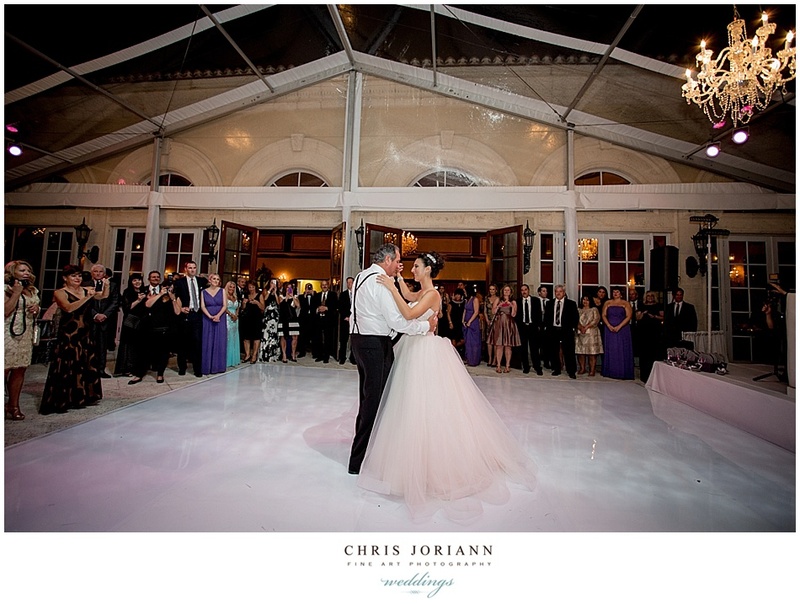 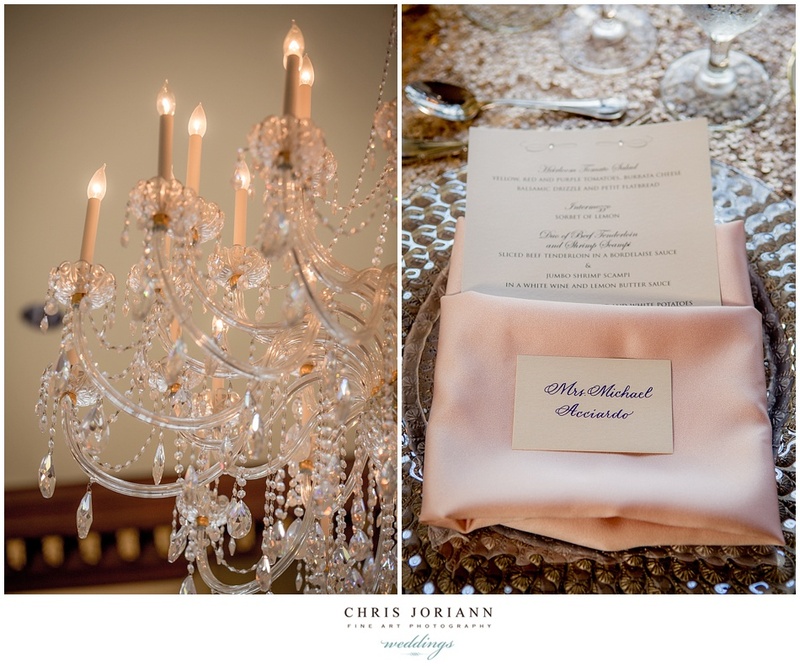 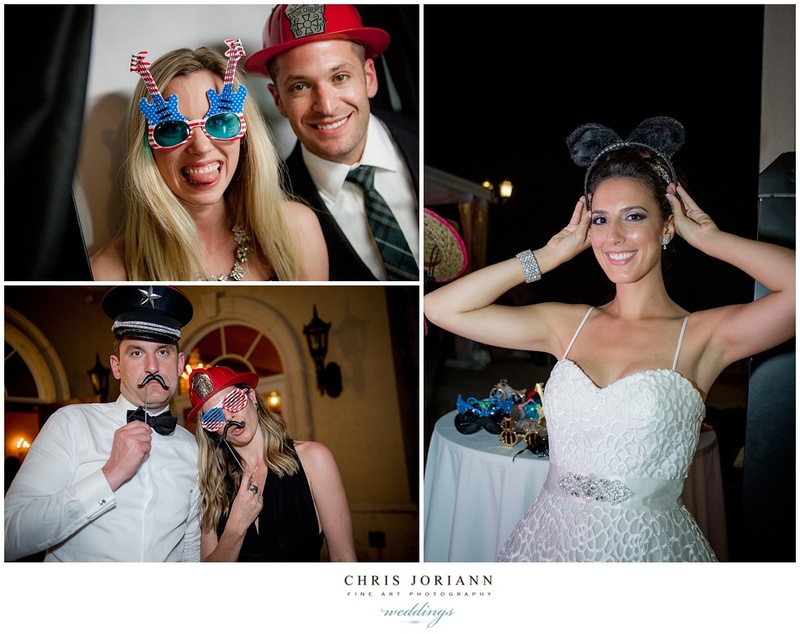 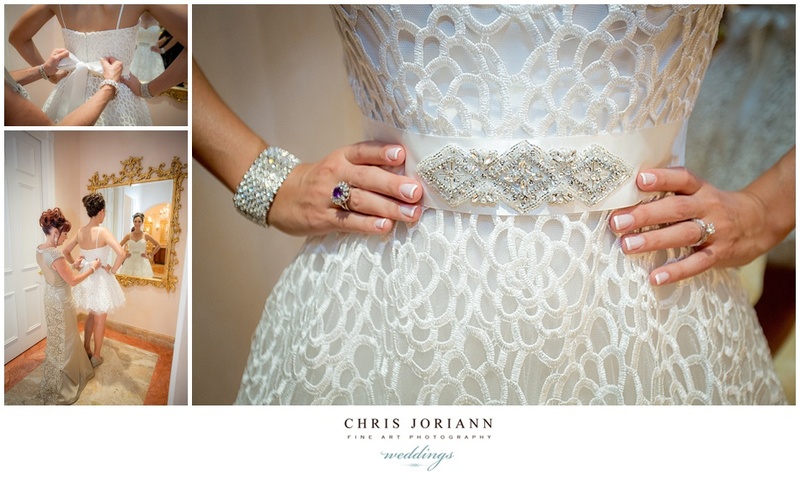 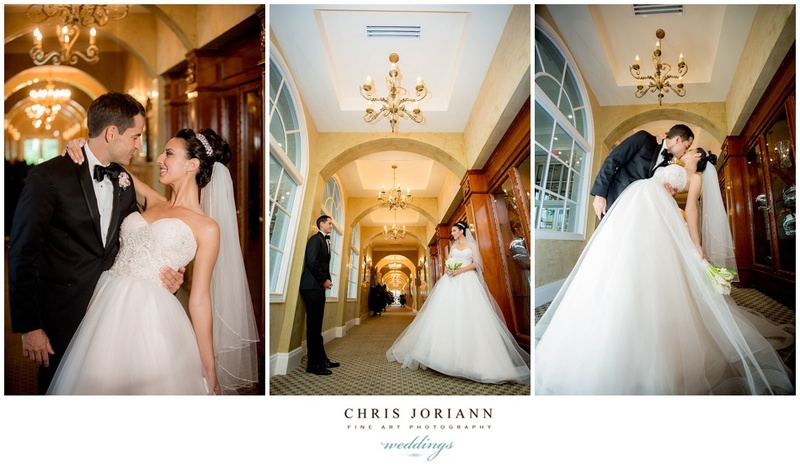 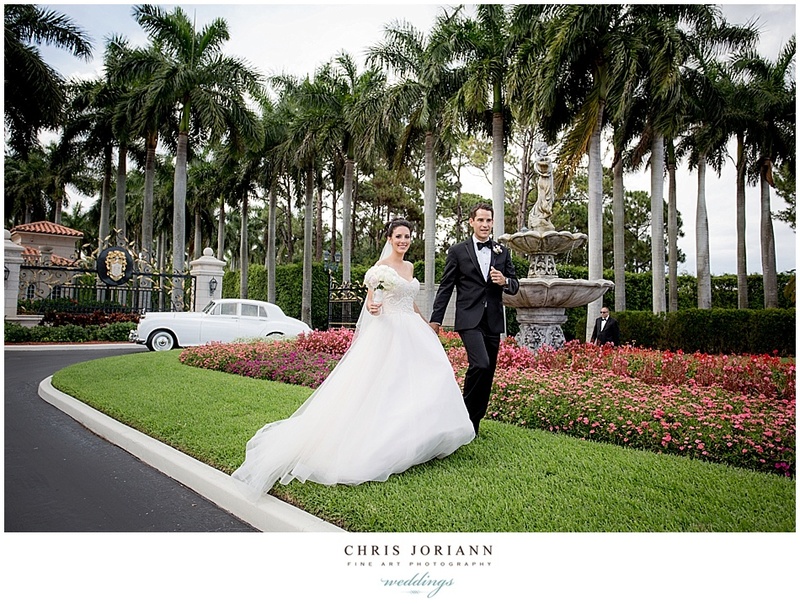 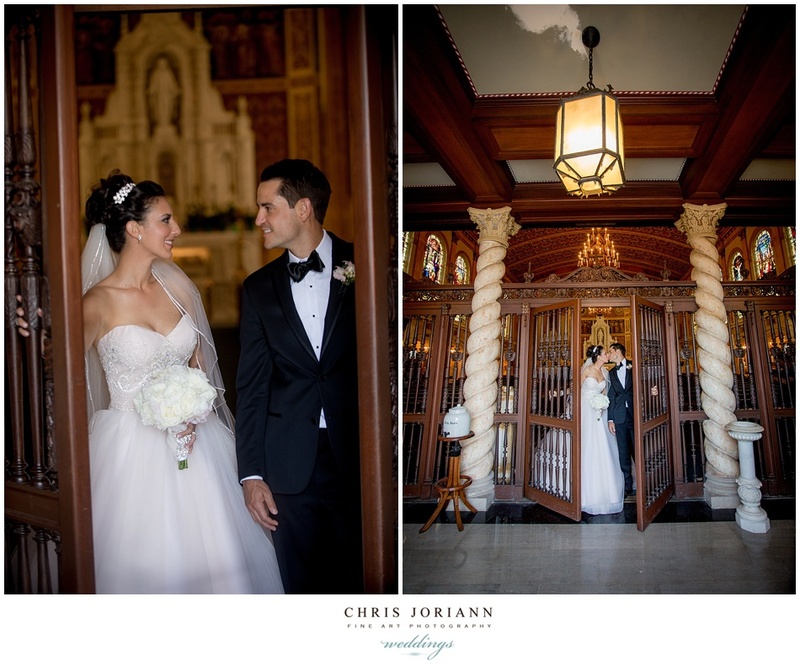 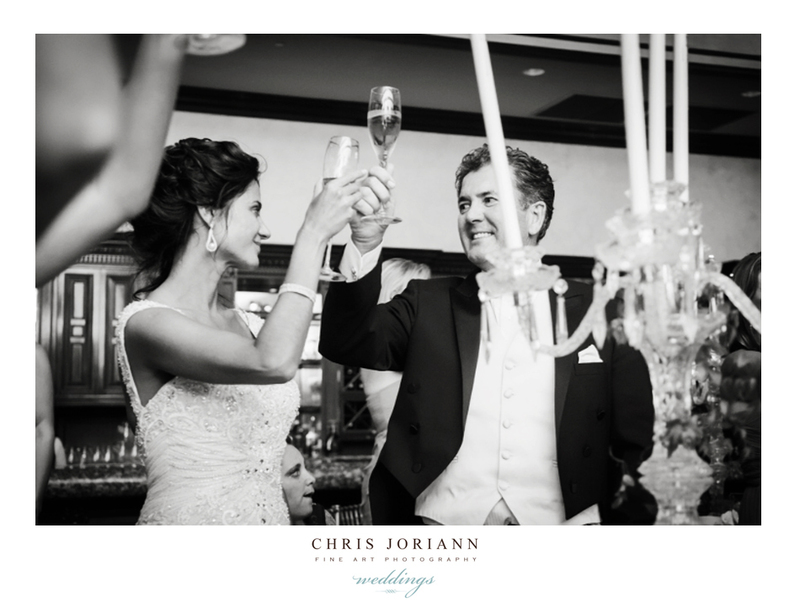 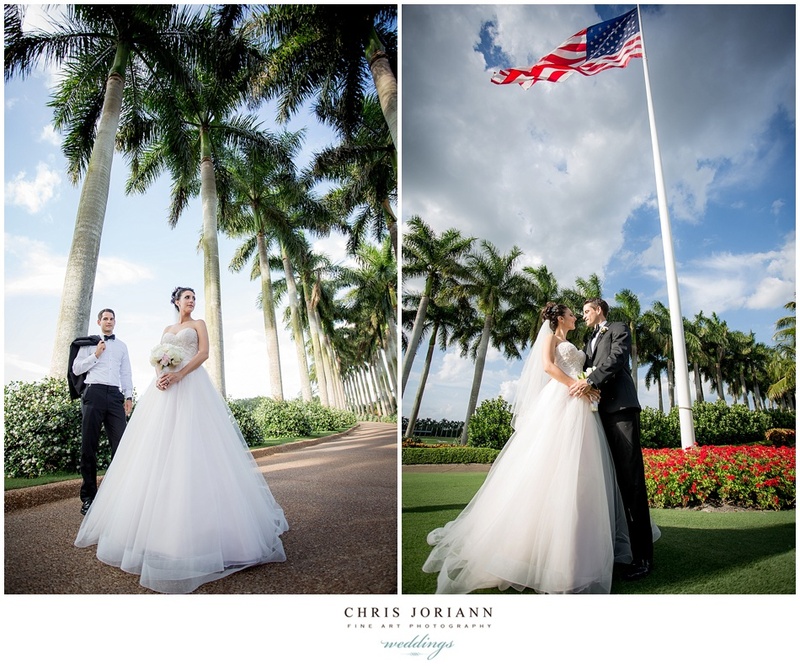 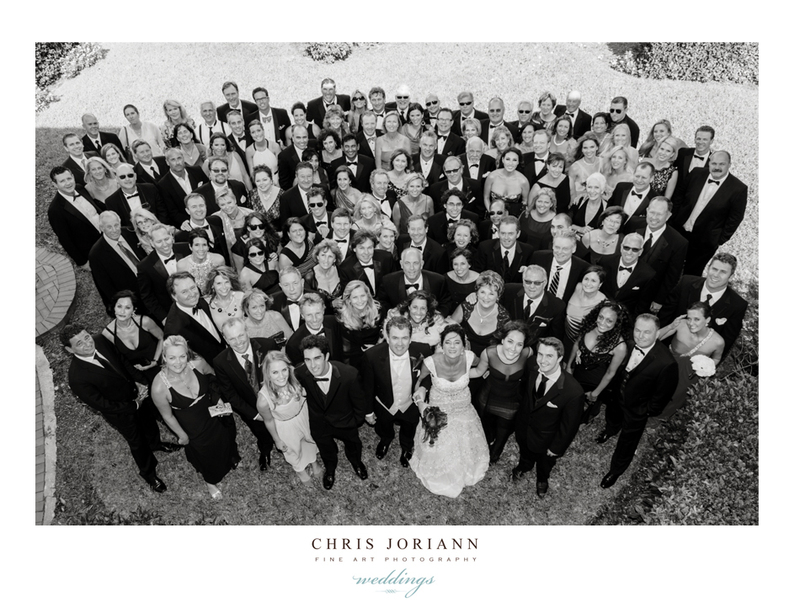 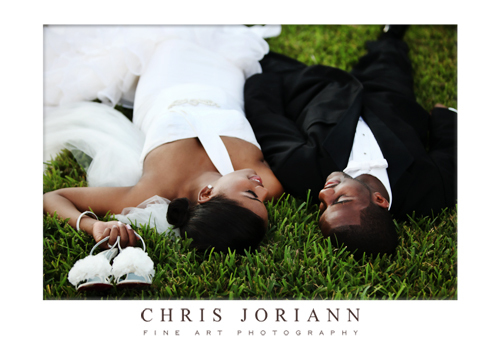 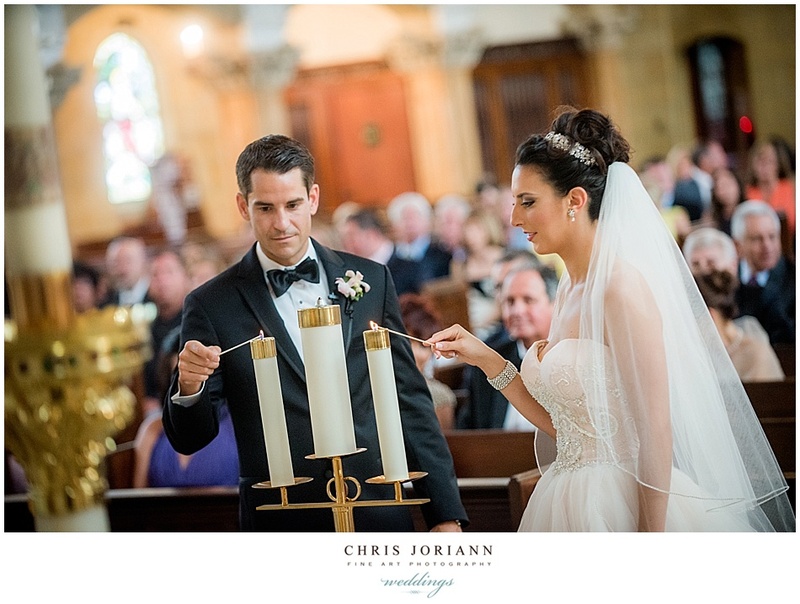 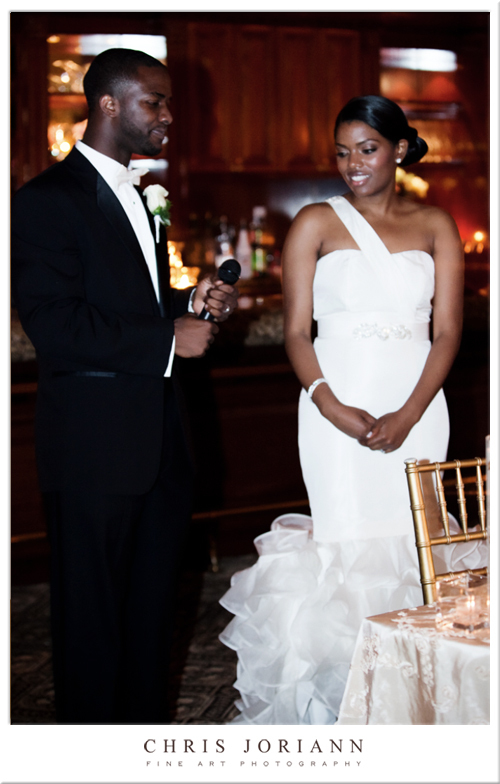 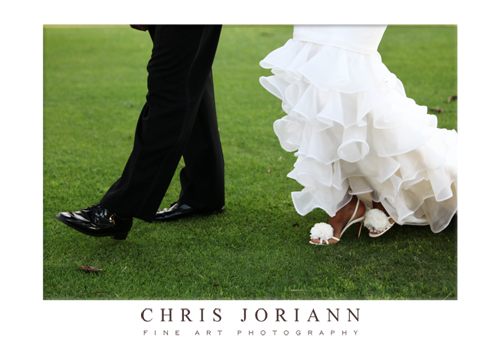 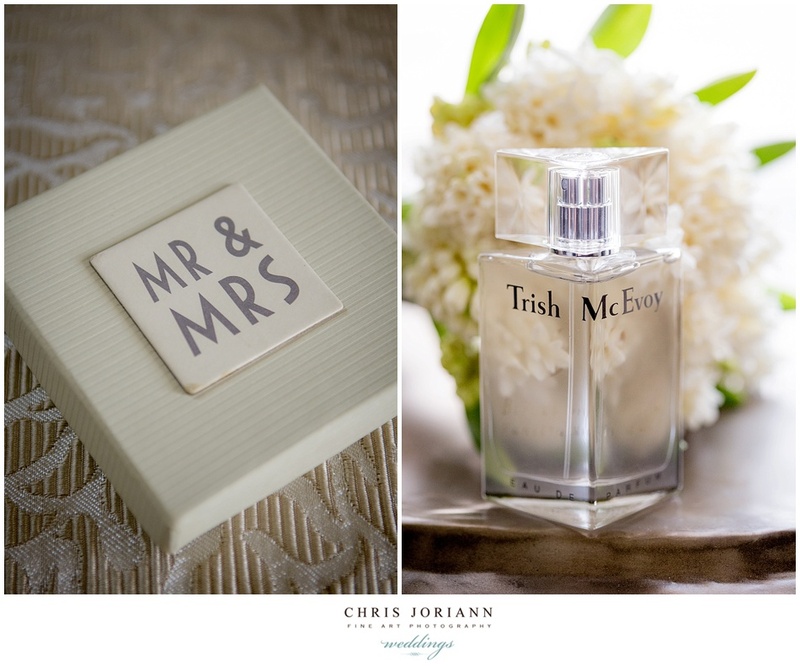 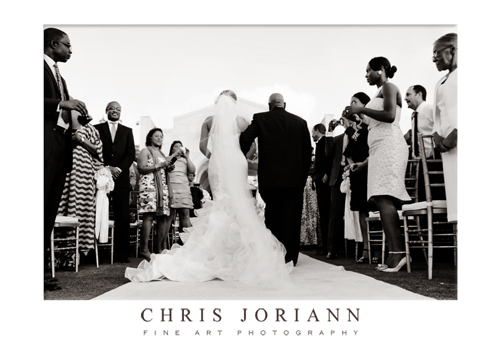 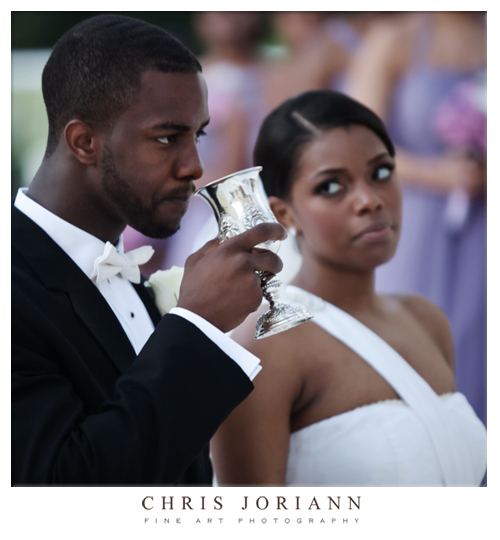 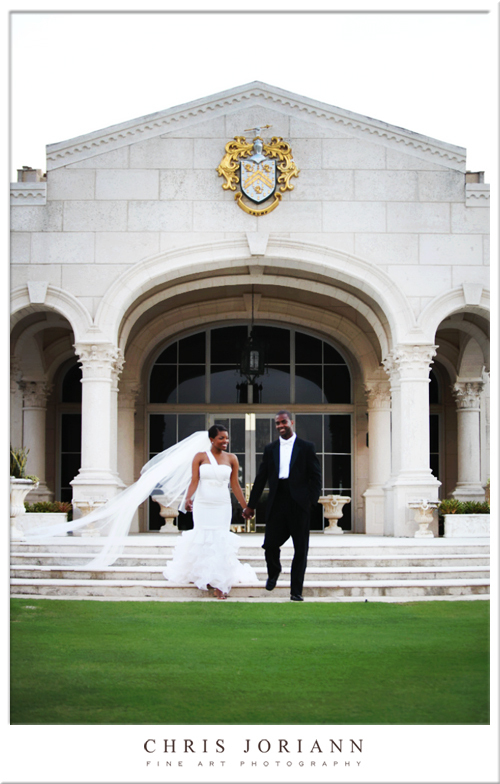 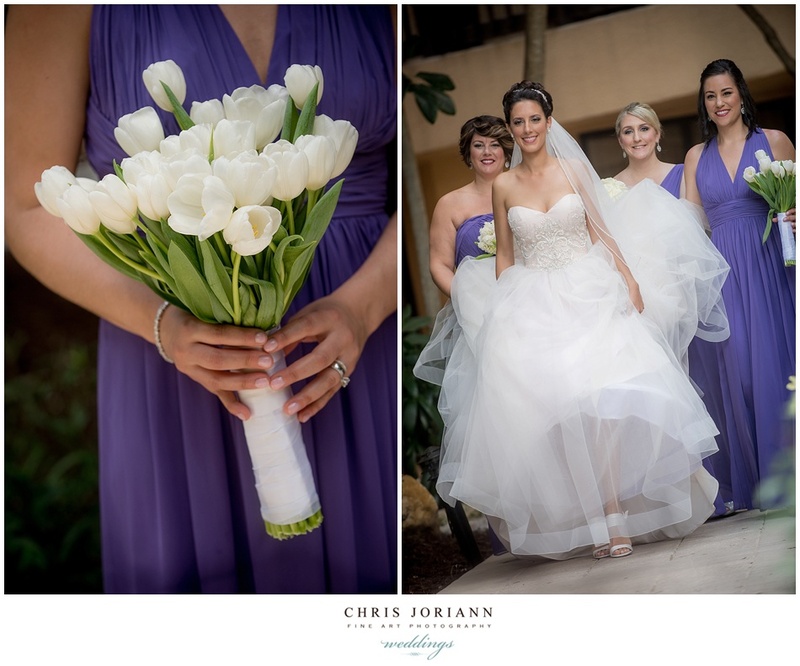 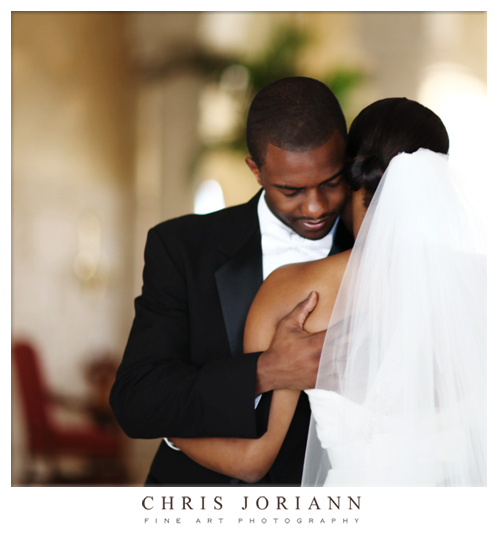 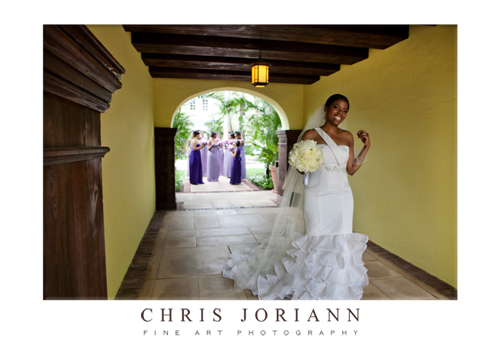 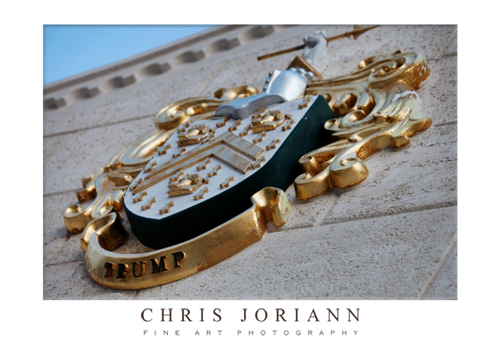 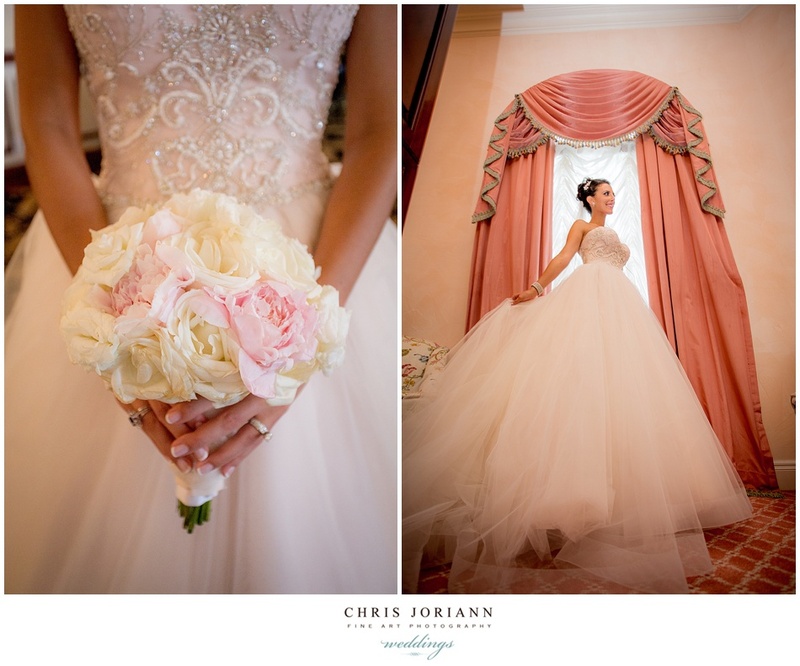 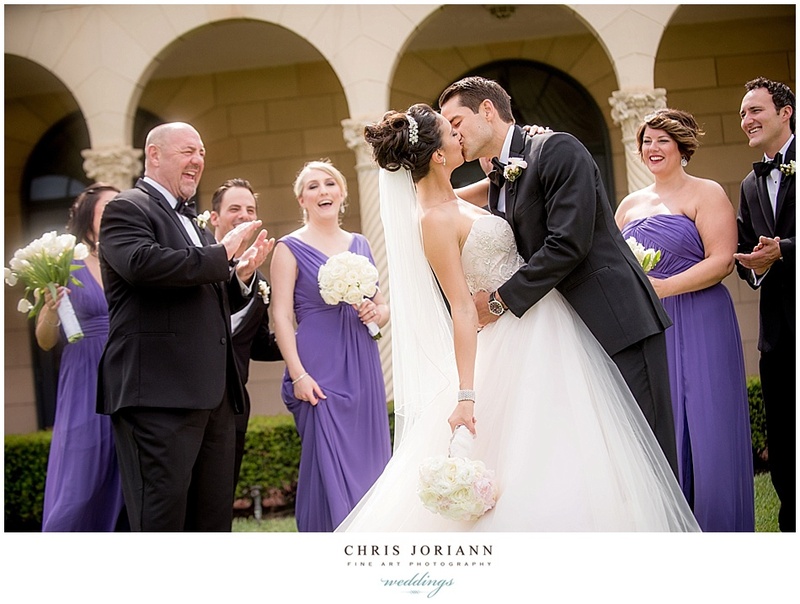 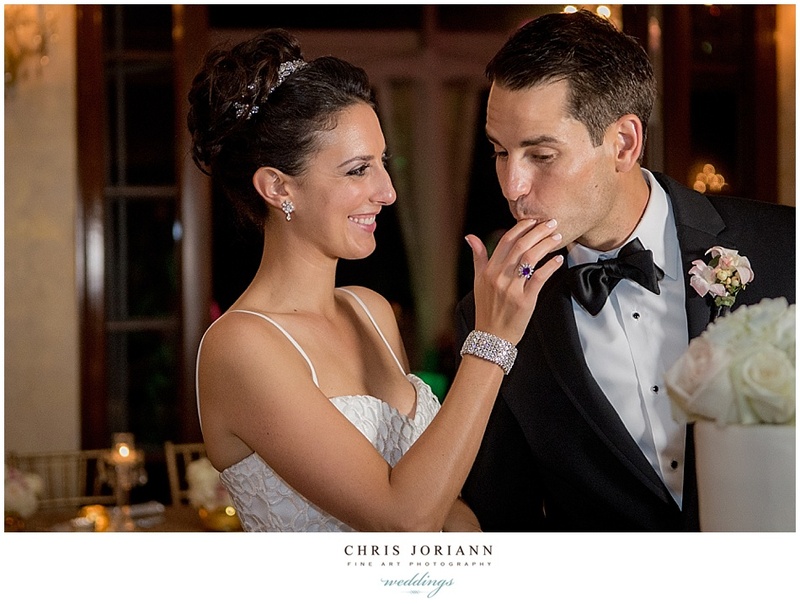 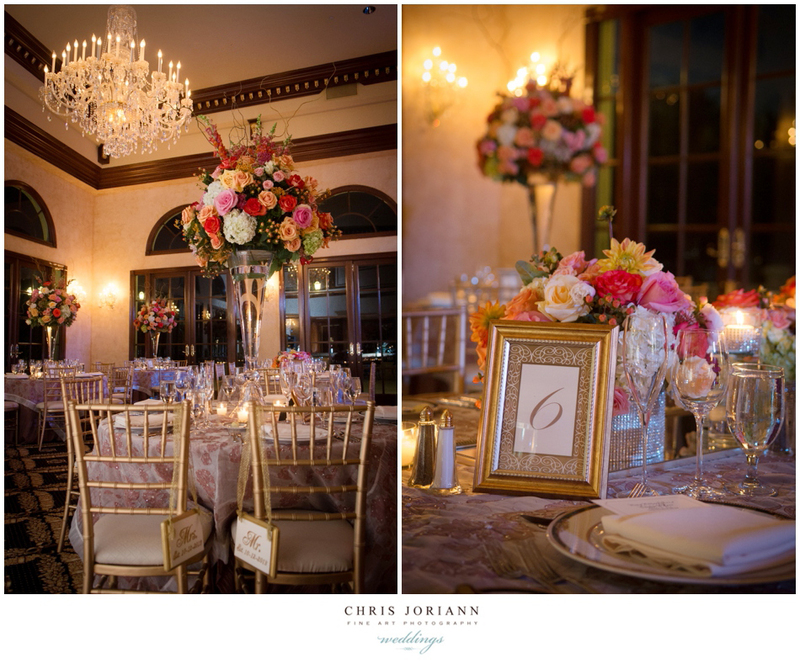 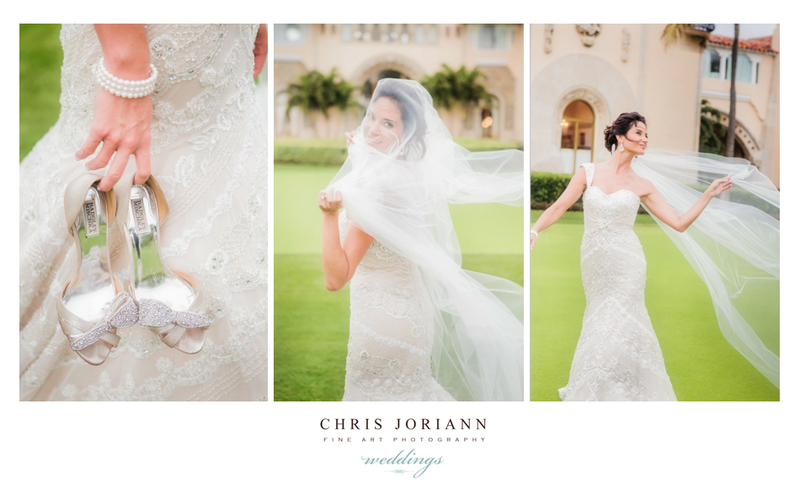 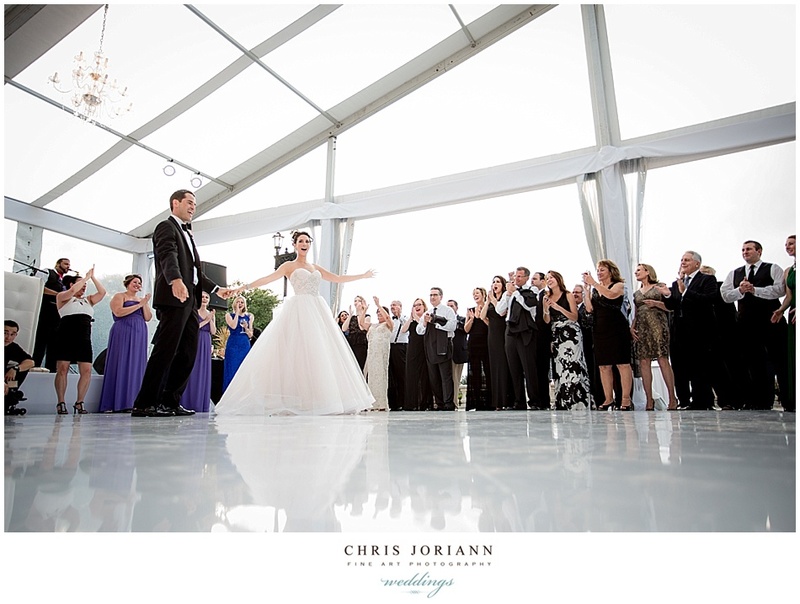 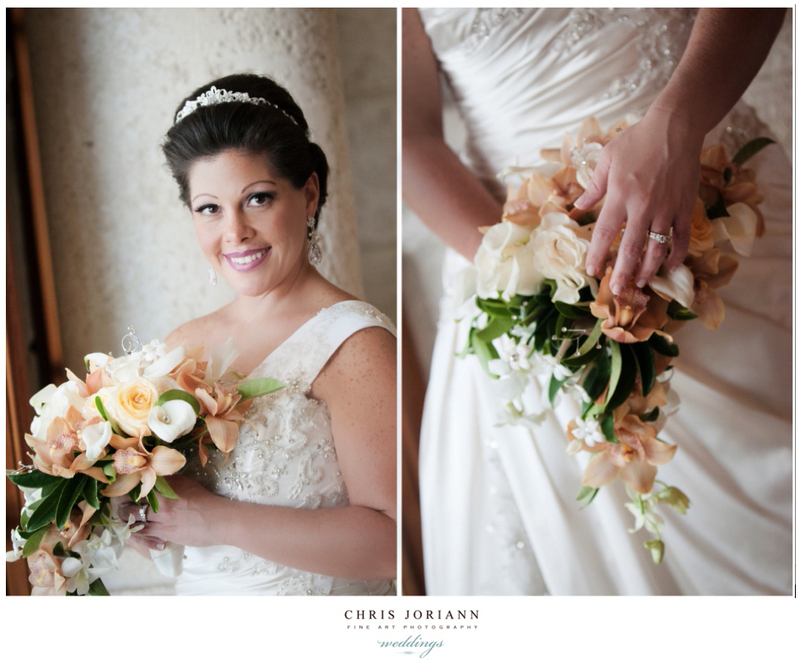 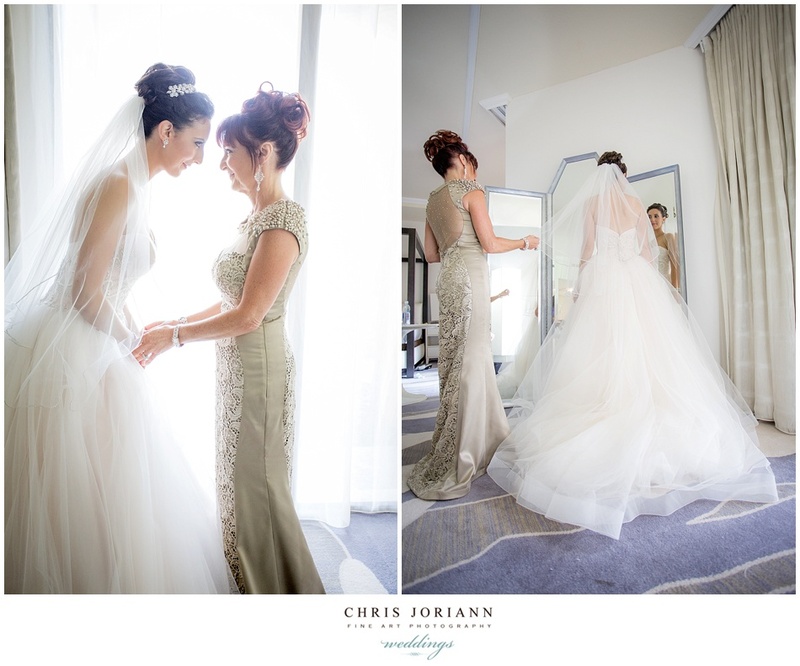 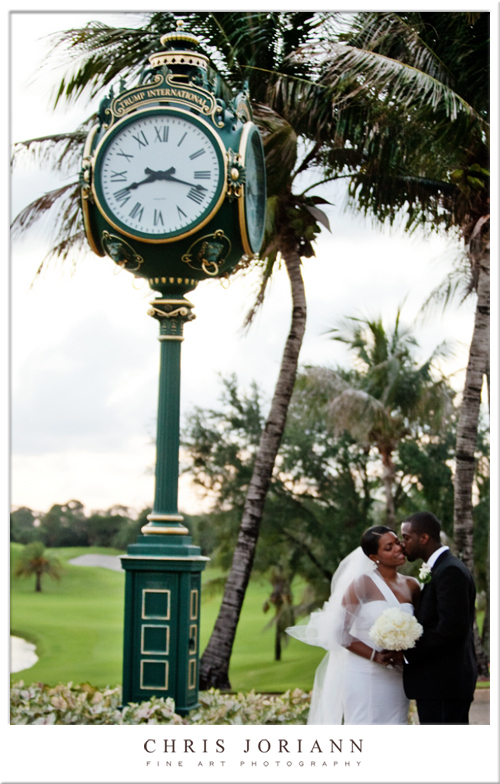 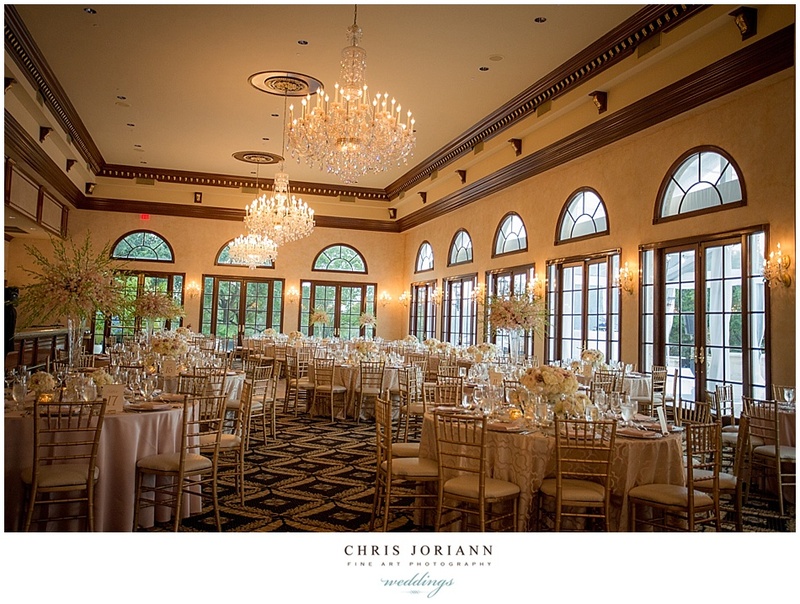 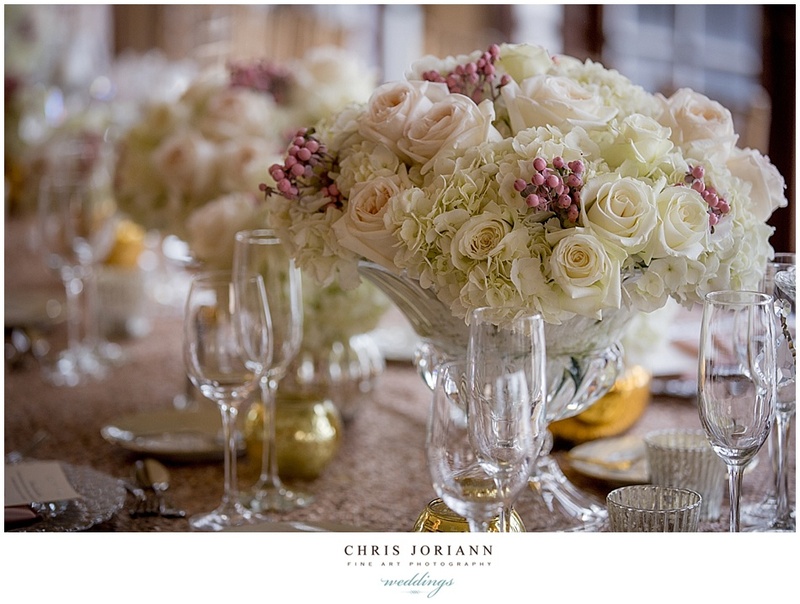 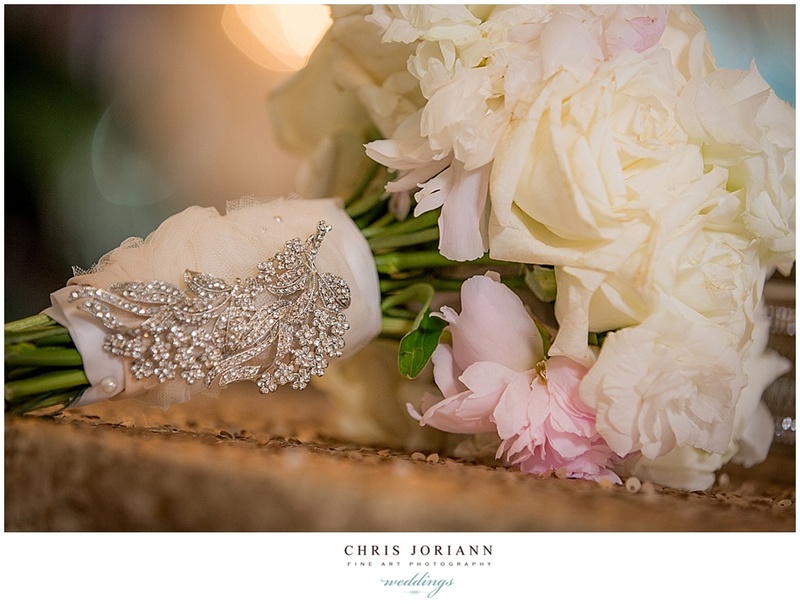 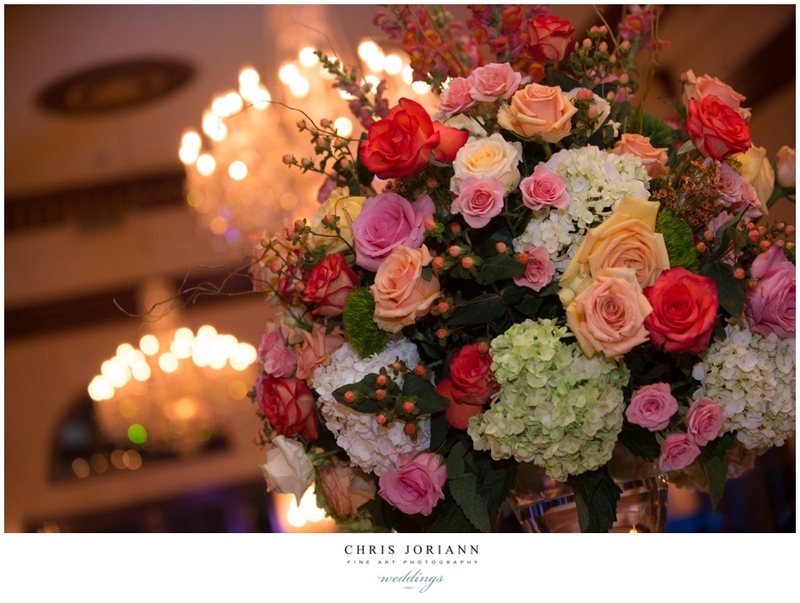 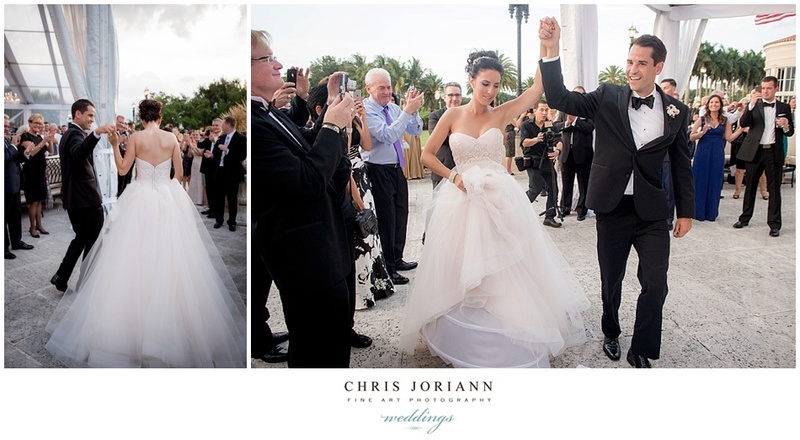 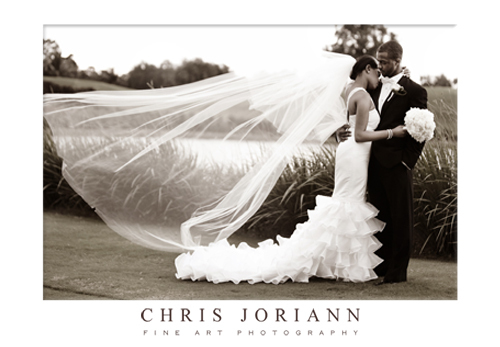 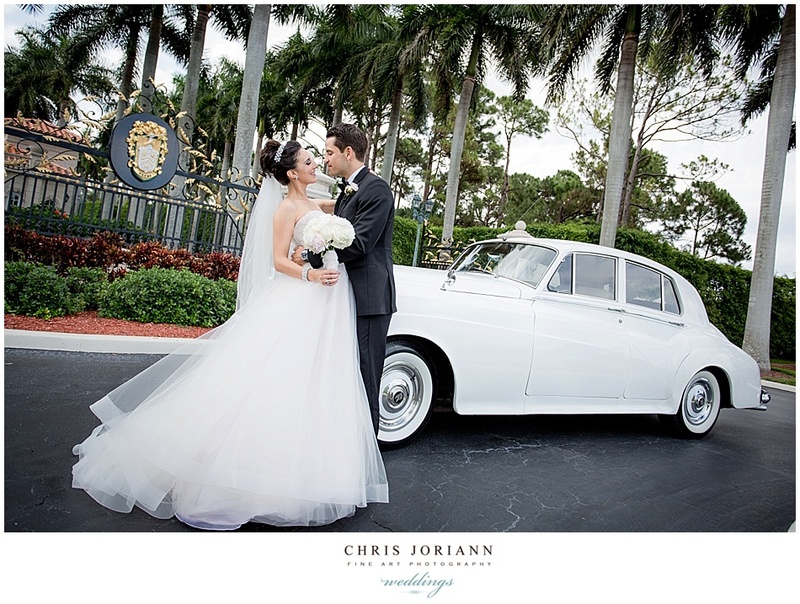 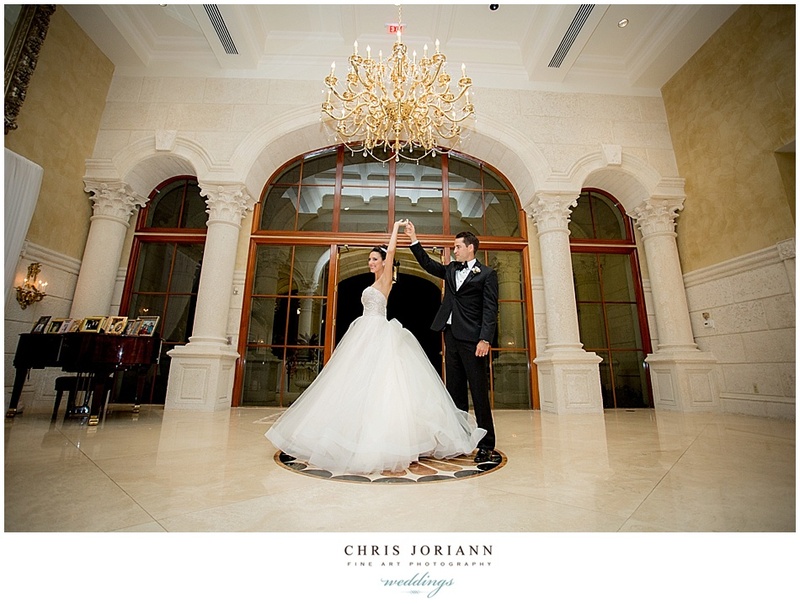 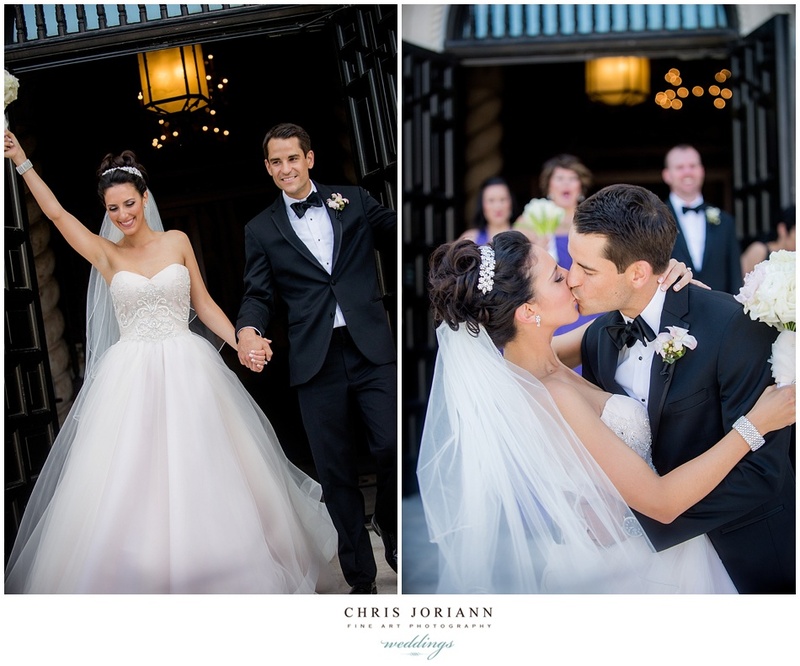 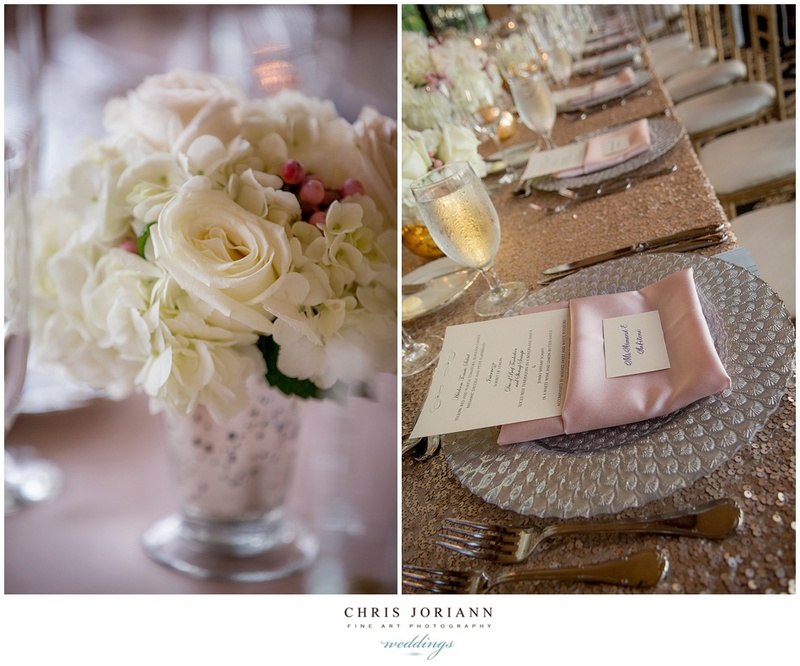 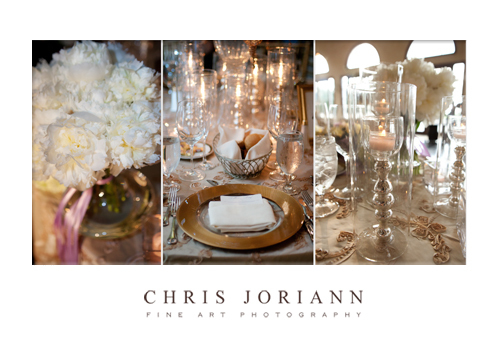 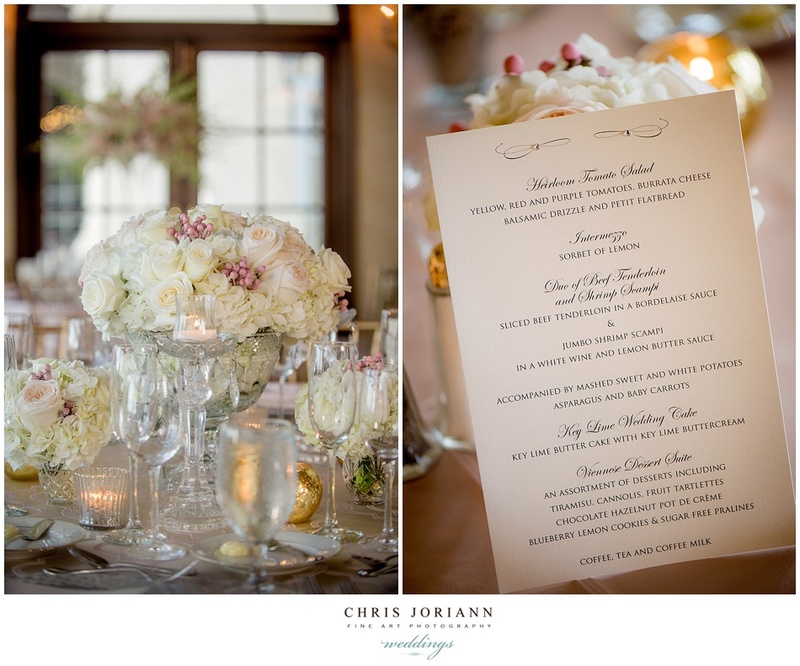 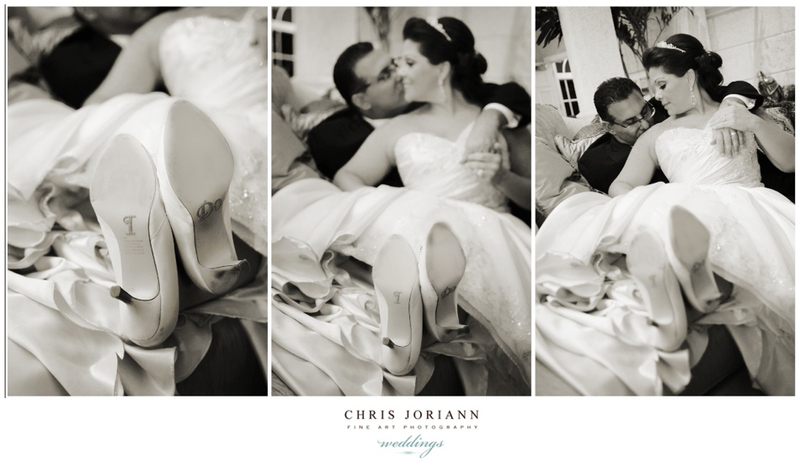 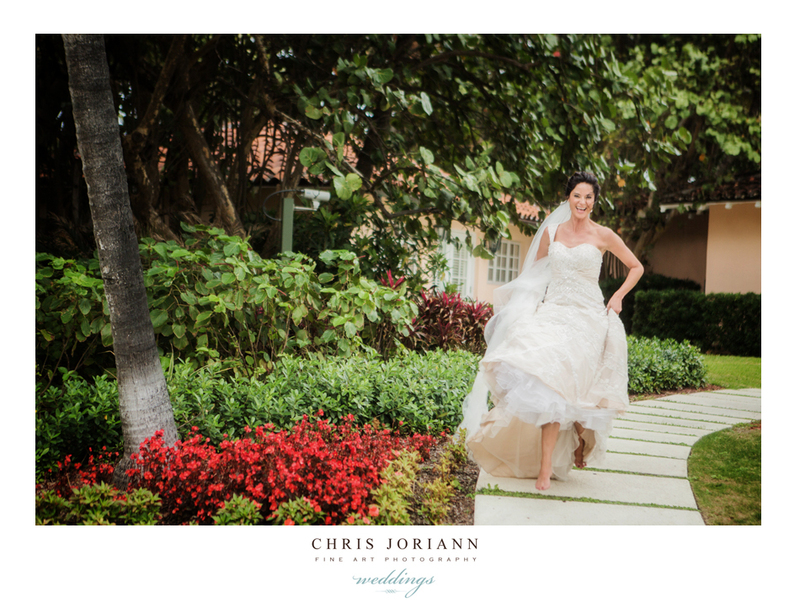 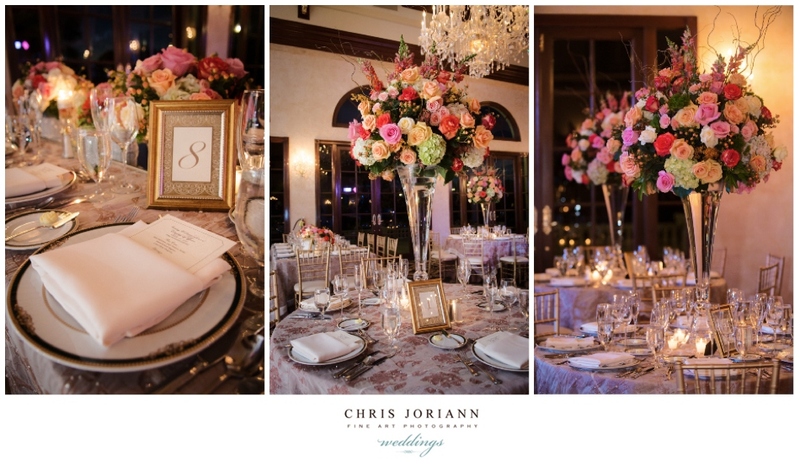 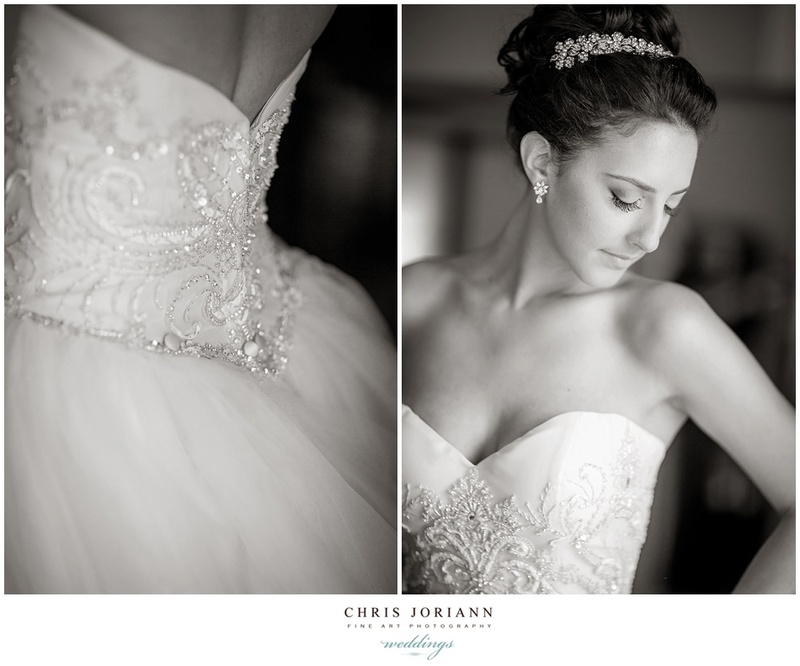 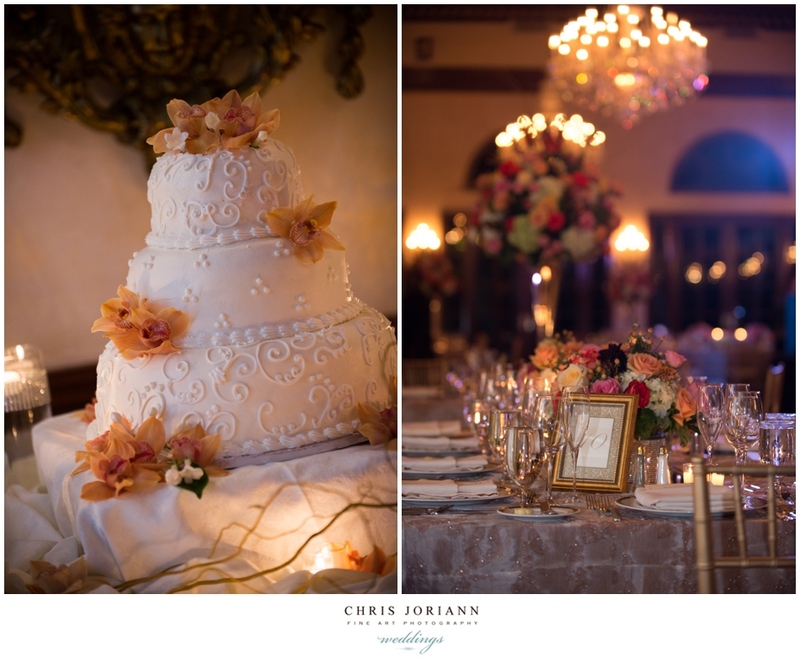 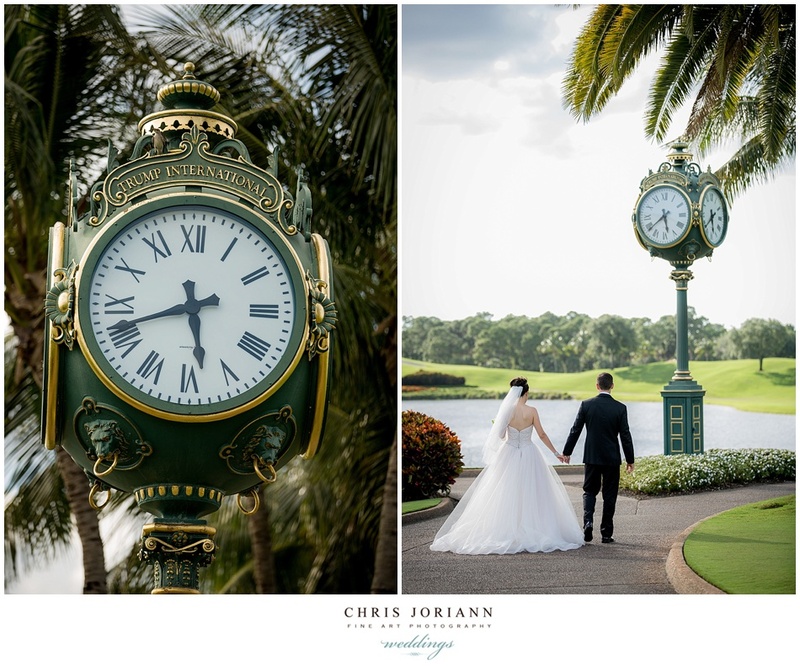 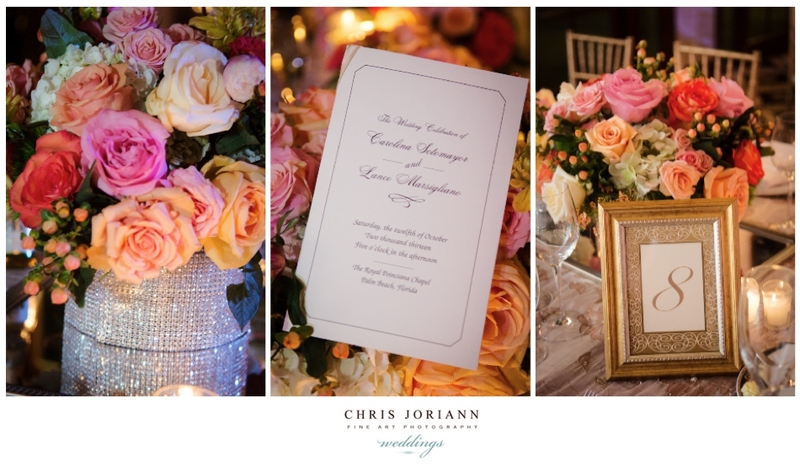 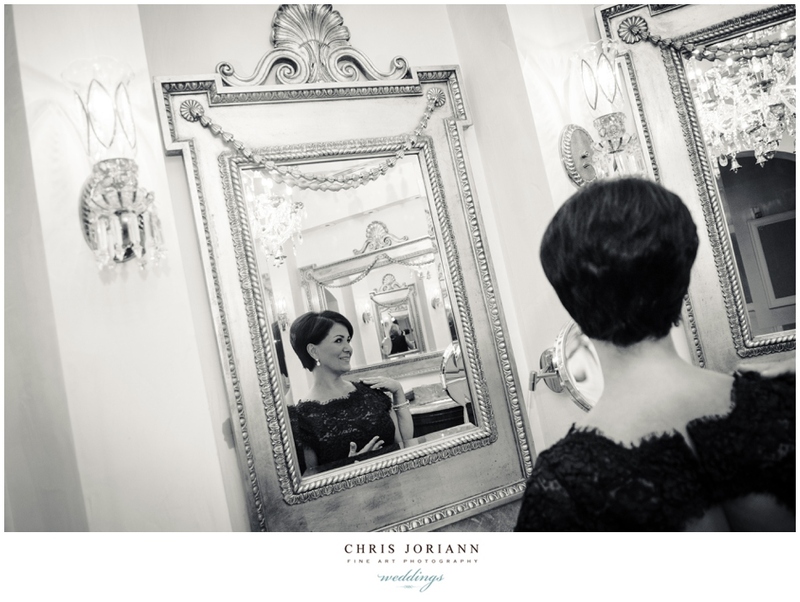 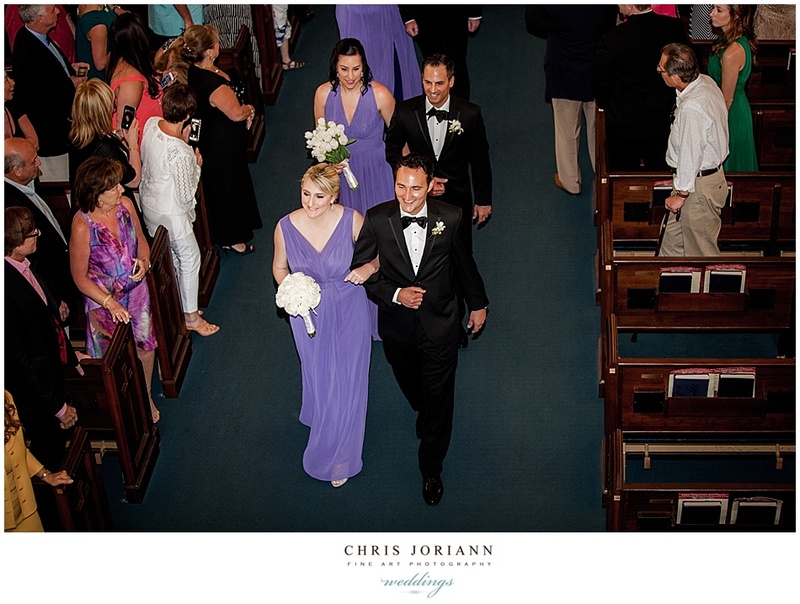 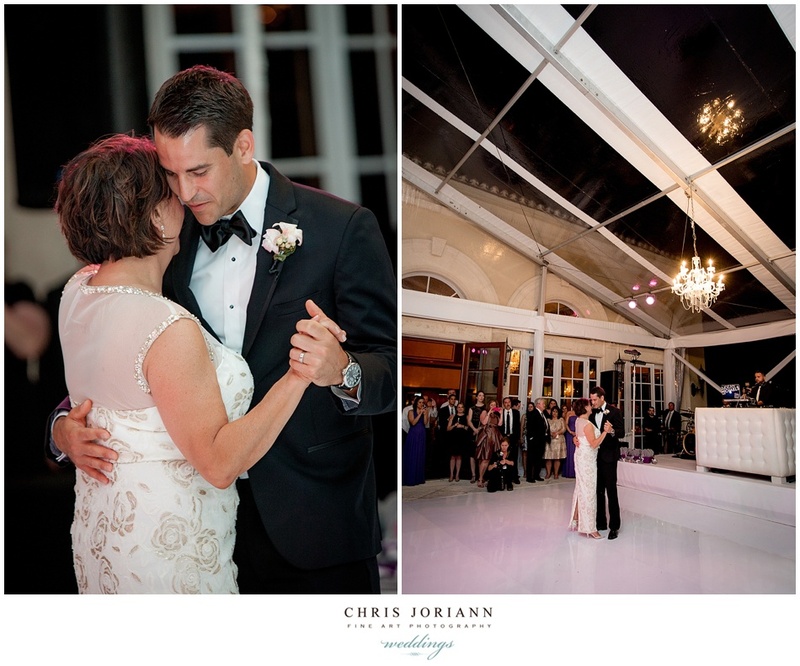 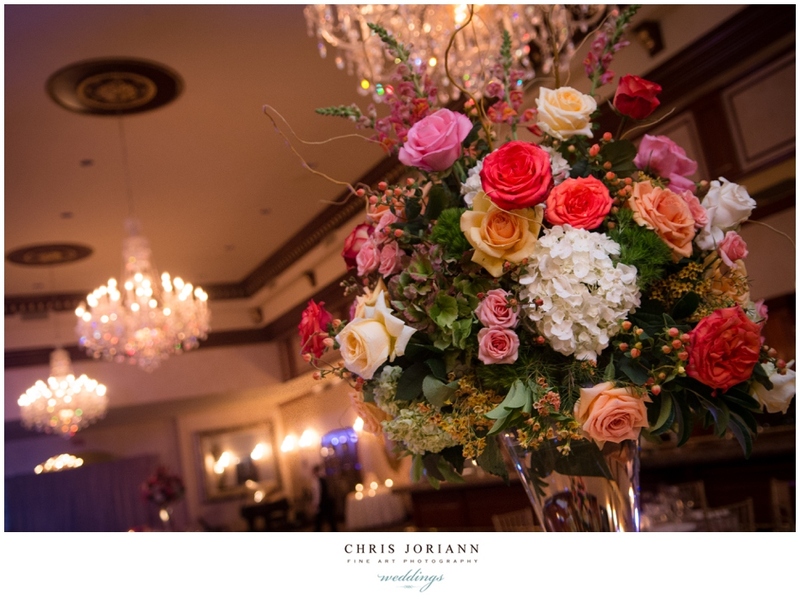 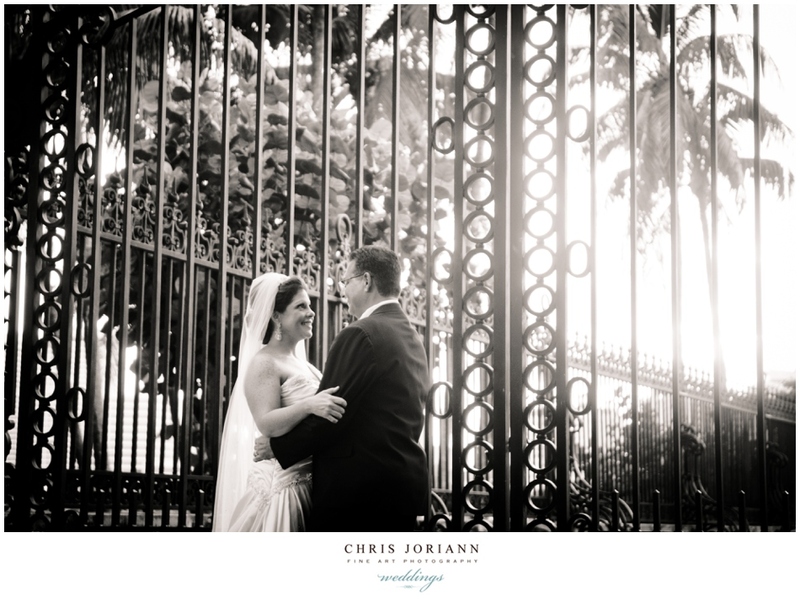 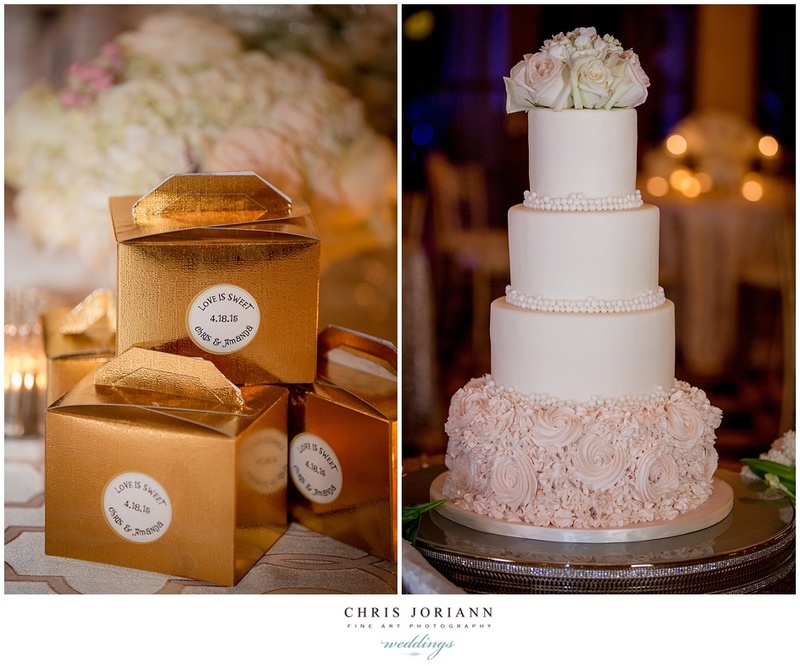 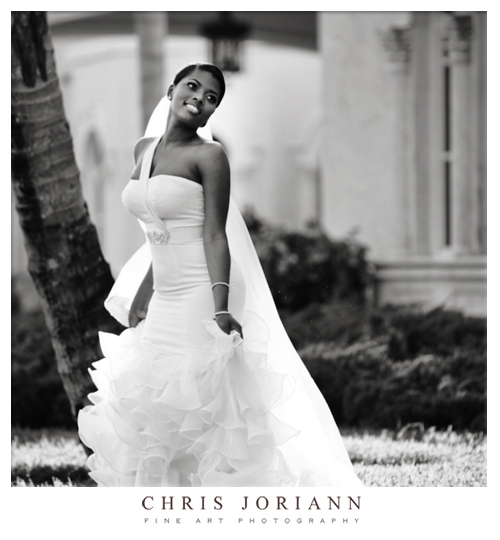 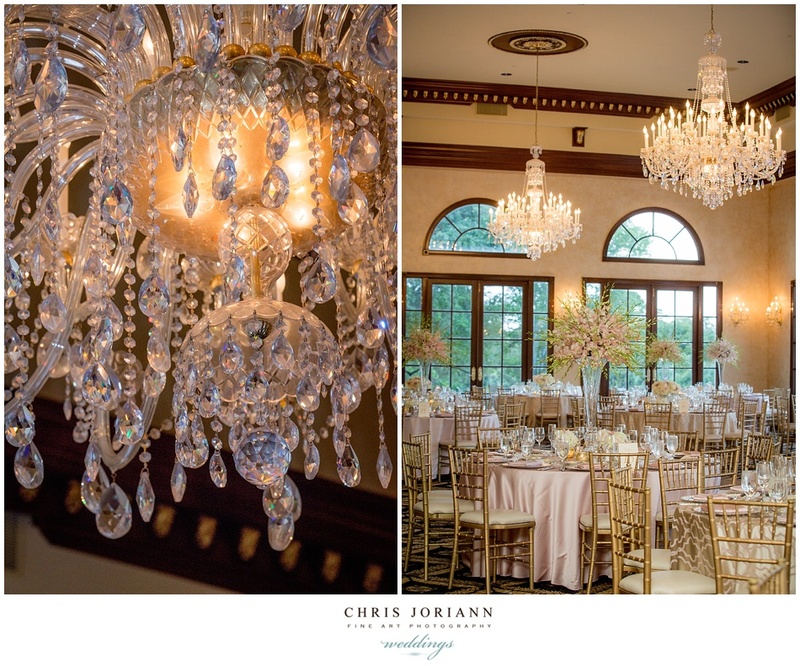 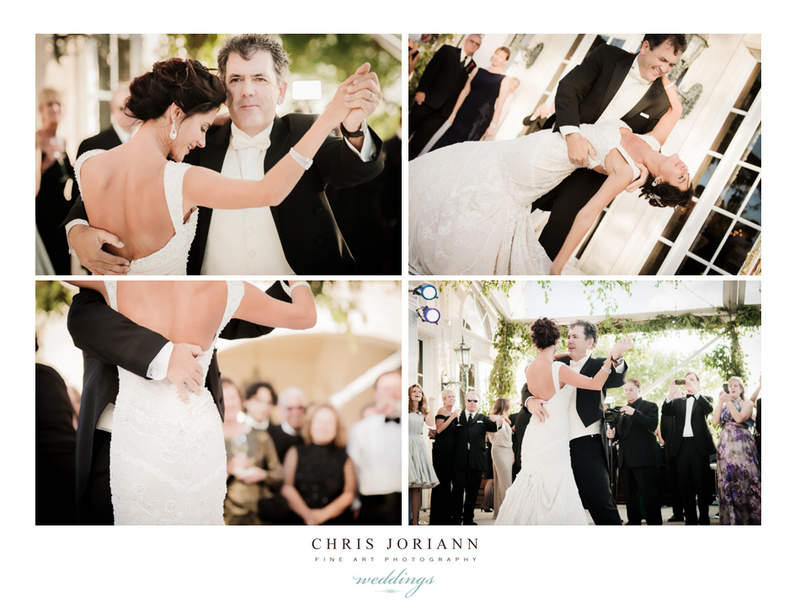 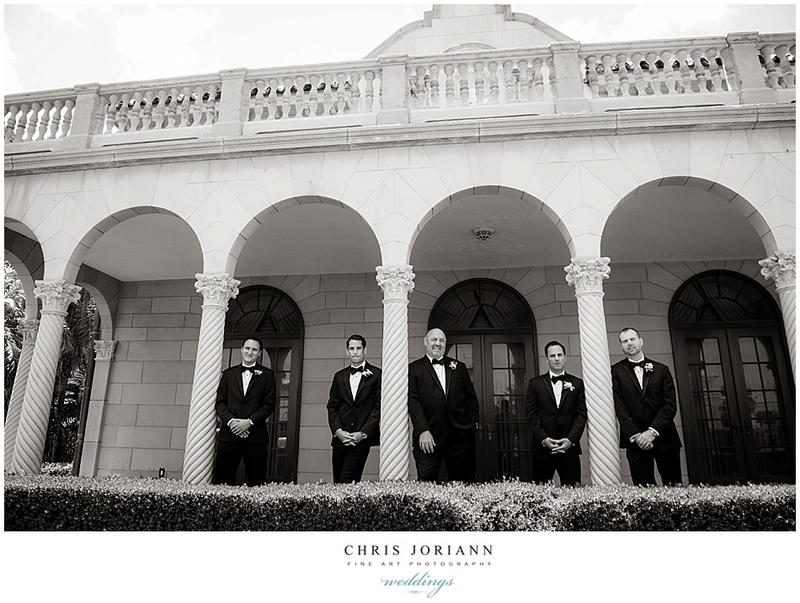 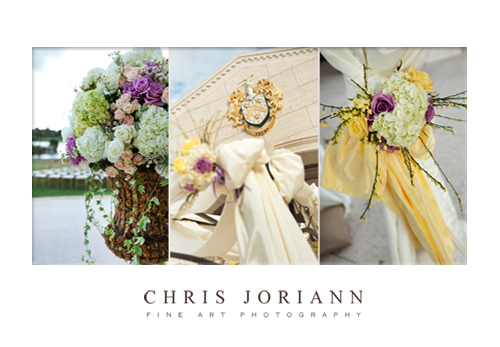 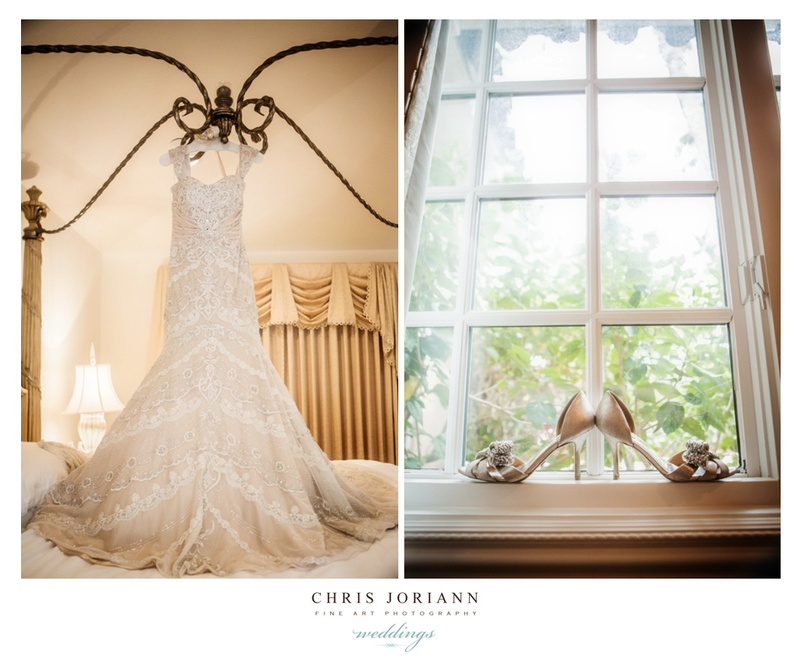 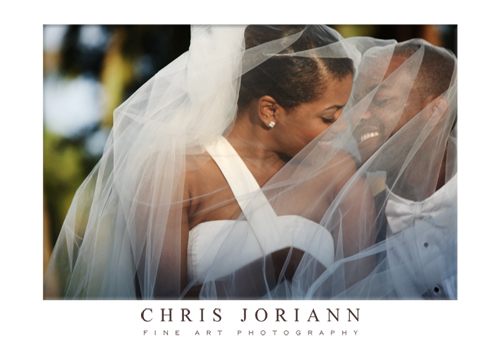 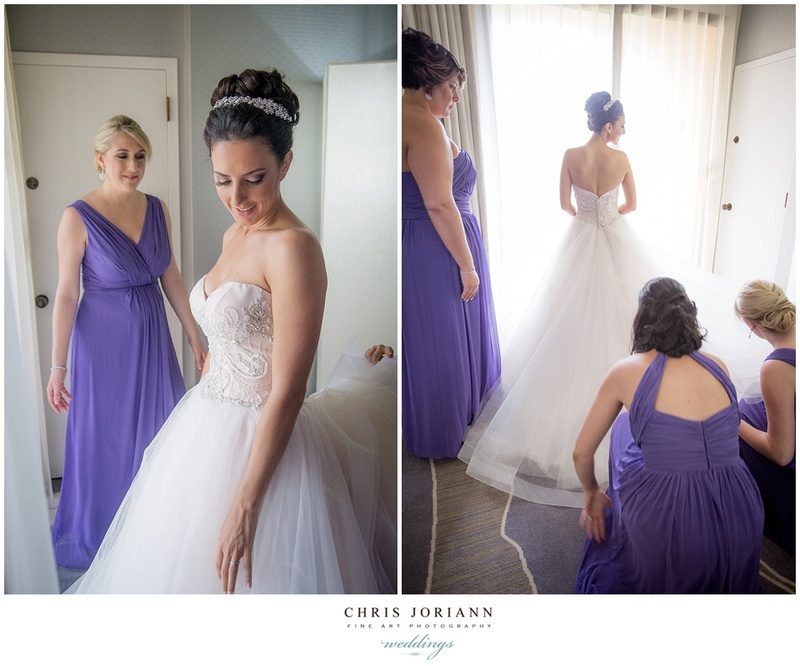 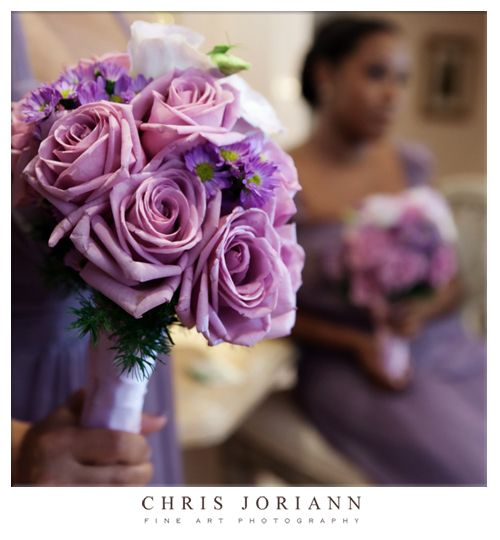 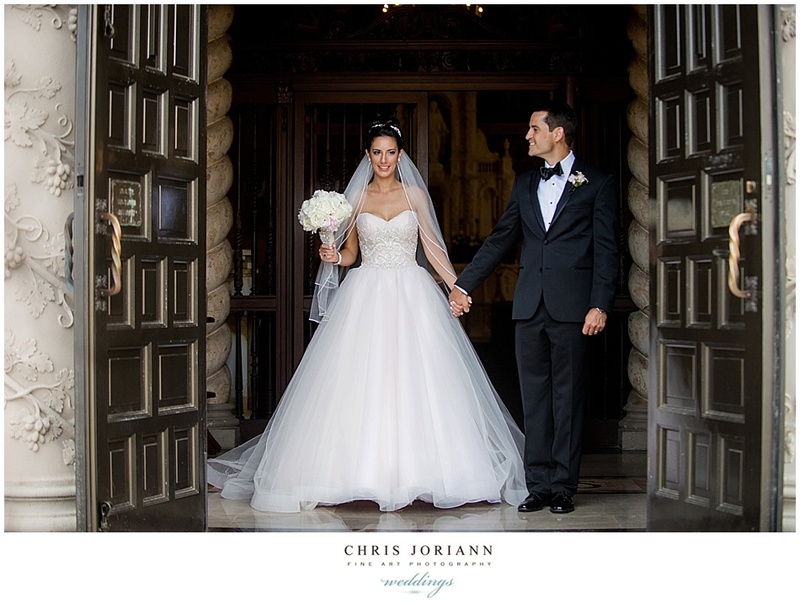 Amanda & Christopher’s wedding was held at Trump International Golf Club. 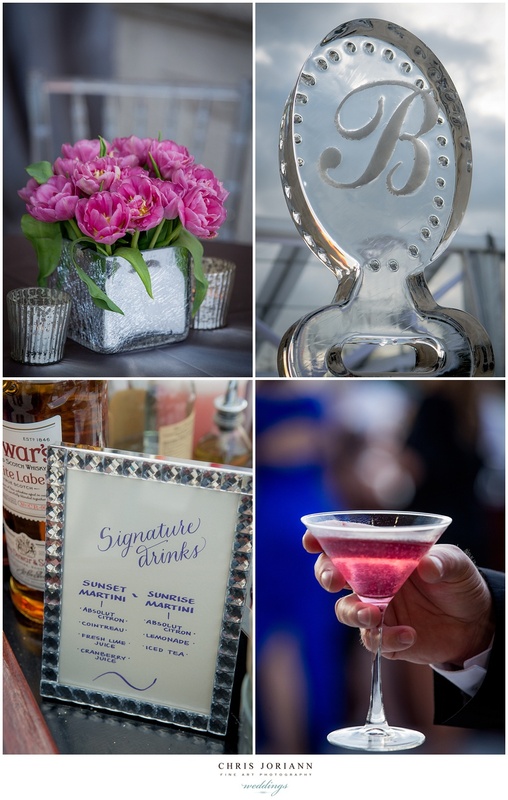 The stunning event was coordinated by the Daversa Group, with florals + décor by Xquisite Events, and catering direction by Sue Carboy. 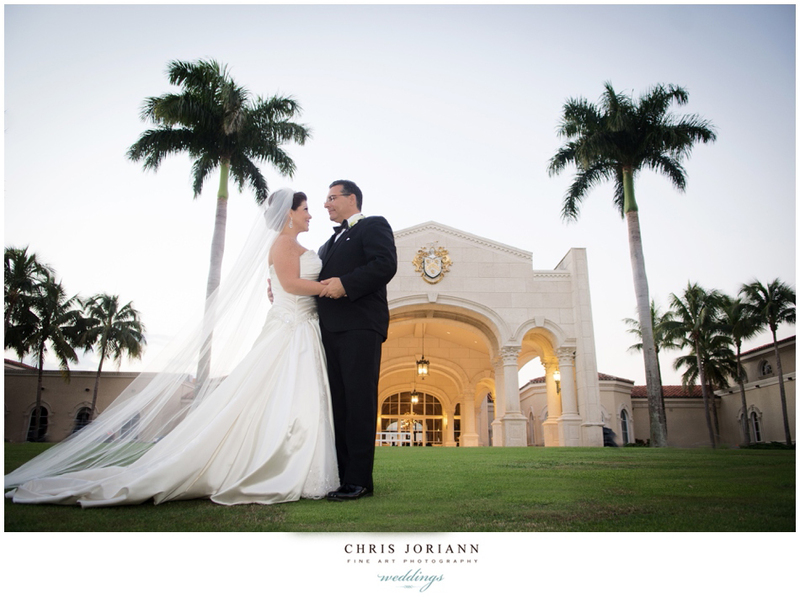 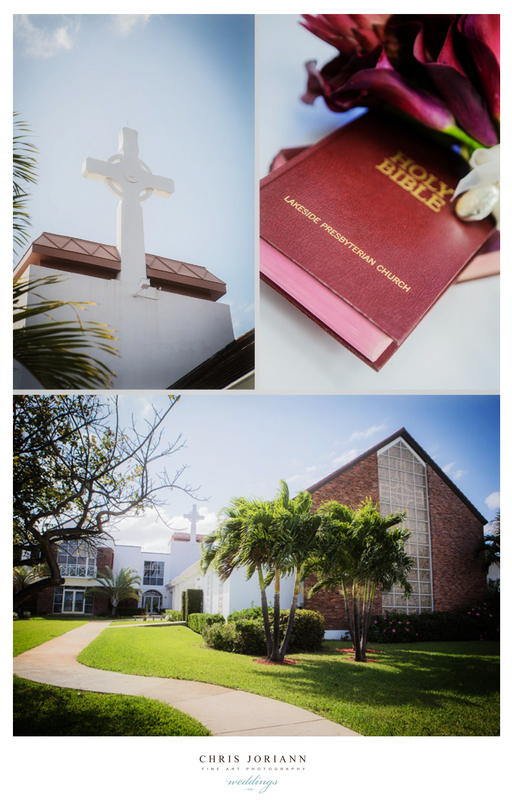 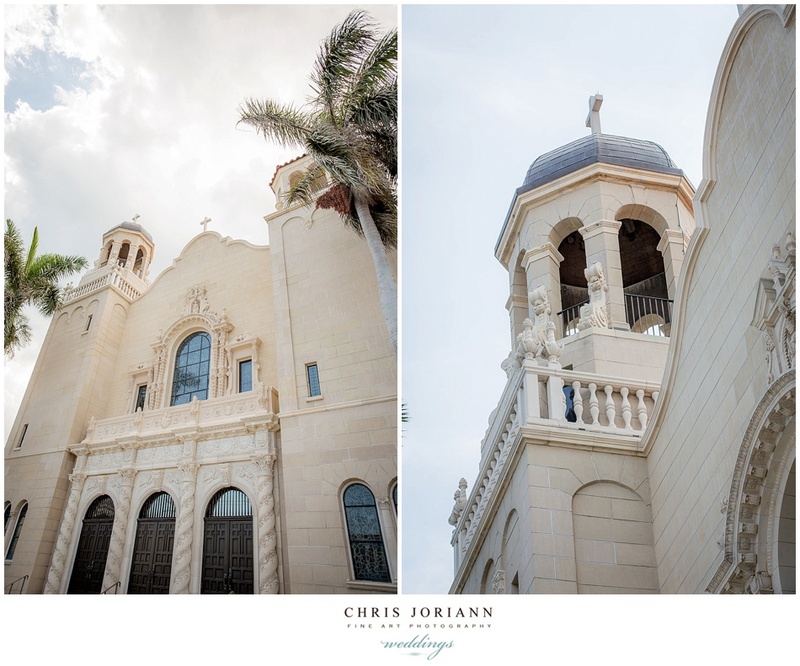 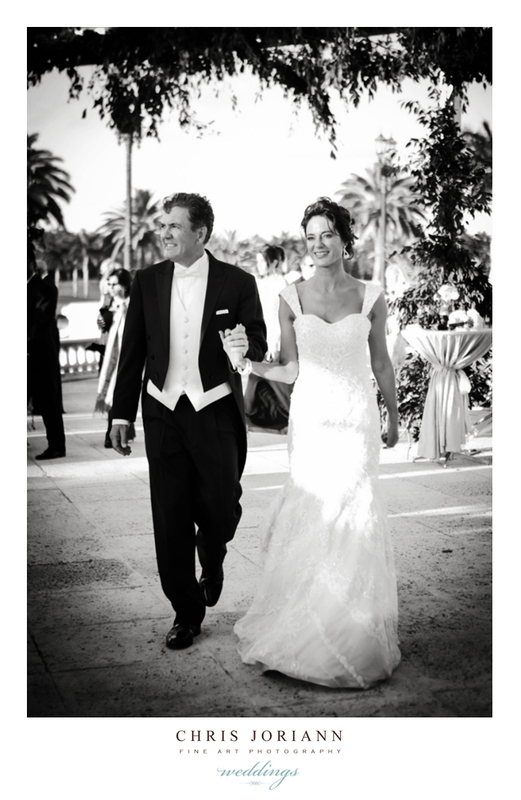 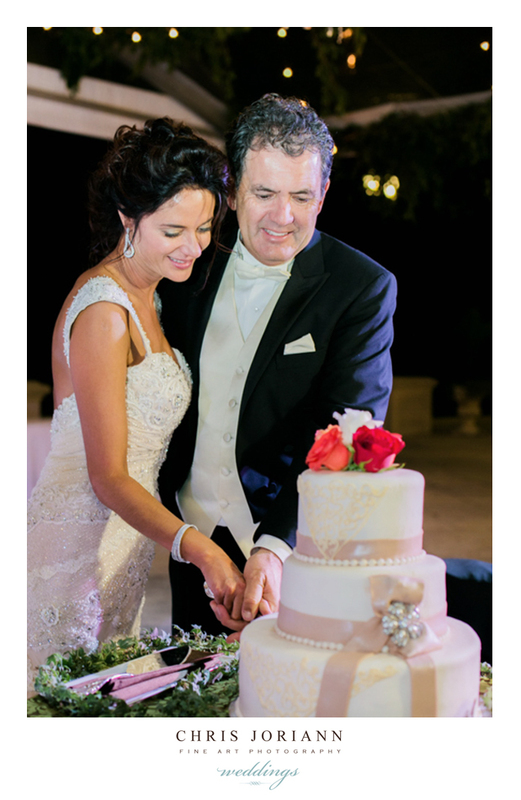 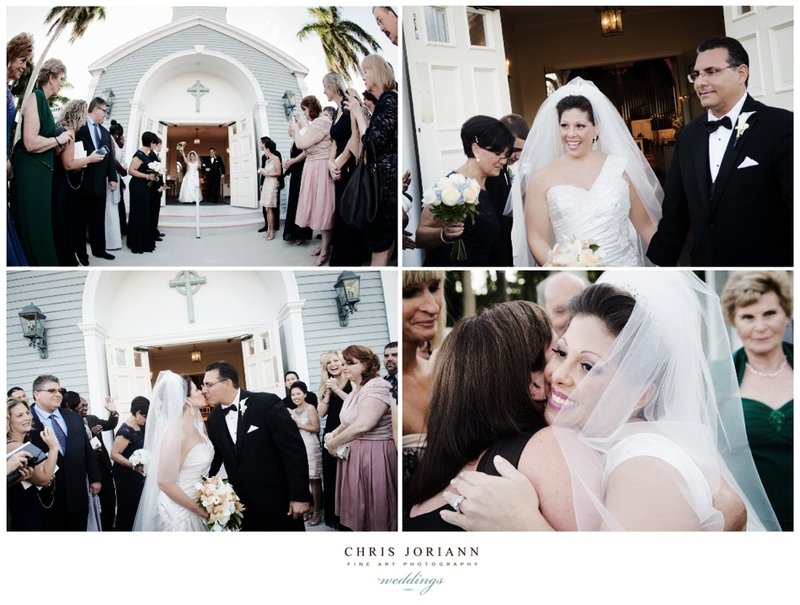 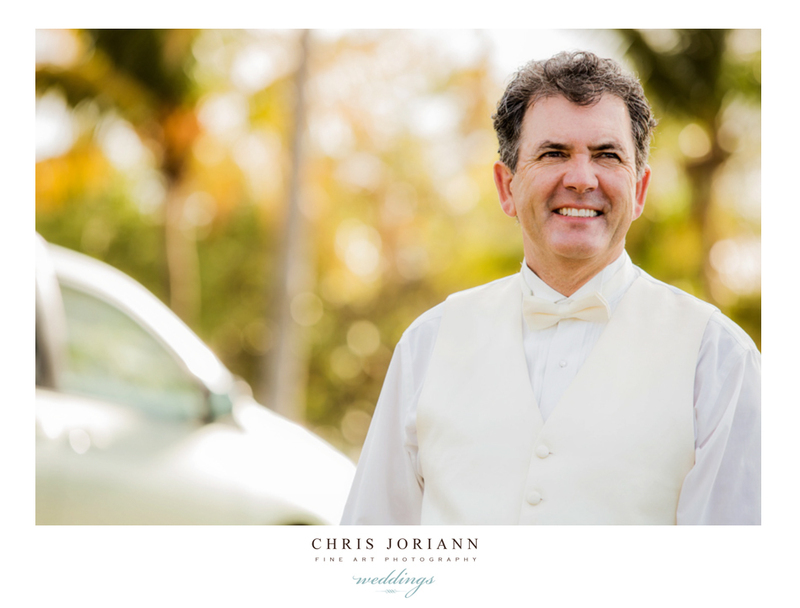 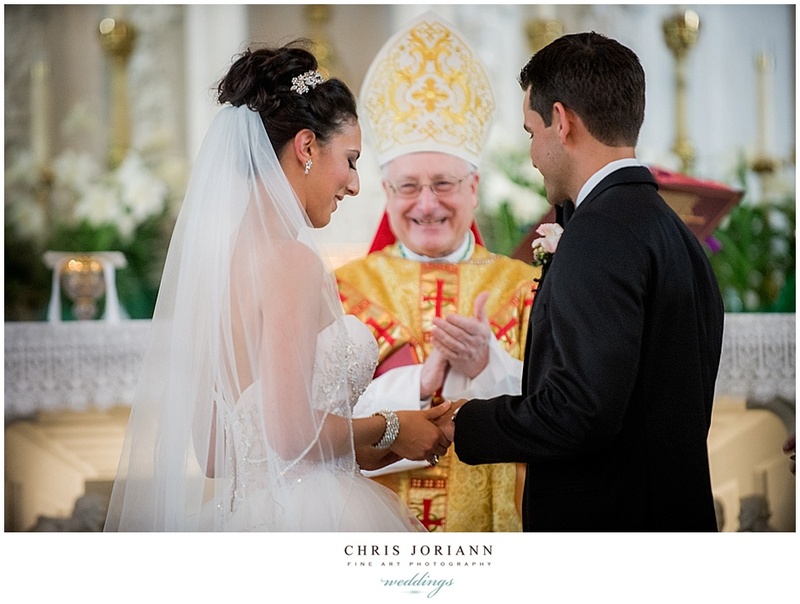 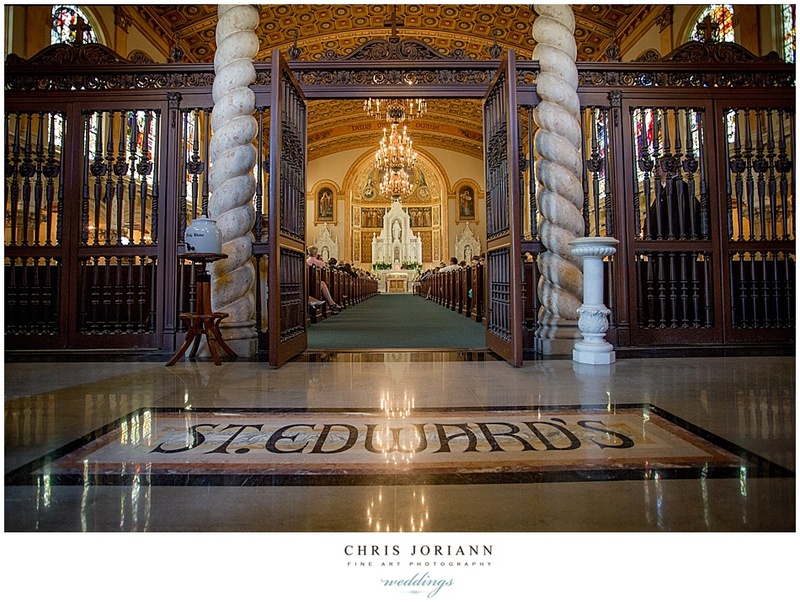 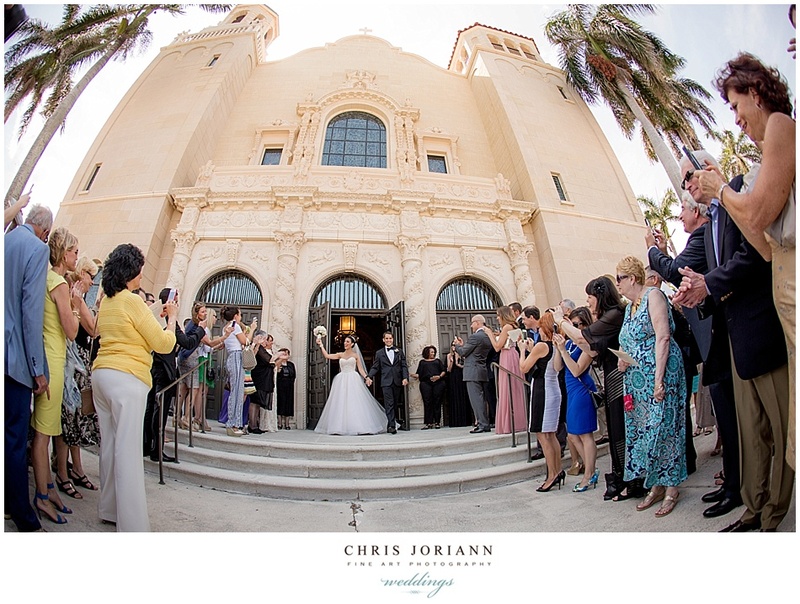 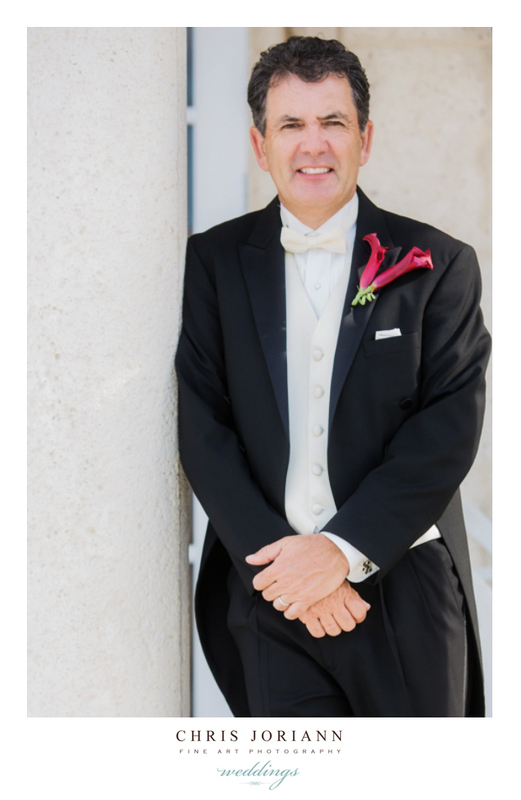 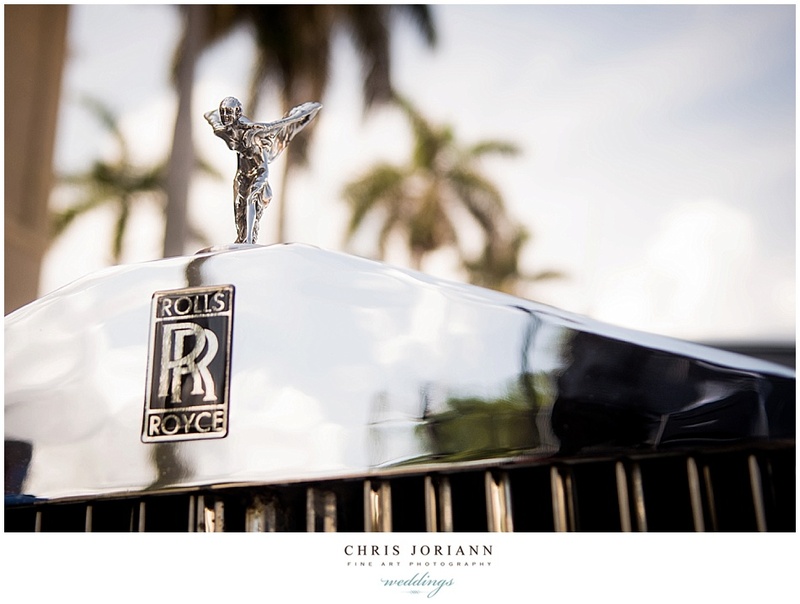 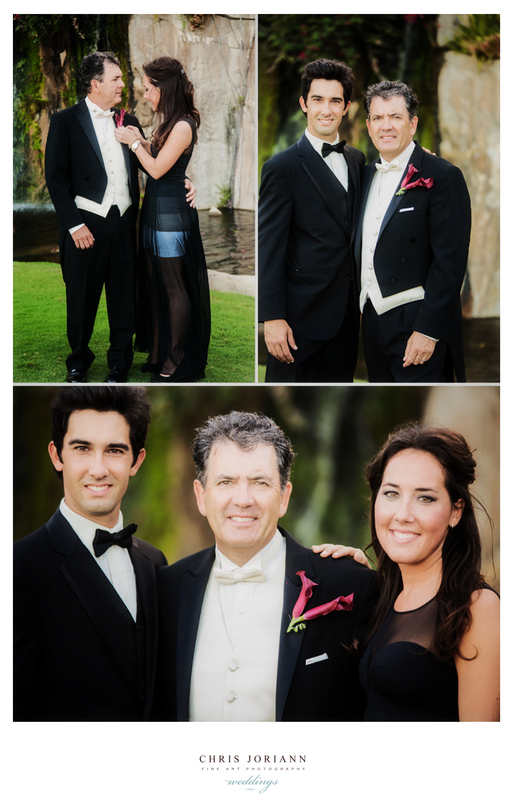 Earlier in the day, the couple readied at PGA National Resort, and married at St. Edward Catholic Church in Palm Beach and their nuptials were presided over by the Bishop himself, a family friend. 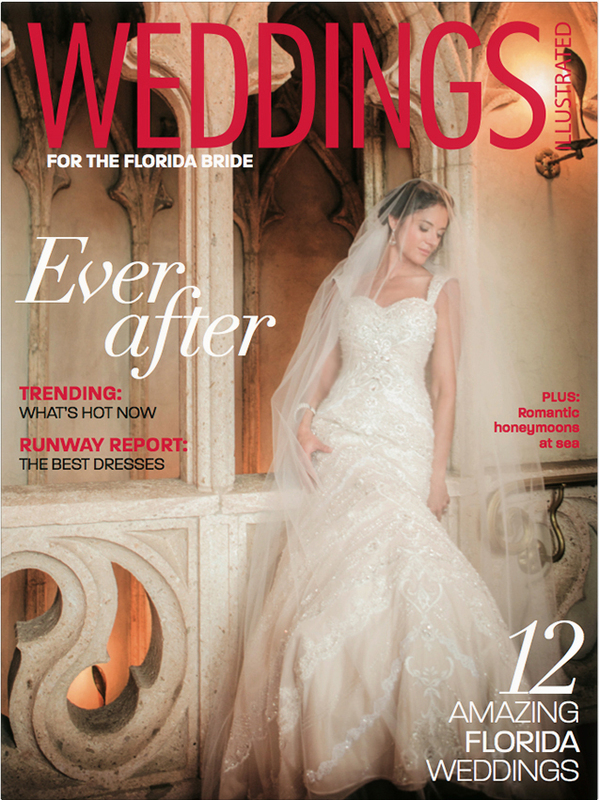 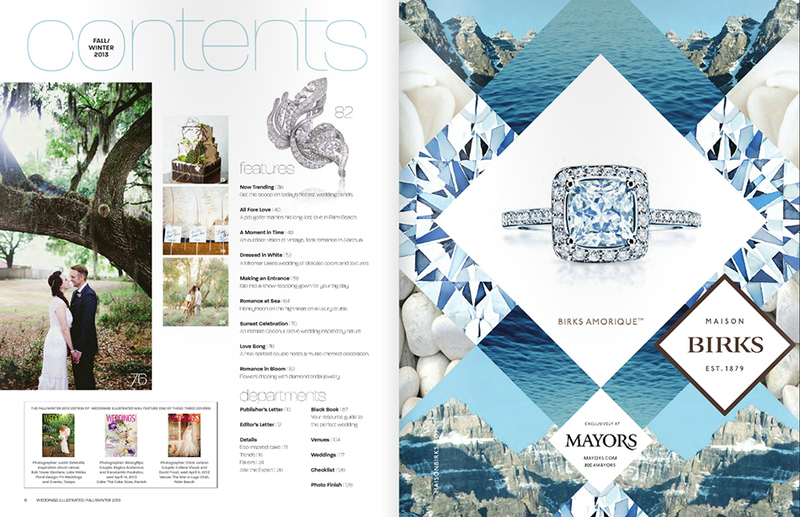 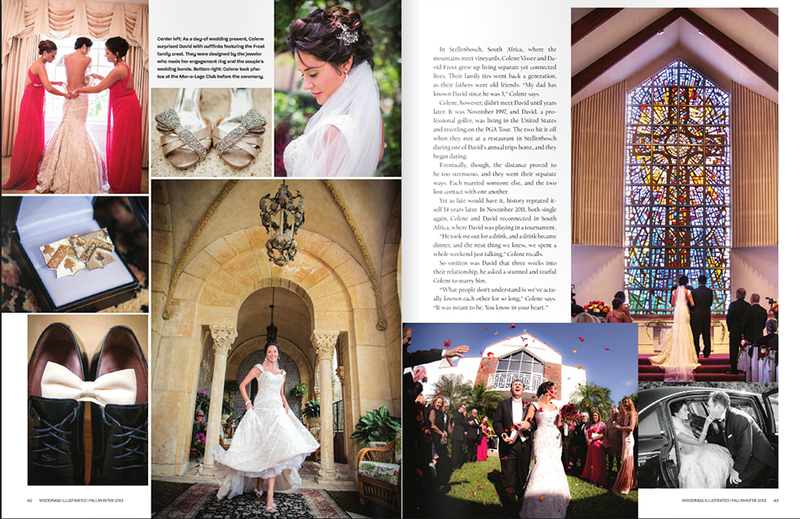 So excited to have shot the cover of the latest Winter/Spring issue of Weddings Illustrated at the fabulous Mar-a-Lago Club in Palm Beach!!! 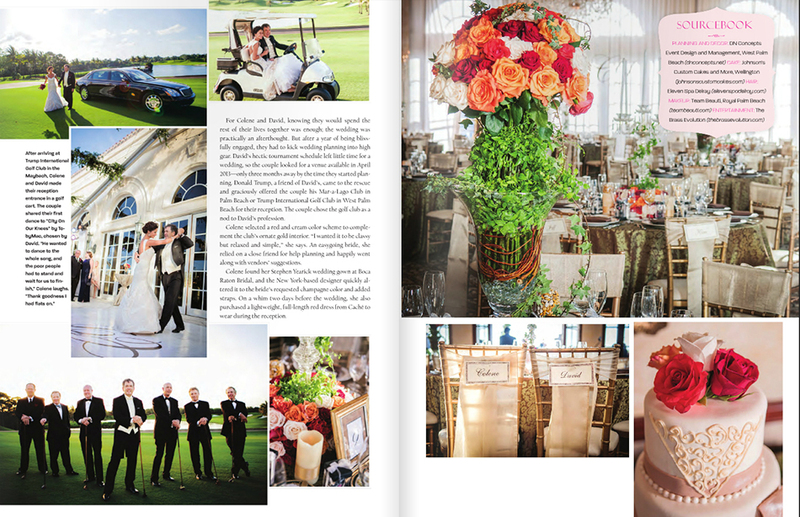 Inside, the issue also features the Trump International Golf Club real wedding feature of pro golfer David Frost to Colene Visser. 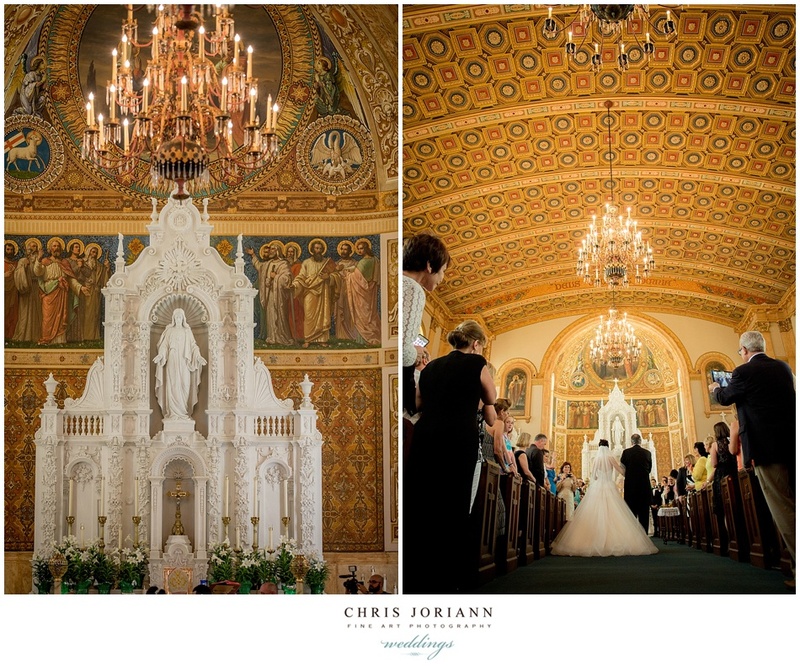 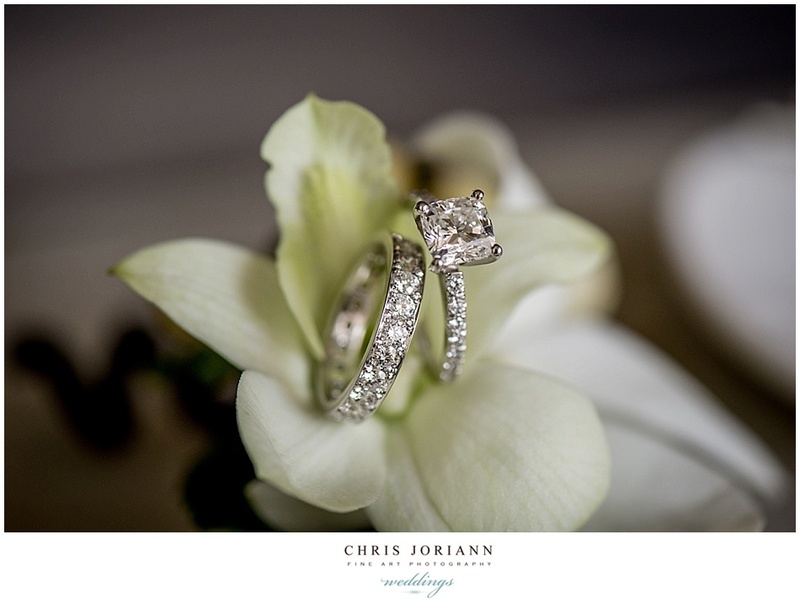 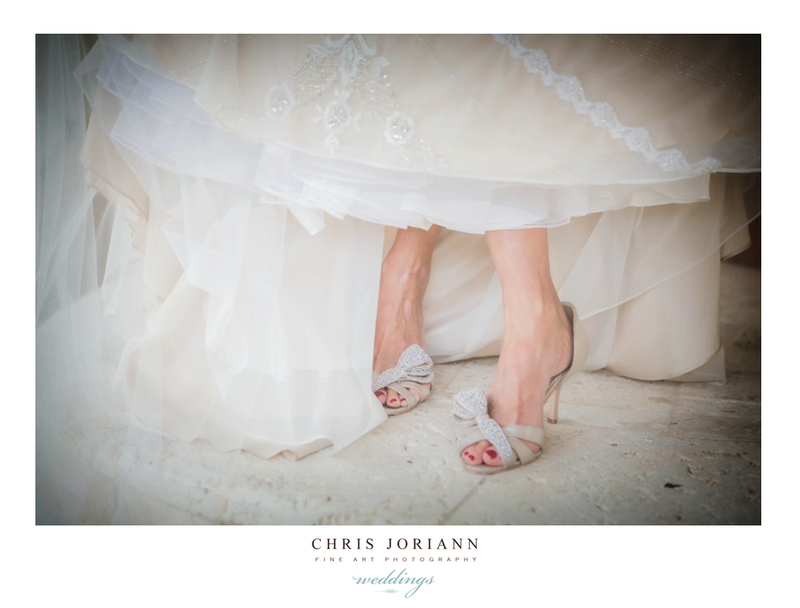 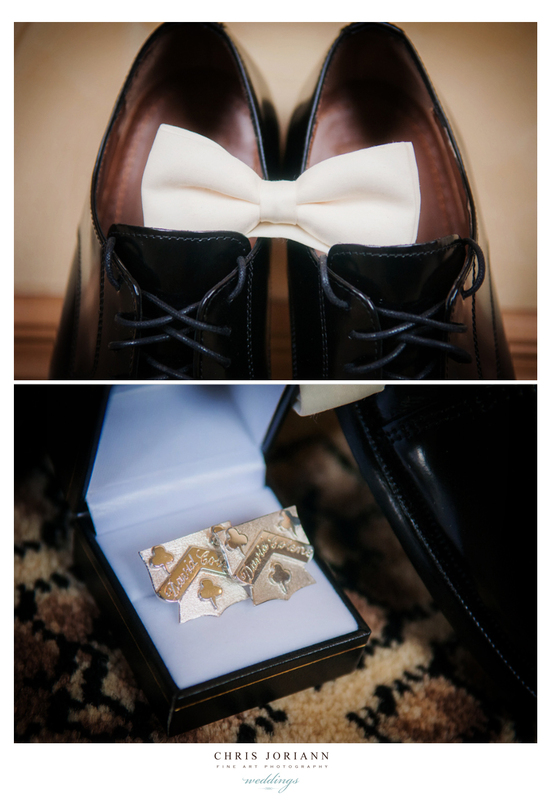 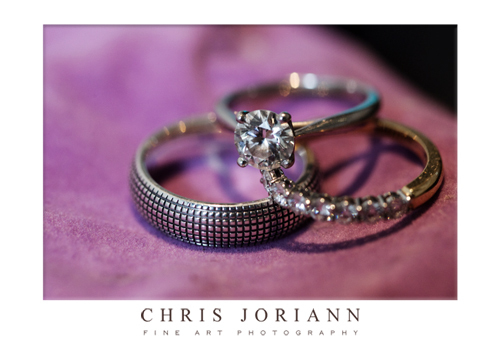 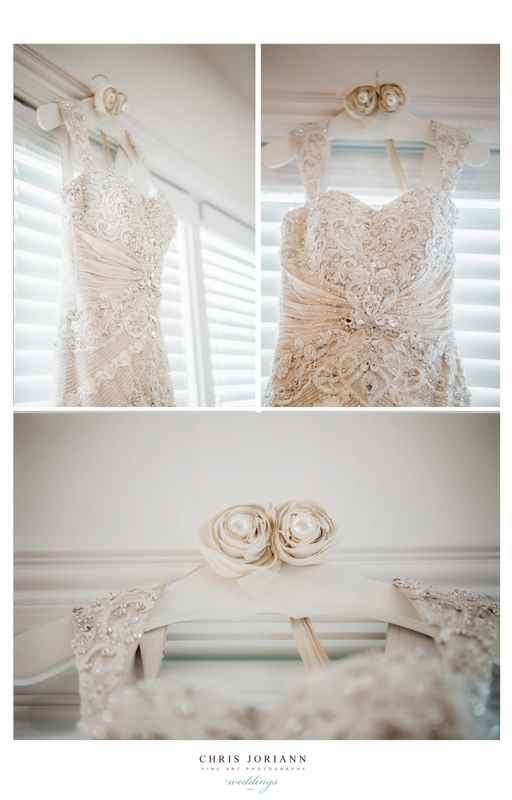 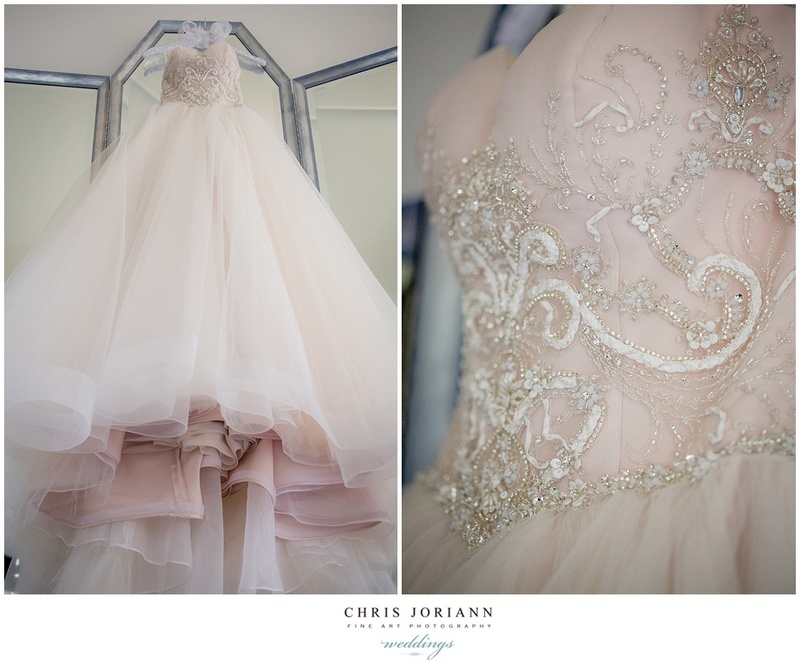 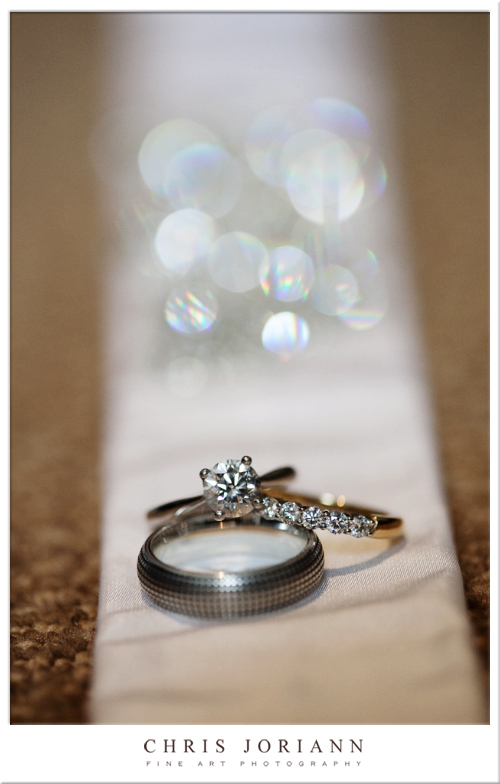 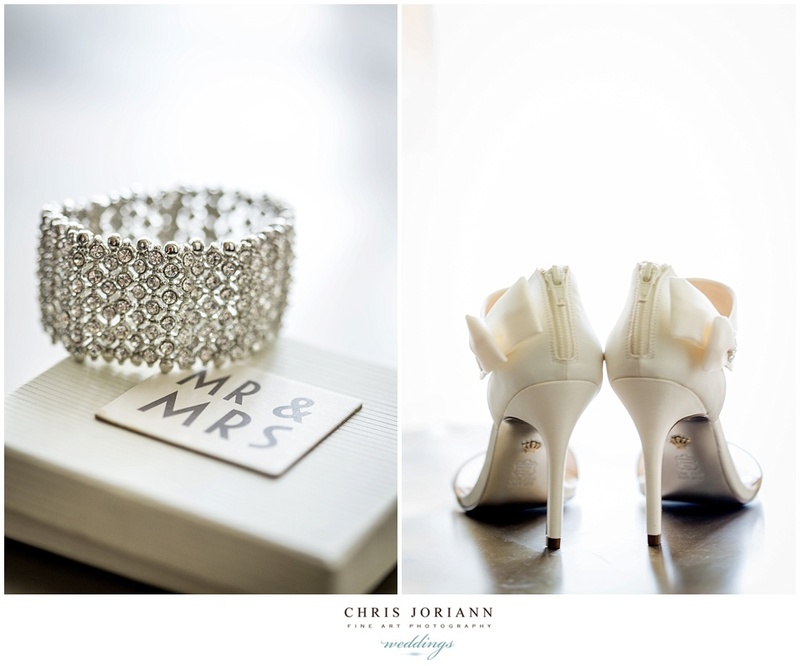 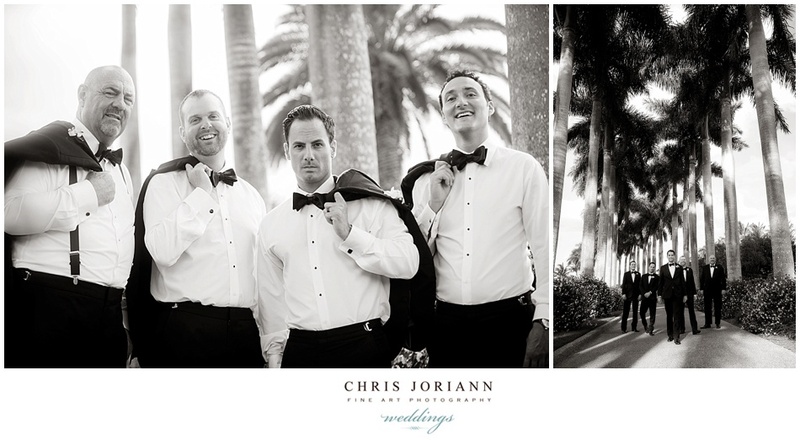 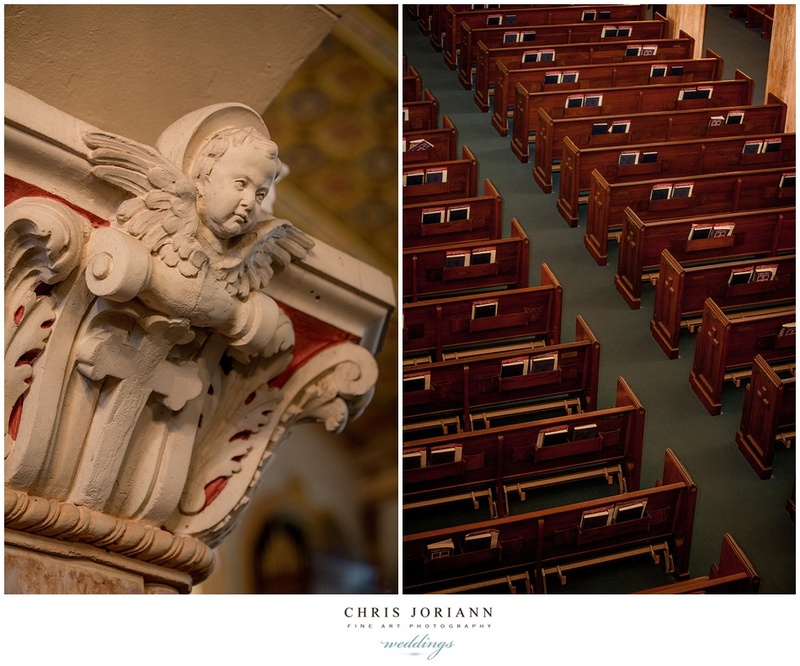 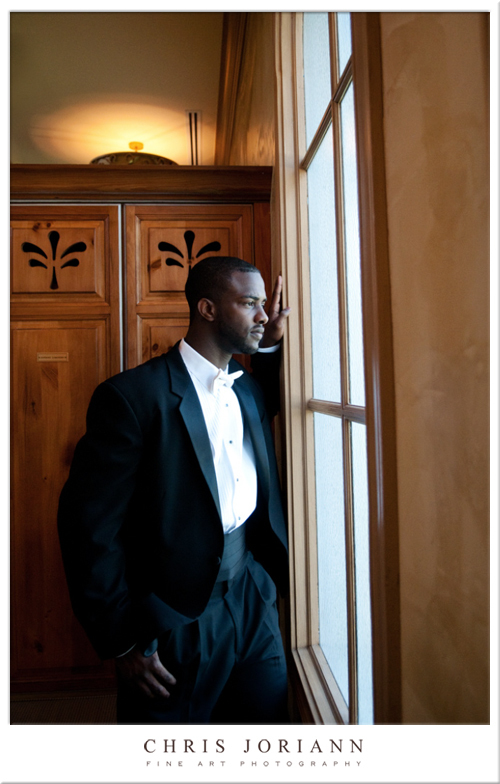 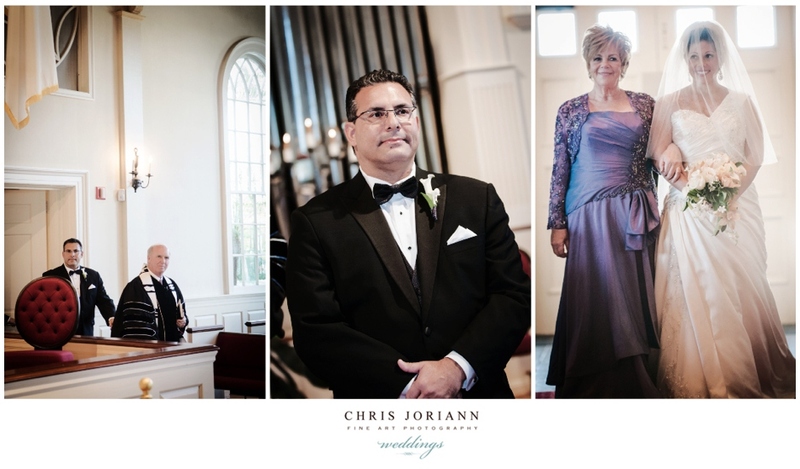 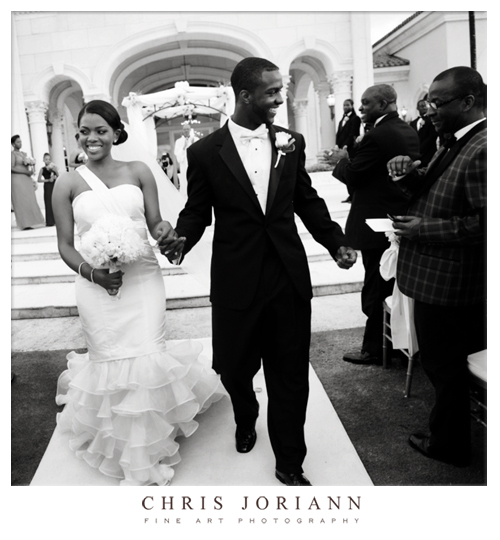 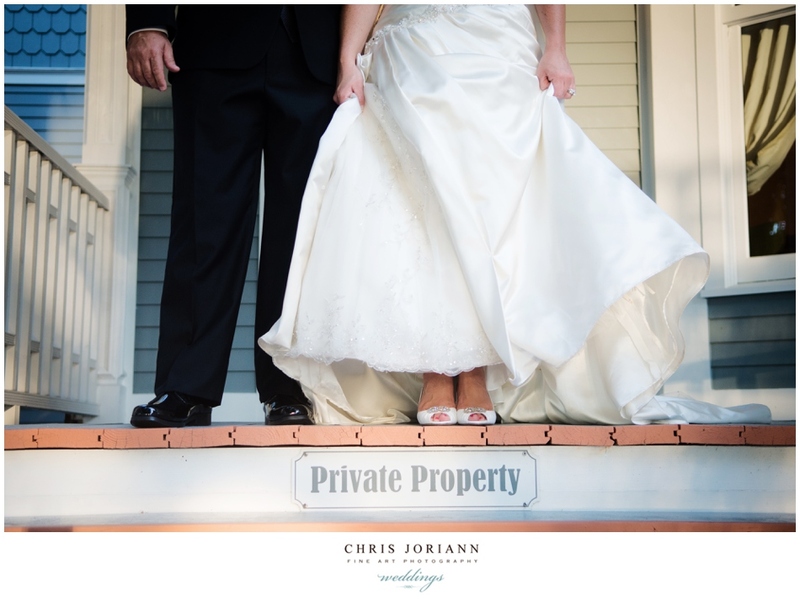 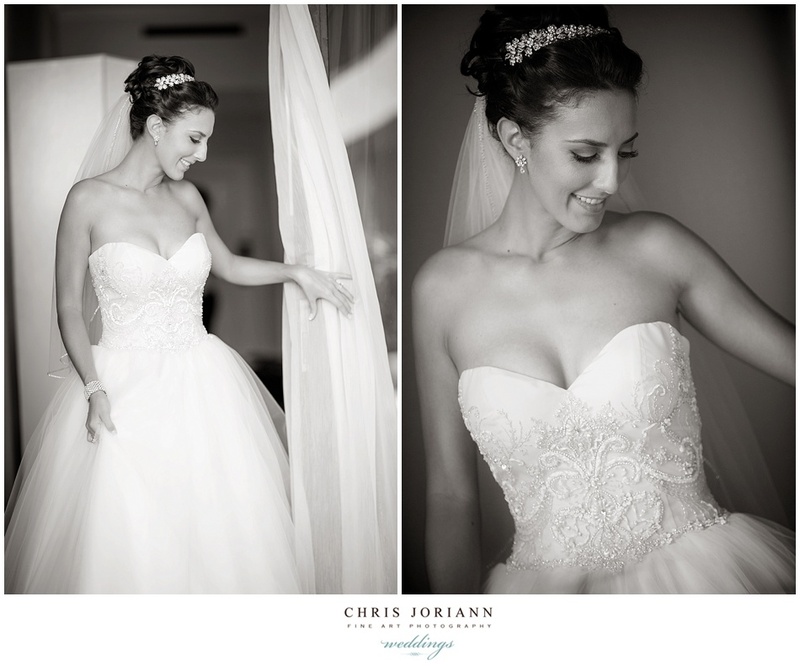 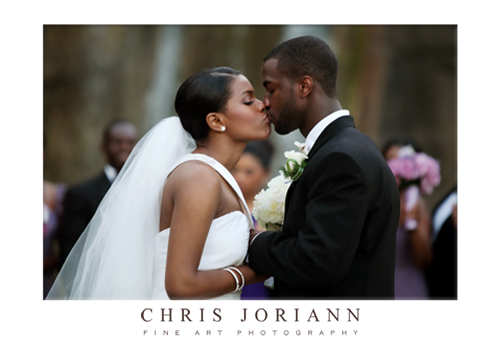 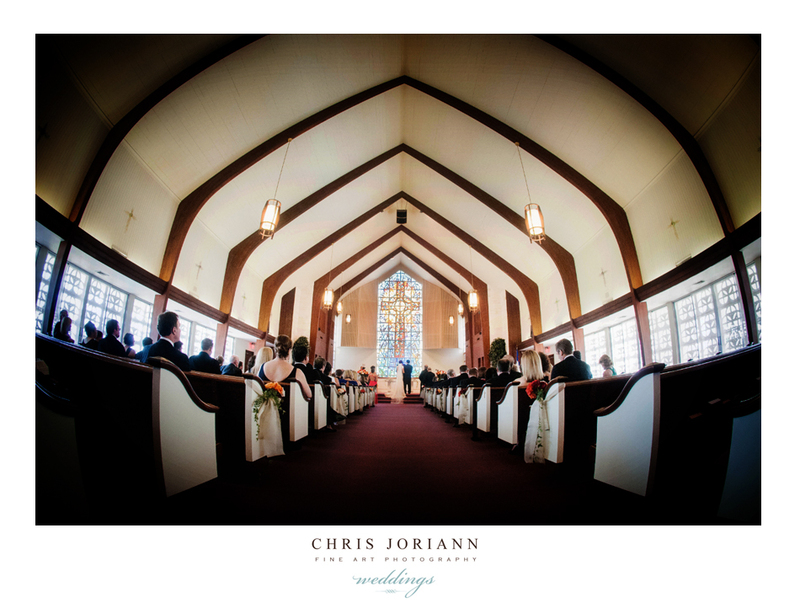 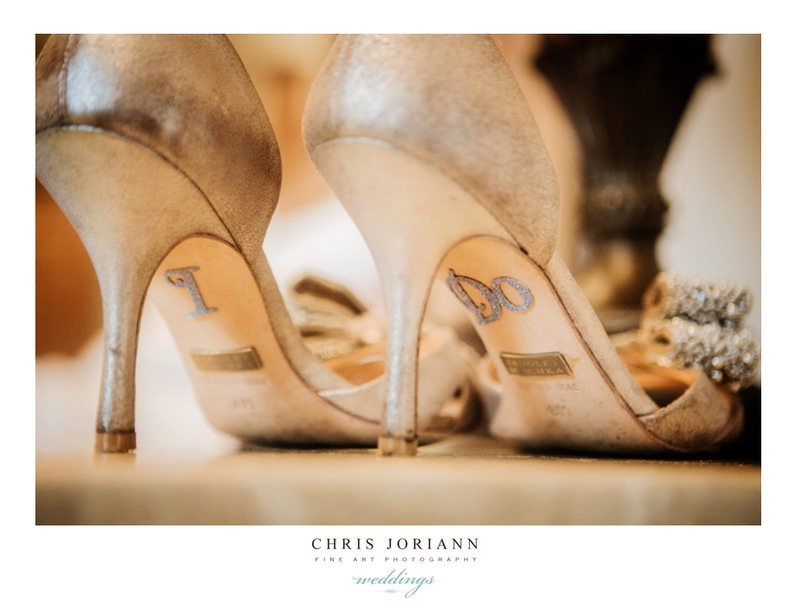 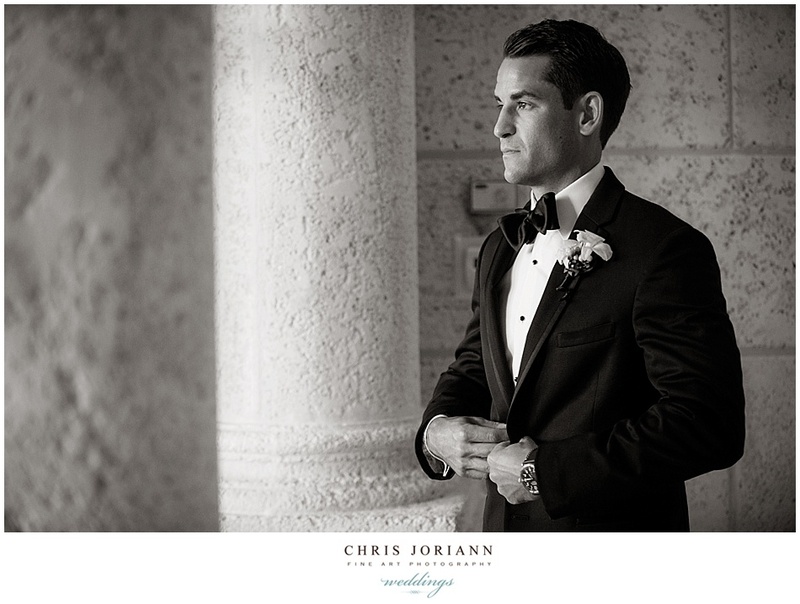 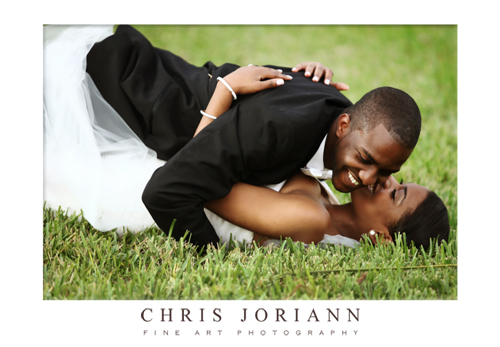 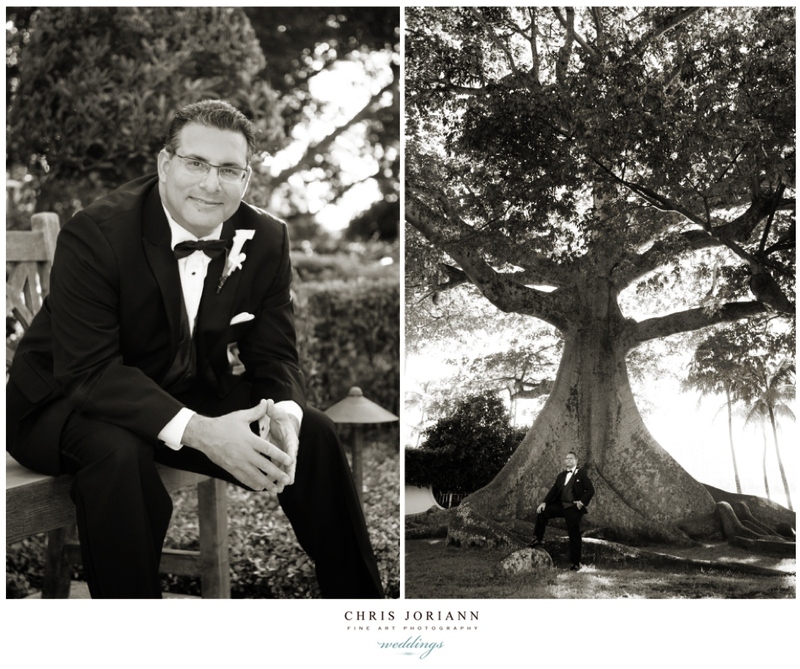 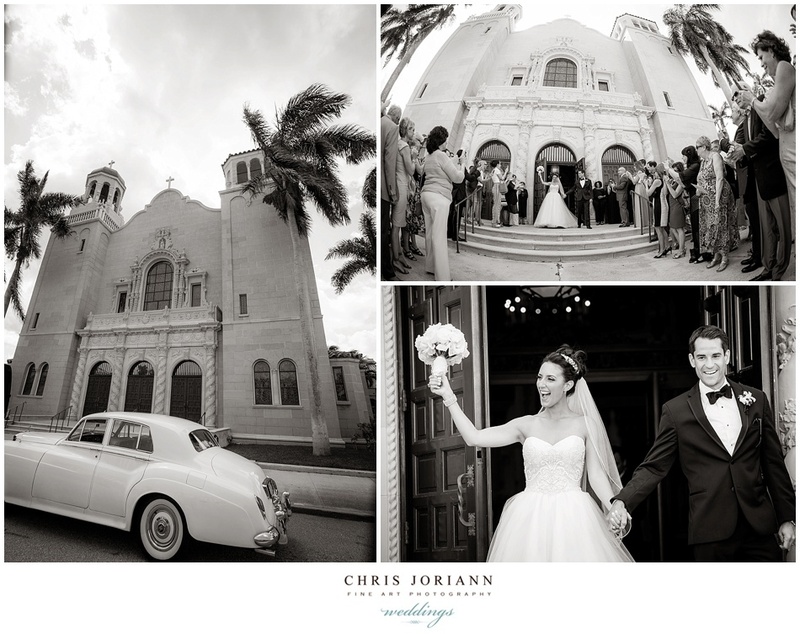 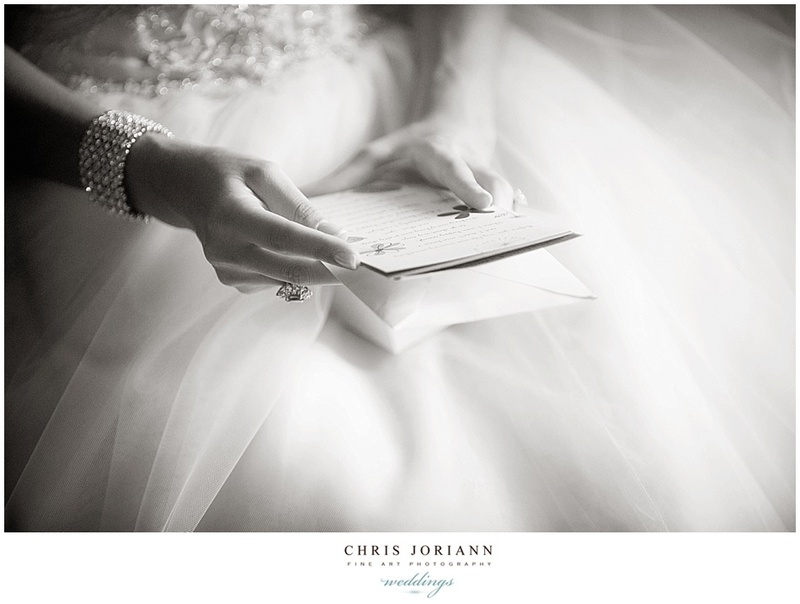 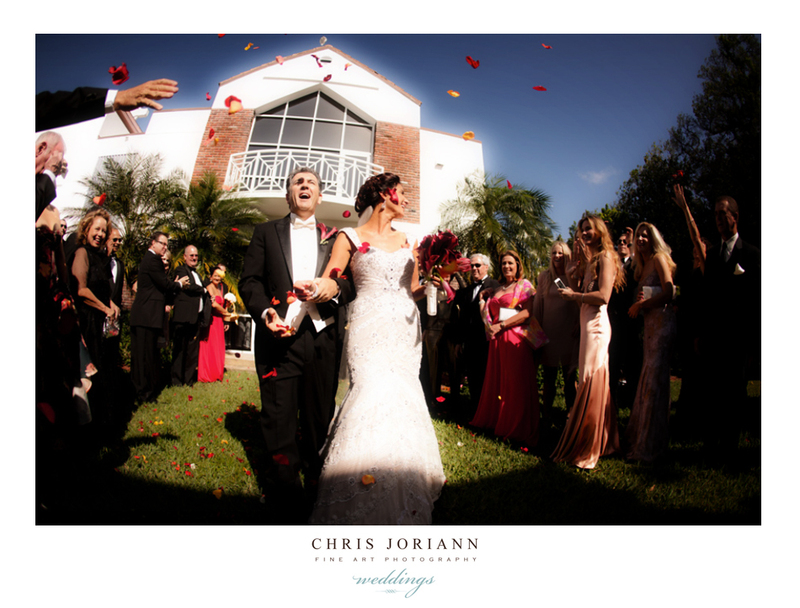 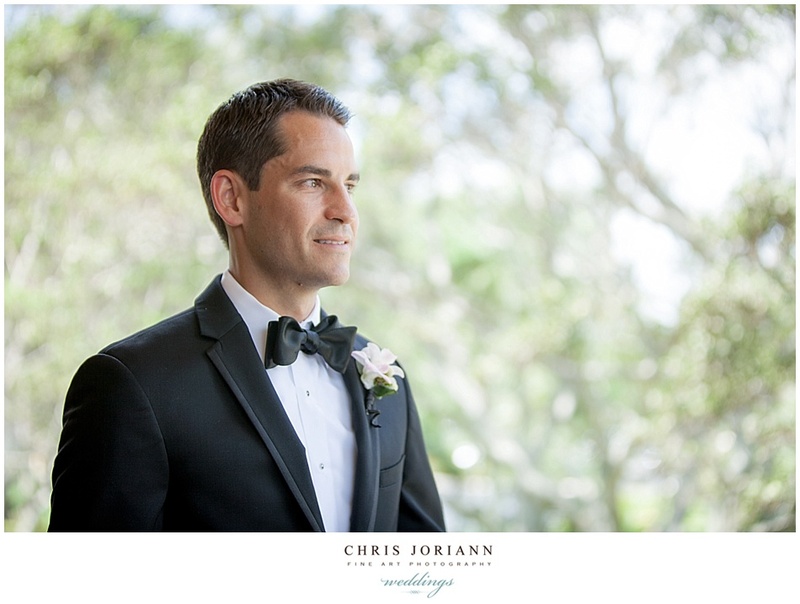 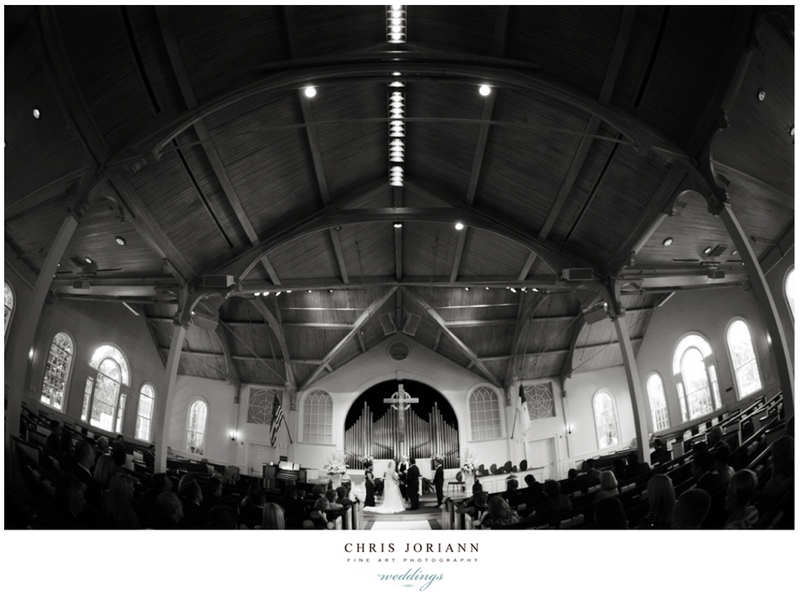 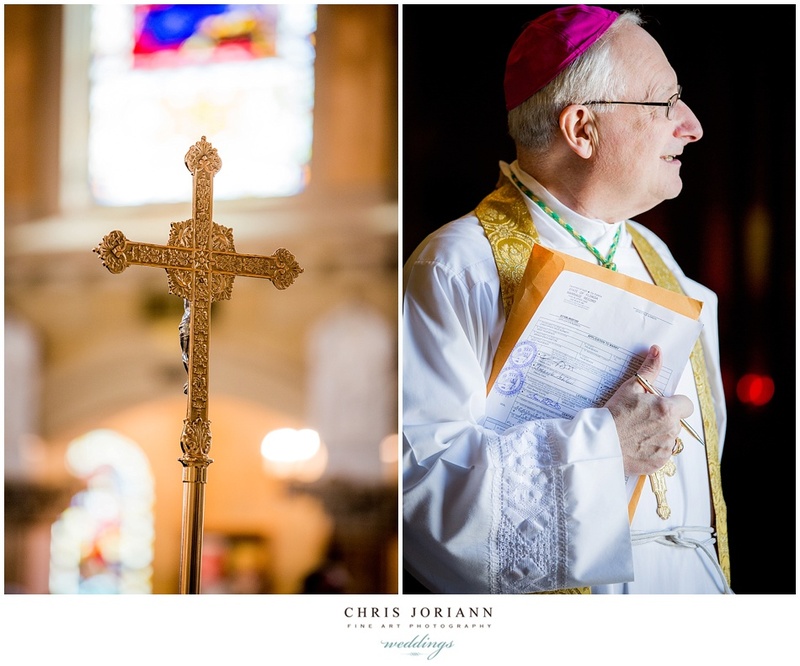 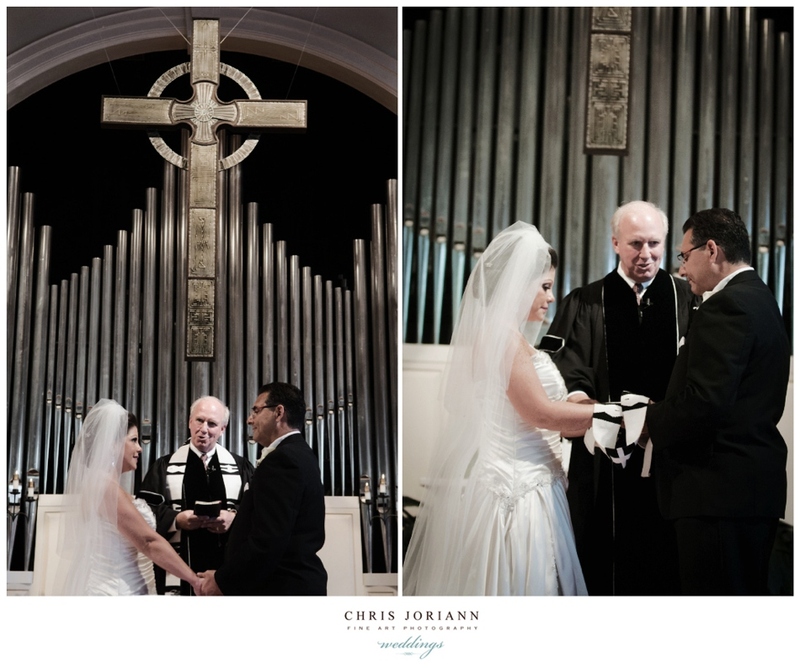 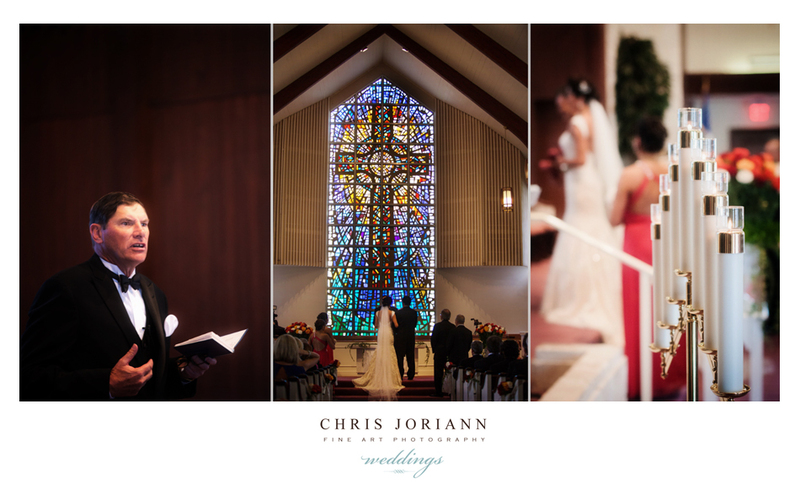 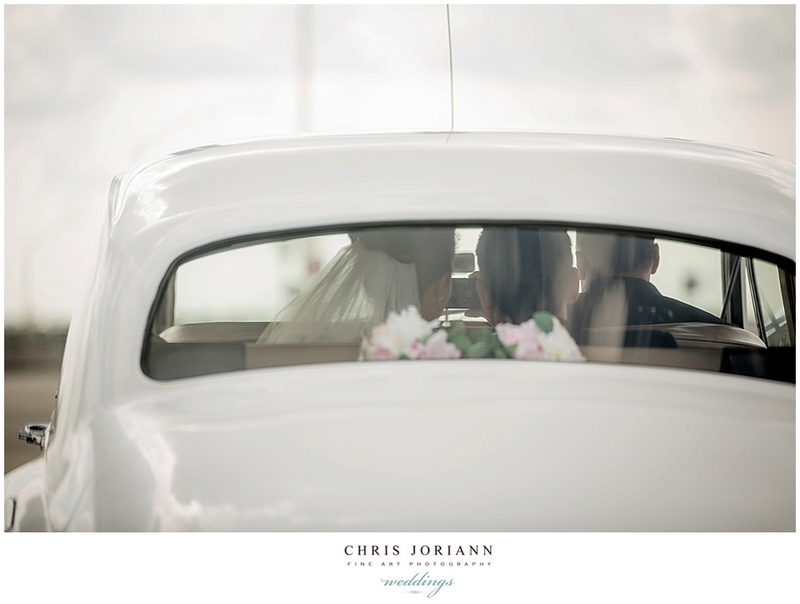 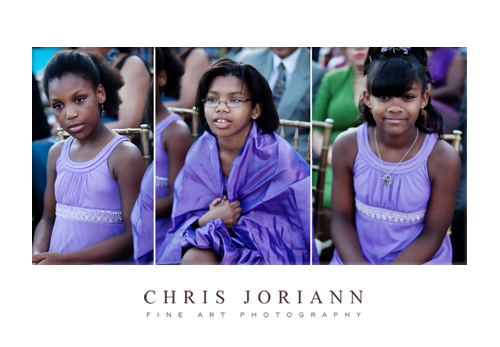 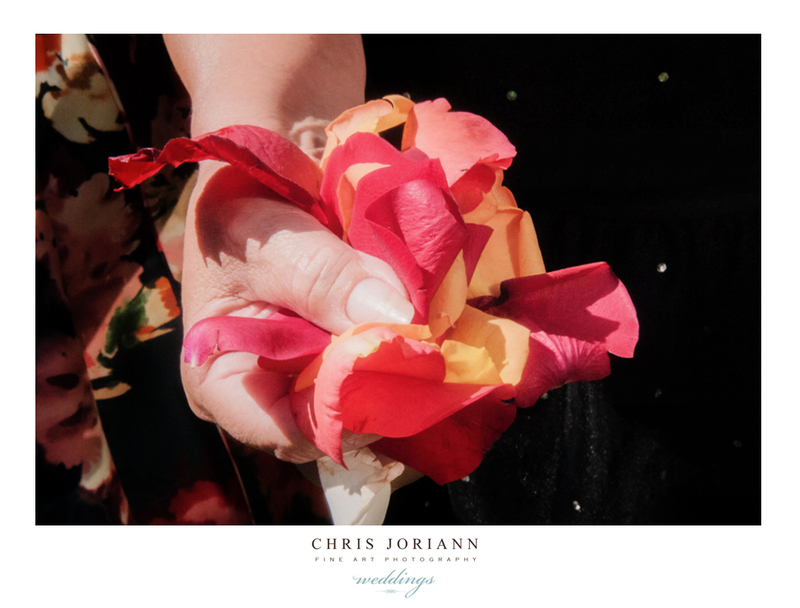 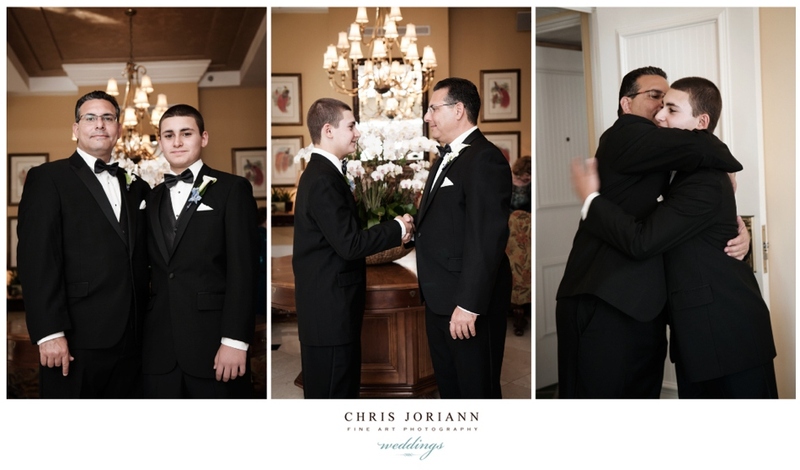 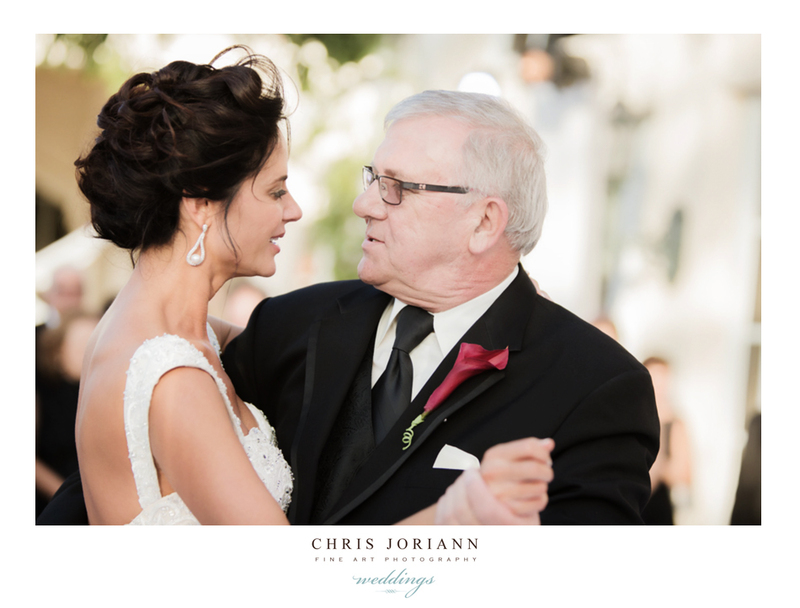 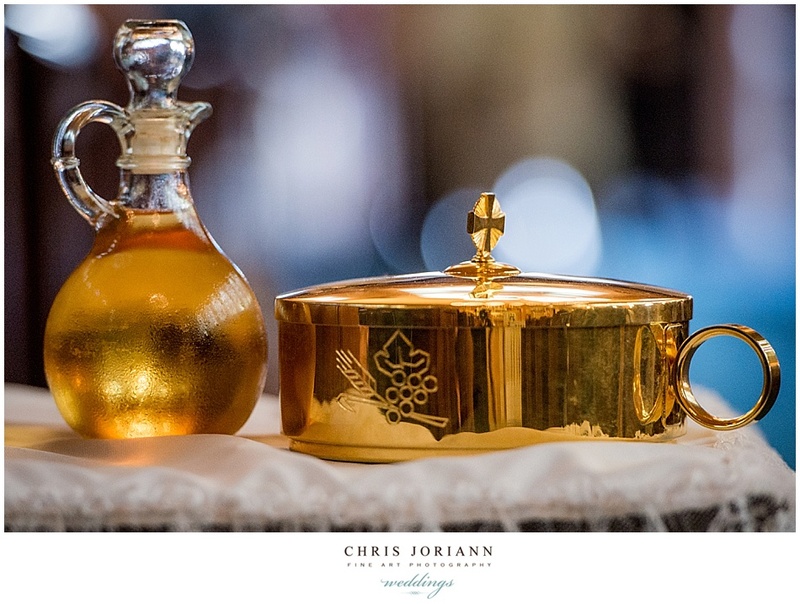 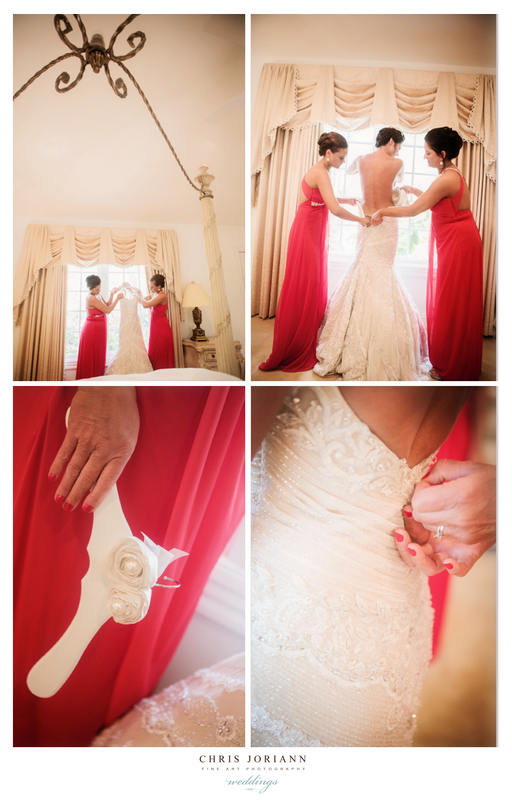 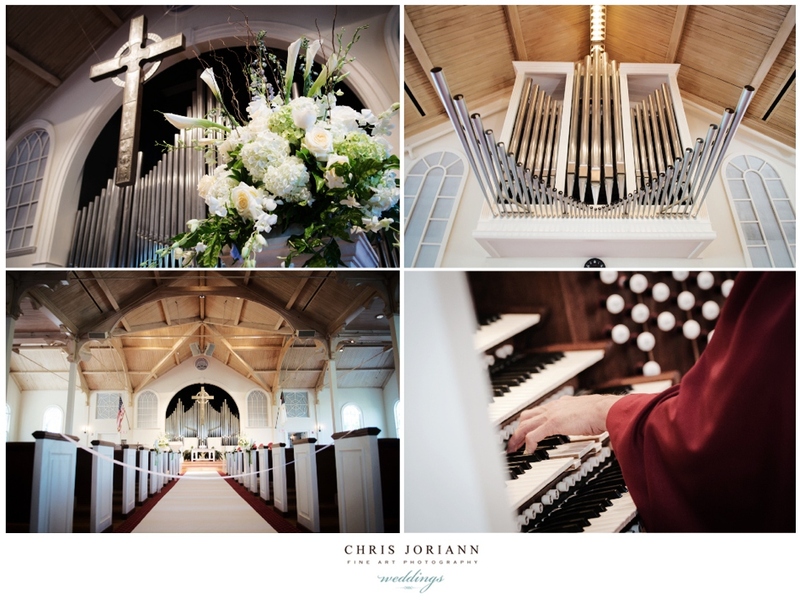 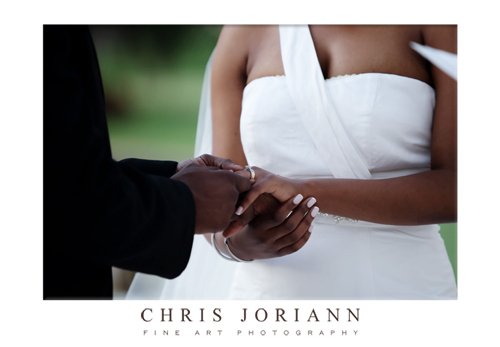 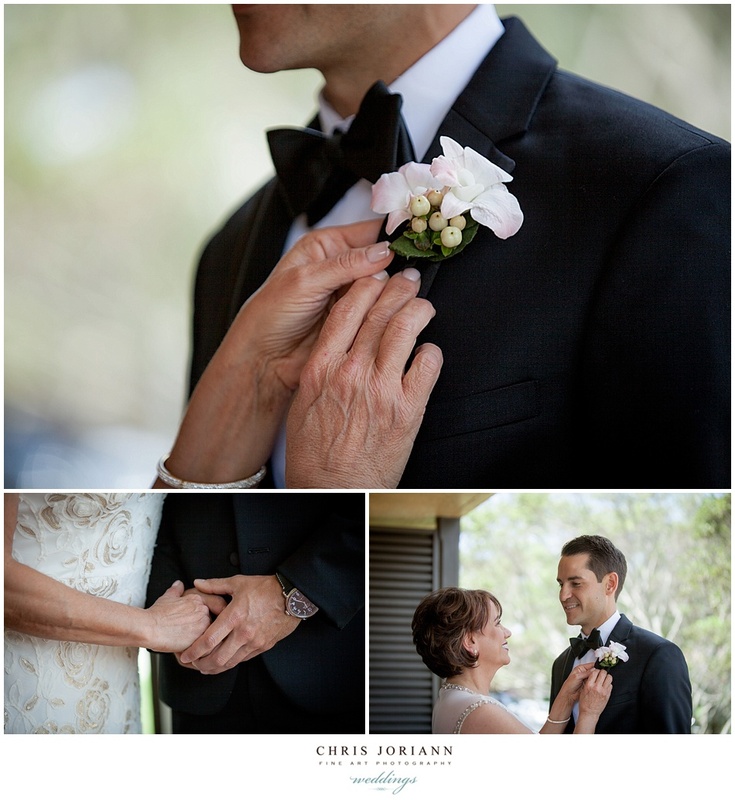 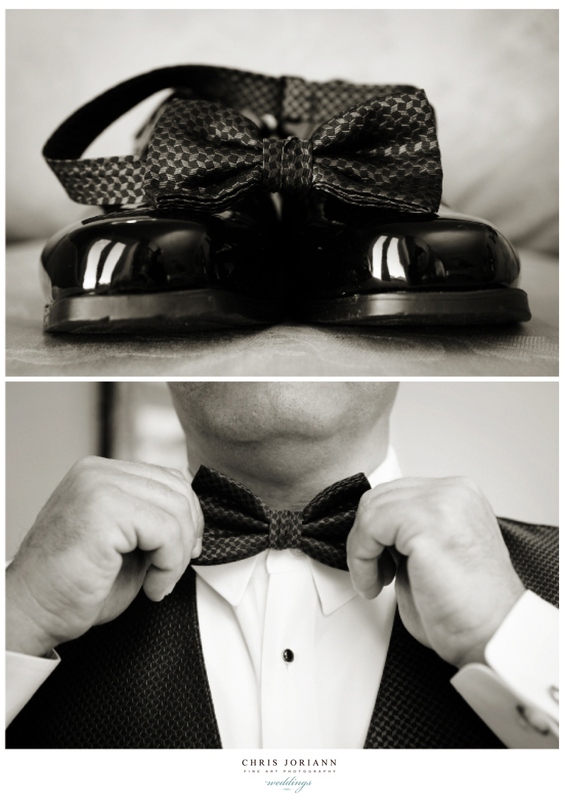 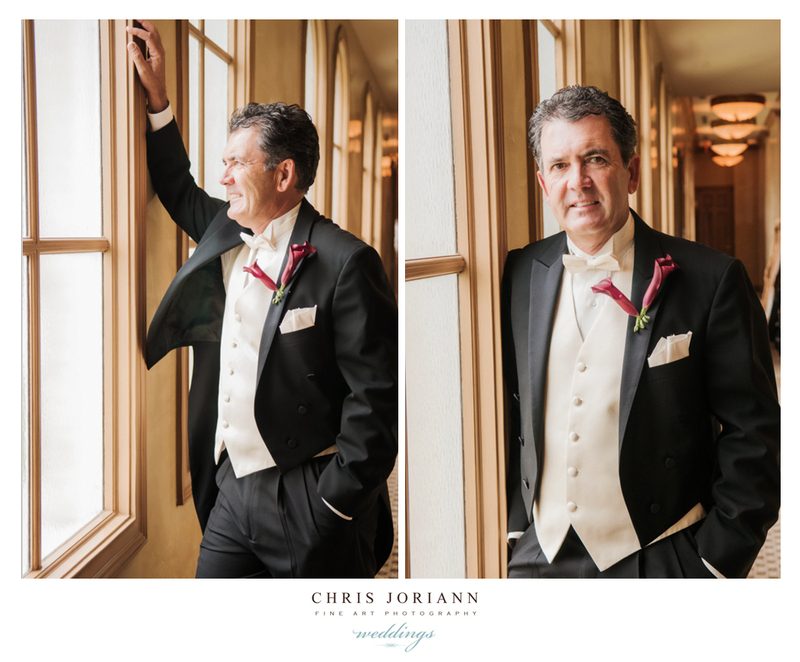 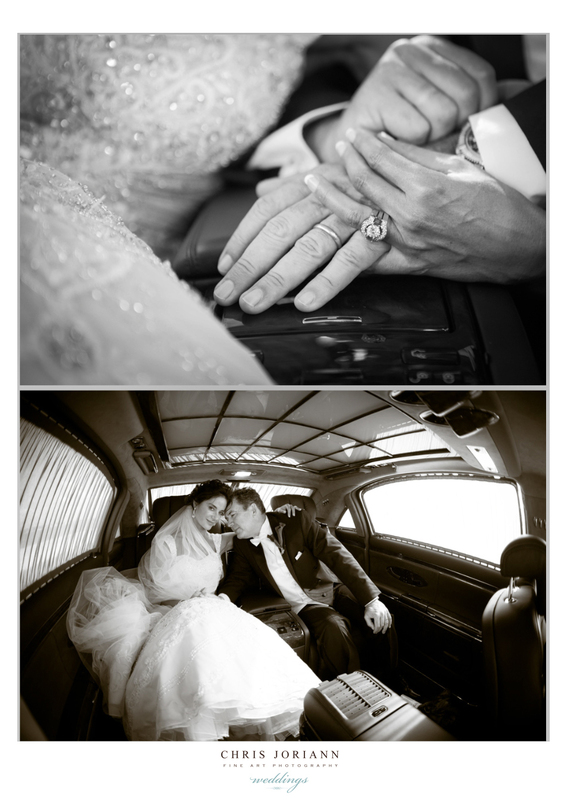 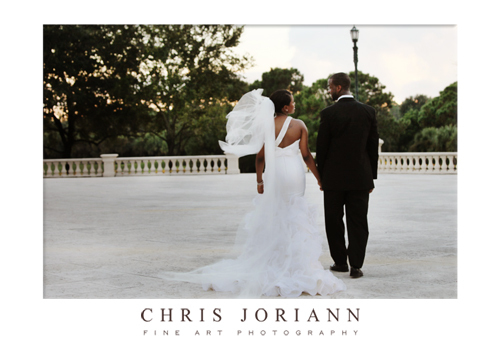 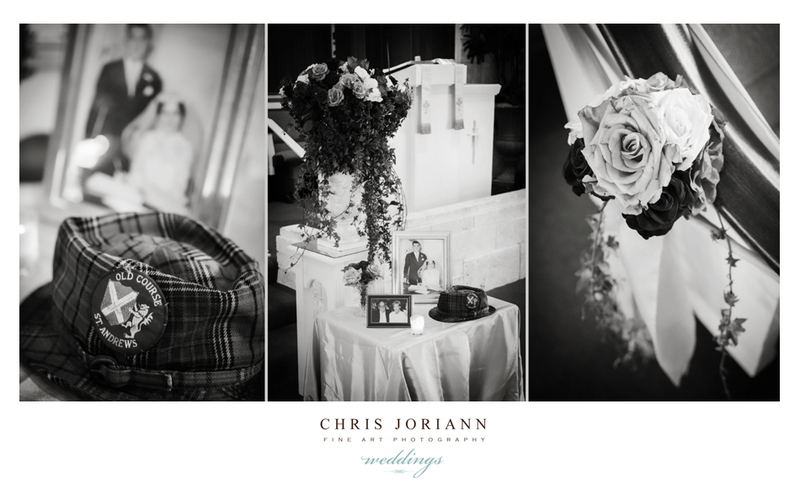 click here to view the complete blog post from this wedding. 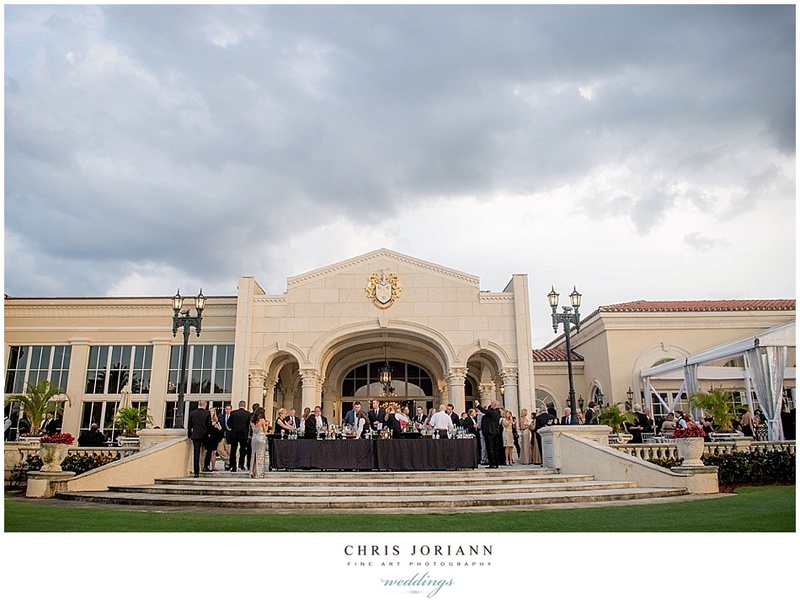 Trump International Golf Club hosted the wedding of “Champions Tour” pro golfer David Frost to Colene Visser, just three weeks after his first place victory at the Toshiba Classic at Newport Beach. 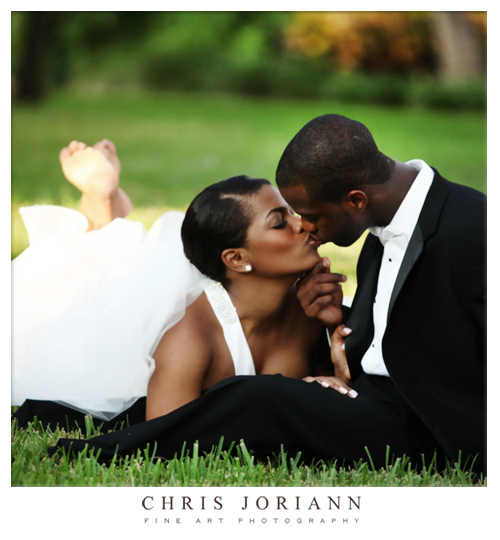 Needless to say, he’s having a great year so far! 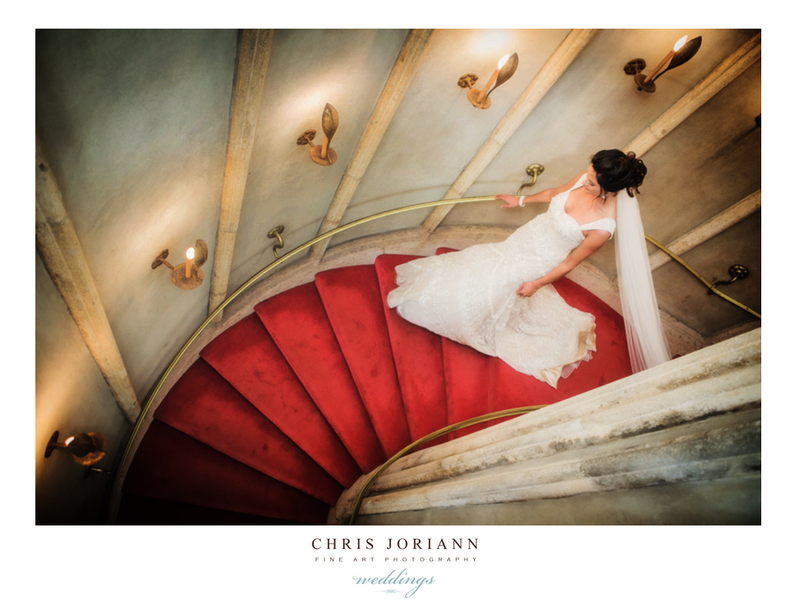 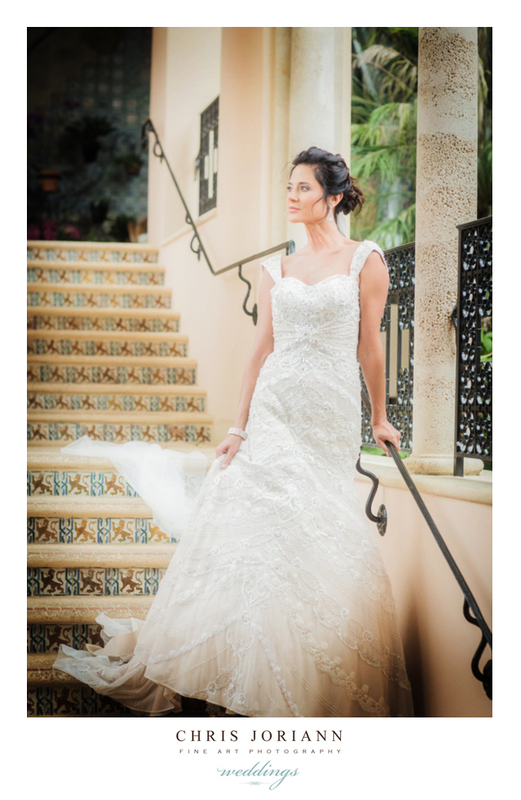 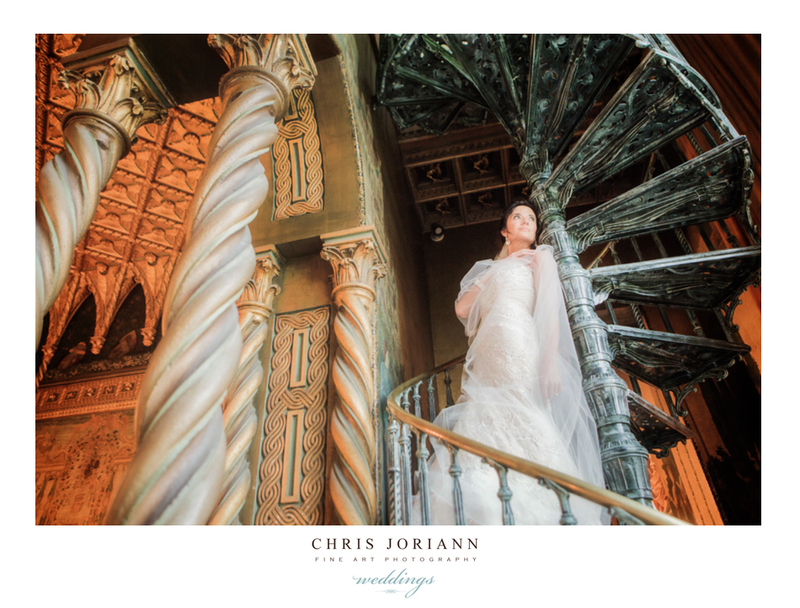 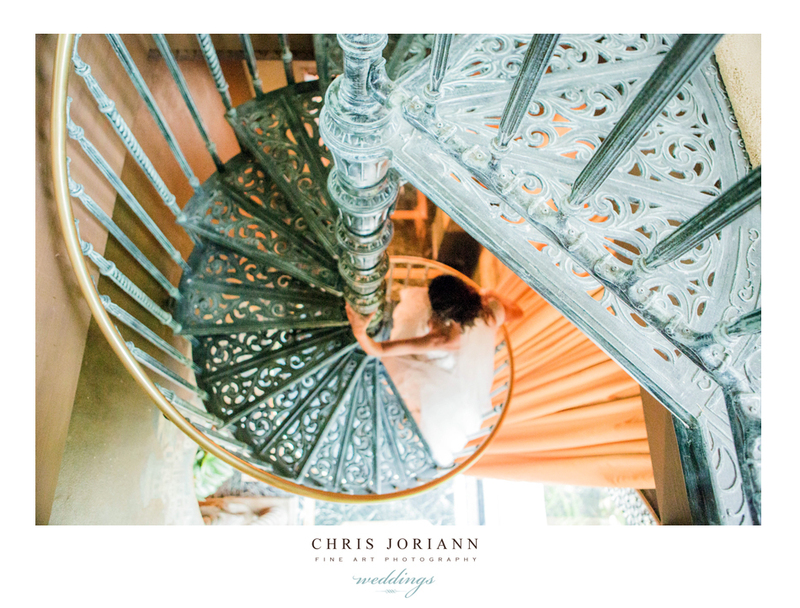 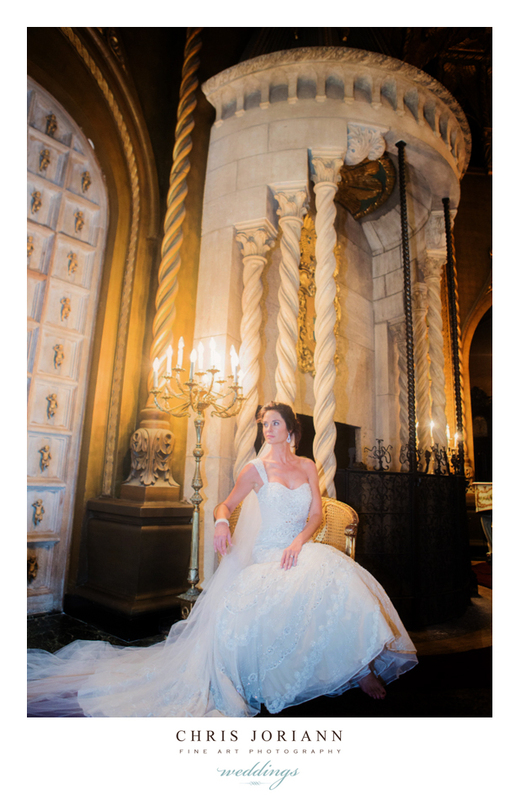 The bride is a vision as she descends the mansion’s fabulous staircase at Trump’s historical Mar-a-Lago Club in Palm Beach. 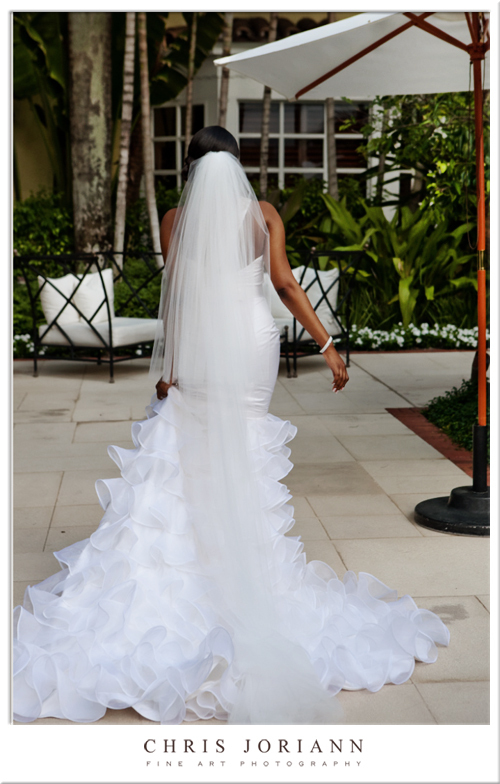 She soon ends up in the arms of her groom at Mar-a-Lago’s entrance, then take some time out to play for the cameras. 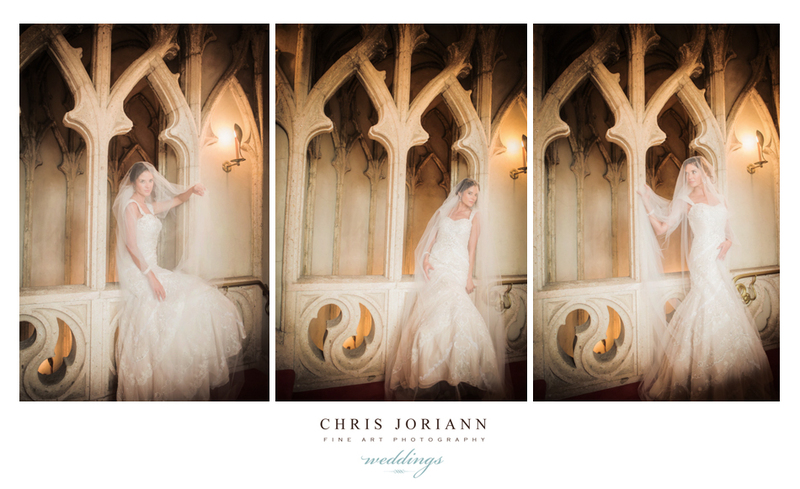 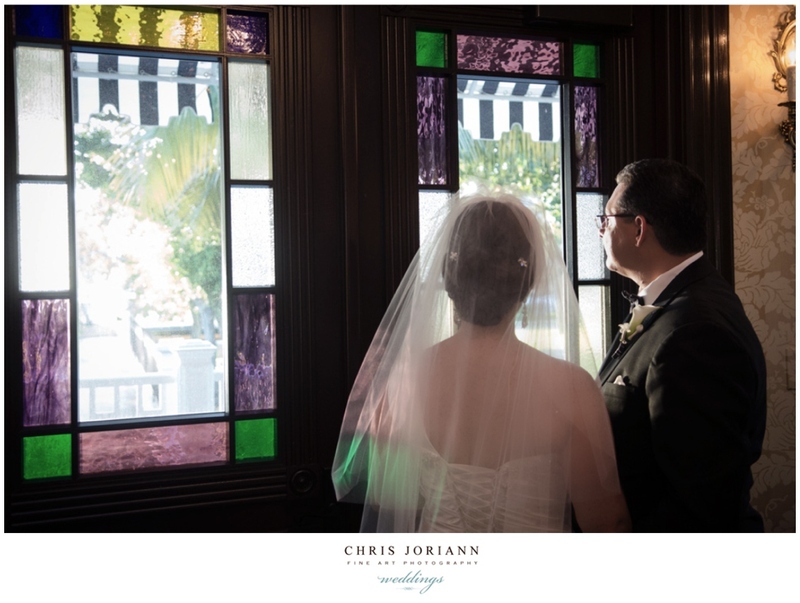 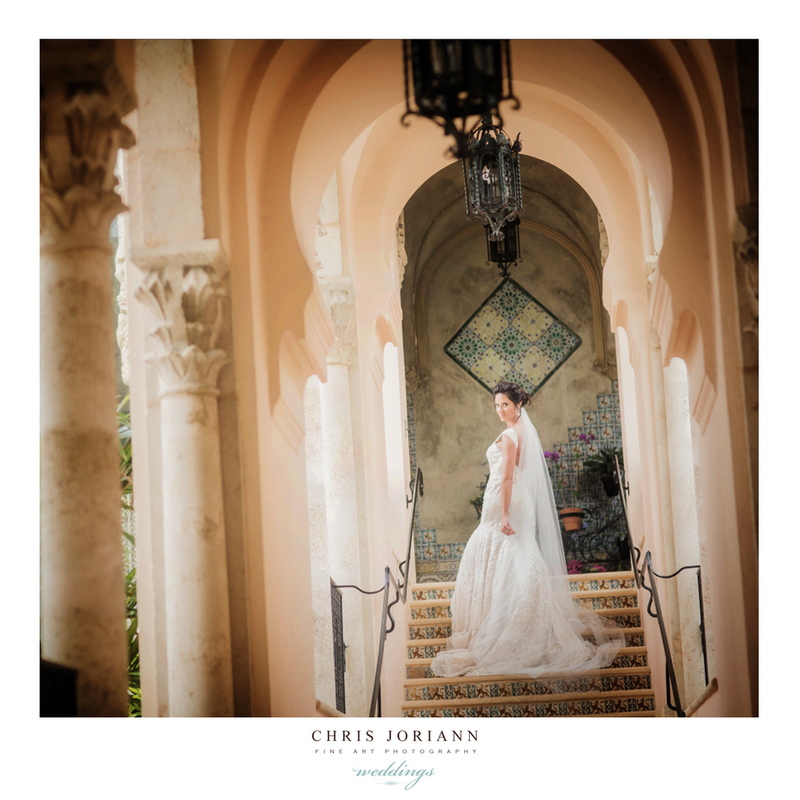 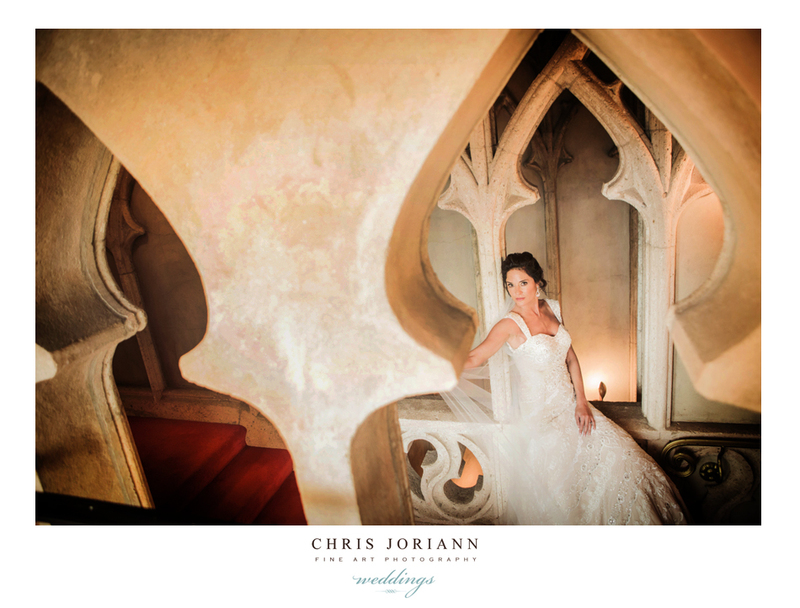 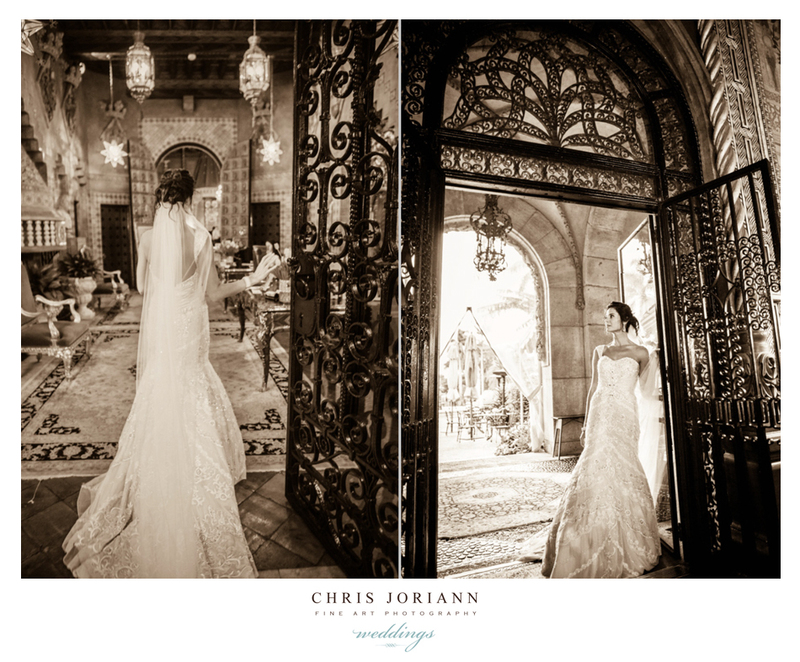 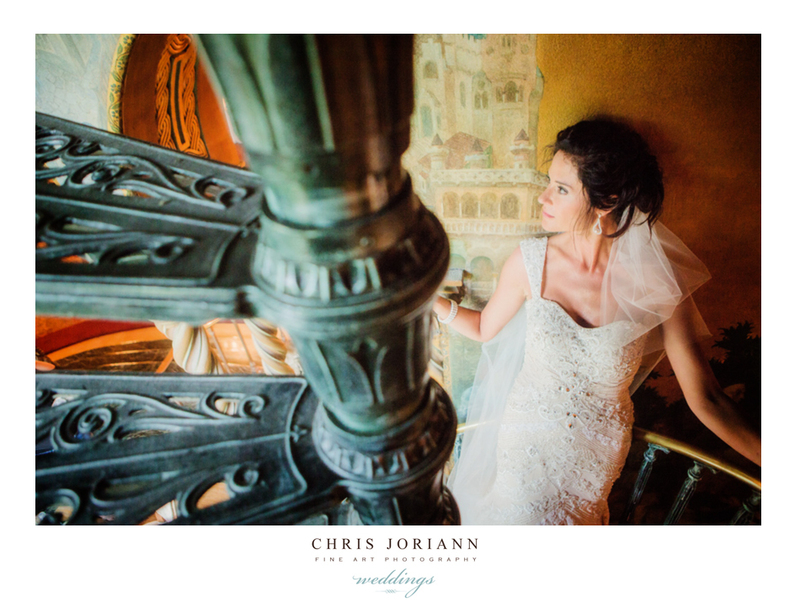 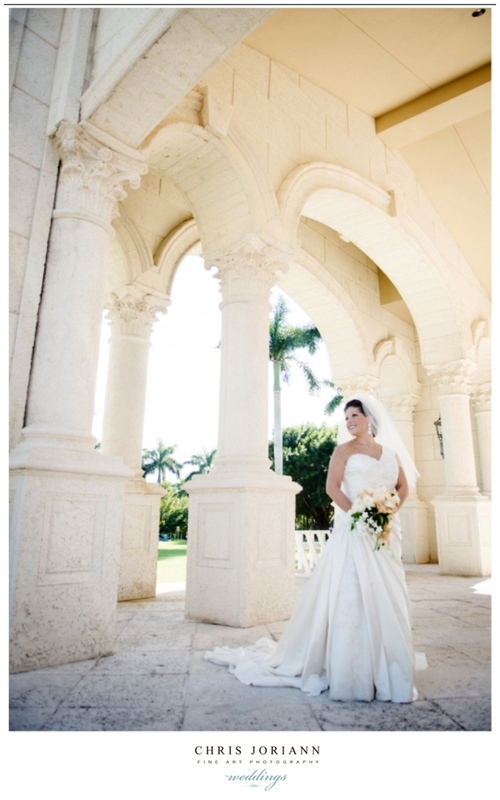 Mar-a-Lago’s spectacular architecture truly makes for the best bridal portrait backdrop bar none. 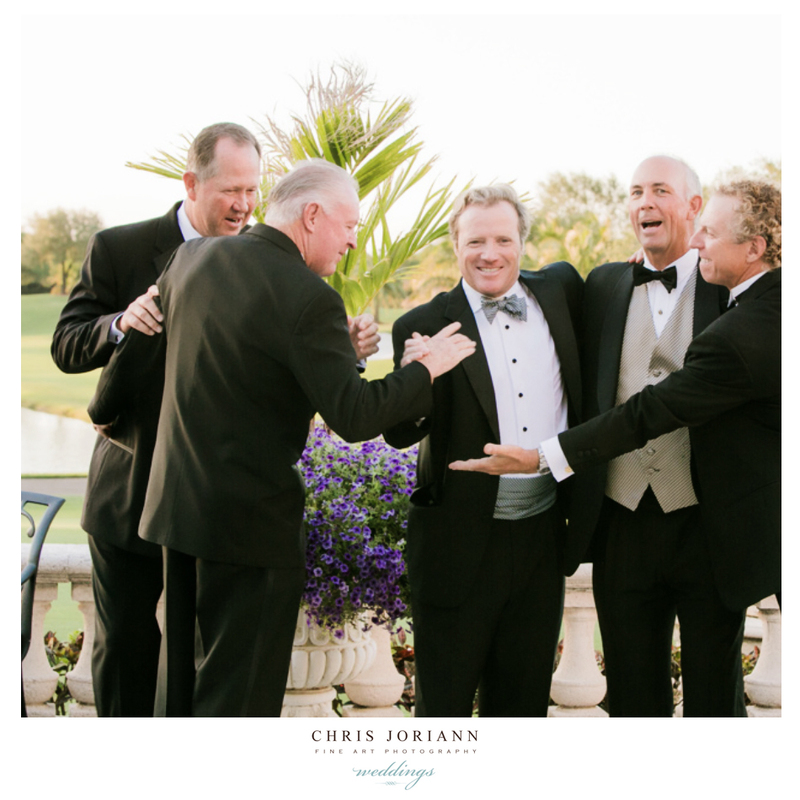 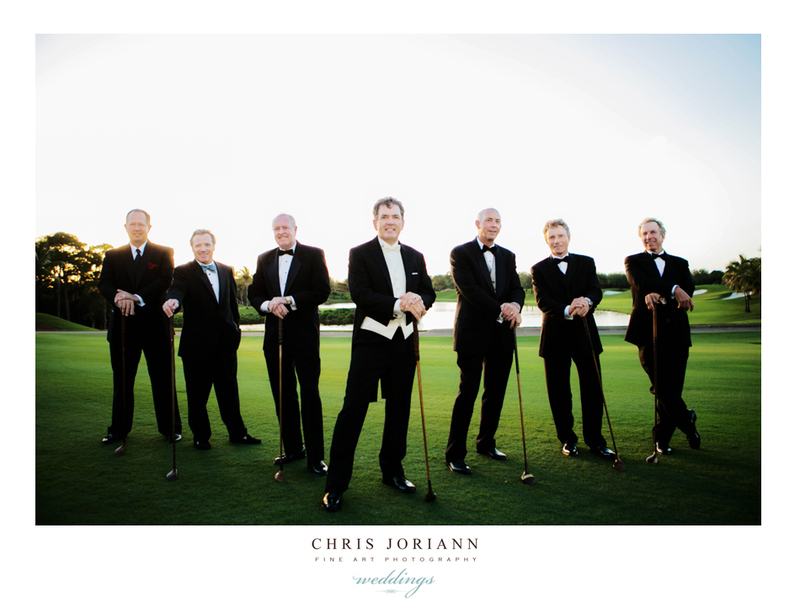 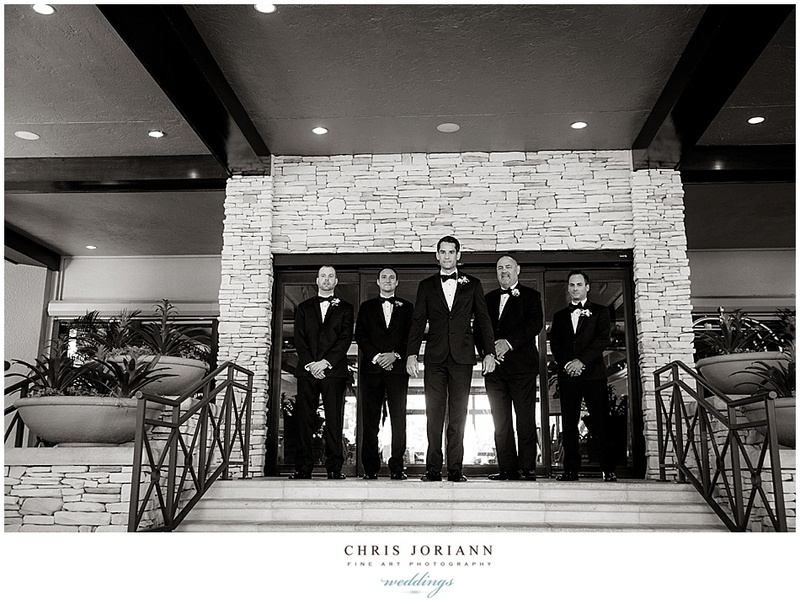 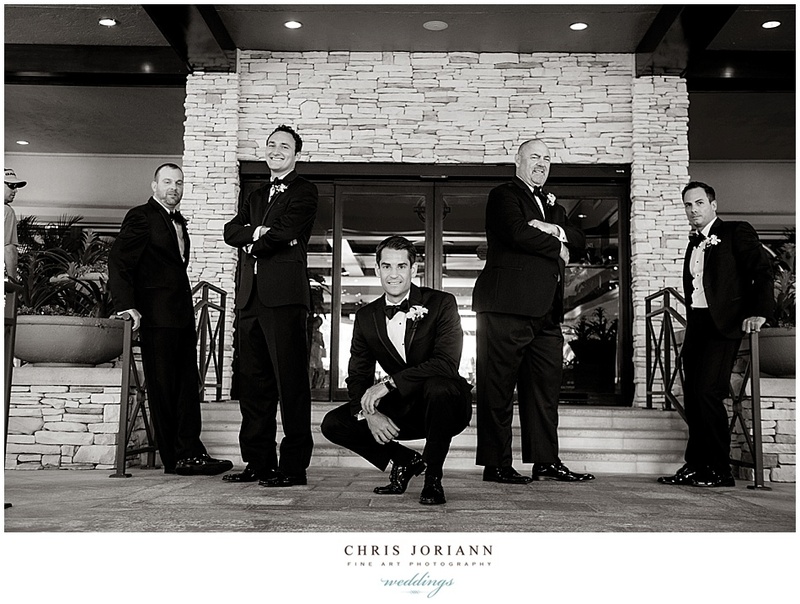 Here the groom, poses with his “dapper” pga tour mates, and a set of antique golf clubs gifted to him. 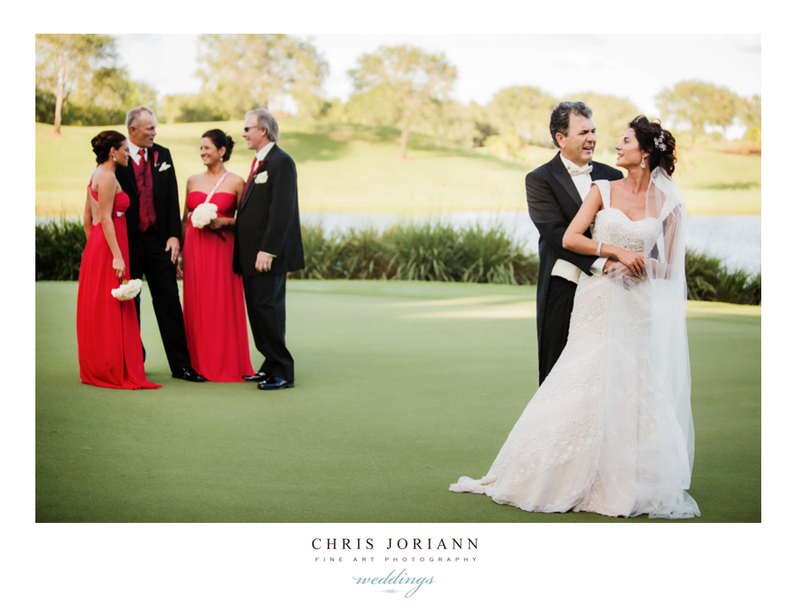 Now, if you’re a golf fan, that’s a shot worth framing. 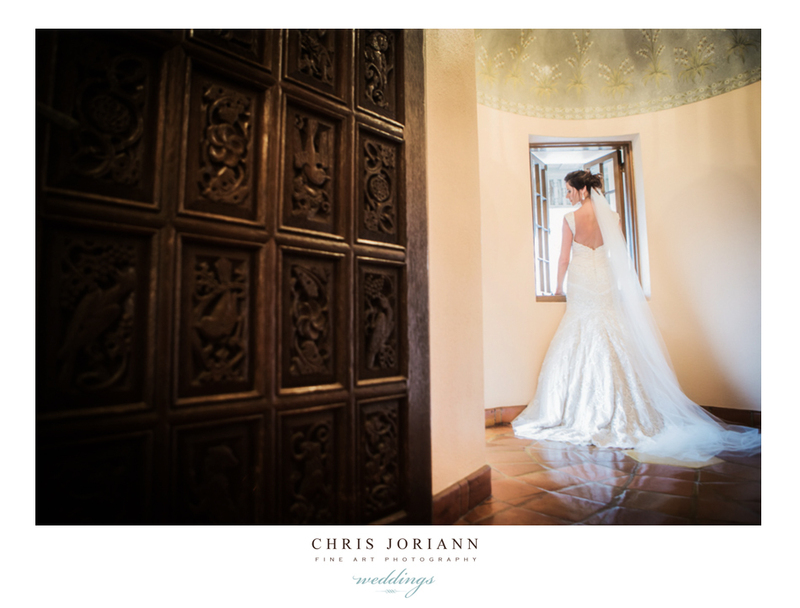 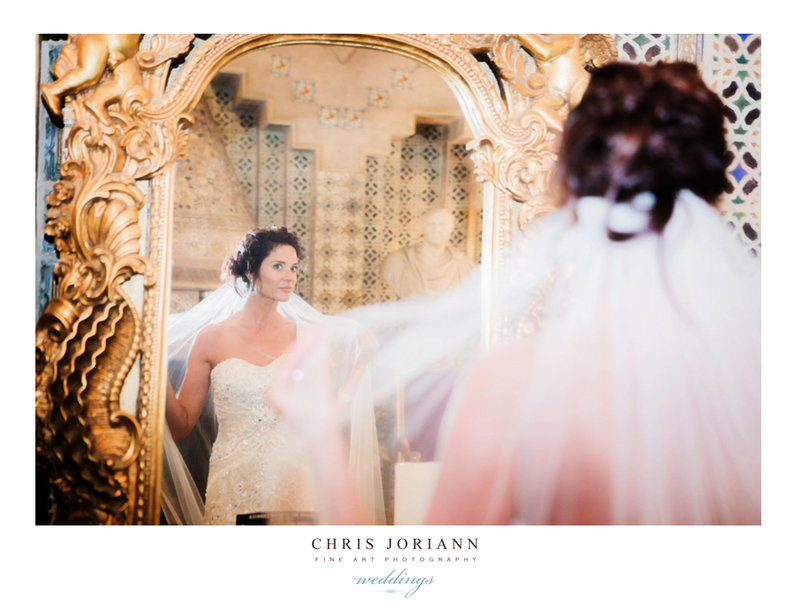 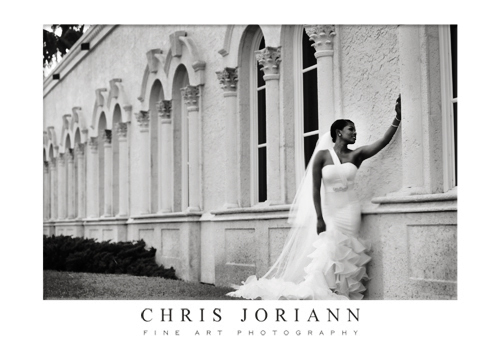 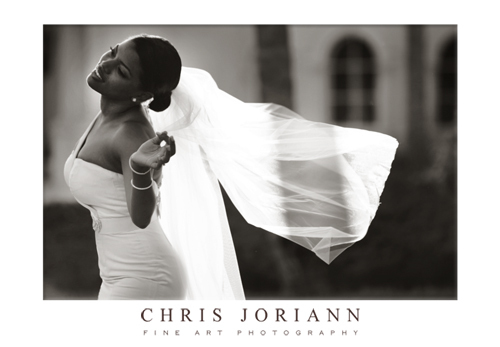 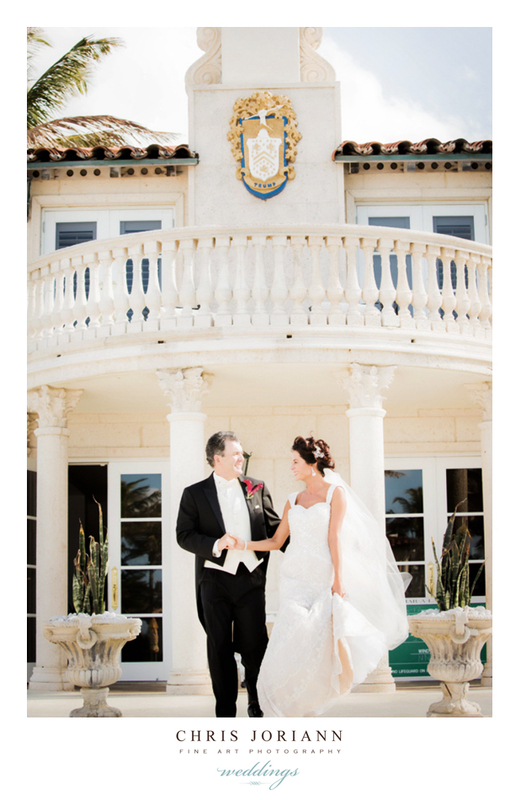 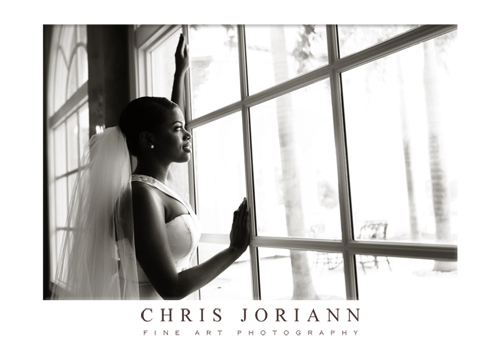 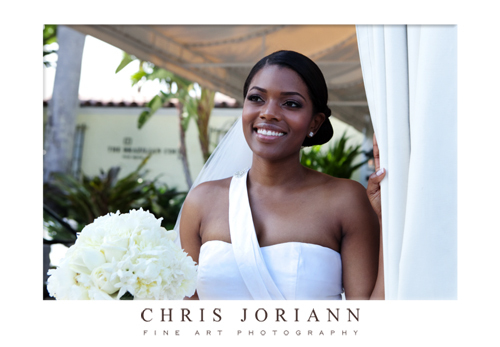 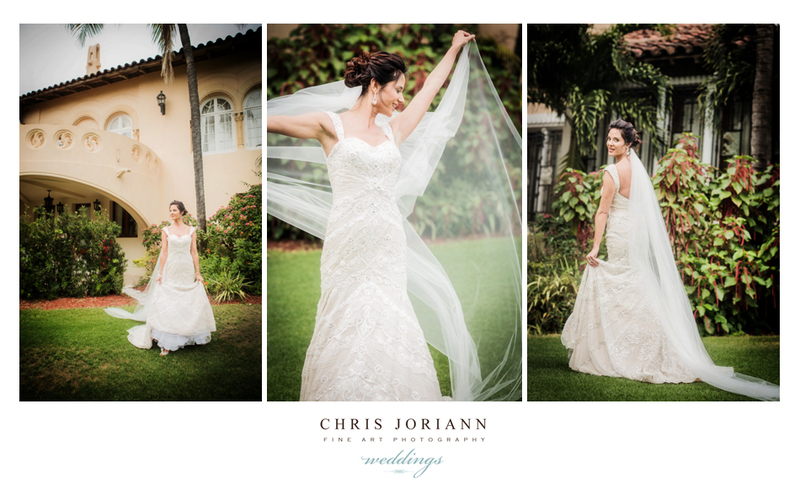 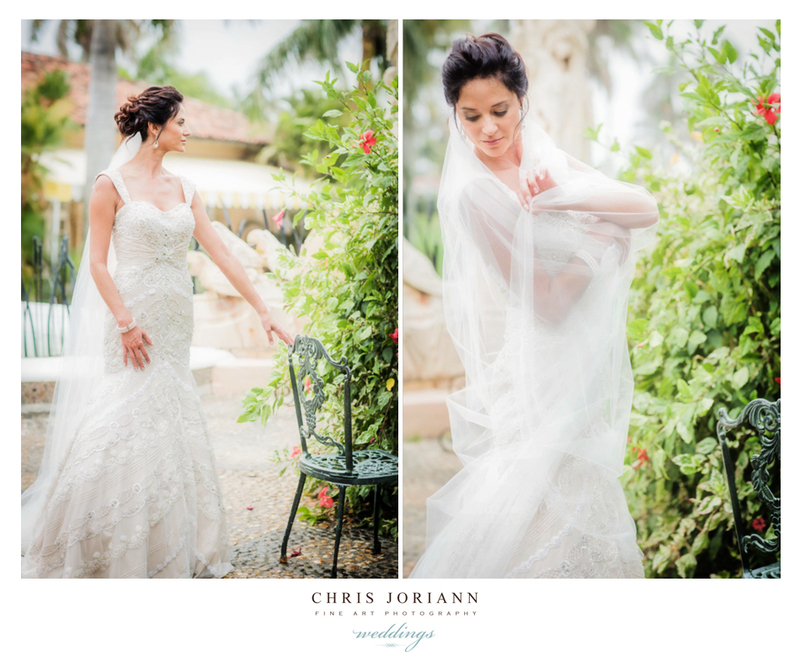 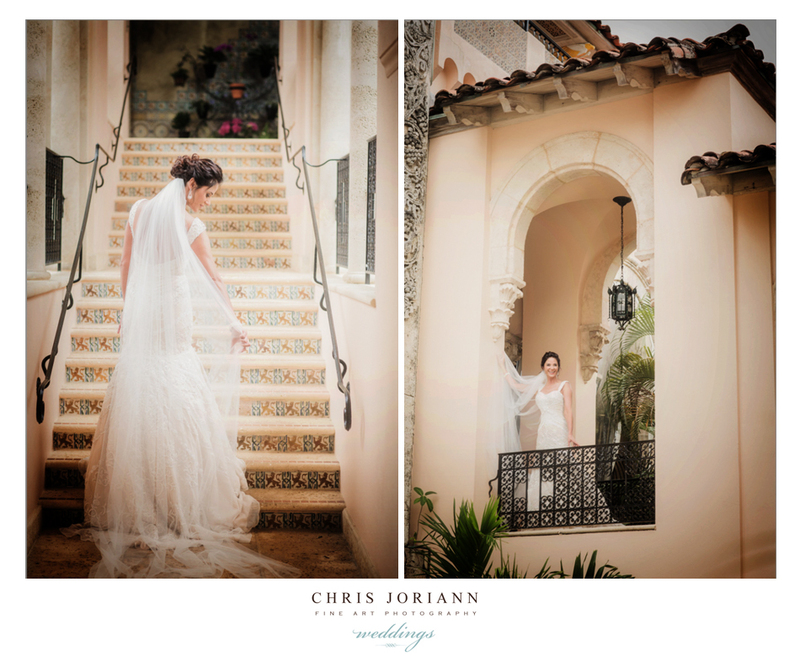 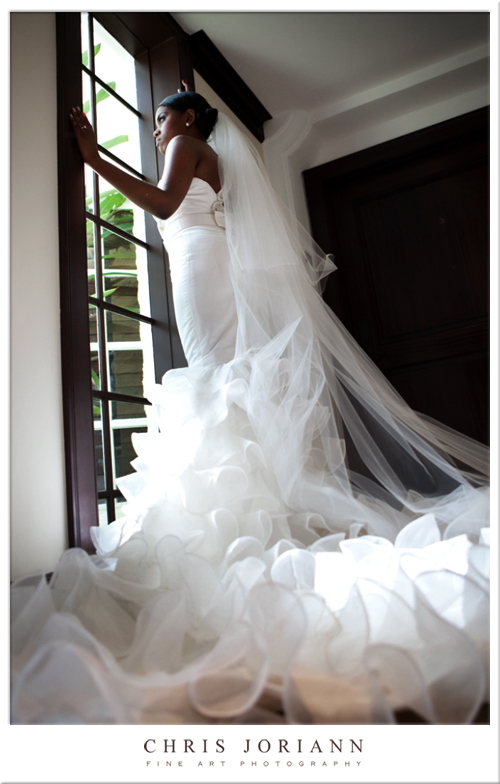 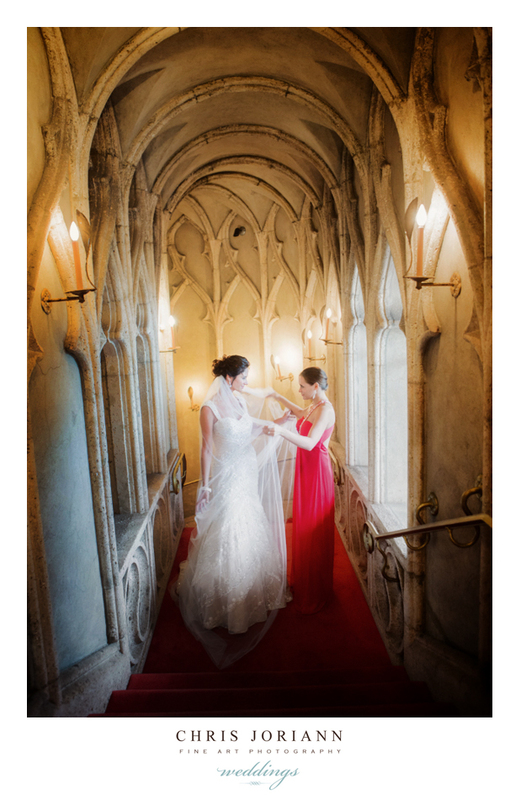 Earlier in the day, the bride readied at a private cottage on the Mar-a-Lago estate. 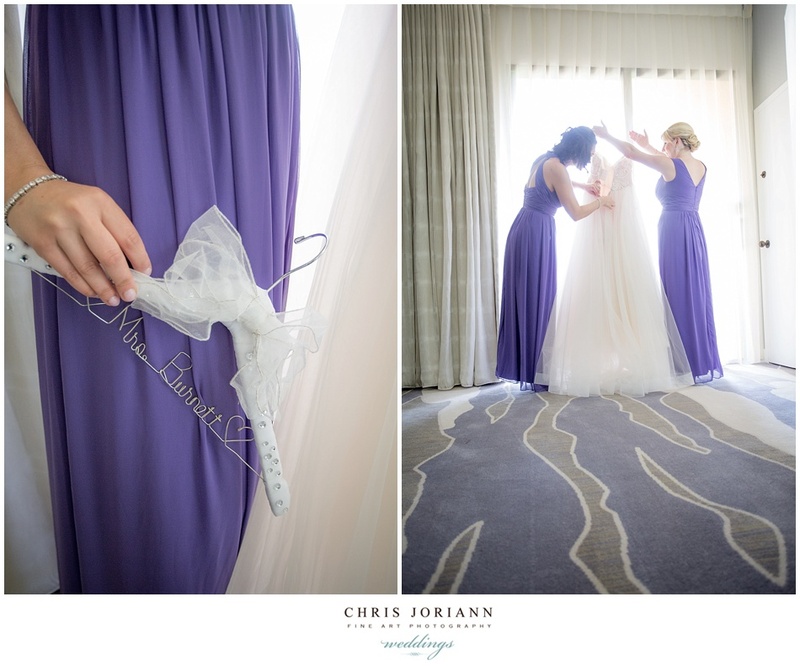 The gown, by Stephen Yearick, hung on a custom silk/pearl hanger found on etsy.com. 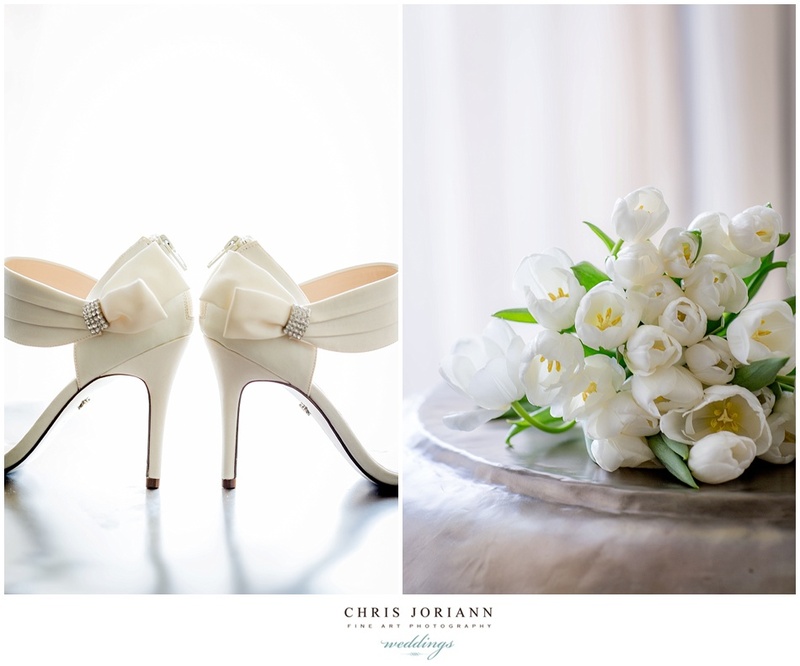 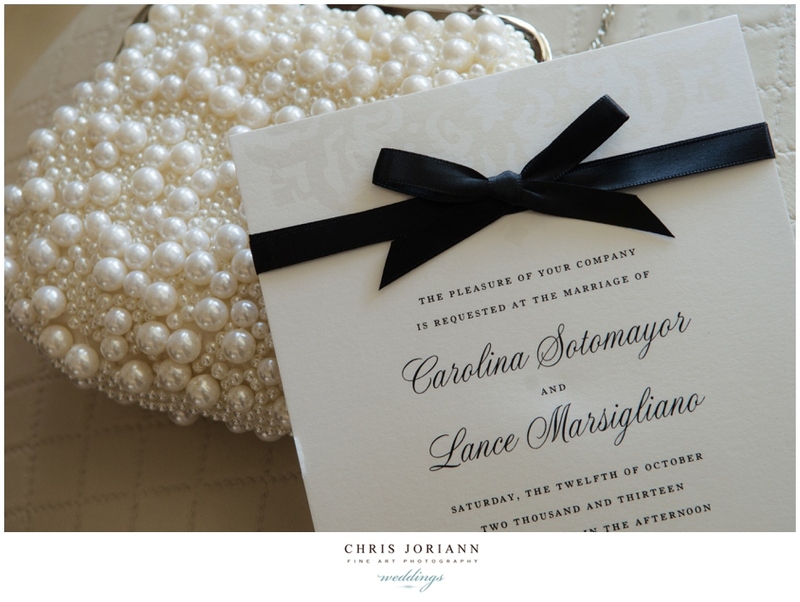 Love, love, love… these pearl bowed Badgley Mischka‘s. 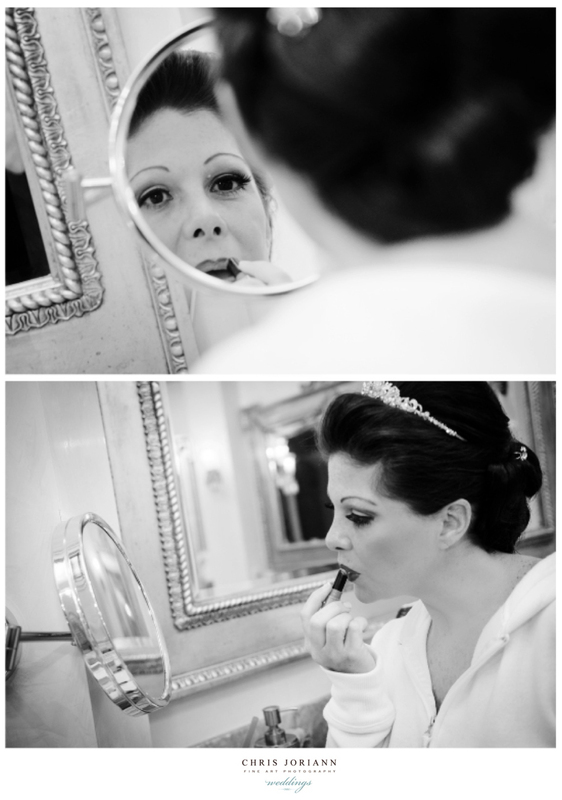 After the bride’s makeup was applied to perfection by Deb of Team Beauti. 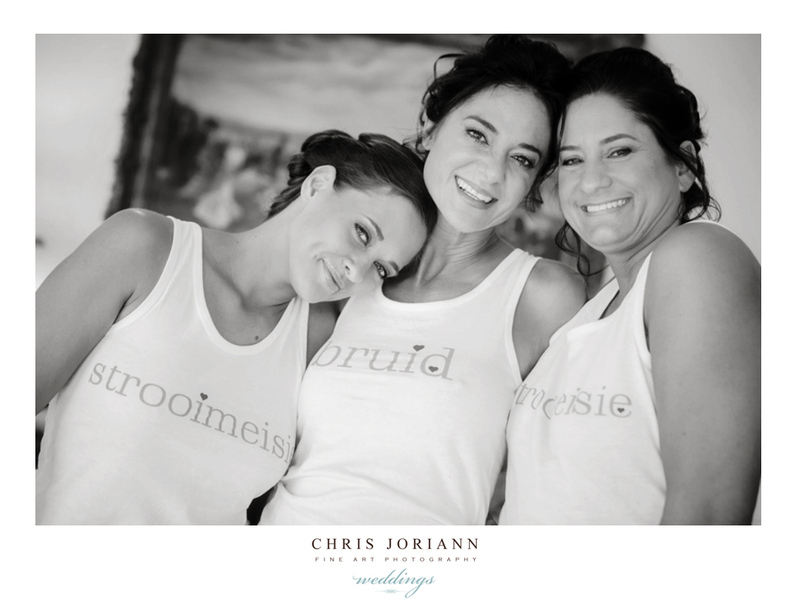 The bride got a hug from her bridal party, as they posed in these cute little tanks… who knew “strooimeisie” meant bridesmaid. 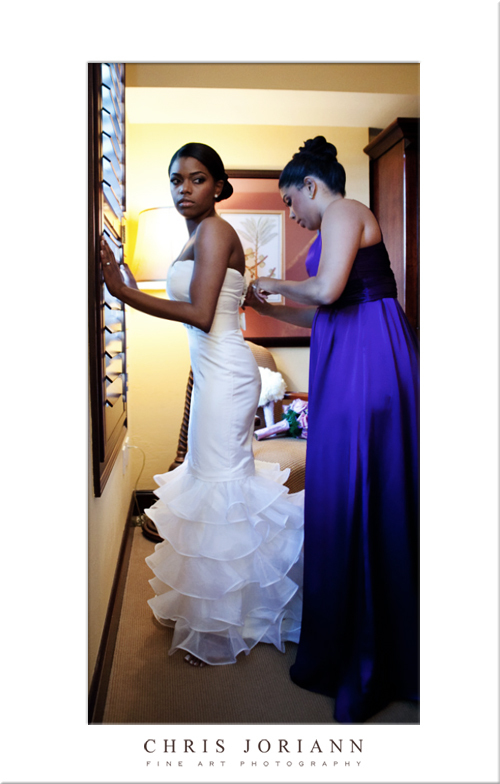 The girls helped her into her beaded gown. 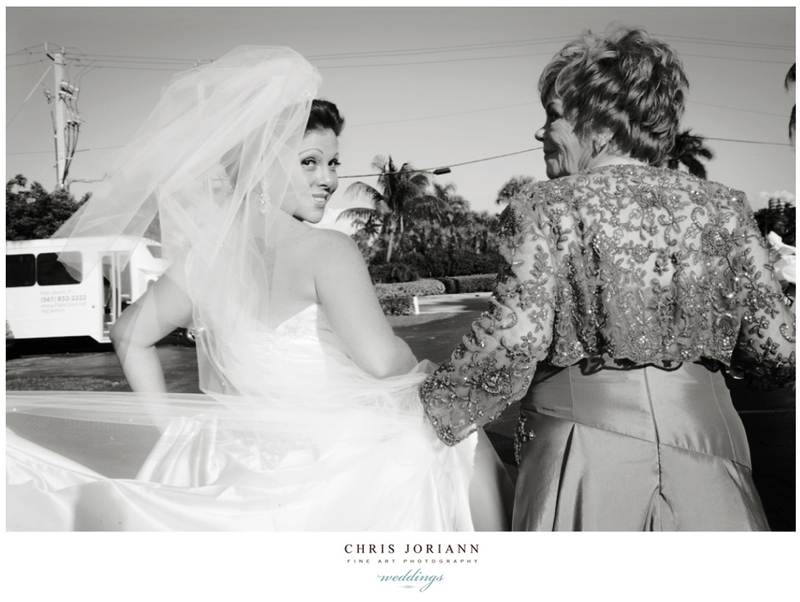 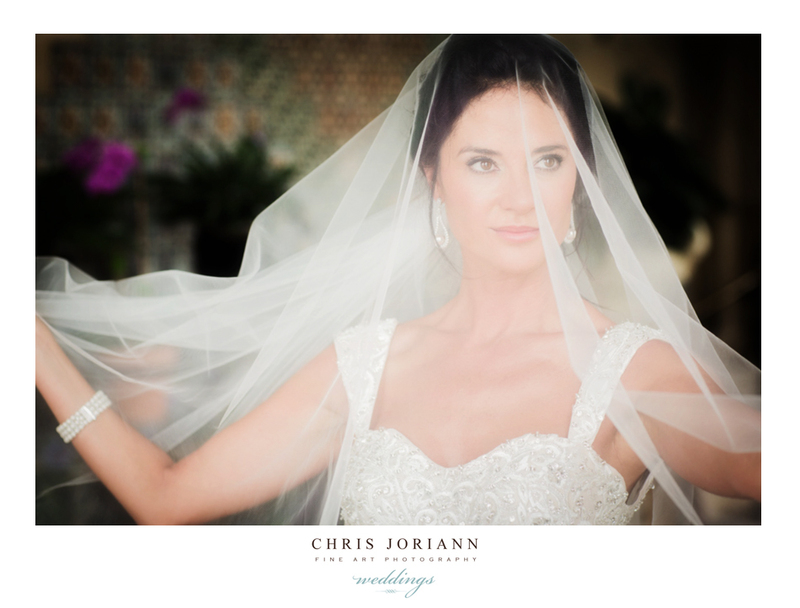 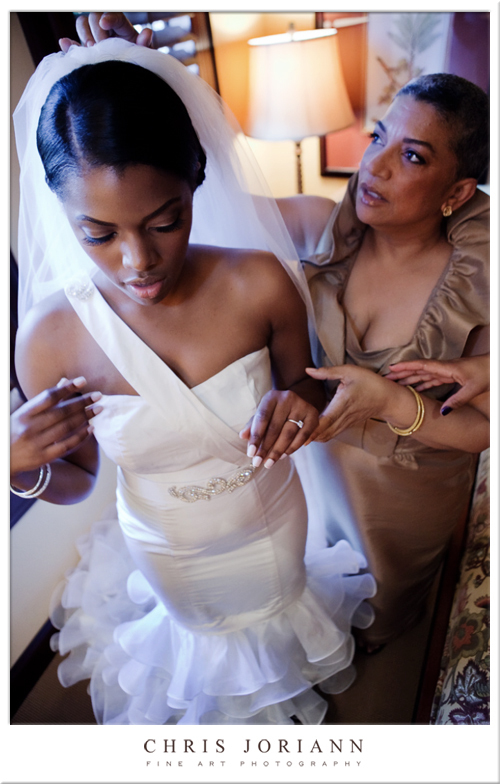 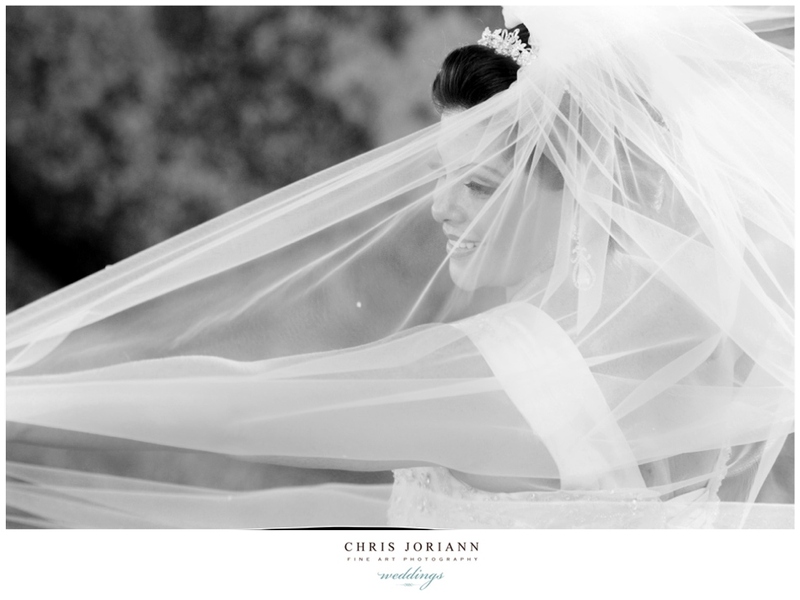 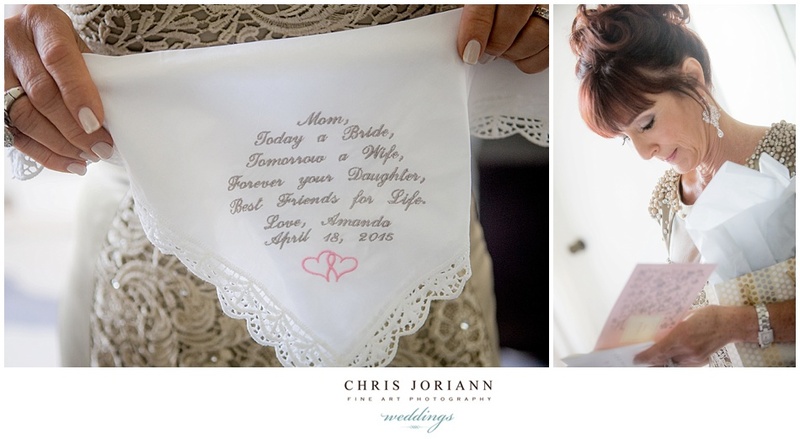 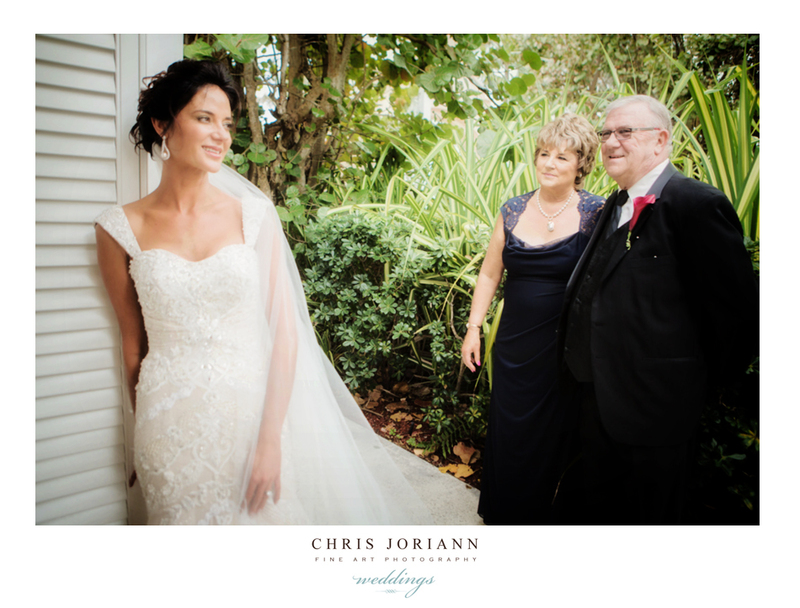 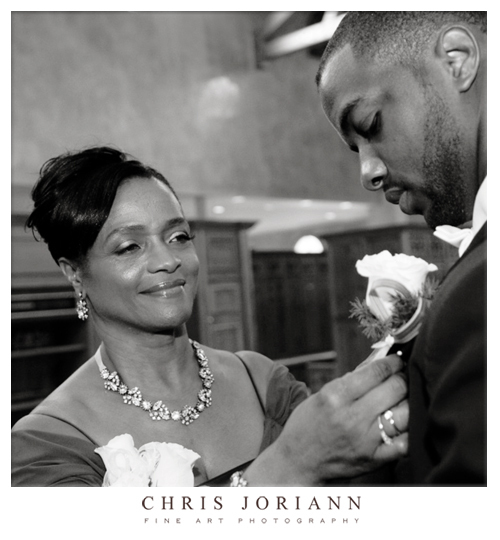 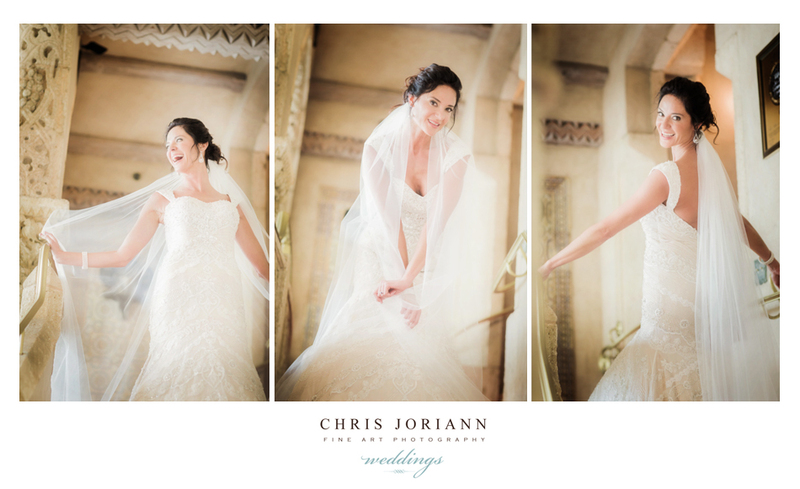 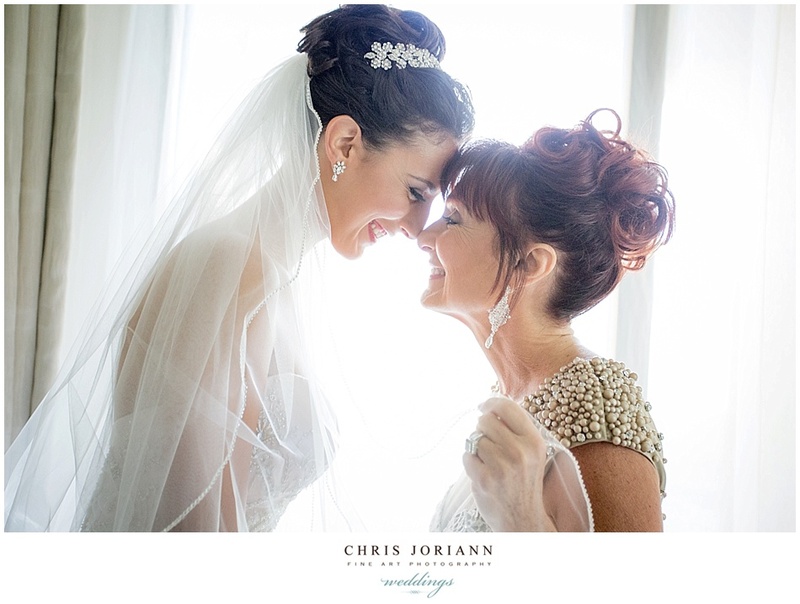 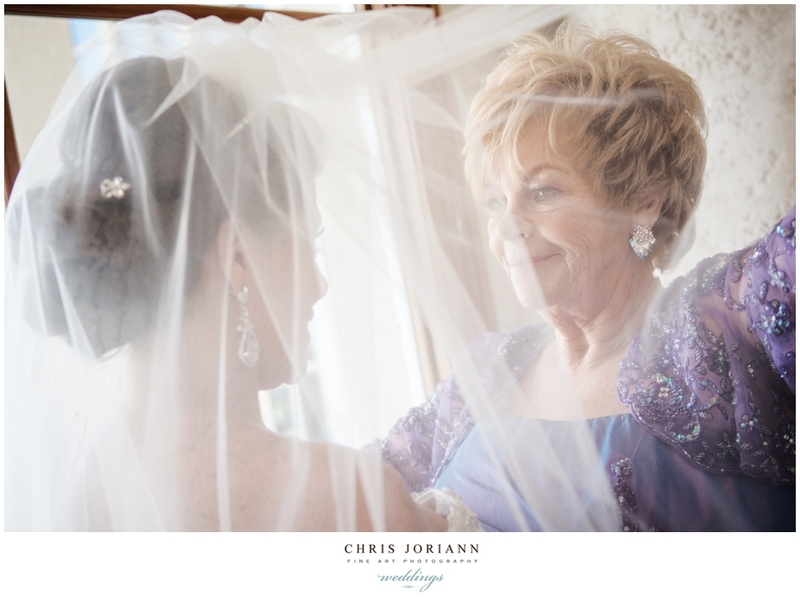 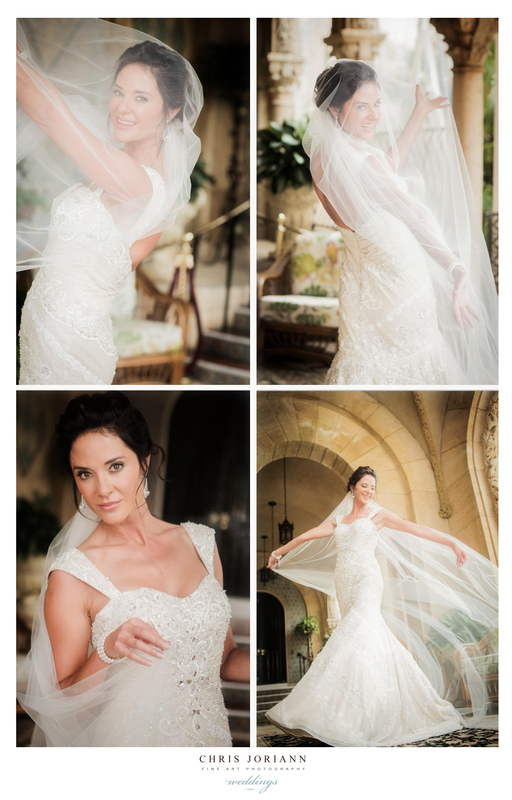 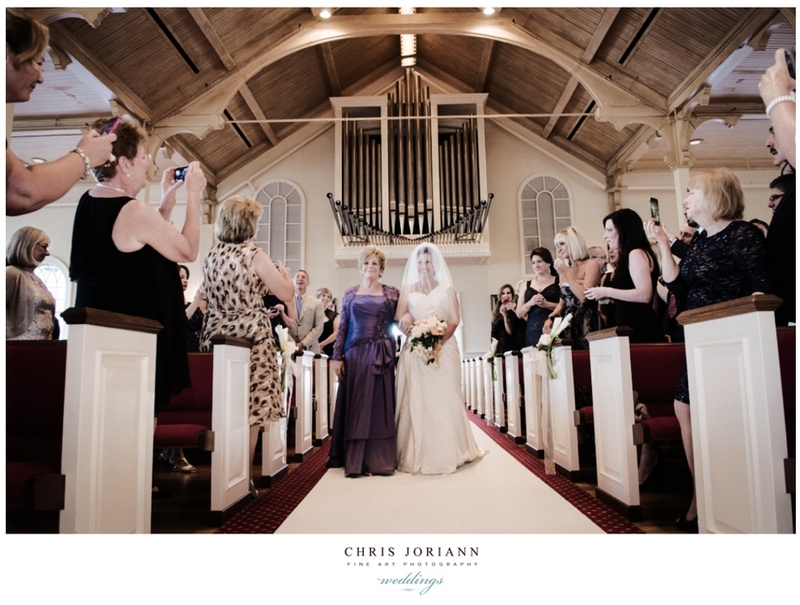 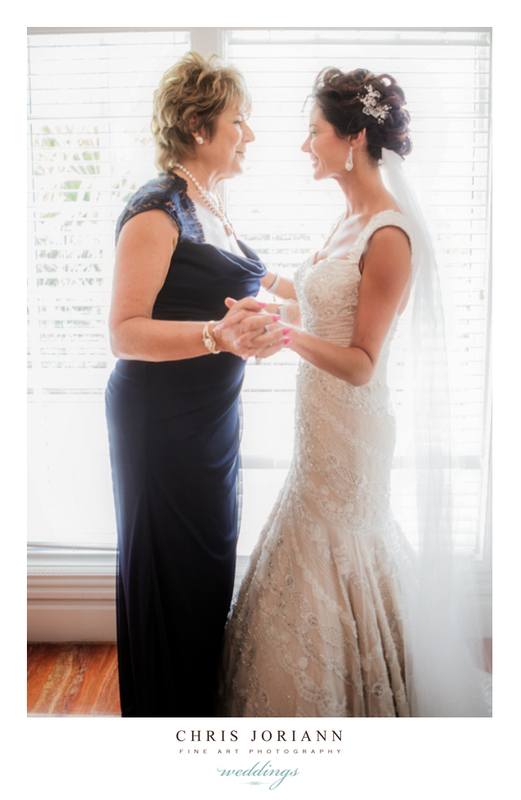 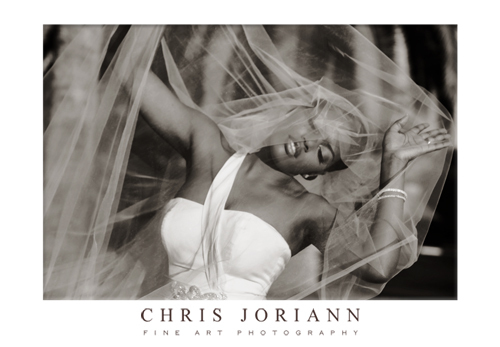 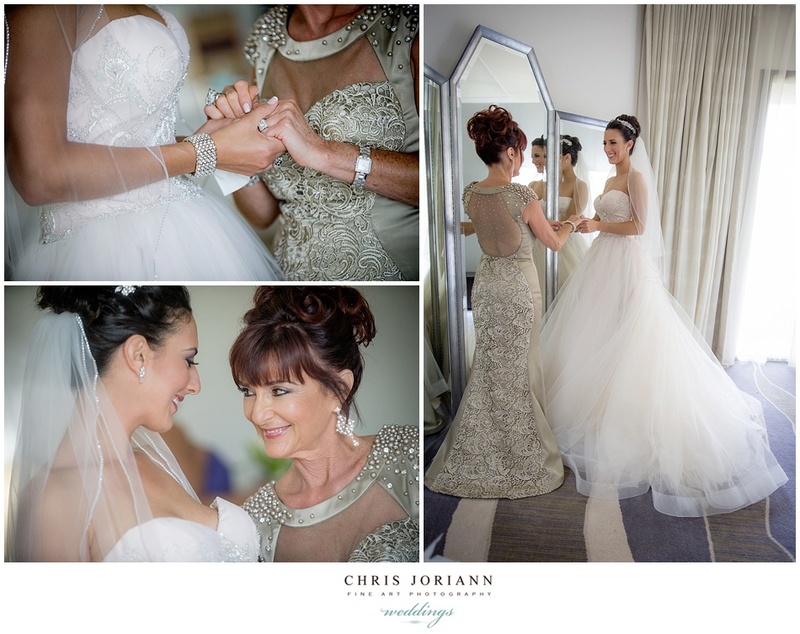 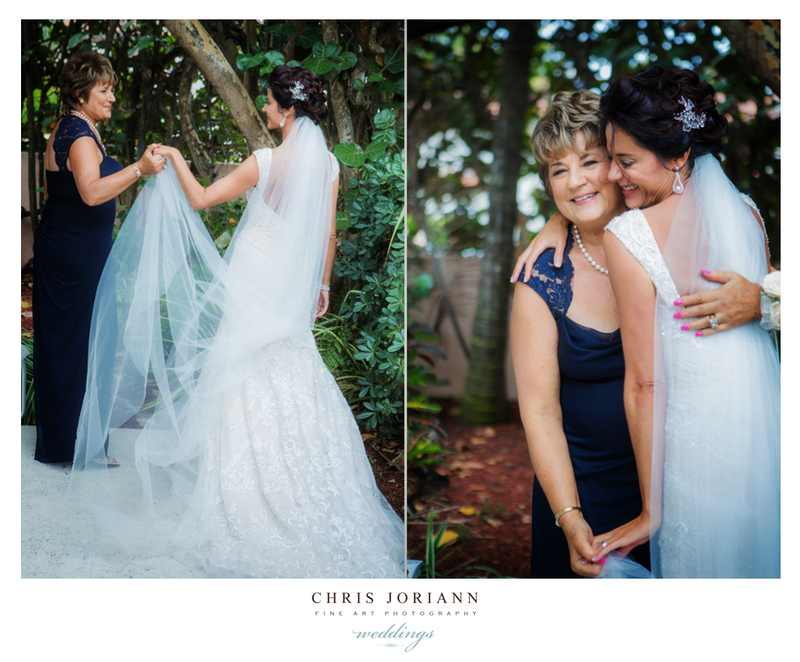 Then Colene’s Mom, who flew in flew in all the way from South Africa for the big day, added the final touch…the veil. 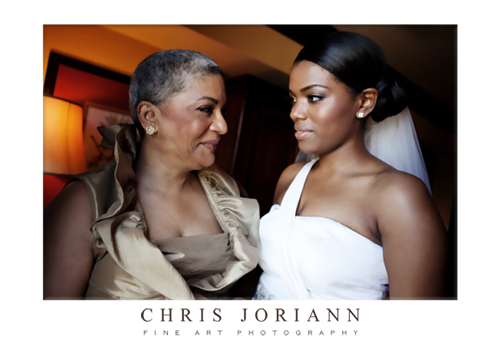 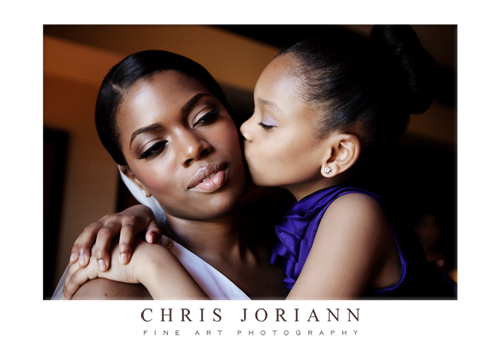 And shared a mother daughter moment. 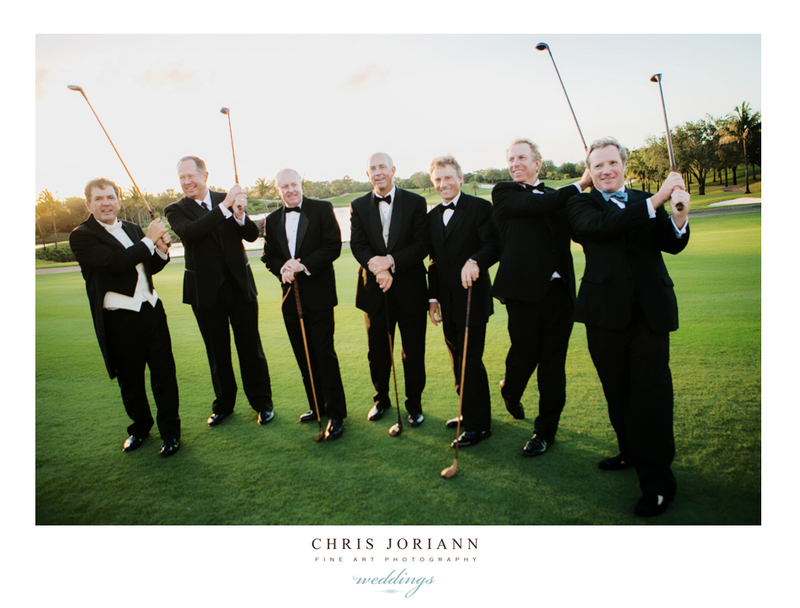 Meanwhile, over at Trump International Golf Club, the groom was prepping, with assistance from his groomsmen and grown children. 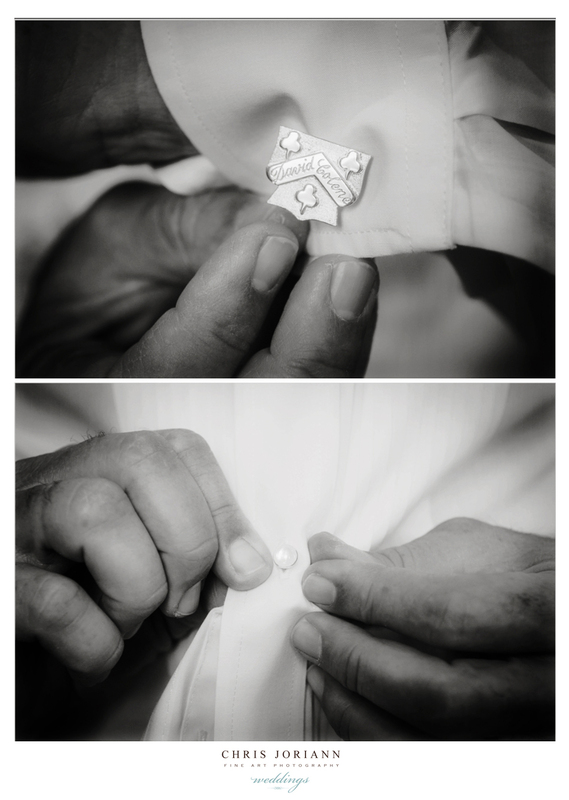 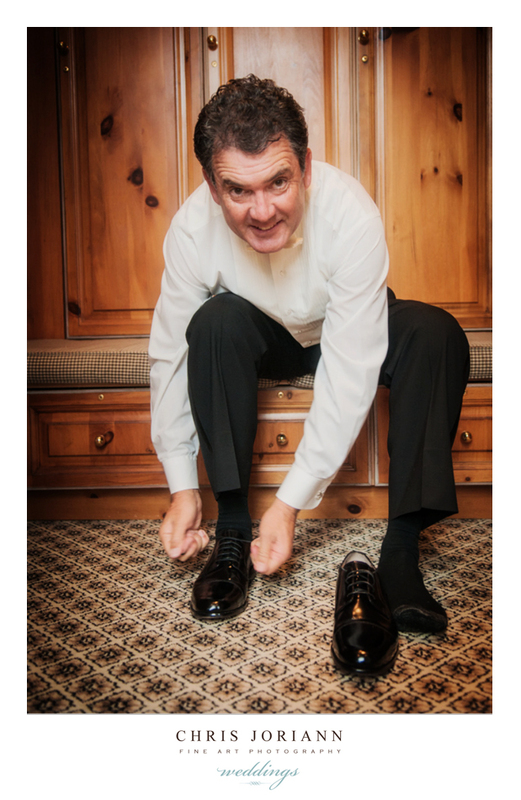 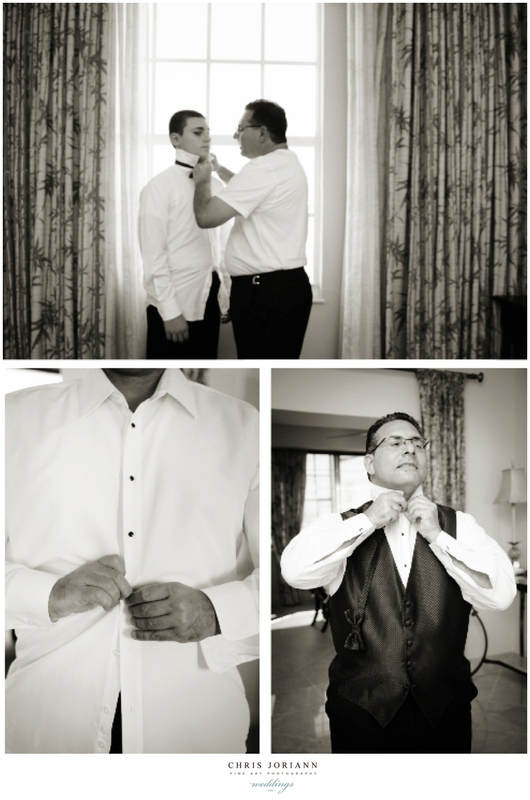 A little help for dad as he fastens his tie. 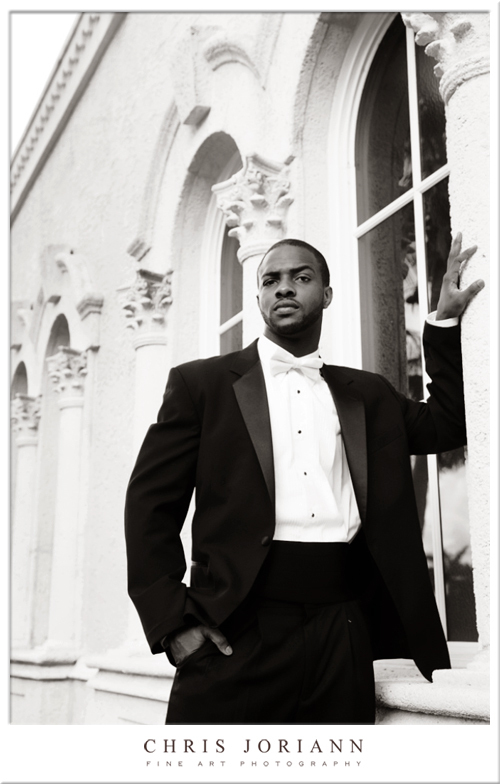 And viola, handsome as can be. 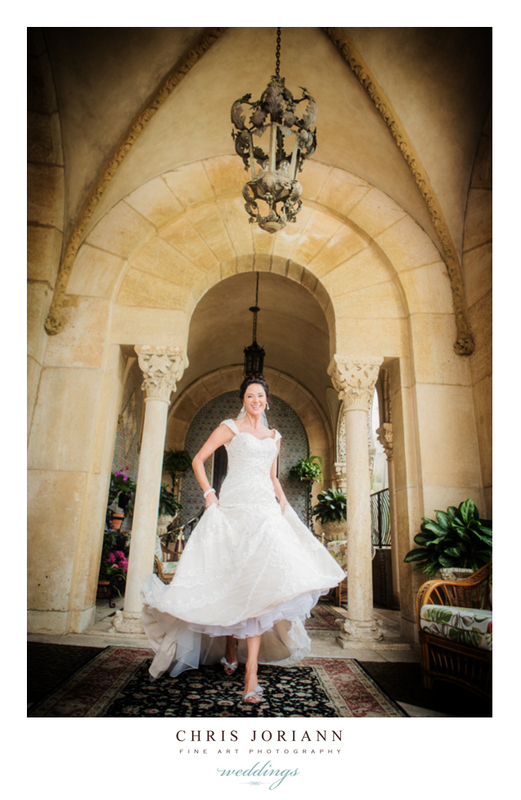 The bride, still over at Mar-a-Lago, had some time before leaving for church, so of course, we toured the property. 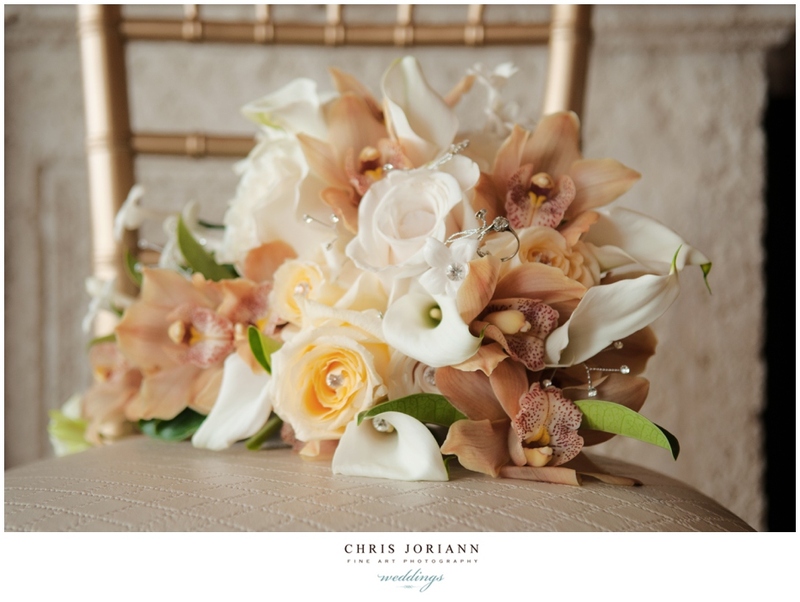 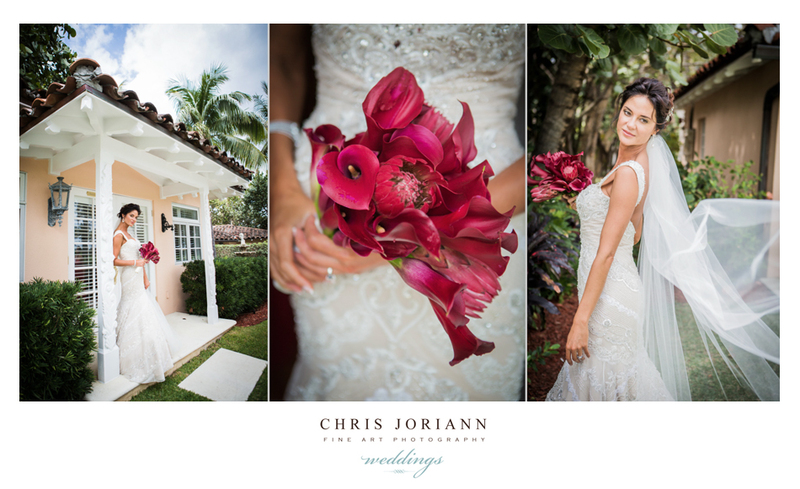 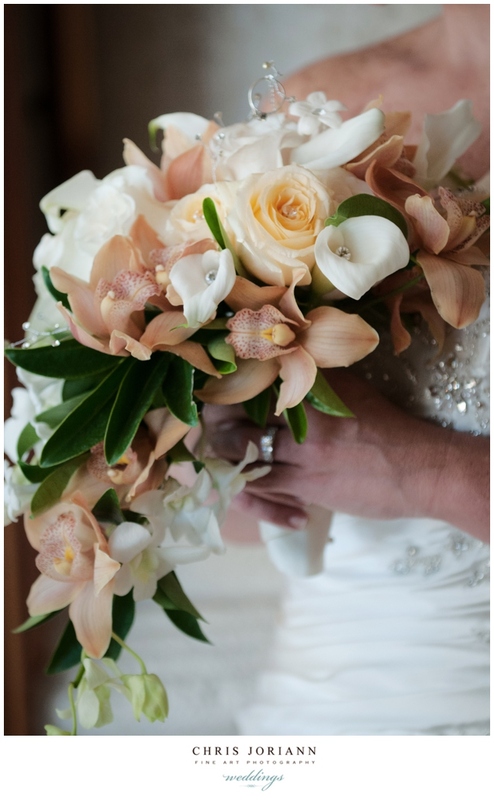 The bride’s bouquet, by Touch of Paradise, featured a cascade of mini red calla lilies with queen protea from South Africa, to remind the bride of her home. 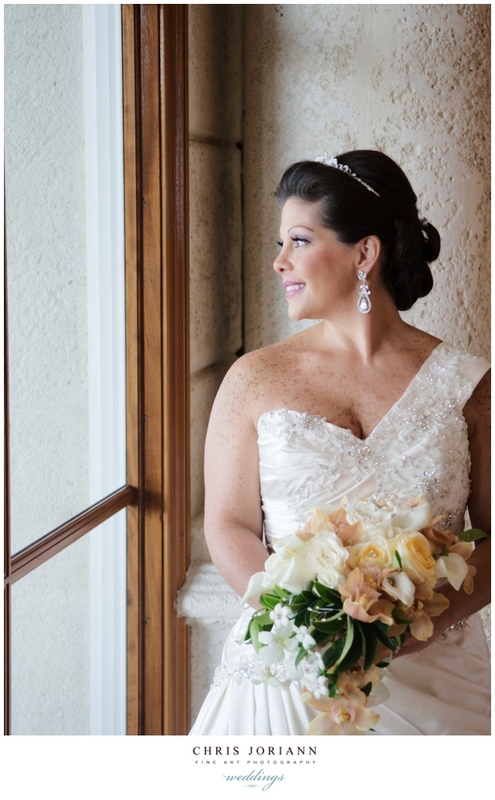 Custom designed hair hewelry from Bacio Bacio Bridal in wellington, adds just the right amount of bling to this romantic hair style by Whitney of Eleven Spa. 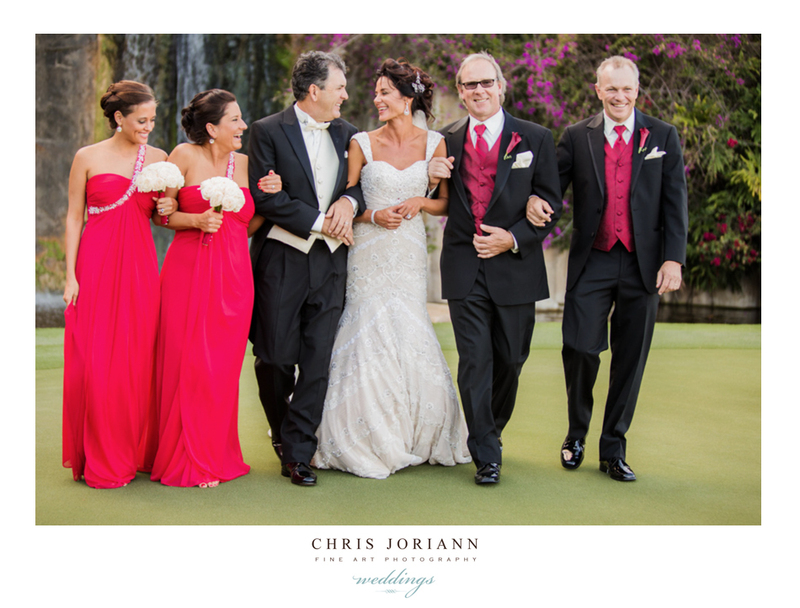 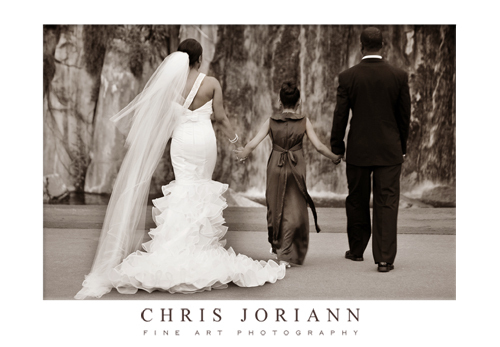 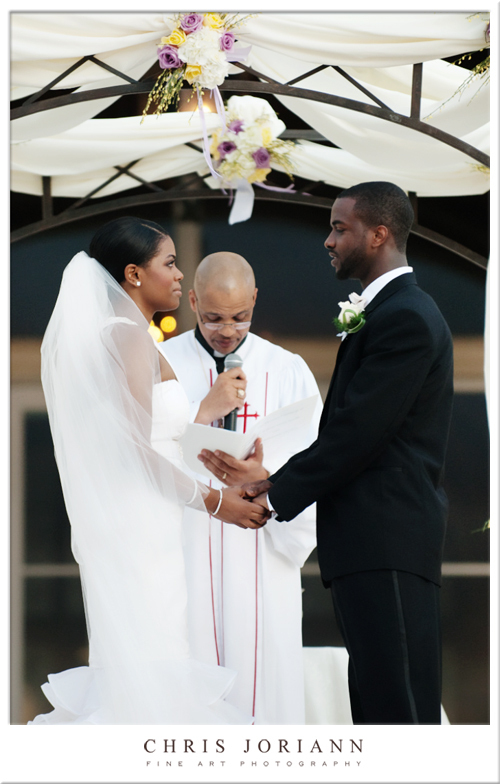 Both bride and groom enjoy one last moment with family, before they are church bound. 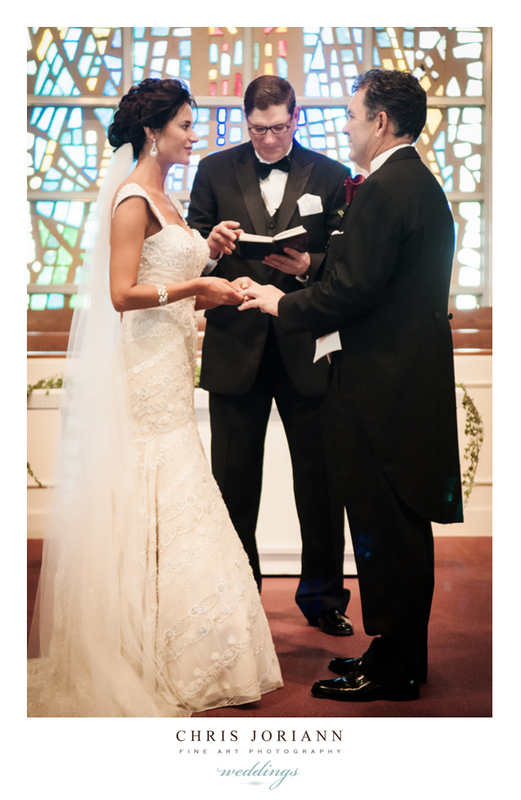 The nuptials, at Lakeside Presbyterian, were officiated by their friend and tour chaplain, so the ceremony held extra special meaning for the couple. 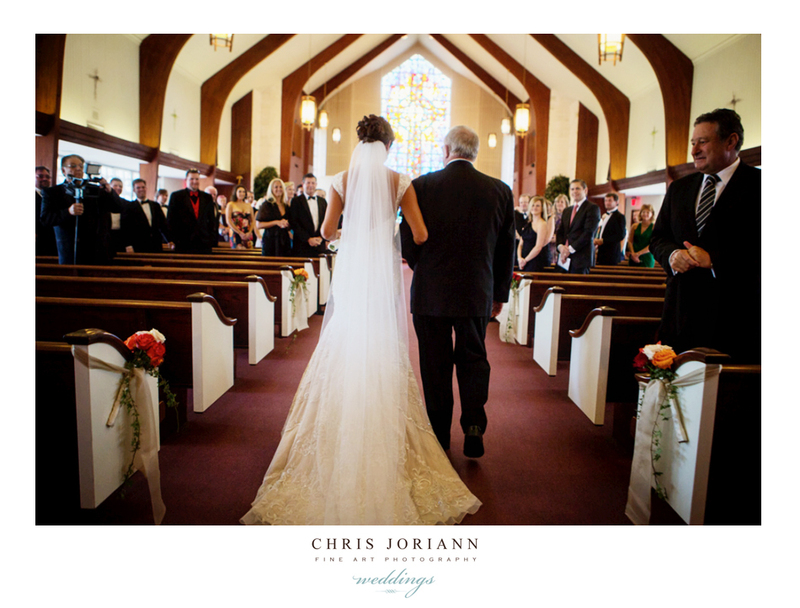 Daddy escorted his little girl down the aisle right into Davids arms. 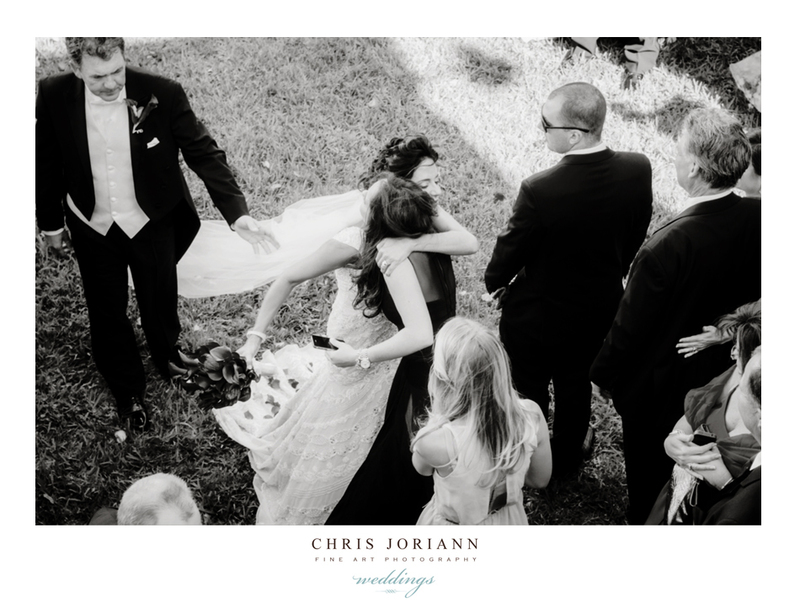 And gave the newlyweds a perfect send-off as they exited the church. 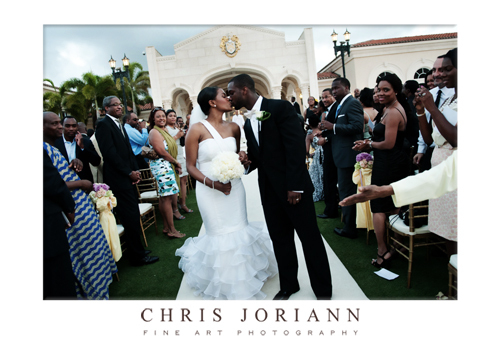 Here, is a birds-eye view of the guests posing with the couple in the courtyard before they depart. 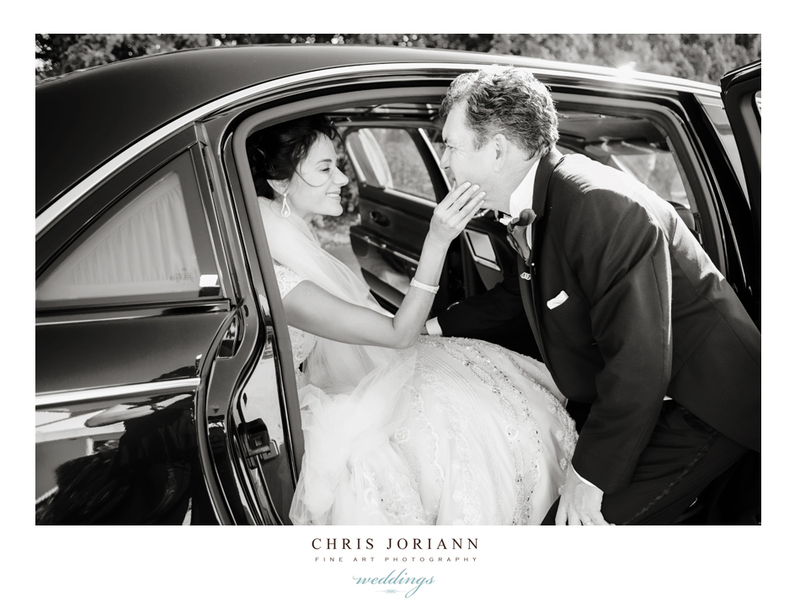 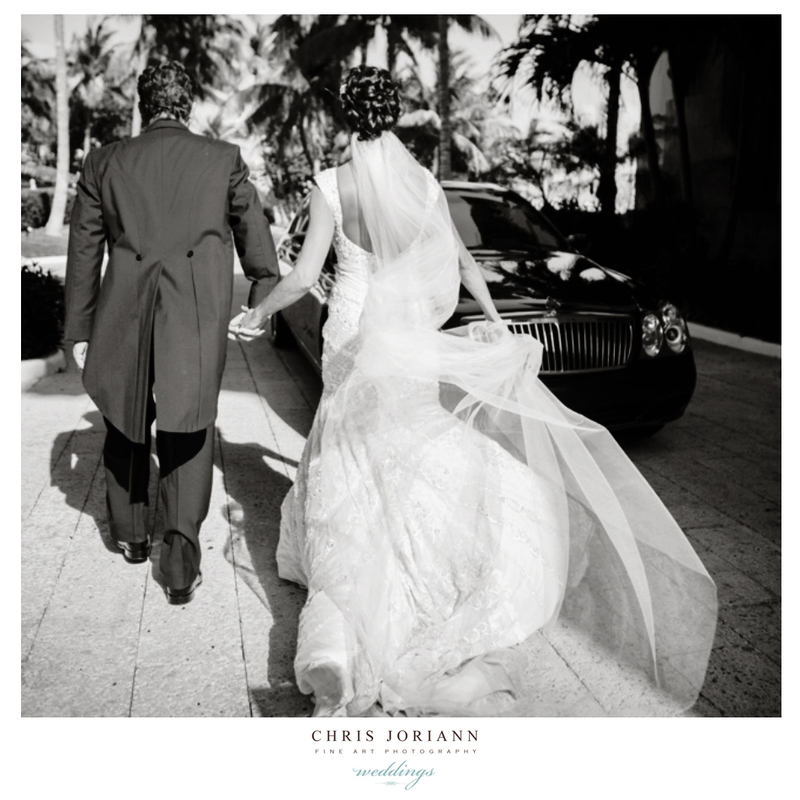 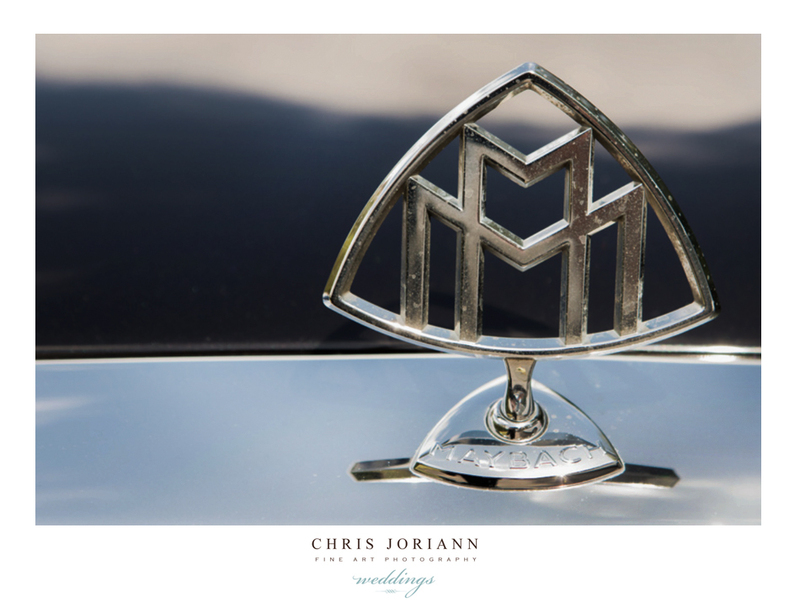 The chivalrous groom helps his bride into the awaiting Maybach, a gift to the couple from his friend Donald Trump. 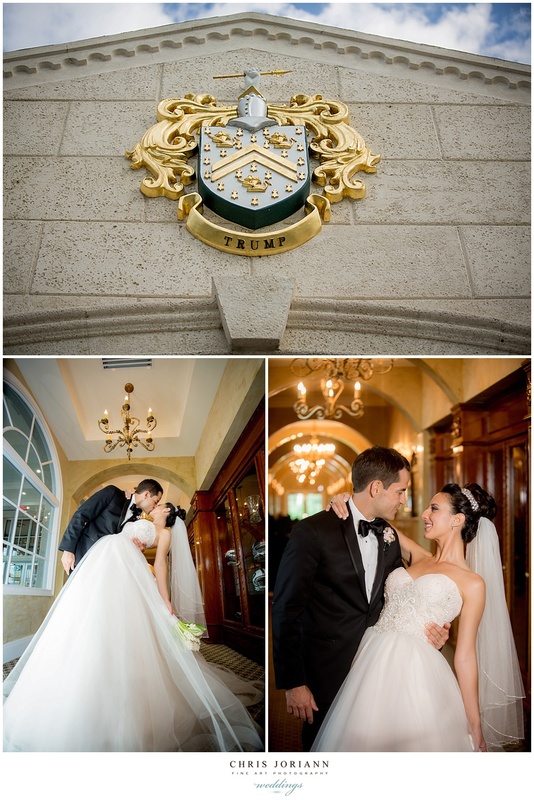 As guests headed to Trump International Golf Club for cocktails, the new Mr. + Mrs. 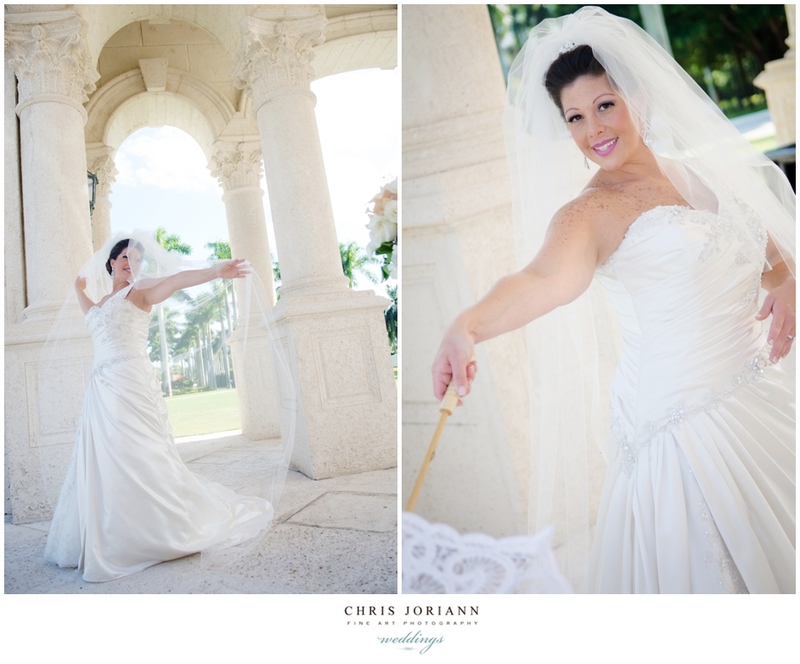 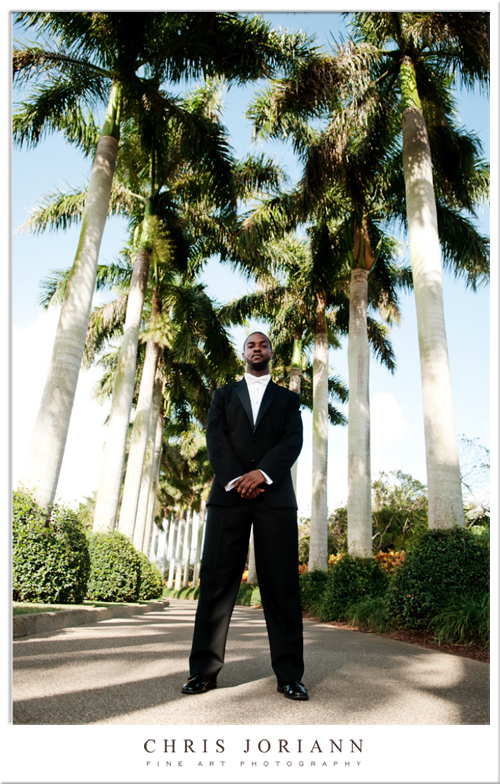 Frost stole away to Mar-a-Lago’s beach club for some oceanfront portraits. 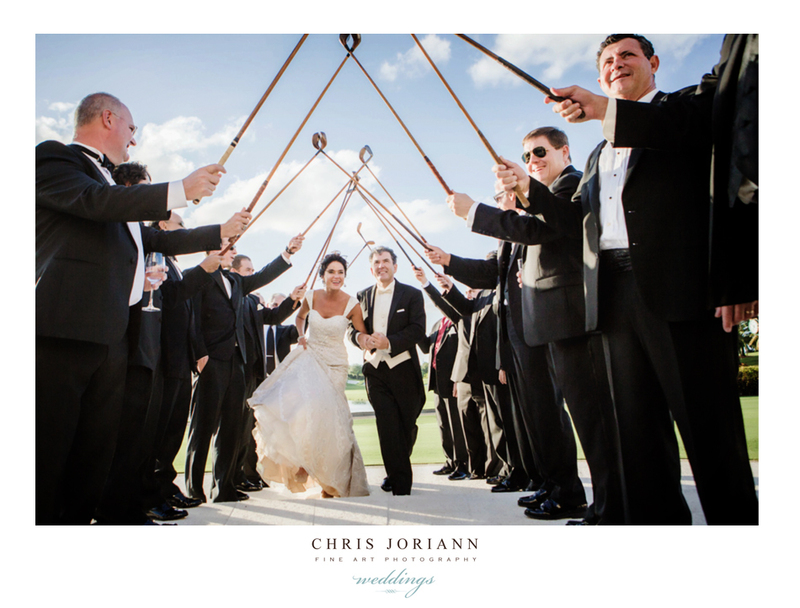 As the guests created an arch of antique clubs for their grand entrance. 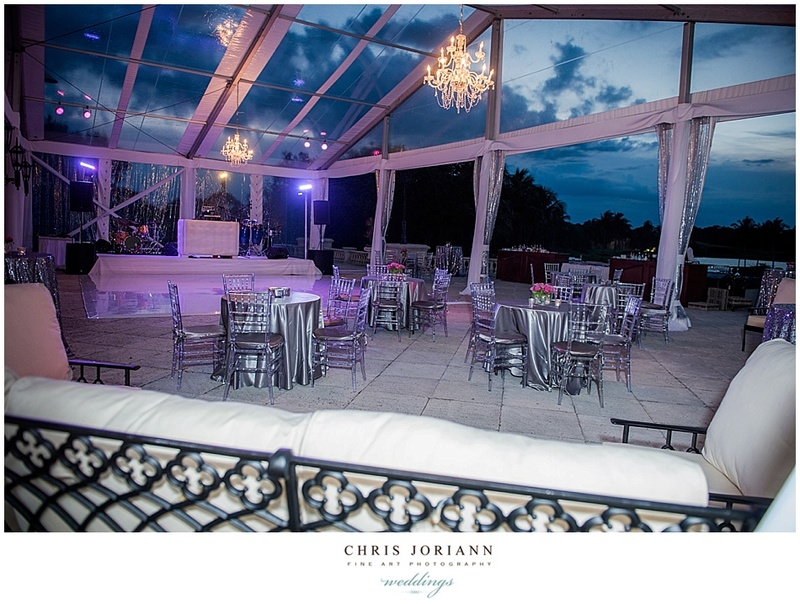 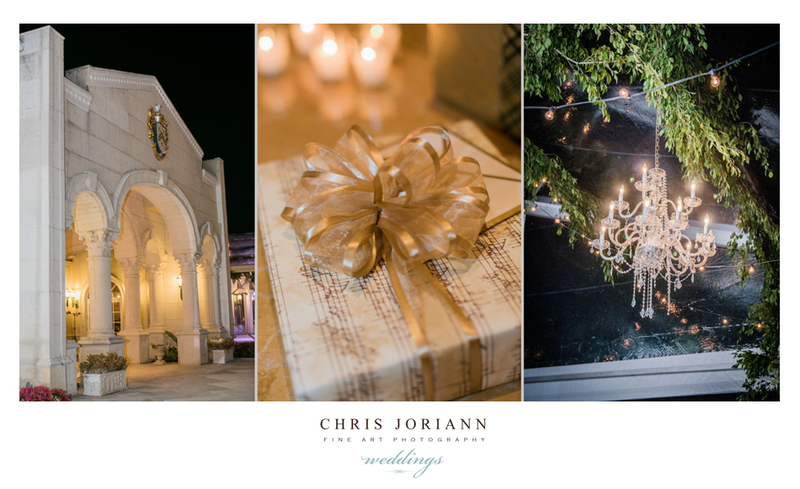 The went right onto the white monogrammed dance floor for their first dance, beneath the gazebo inspired tent dripping with ivy and crystal chandeliers. 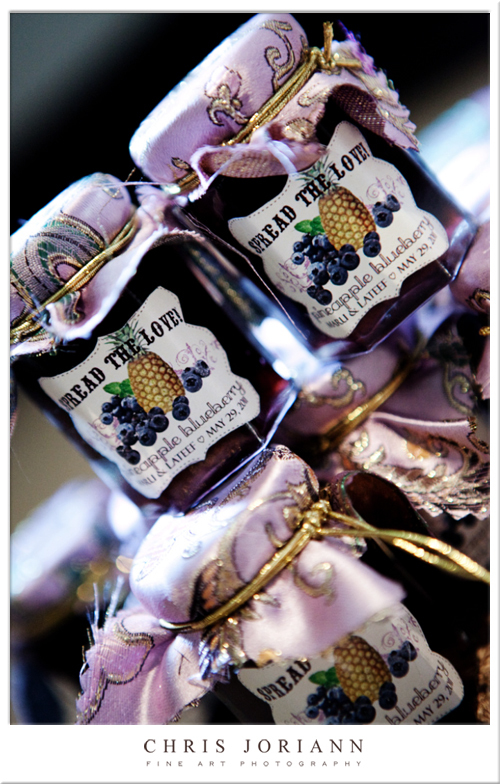 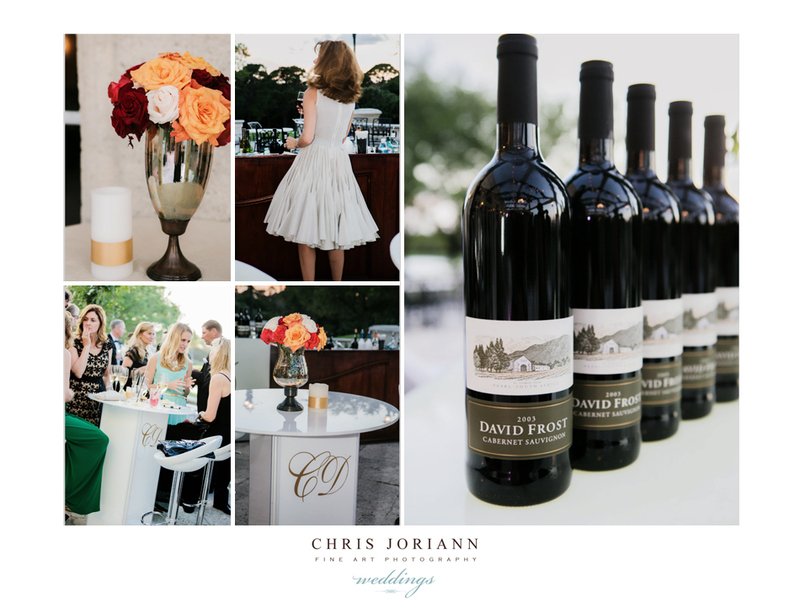 Guests enjoyed private label “David Frost Wines” from the groom’s own South African Vineyard. 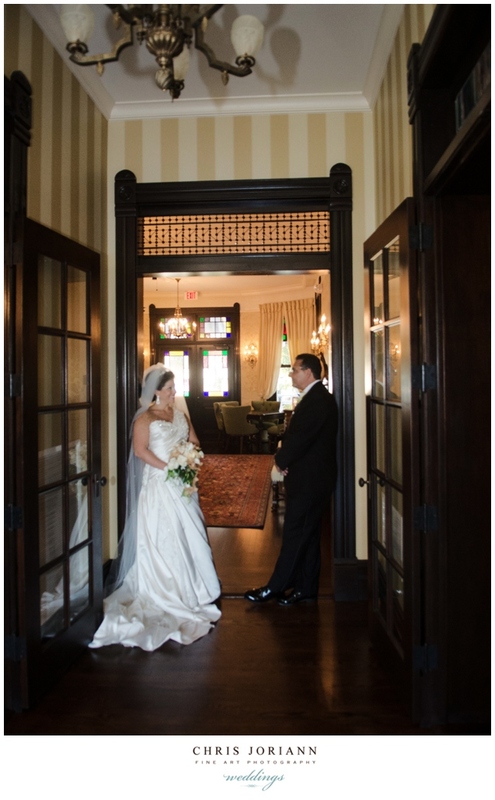 And one with her brother, before guests were called into the lavish dinner that awaited in the adjacent ballroom. 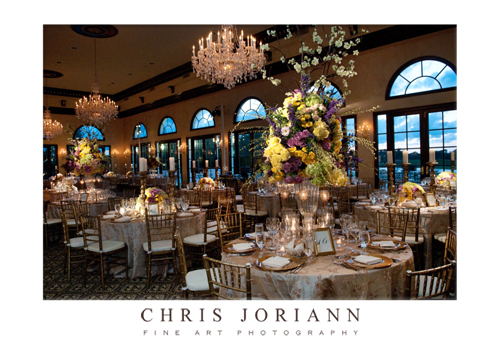 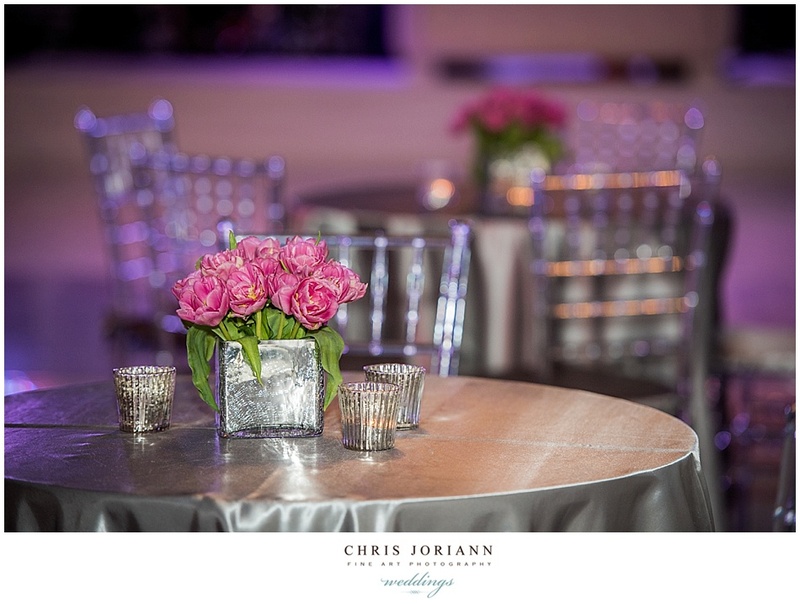 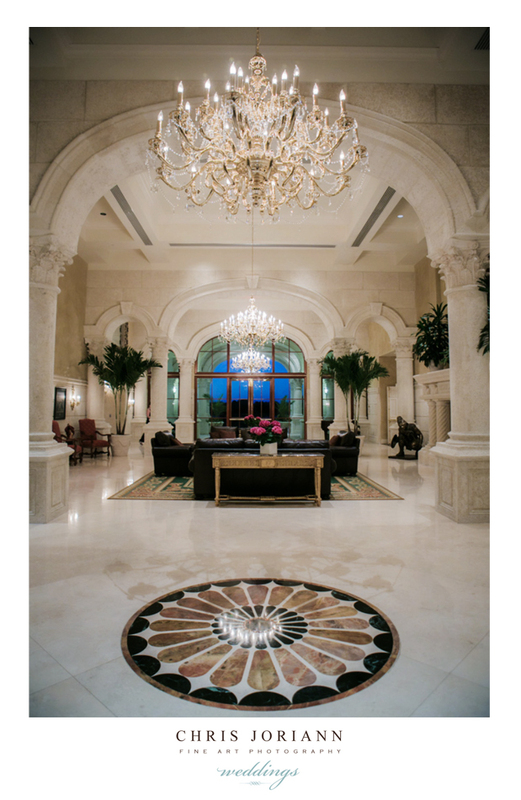 The breathtaking reception decor was designed by David Negri, of DN Concepts Event Design + Management. 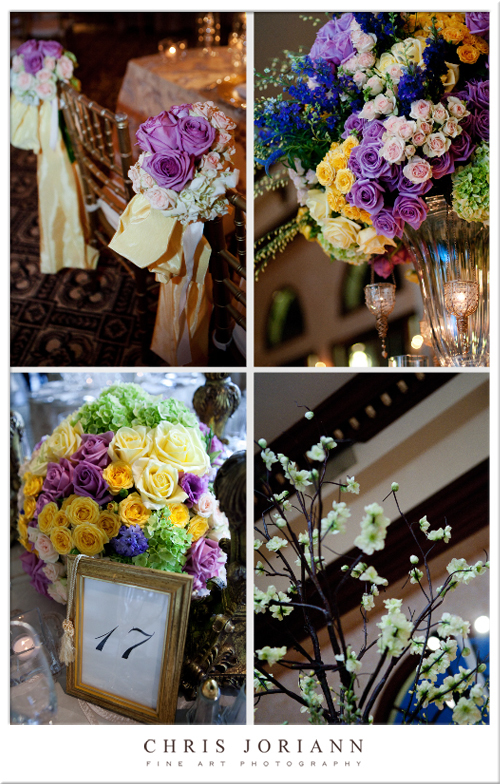 Florals were created by Touch of Paradise. 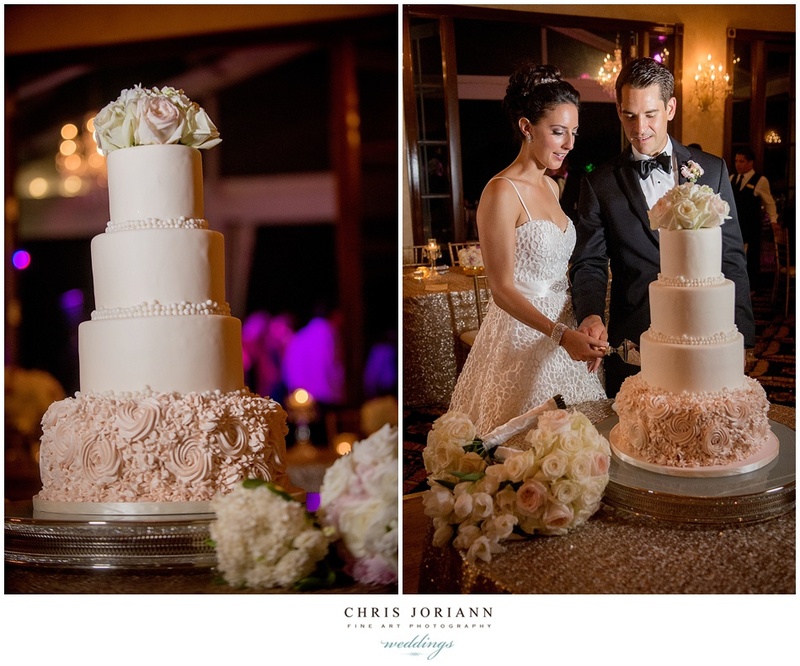 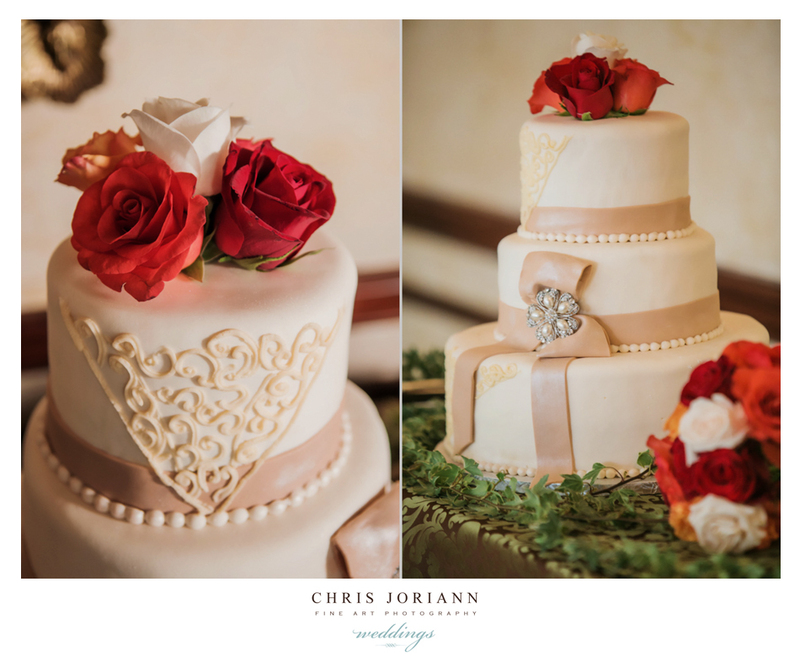 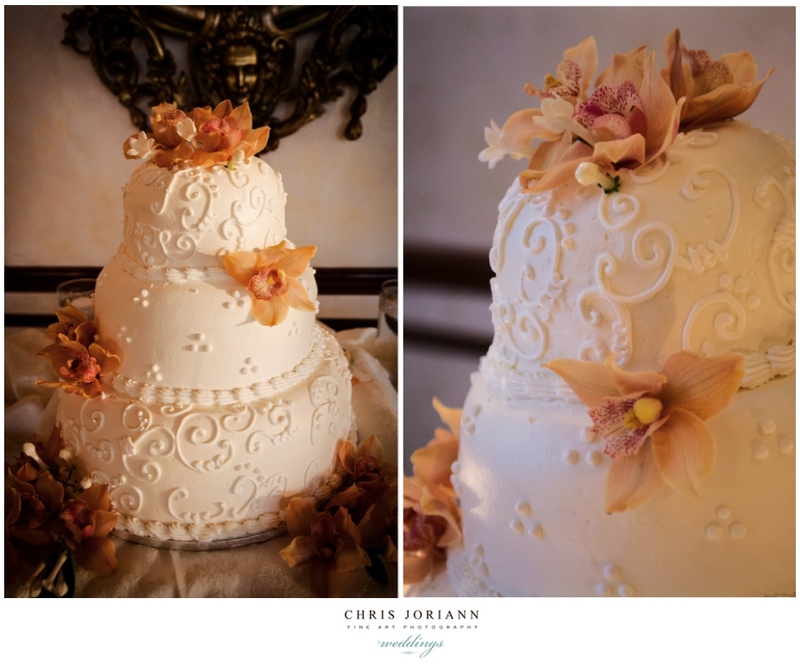 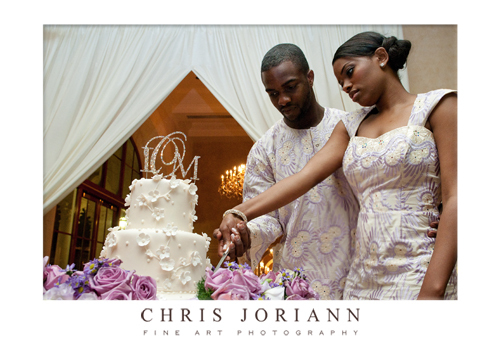 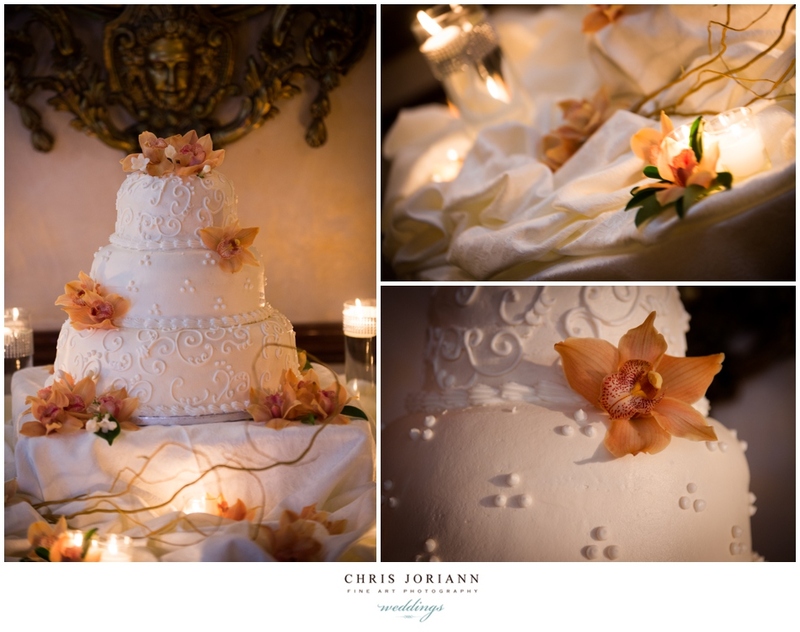 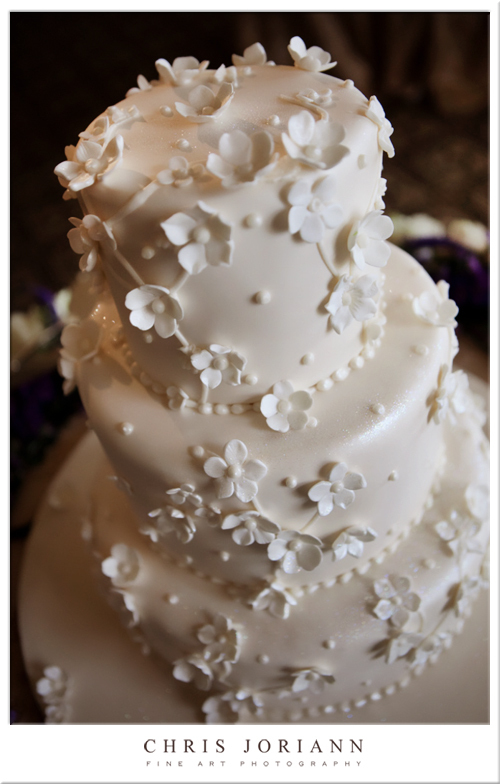 The cream fondant cake,with taupe ribbon and crystal accent, was created by Johnson’s Custom Cakes of Wellingon. 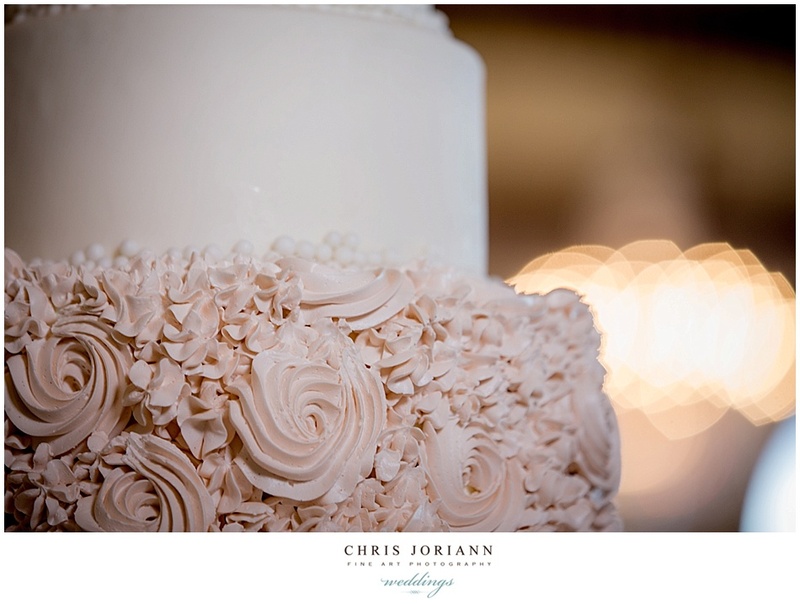 Inside, a delicious chocolate mocha cake with chocolate ganache and raspberry filling. 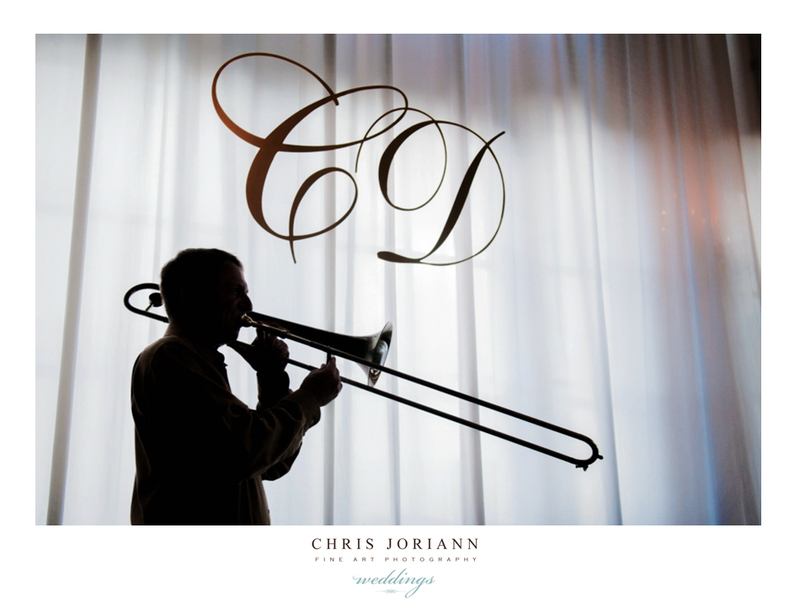 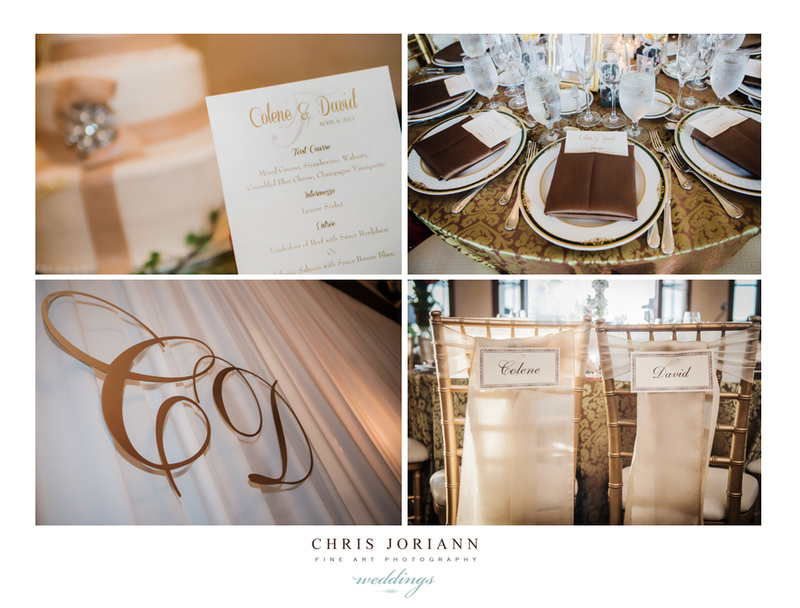 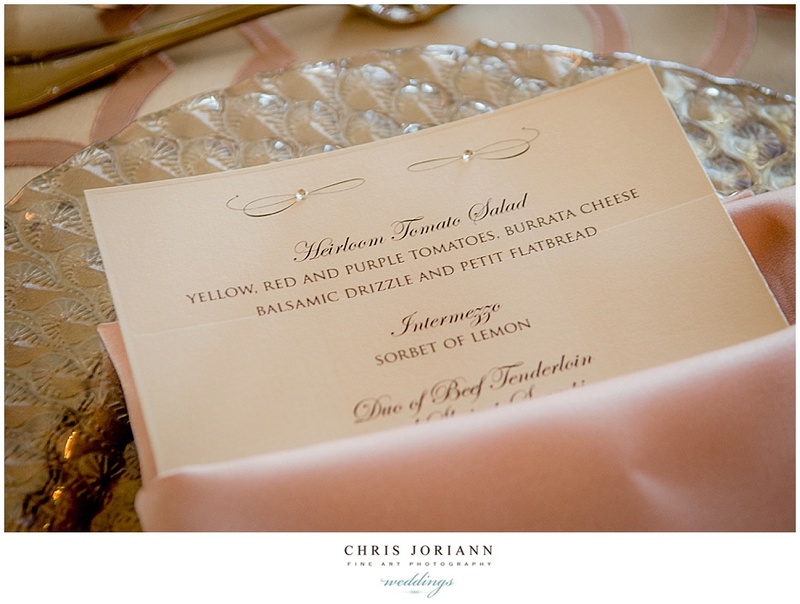 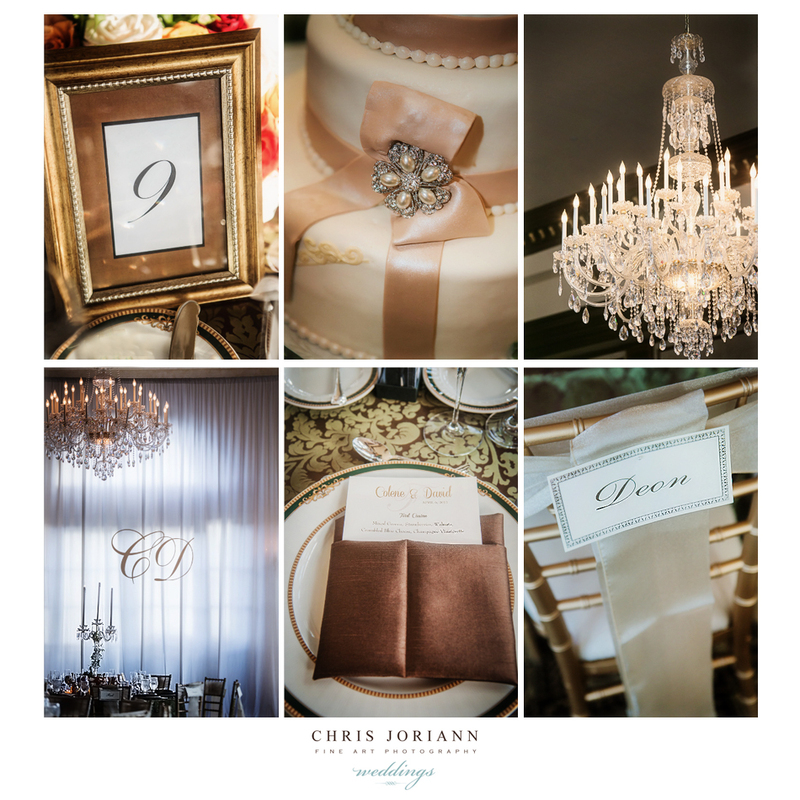 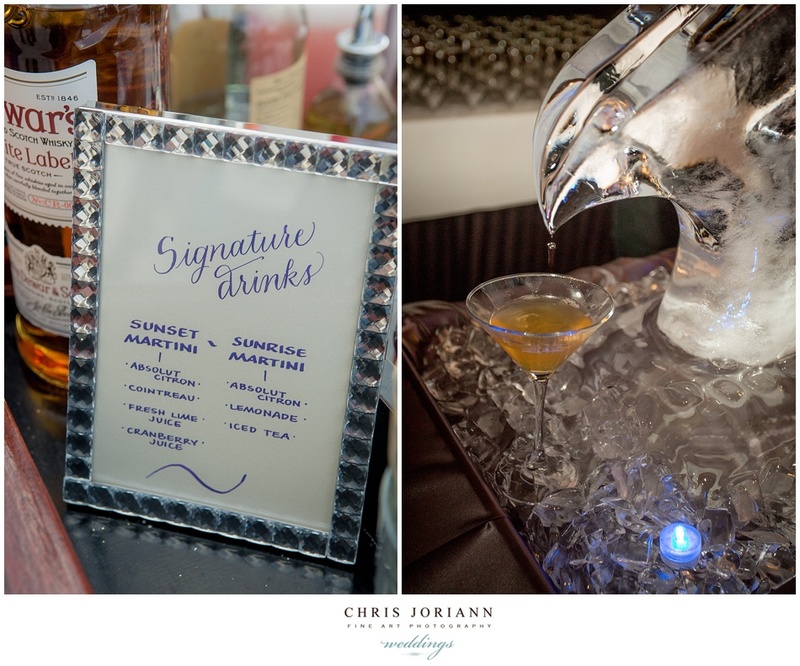 Custom monogram by Lori Jayne, and Drapery and Lighting by Globadyne, both for DN Concepts. 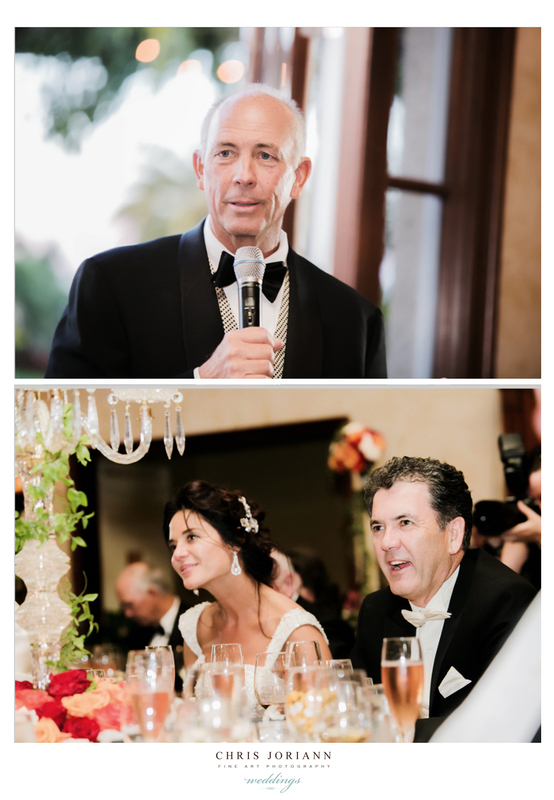 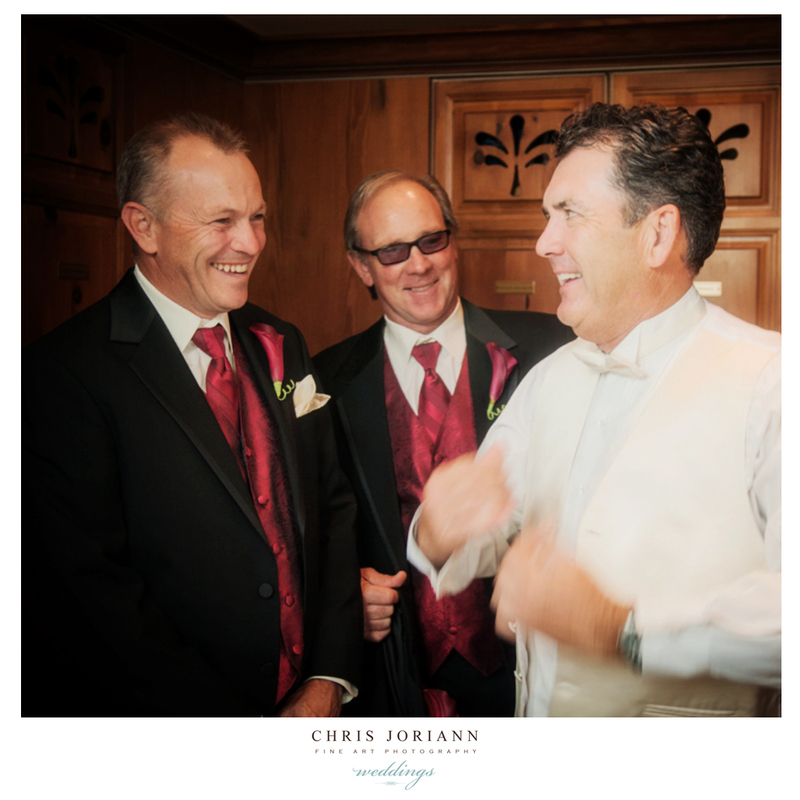 Dear friend and pga tour mate, Tom Lehman gave the opening toast, as the happy couple looked on in laughter. 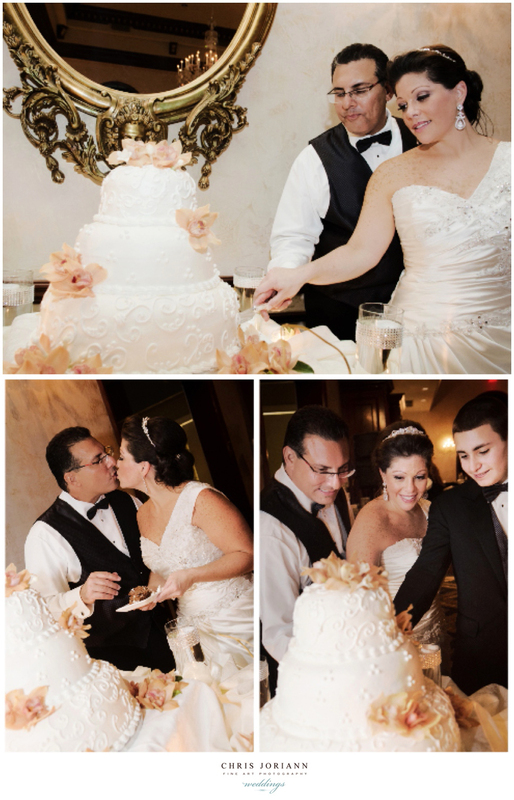 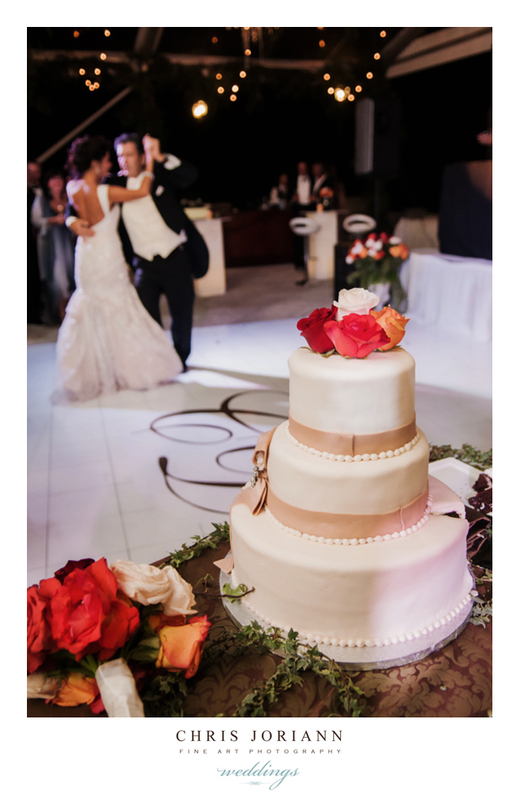 After the 4 course dinner was complete, the cake was cut followed by the bouquet and garter tosses and more dancing. 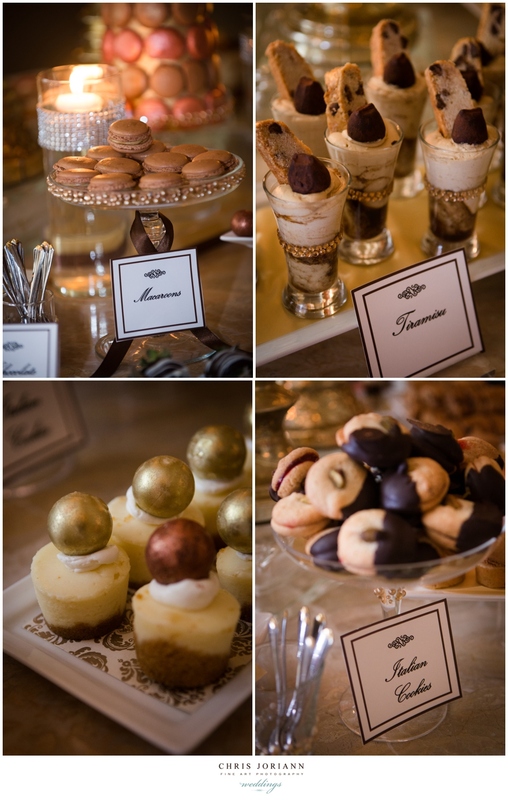 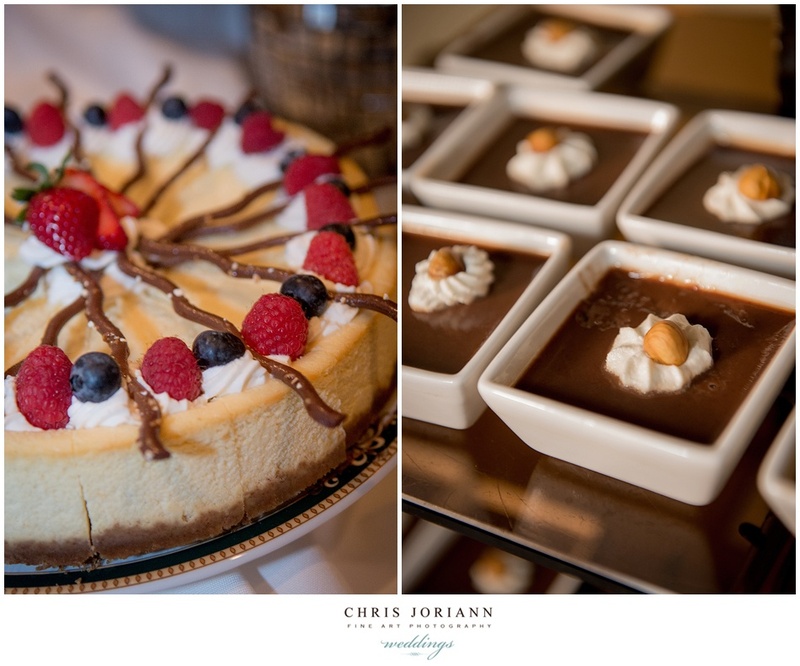 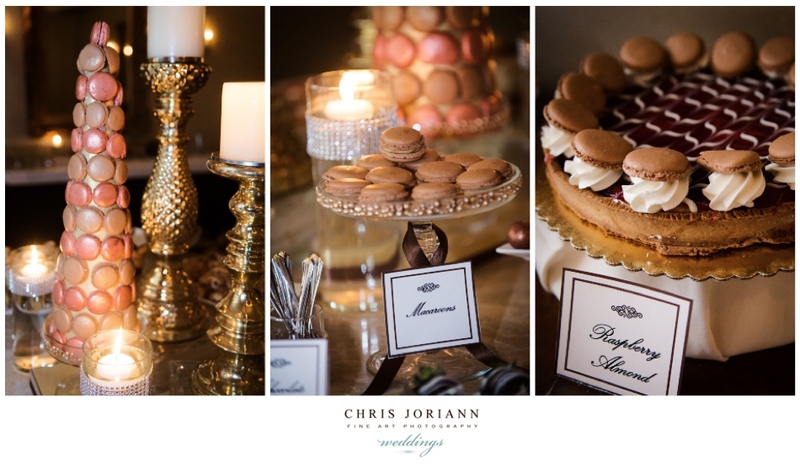 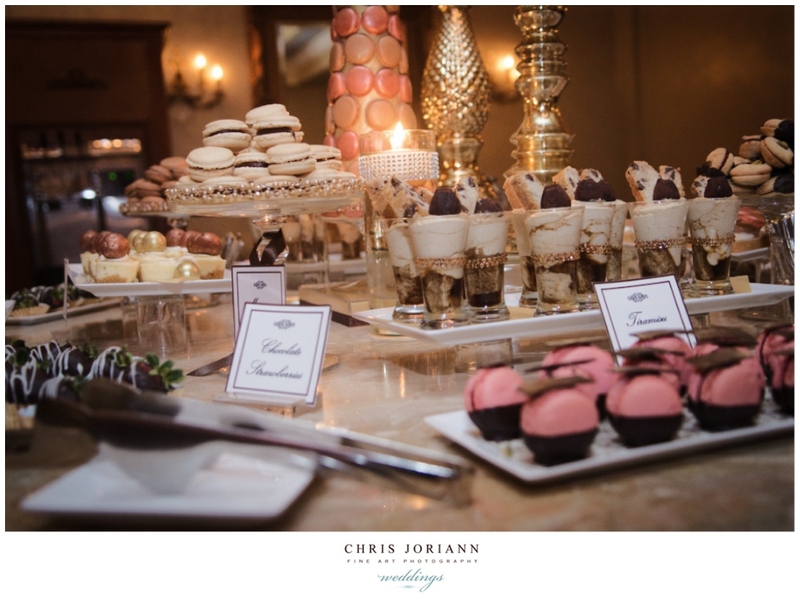 A decadent room of desserts awaited guests. 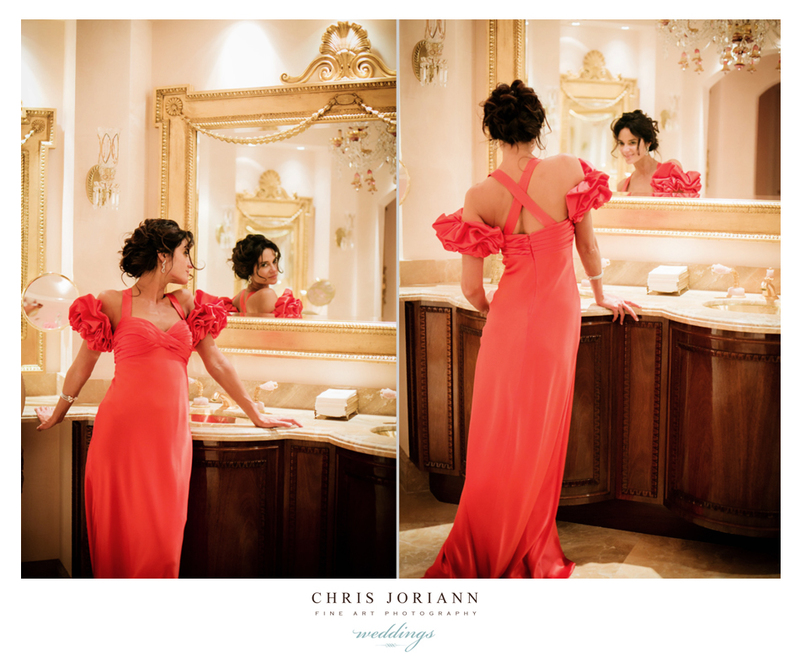 As the bride transformed into a “lady in red” donning something a bit more comfy for dancing the night away. 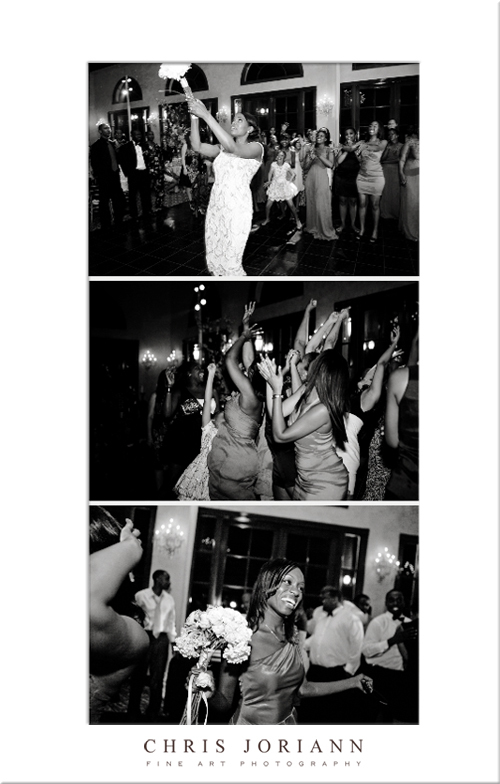 When she returned the party got into full swing. 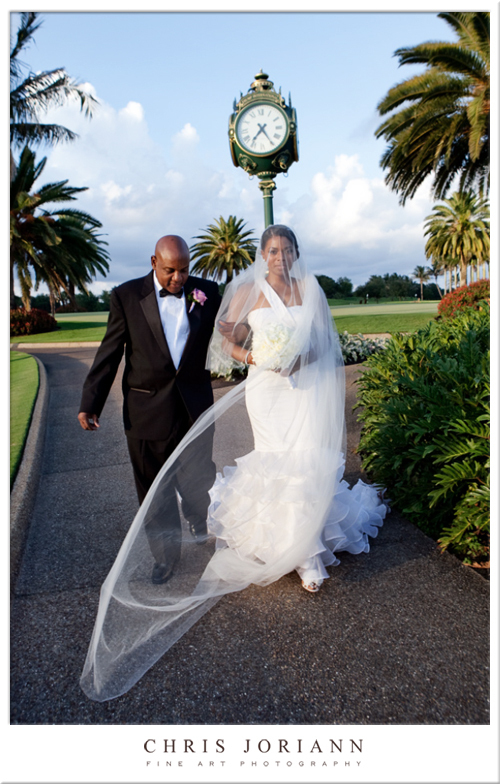 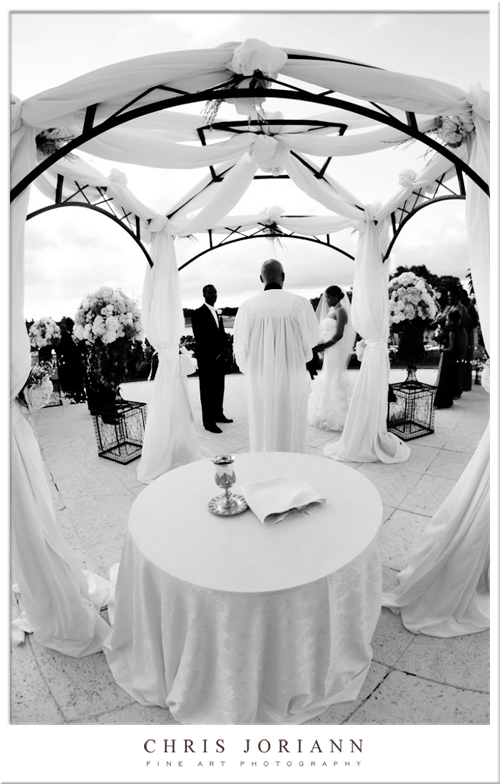 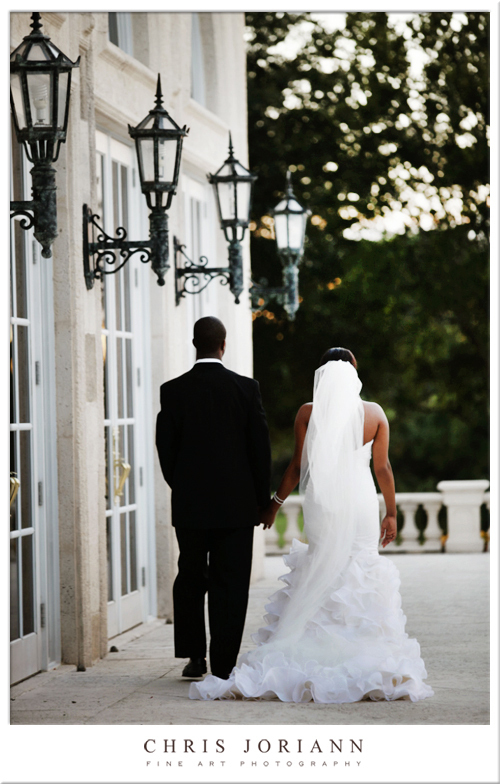 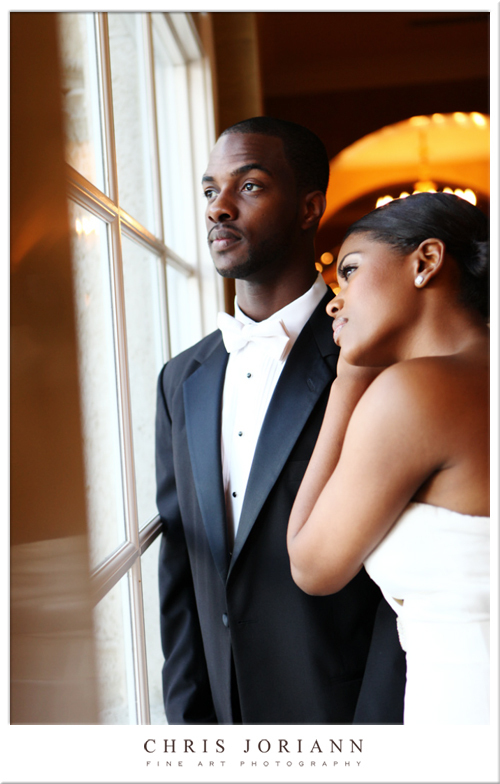 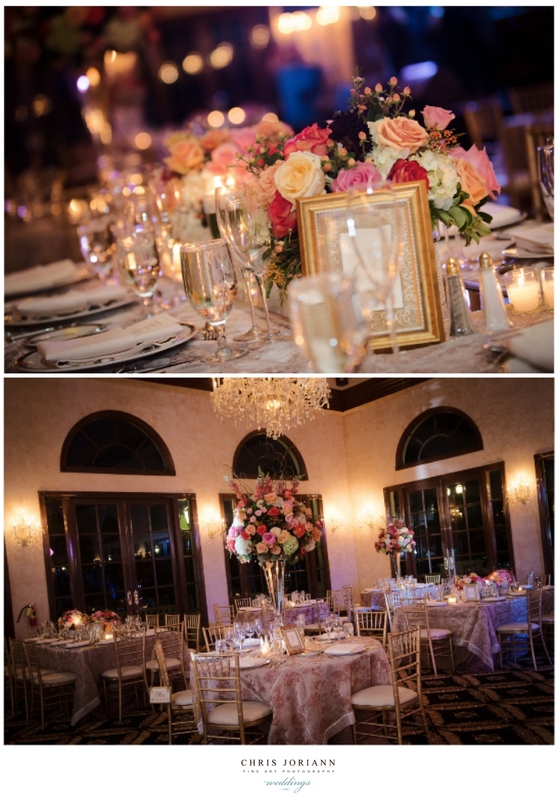 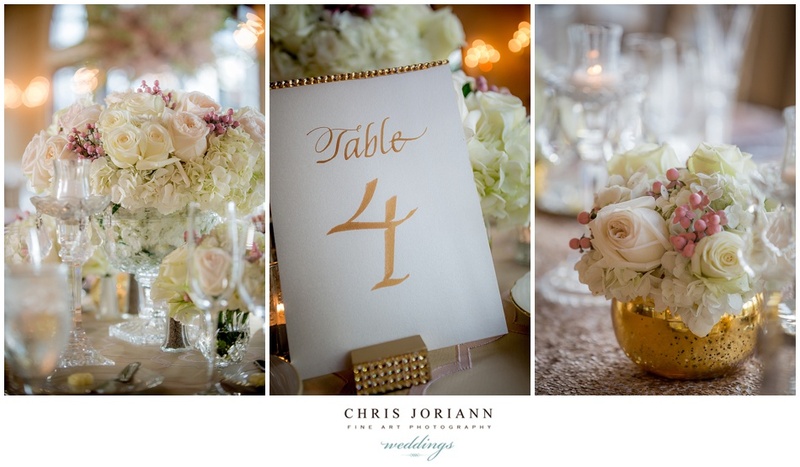 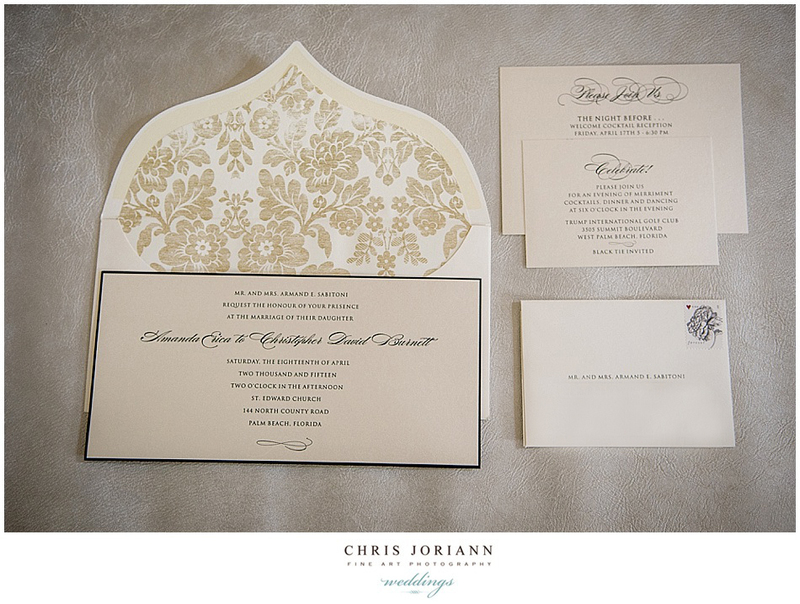 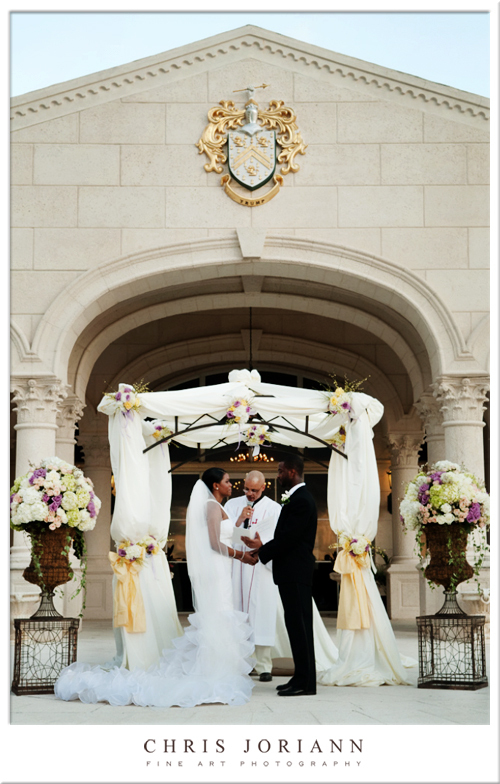 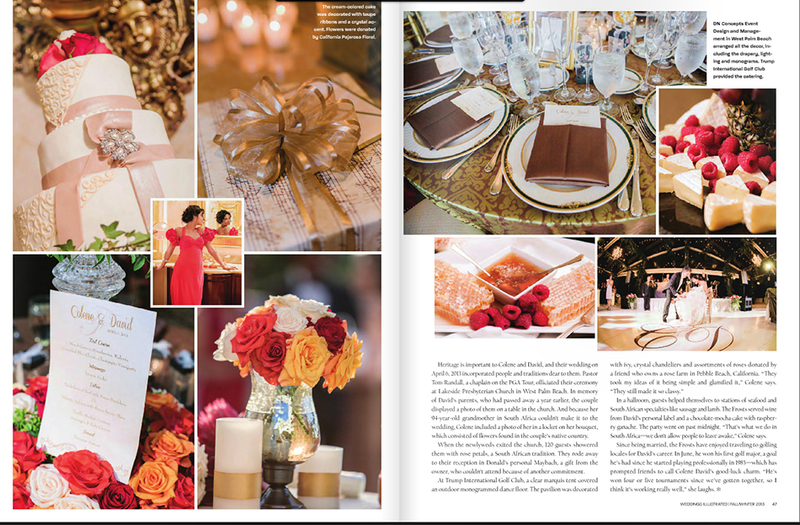 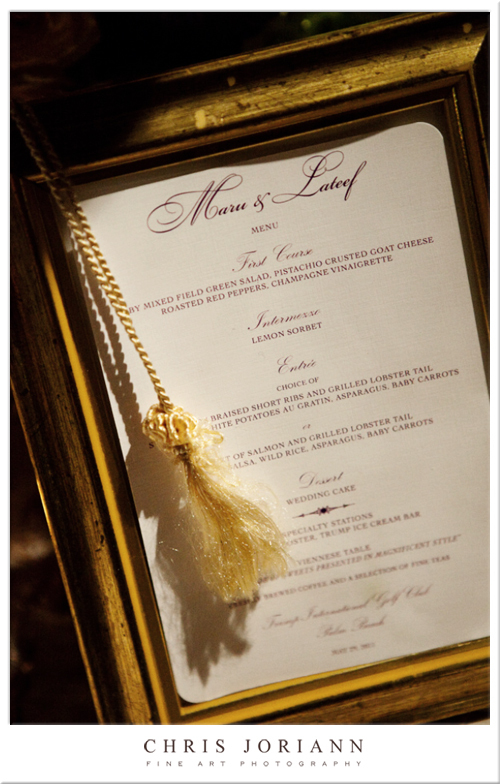 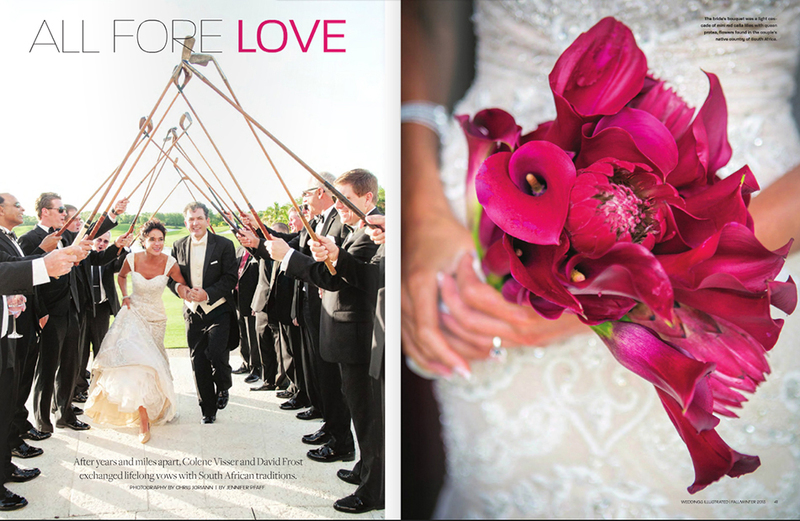 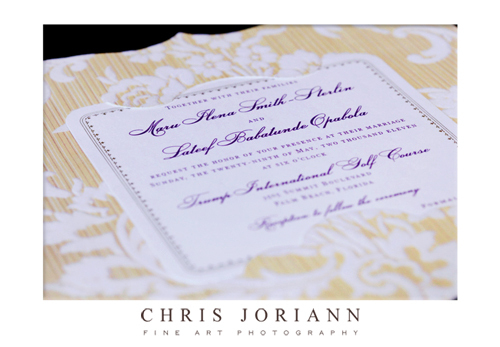 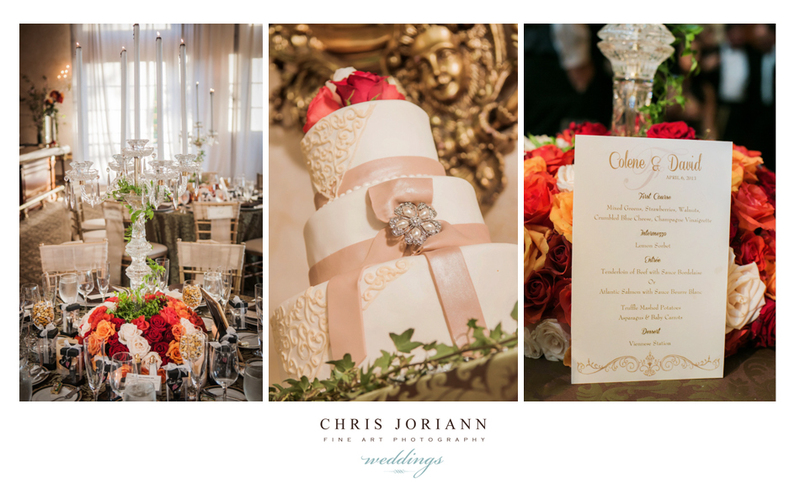 Maru + Lateef’s opulent wedding, held at Trump International Golf club, was pure elegance combined with tradition. 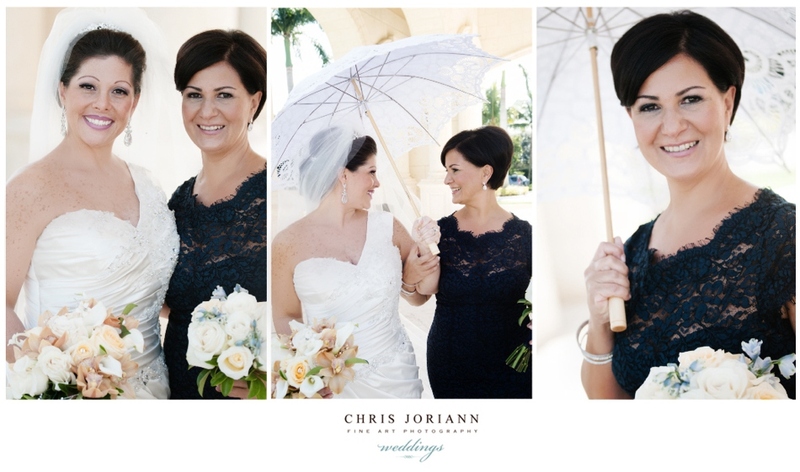 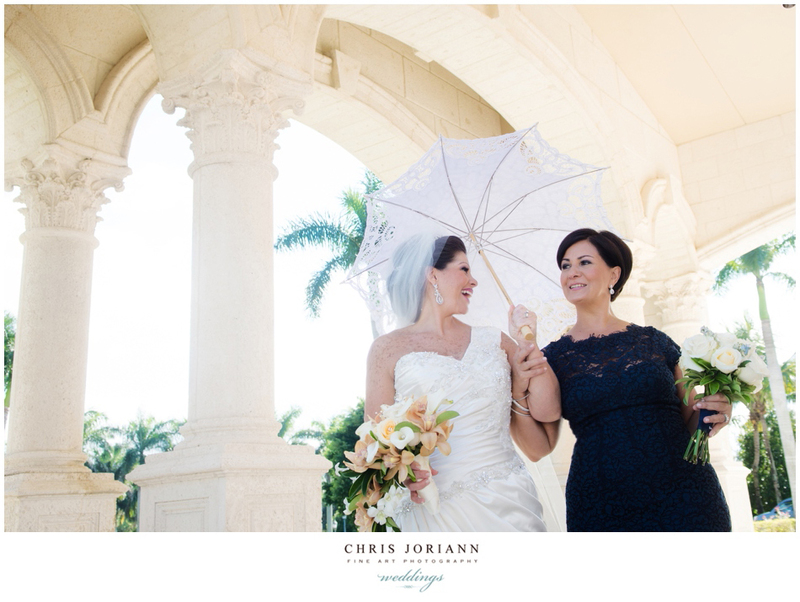 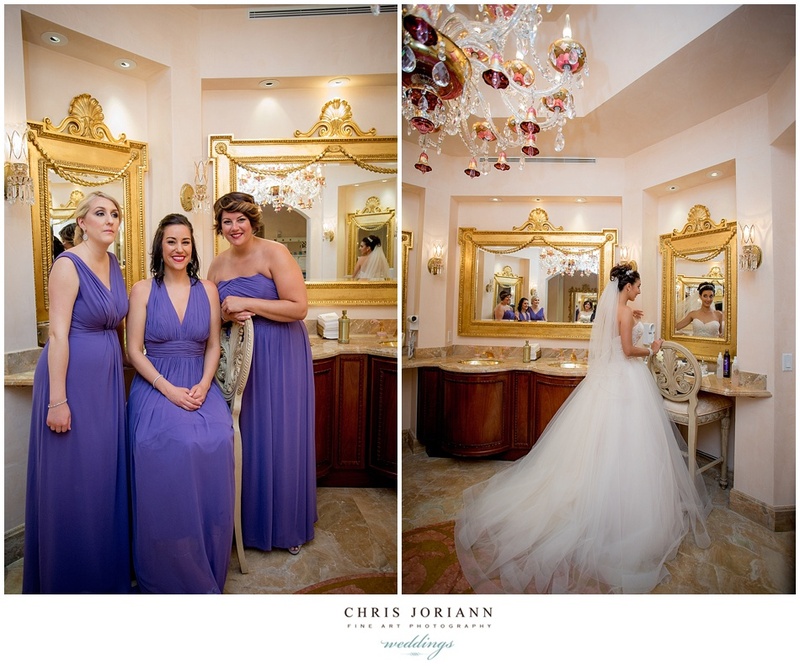 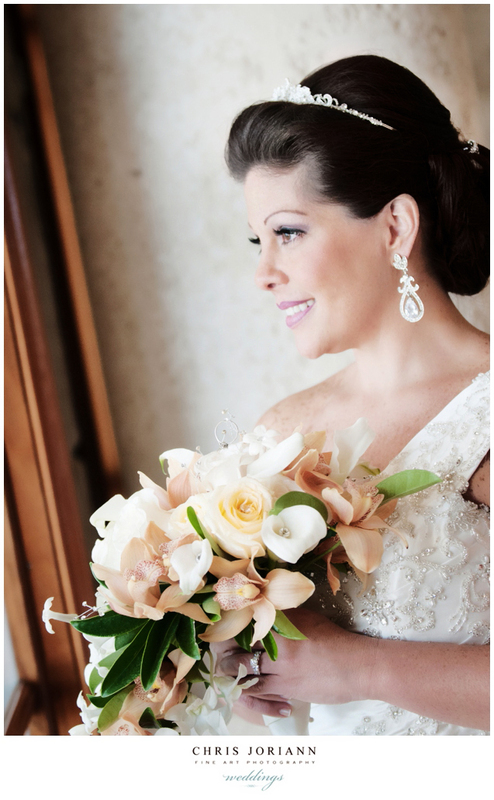 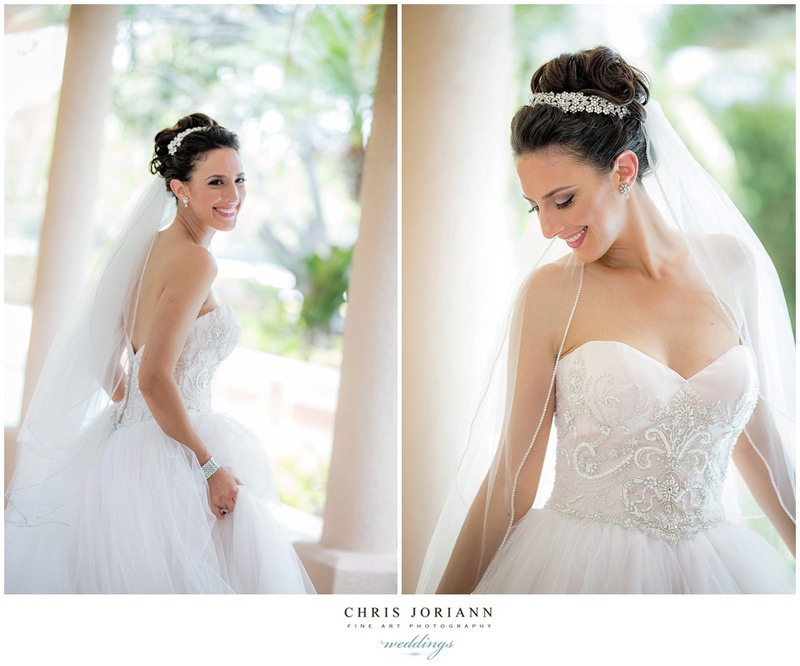 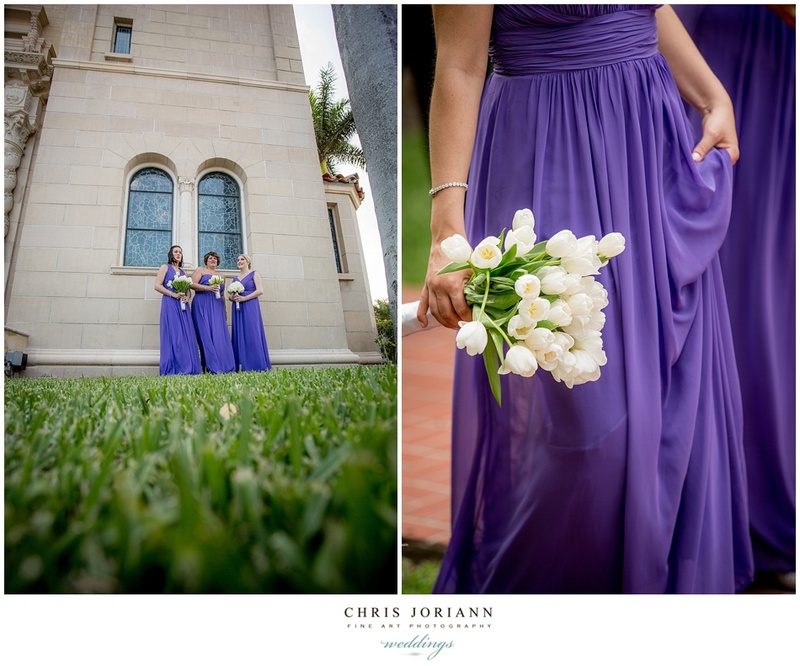 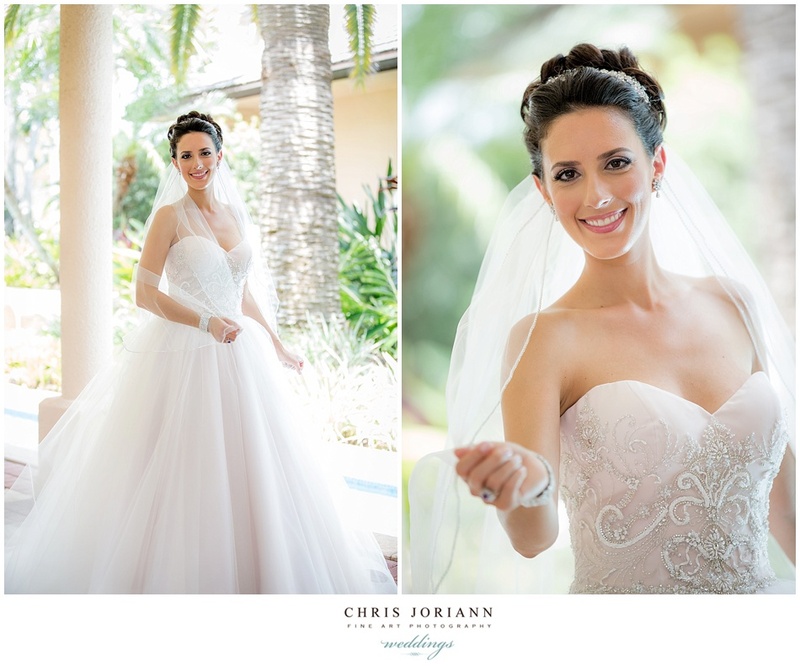 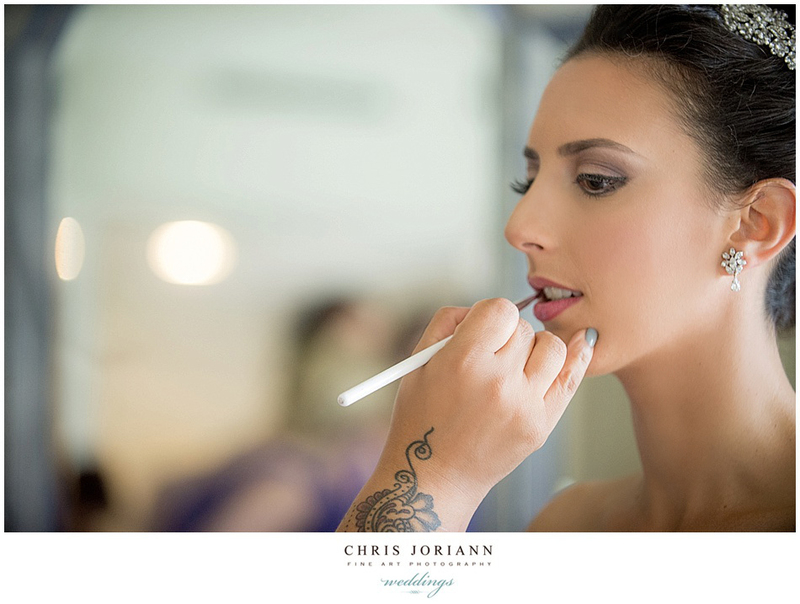 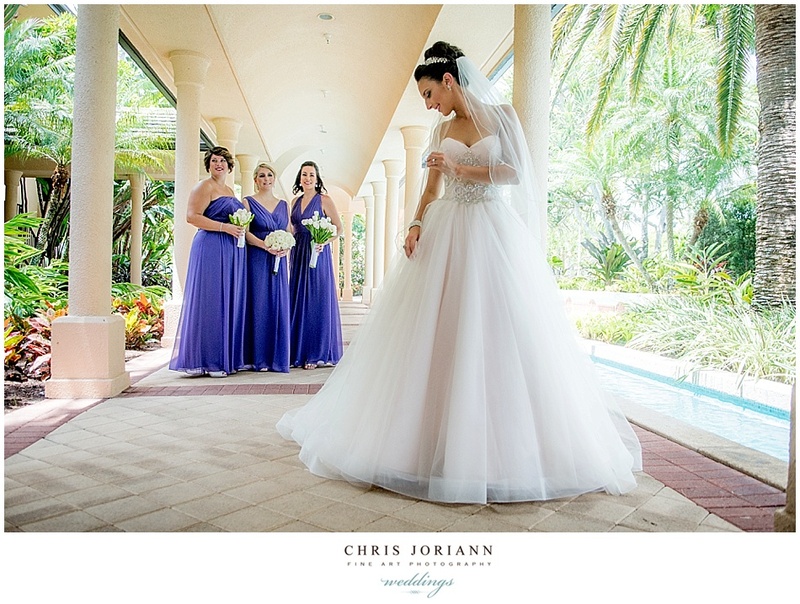 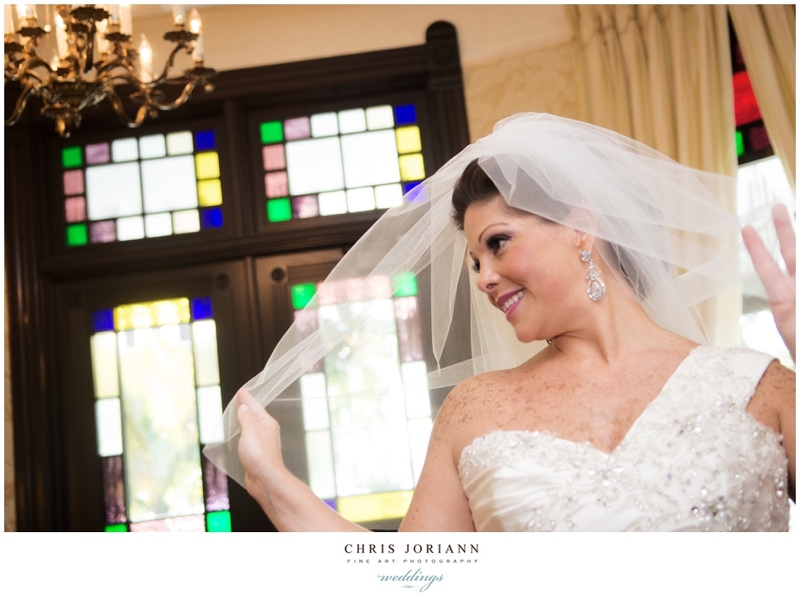 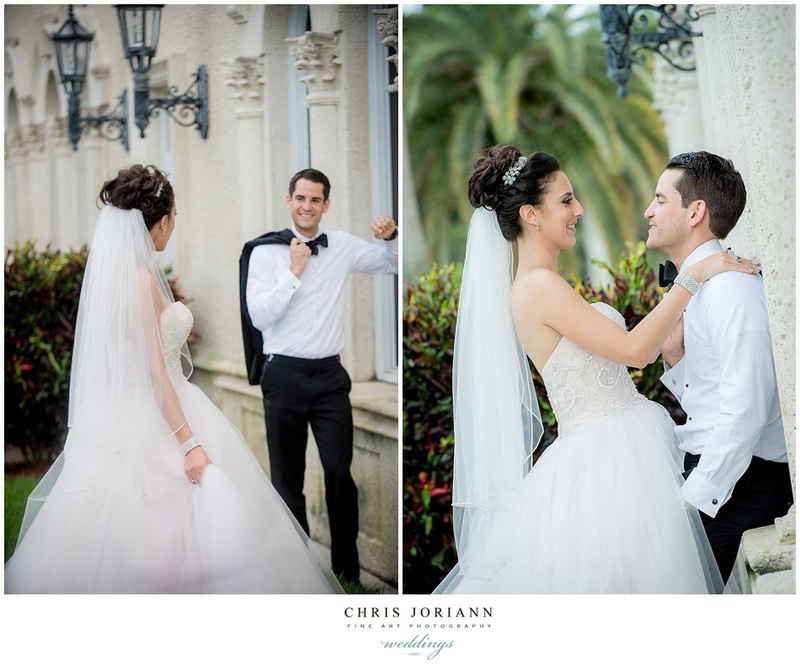 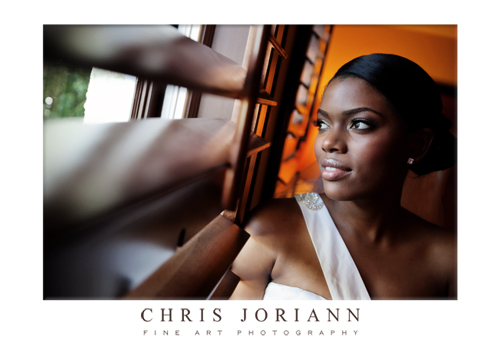 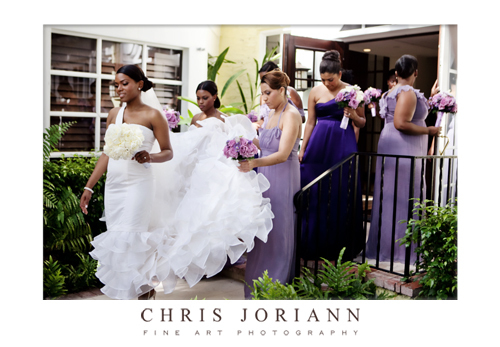 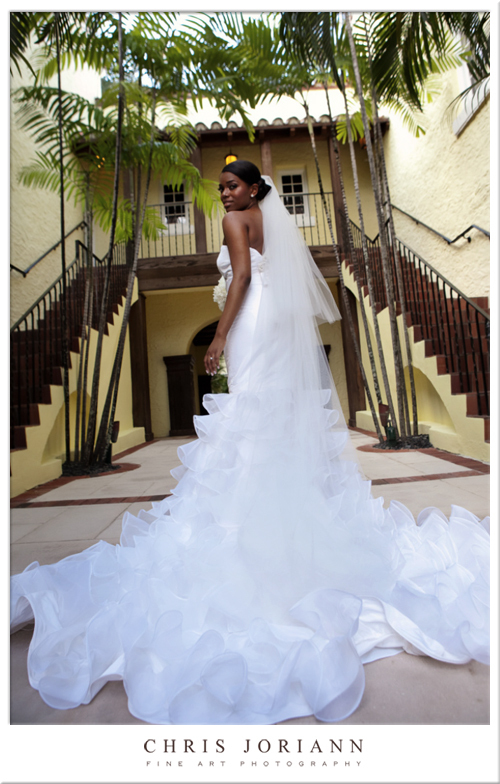 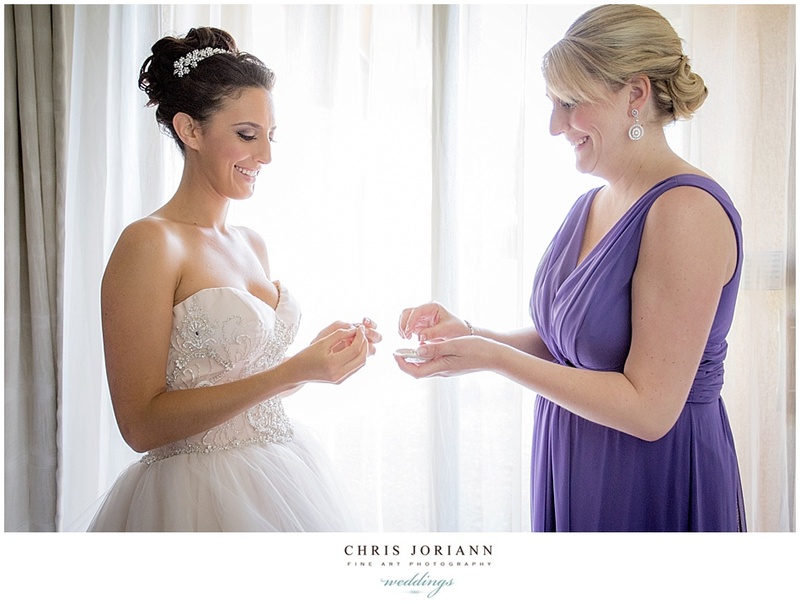 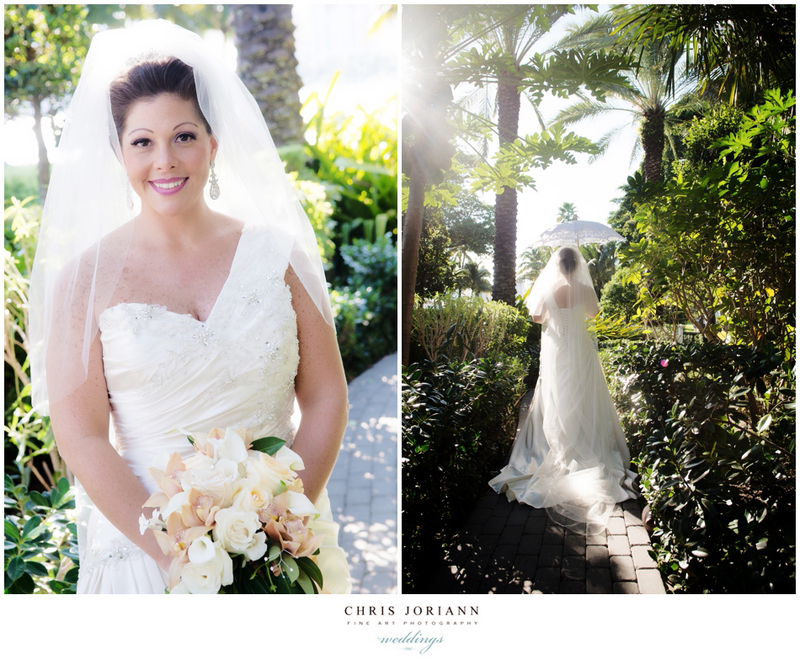 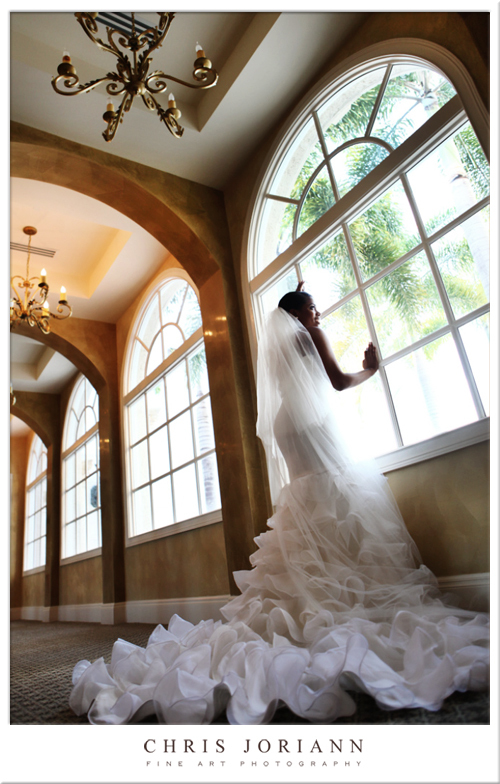 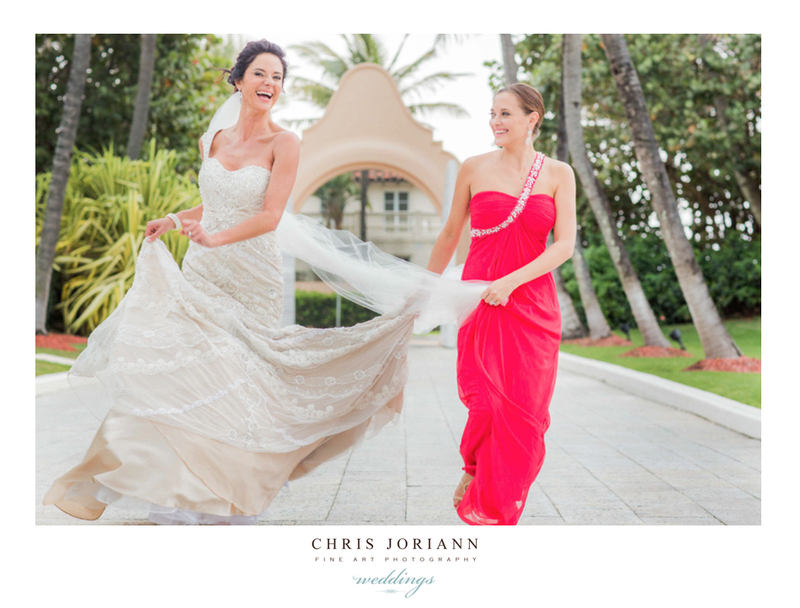 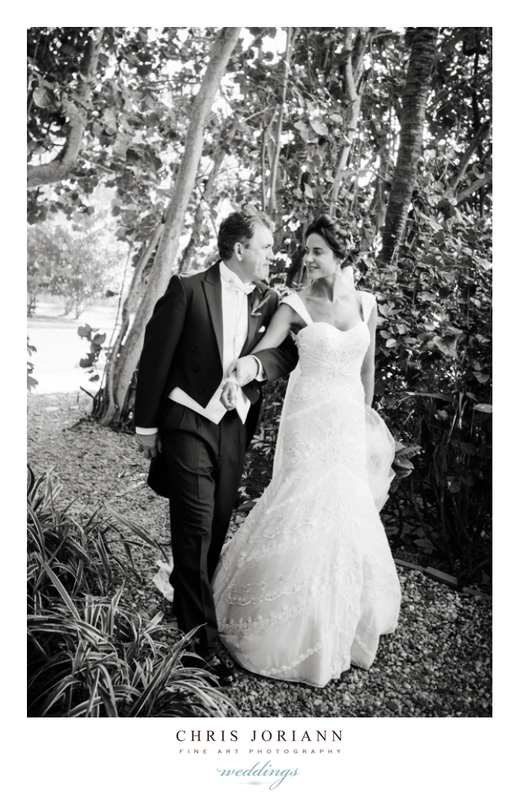 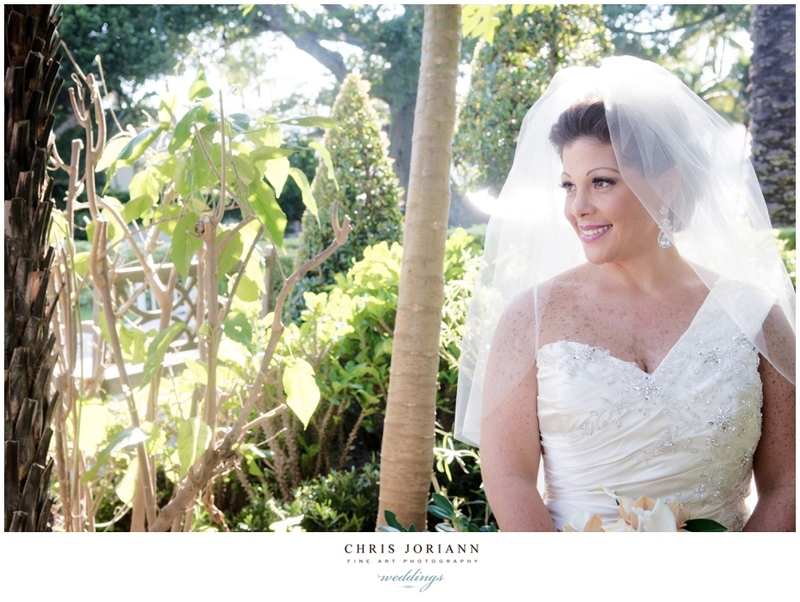 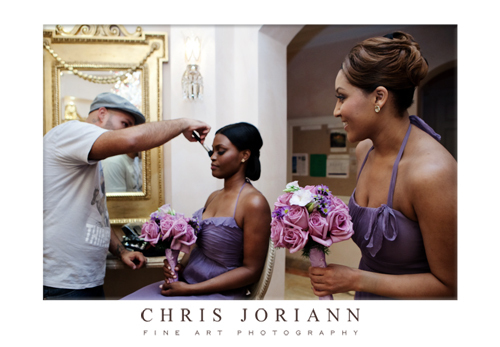 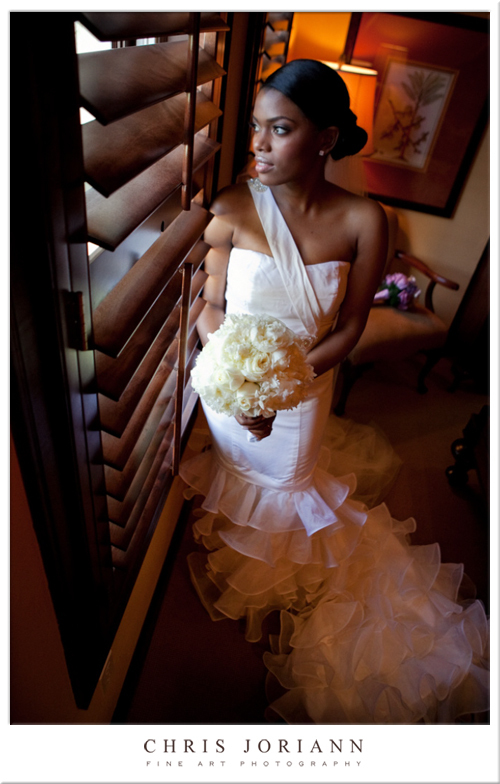 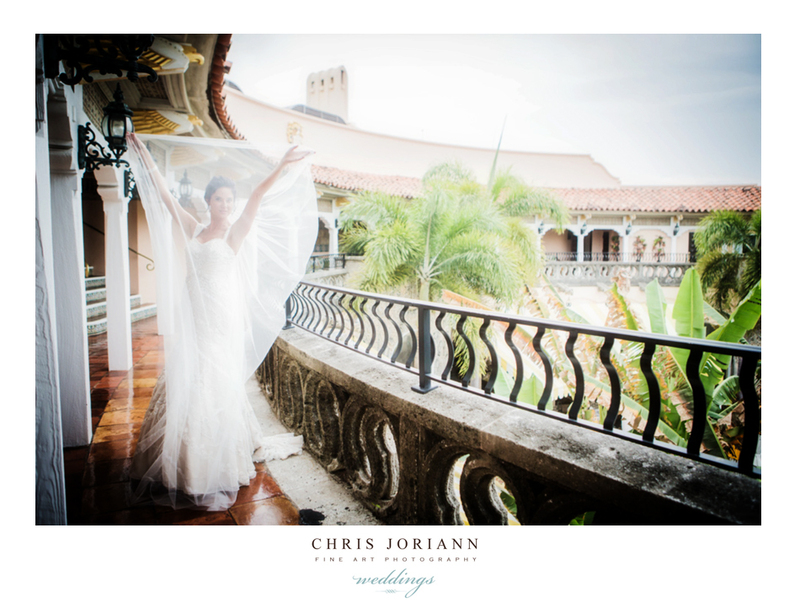 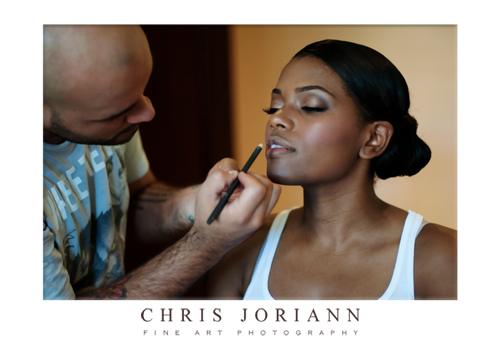 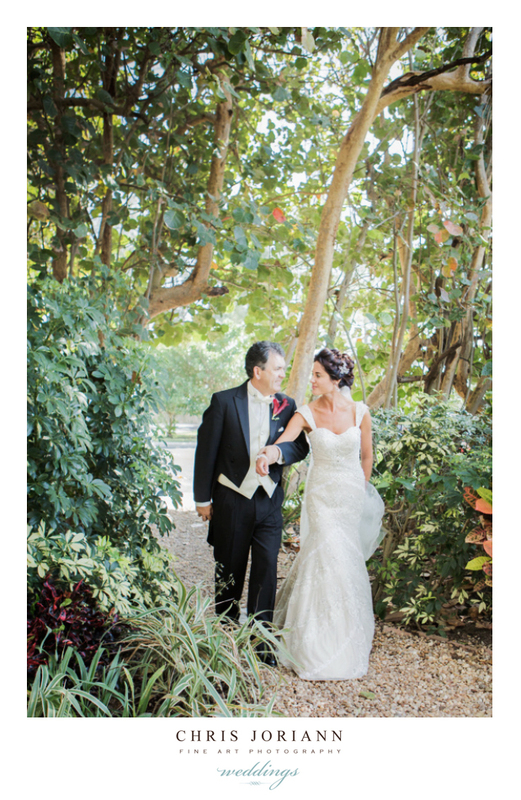 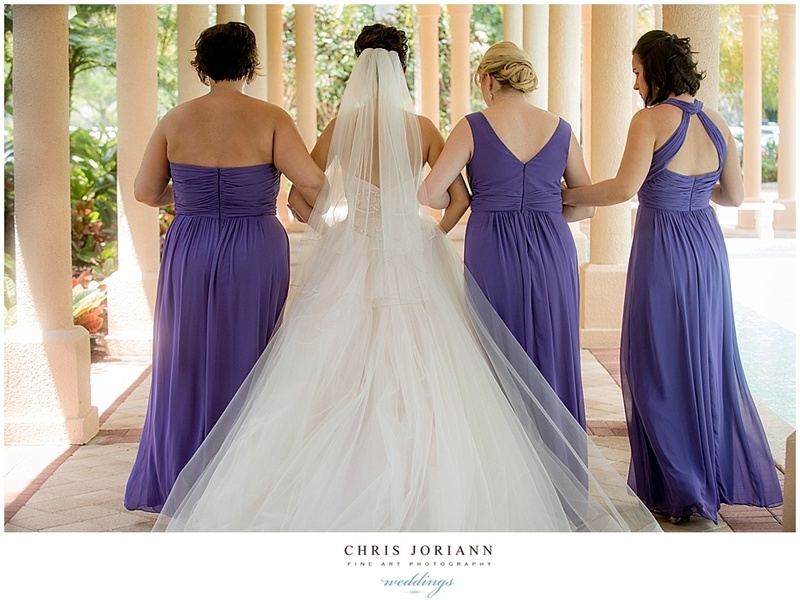 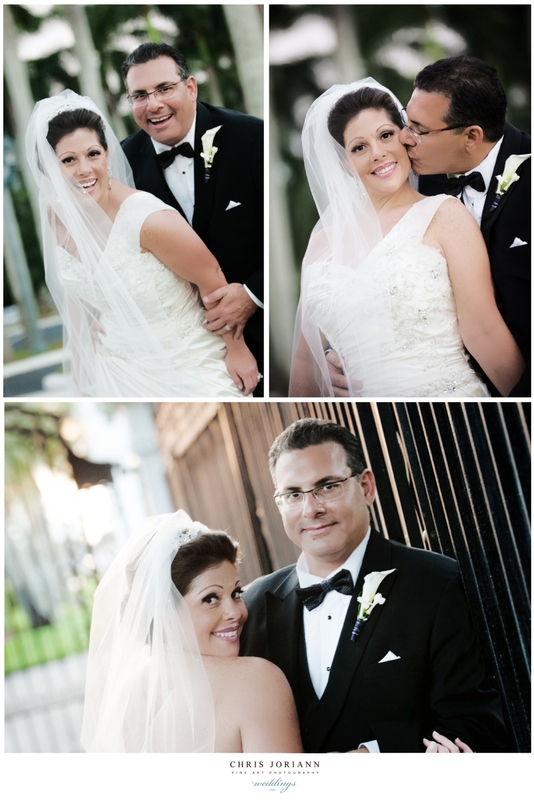 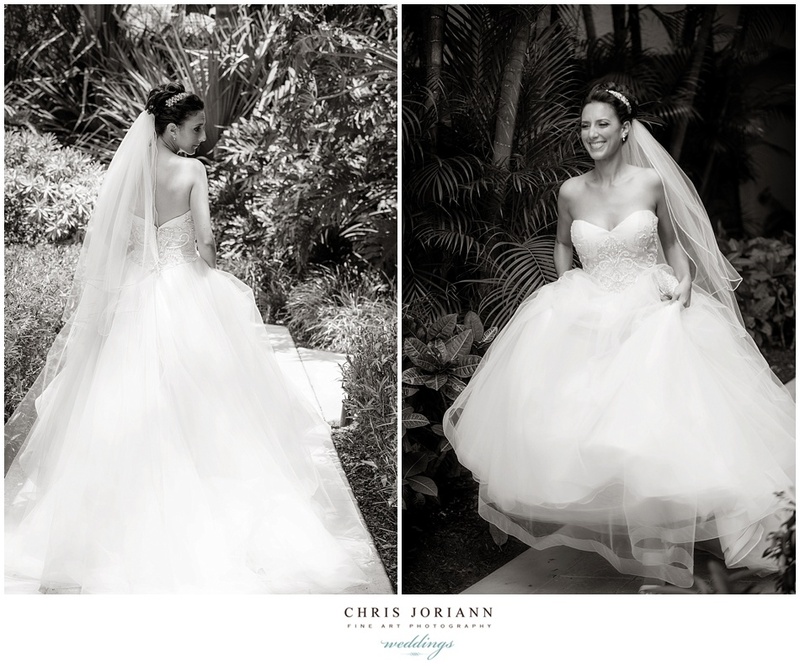 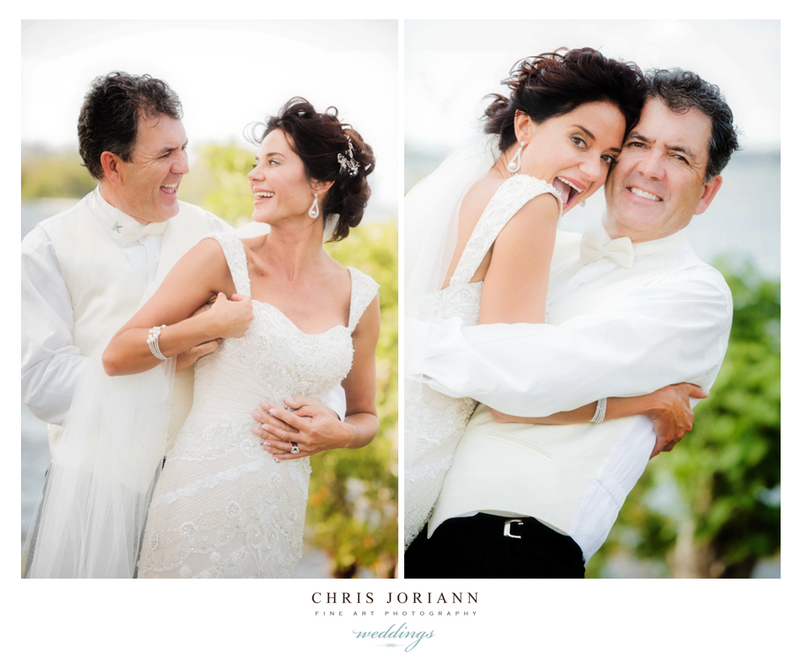 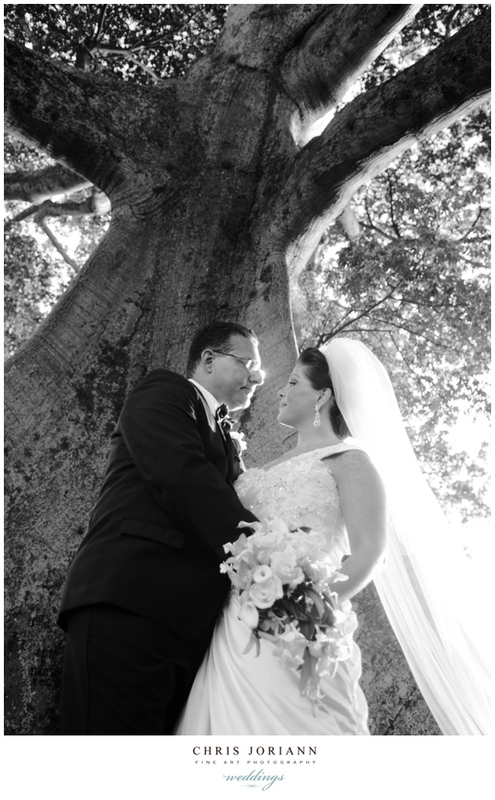 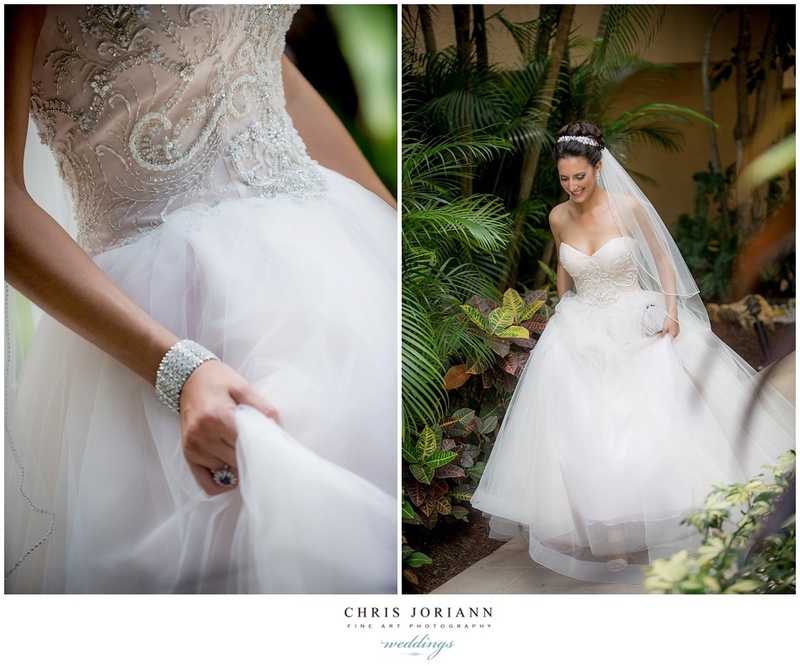 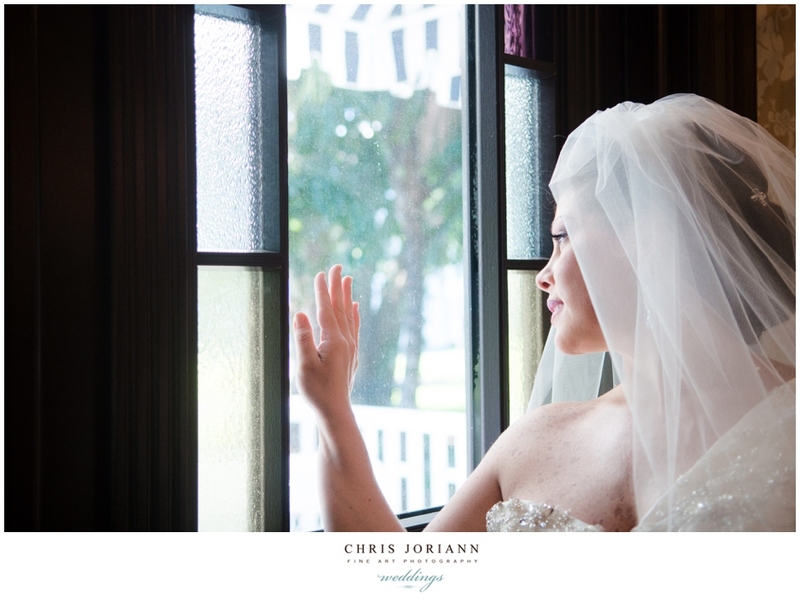 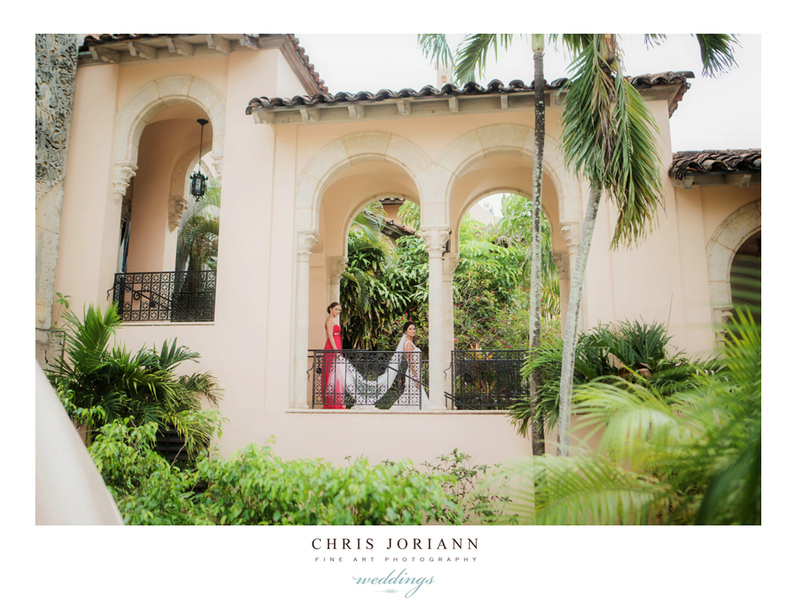 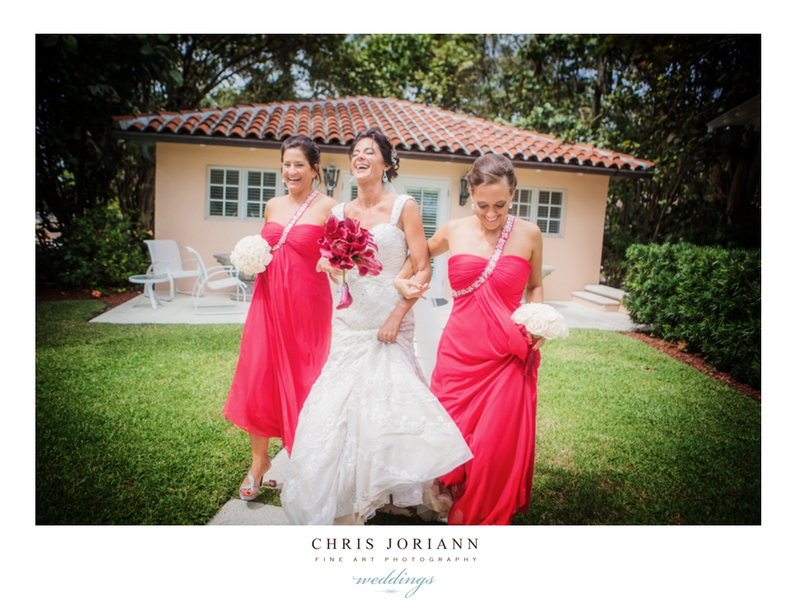 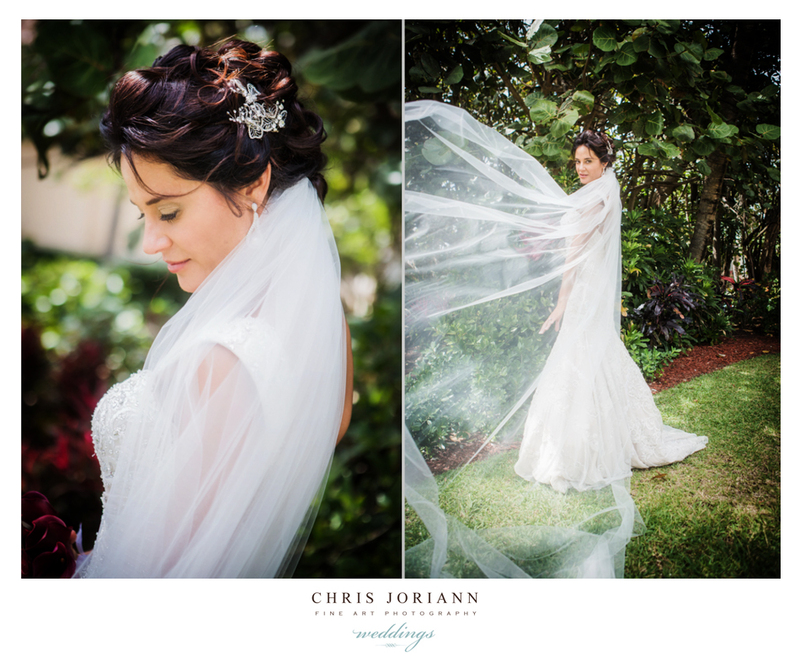 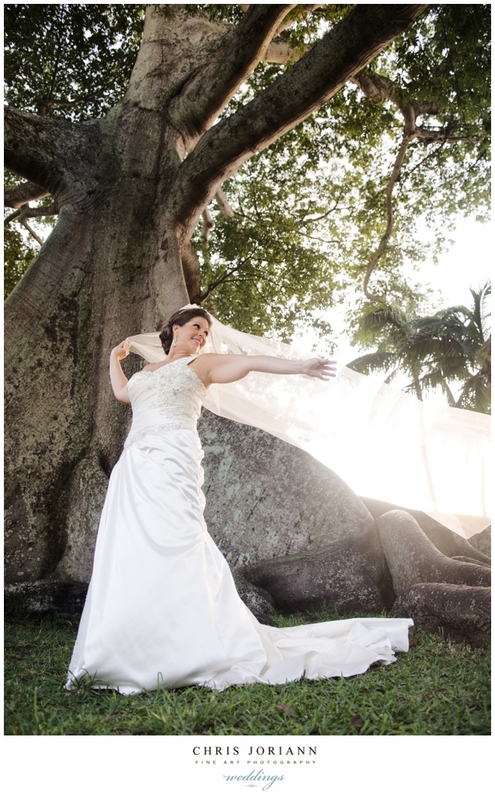 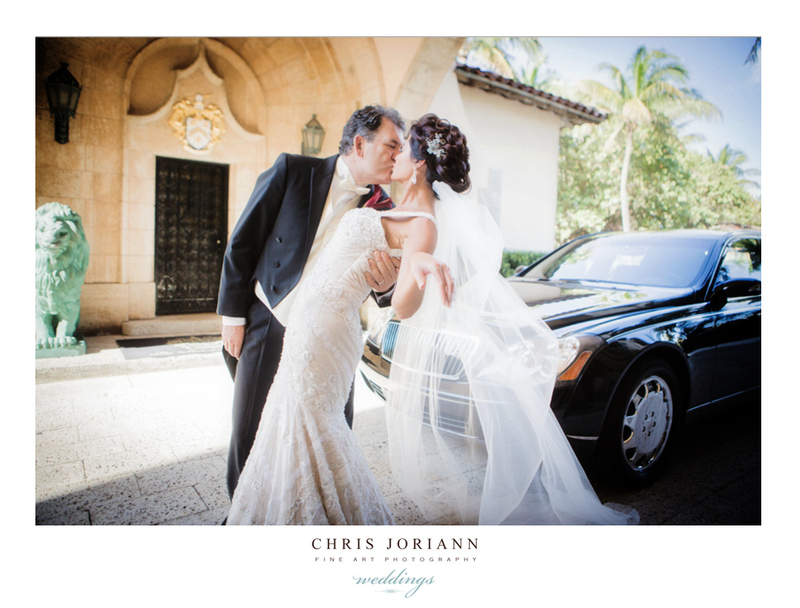 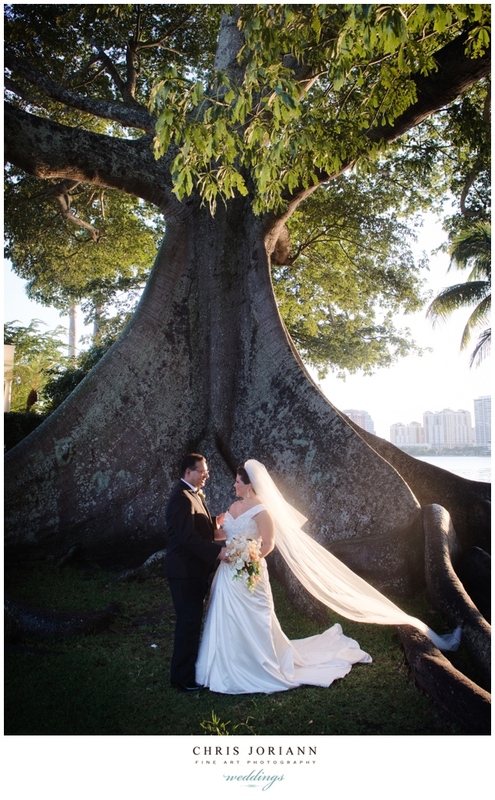 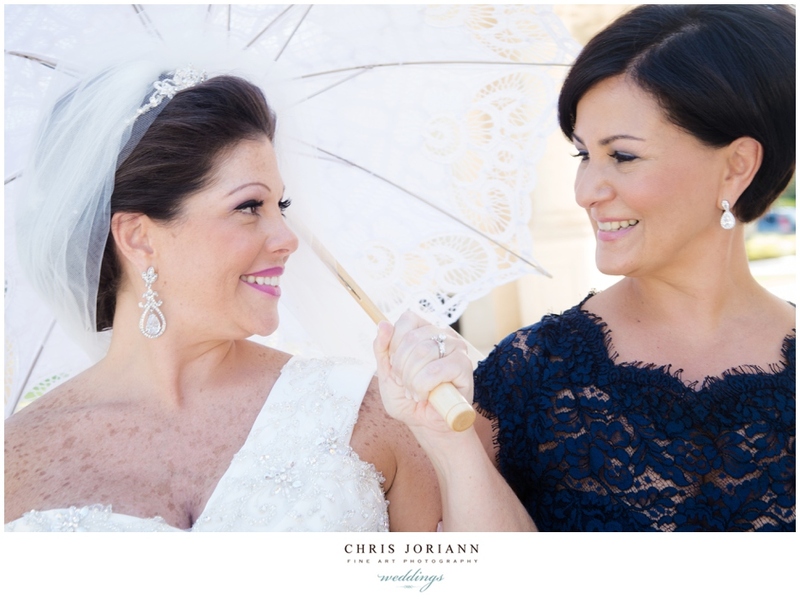 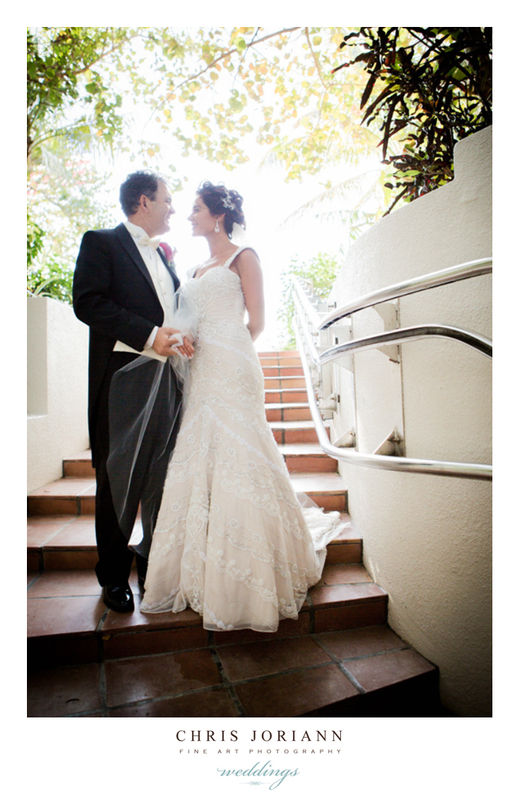 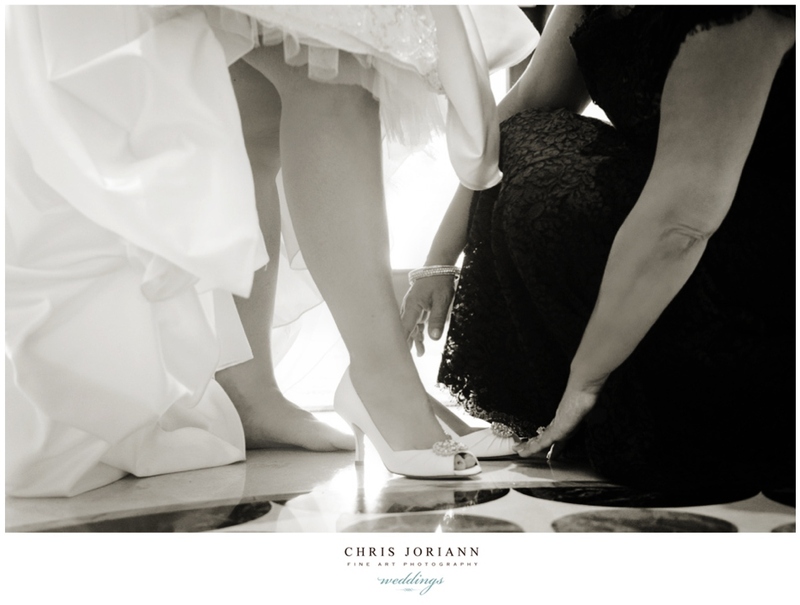 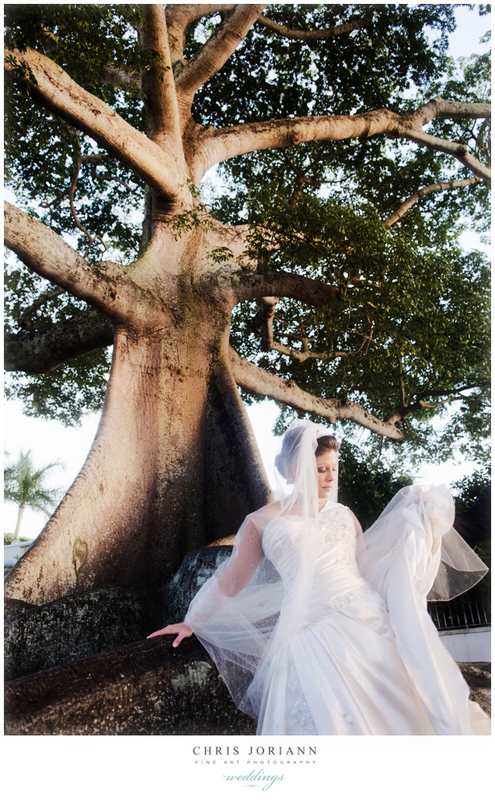 Their special day began with the bride getting ready at The Brazilian Court in Palm beach. 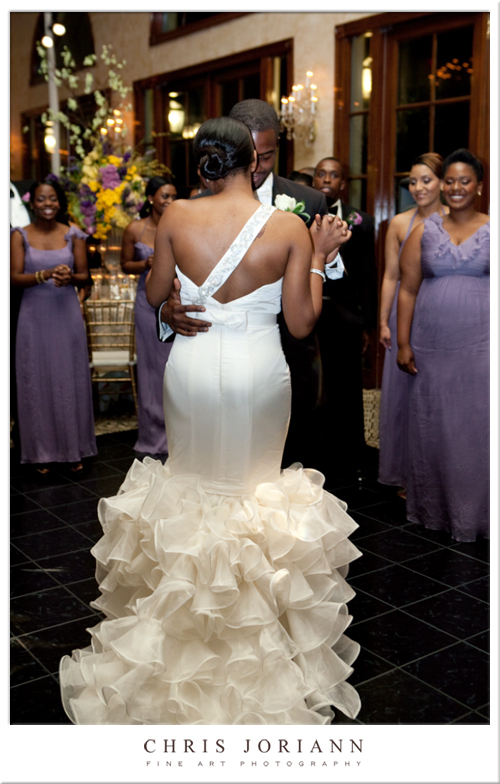 Her custom created dress, complete with removable train, was just gorgeous. 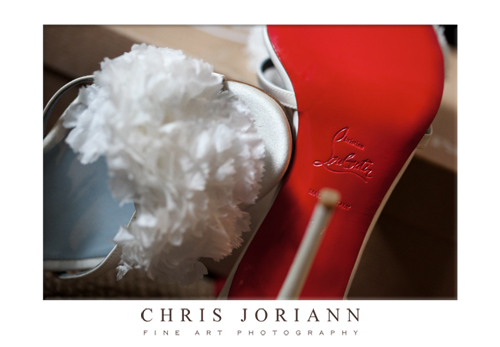 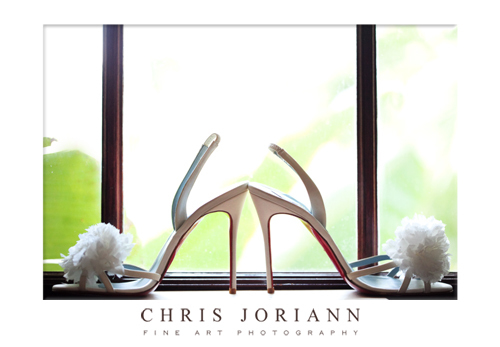 with the irresistible signature red soles. 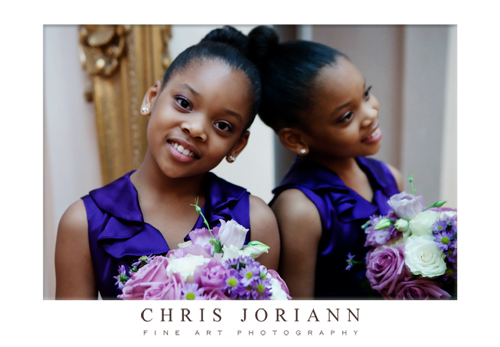 Here Maru’s adorable daughter, poses as her jr. maid of honor. 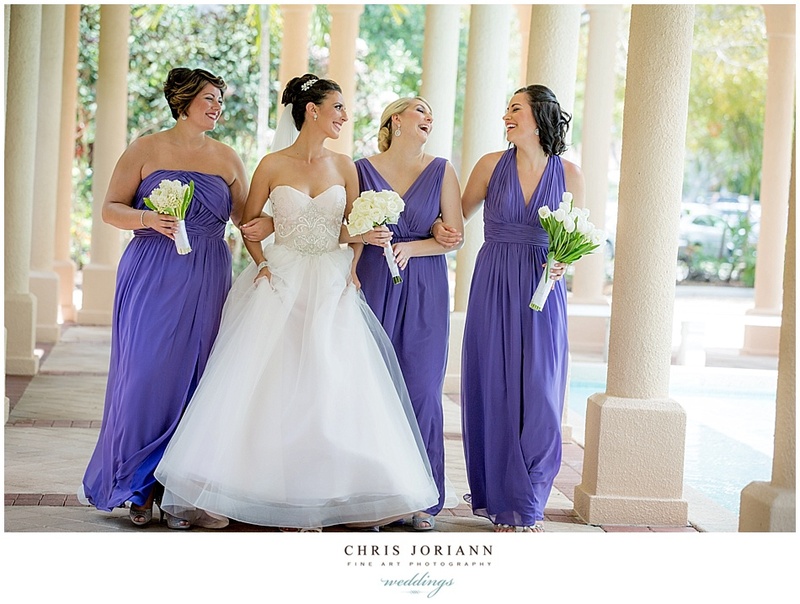 Followed by a moment to reflect with her bridesmaids. 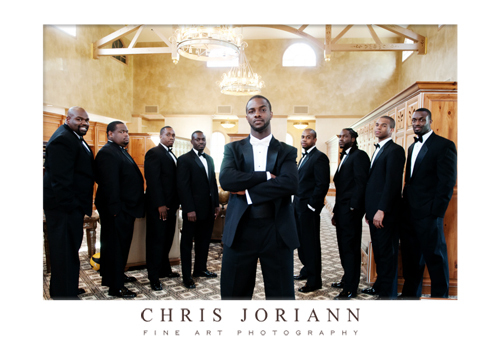 Meanwhile, over at Trump… Lateef and the boyz, readied in the uber-fabulous Men’s locker room. 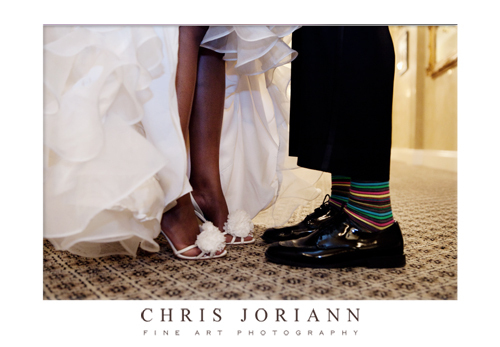 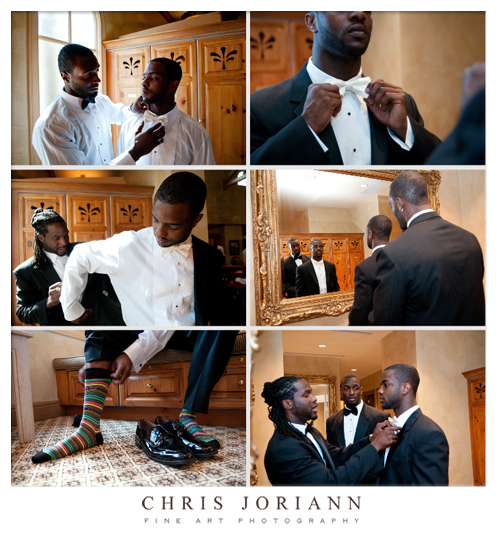 How great are the grooms striped socks? 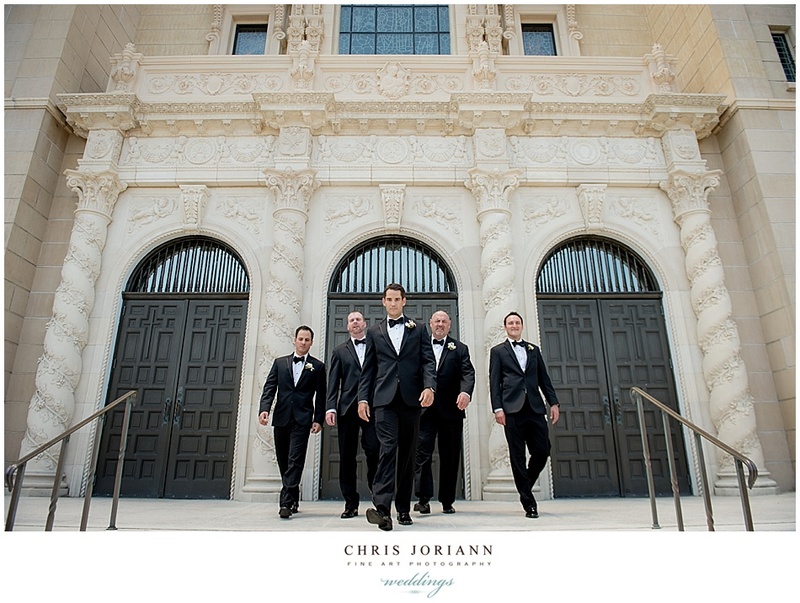 And the handsome bunch were ready to roll. 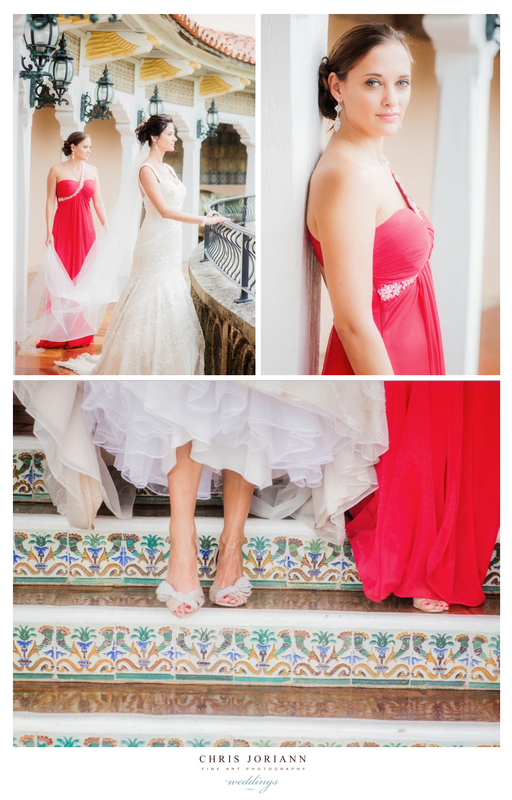 Back at the Brazilian court… Maru finishes up her bridal fashion shoot. 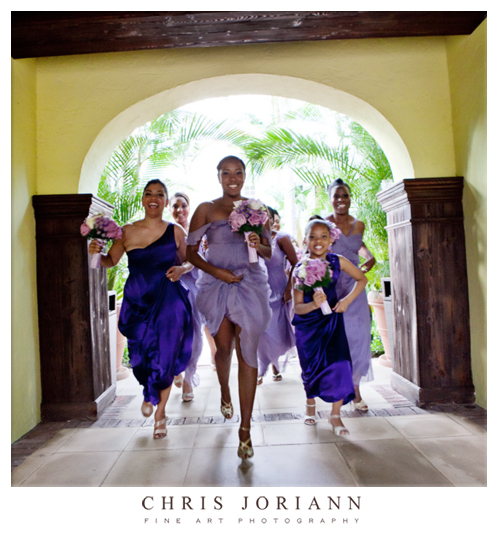 Then her girls help her down the stair and thru BC’s tropical courtyard. 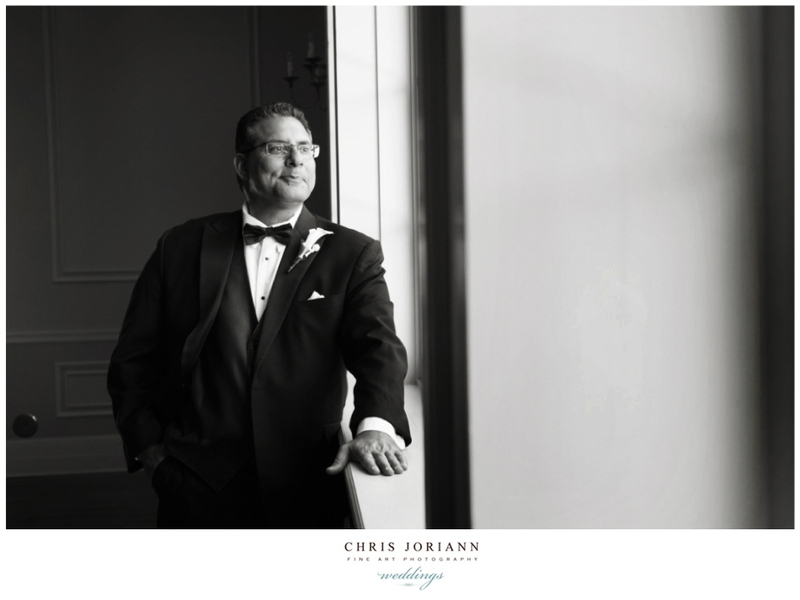 Once at Trump, both Maru and Lateef, indulged in a few last portrait shoots of their own, before their trip down the aisle. 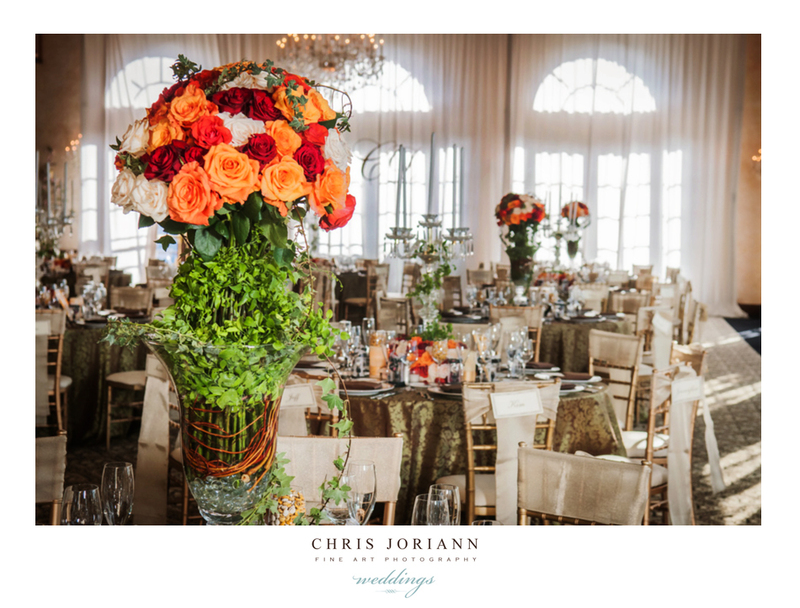 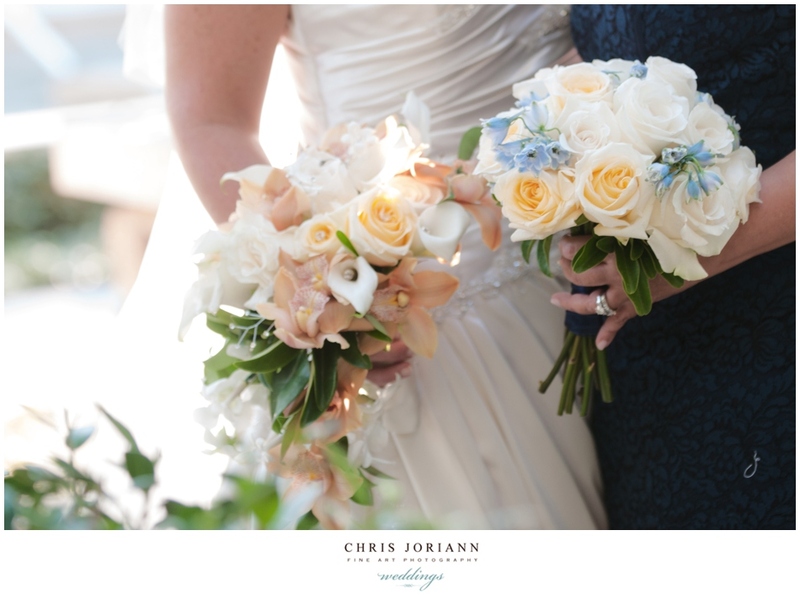 The ceremony was set up on the great lawn beside the lake, with decor by the amazing Michael Ereshena and his Special Event Design Resource and Design Group, who also created all the beautiful bouquets. 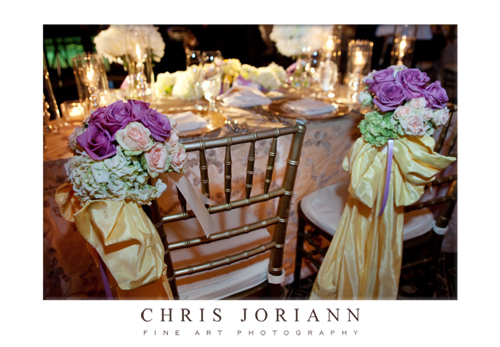 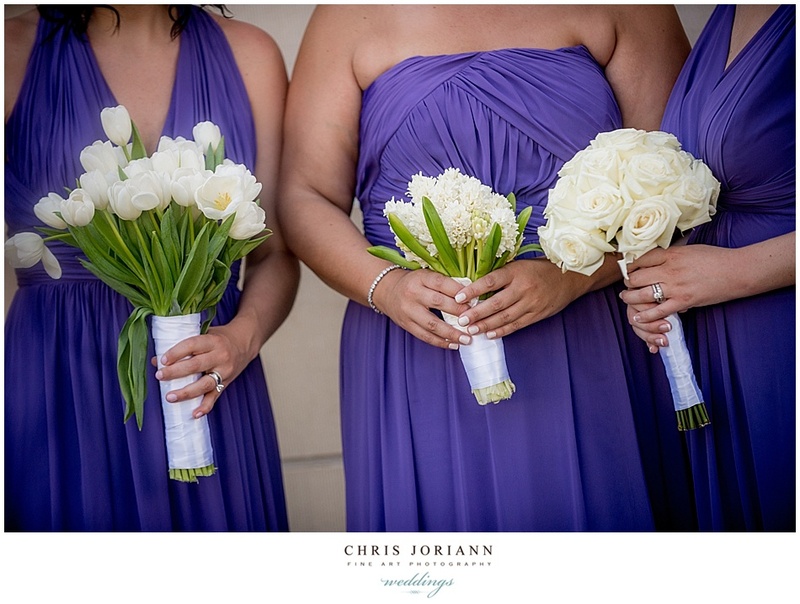 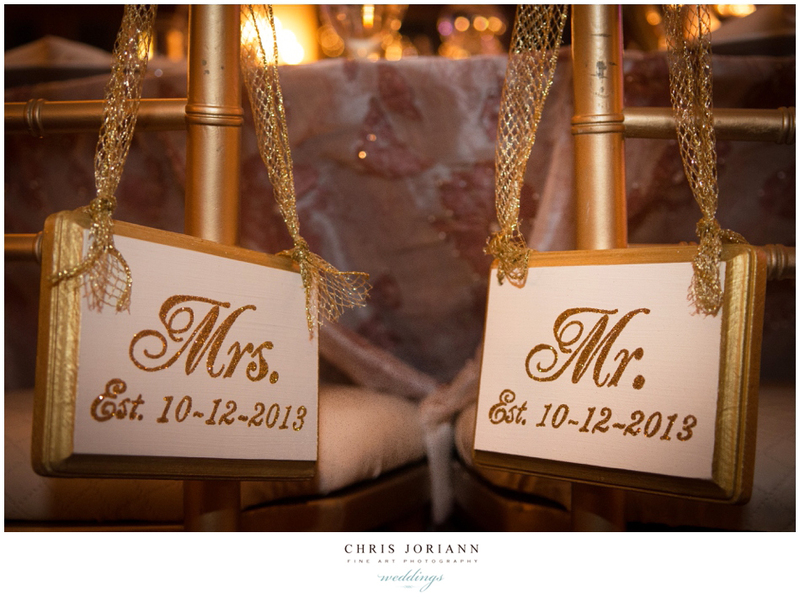 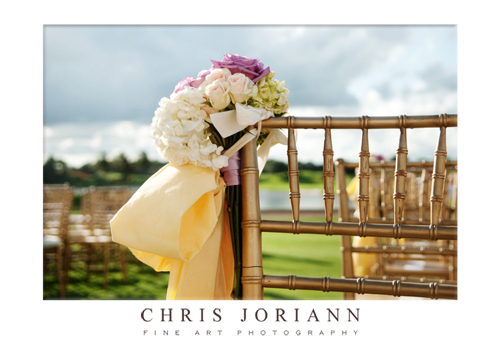 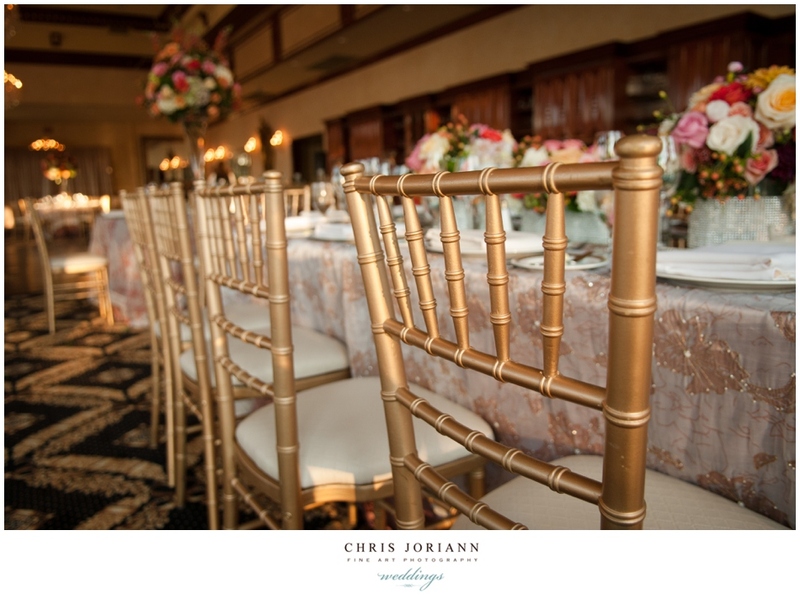 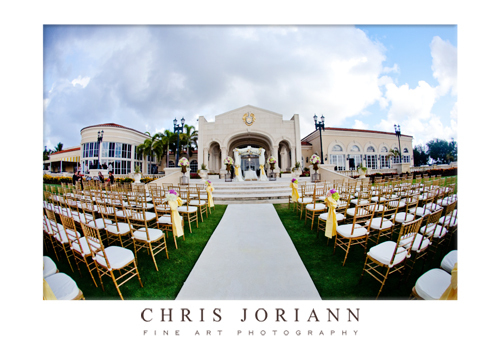 The gold chiavari chairs were accented with white and purple flowers, hung with buttercup ribbons. 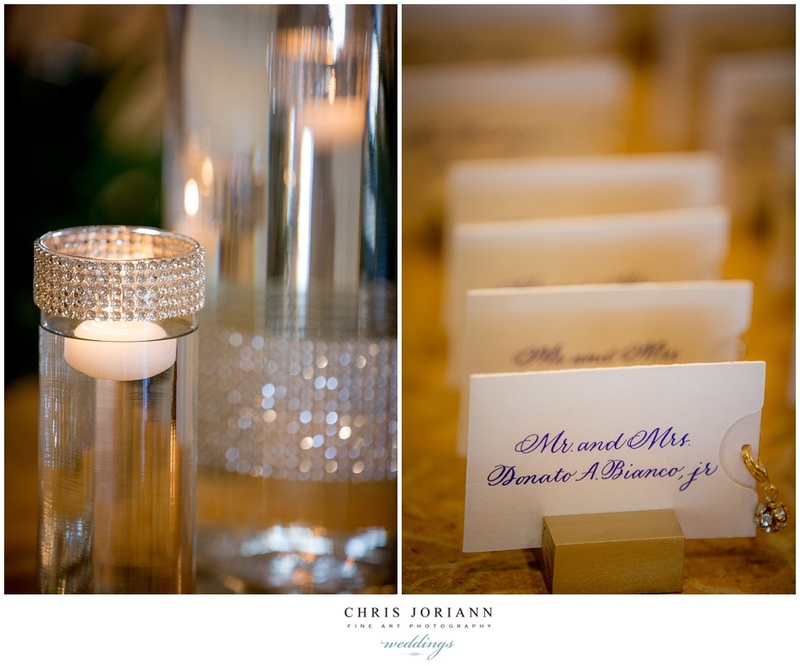 The rest of the decor followed suite. 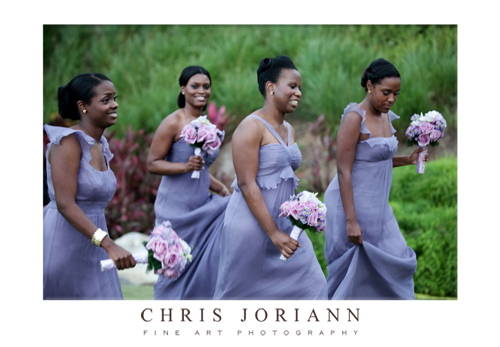 The bridesmaids made a lovely entrance. 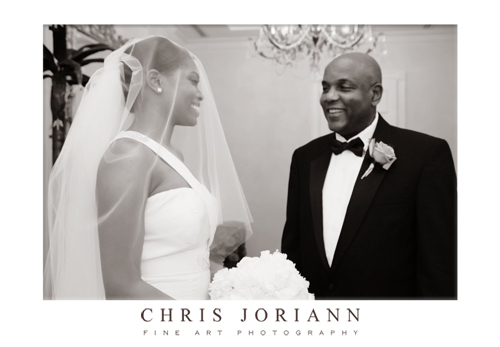 As Maru and her father, prepared for their walk down the aisle. 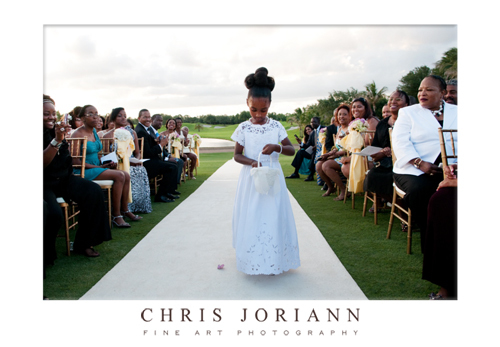 The flowergirl paved the way with petals. 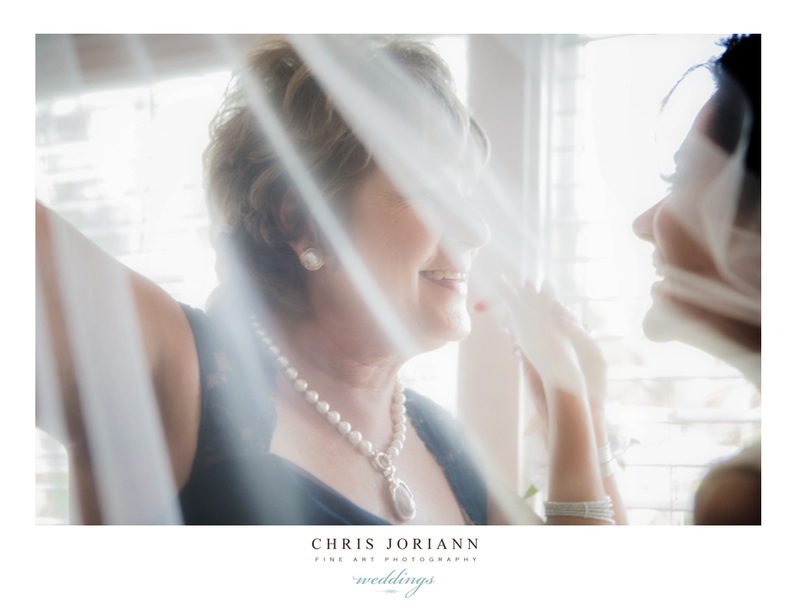 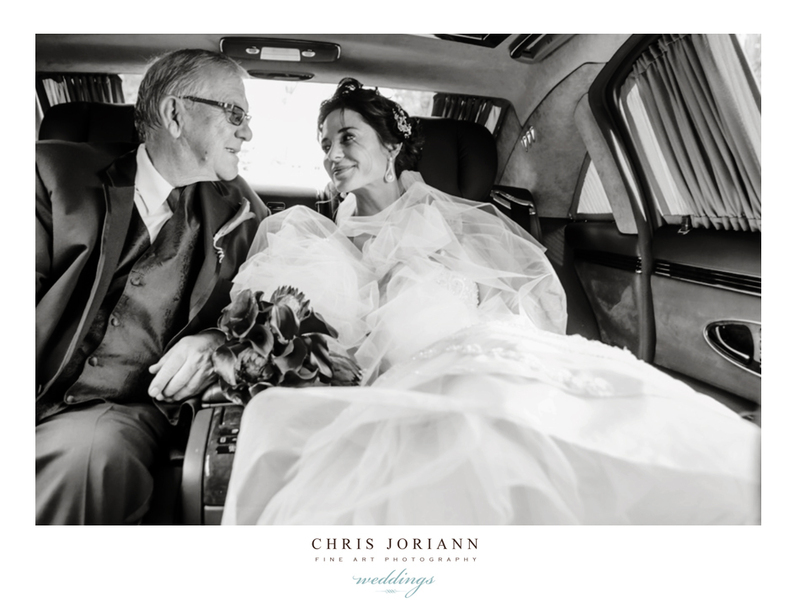 I just love this shot of her and her father… with the early evening sun glimmering thru her veil, the bride looking at her groom, and her father looking at her. 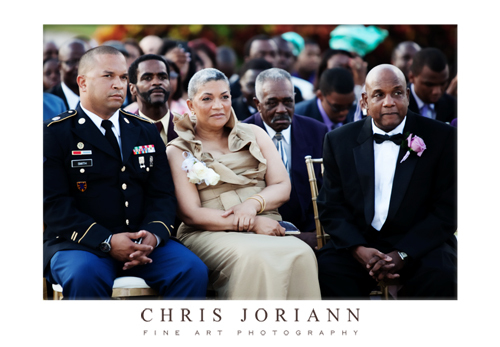 There expressions speak volumes. 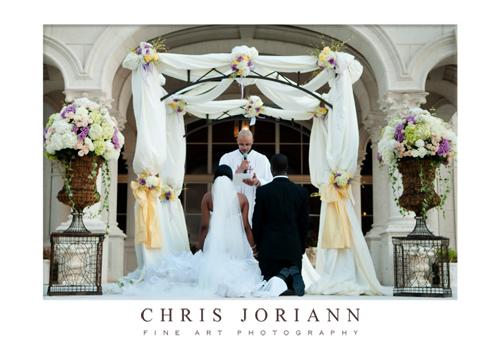 The ceremony began beneath the trellis. 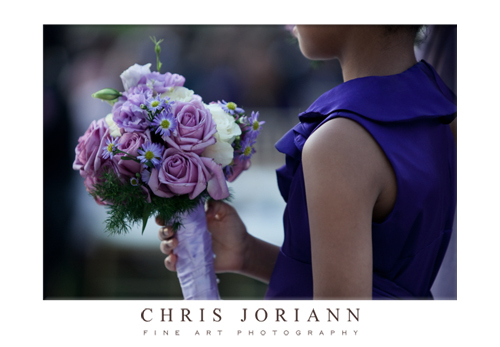 As her jr. attandants looked on in matching lilac. 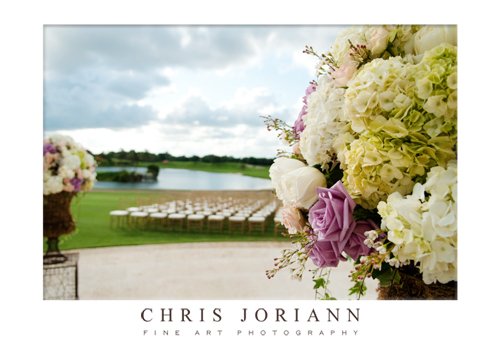 Love the bridemaids flowers, again, by tge a href=”http://specialeventresource.com”>Special Event Design Resource and Design Group. 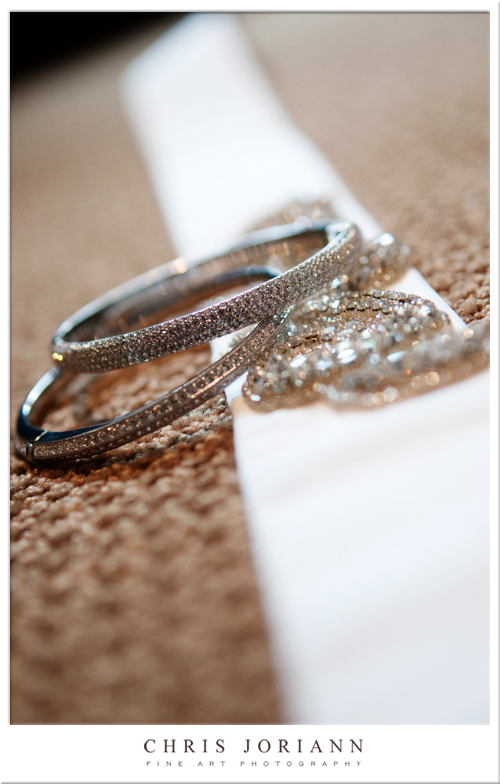 Rings were exchanged, and one of the most beautiful ceremonies we have ever shot continued on. 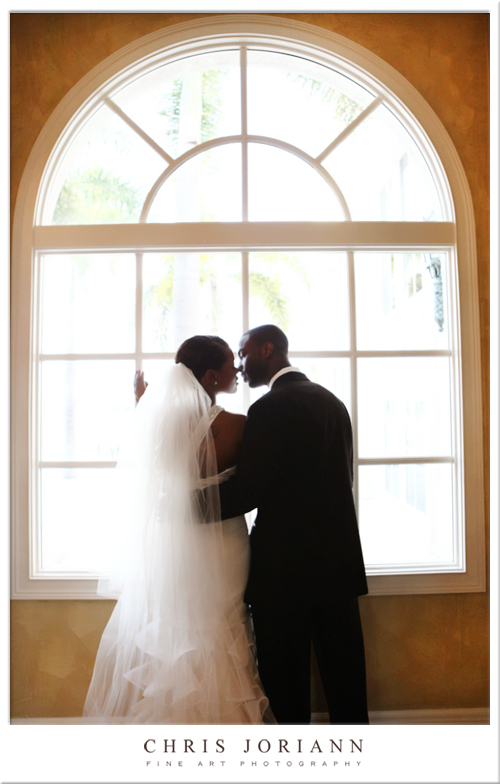 Just as the sun was about to said, they made their exits, as husband and wife. 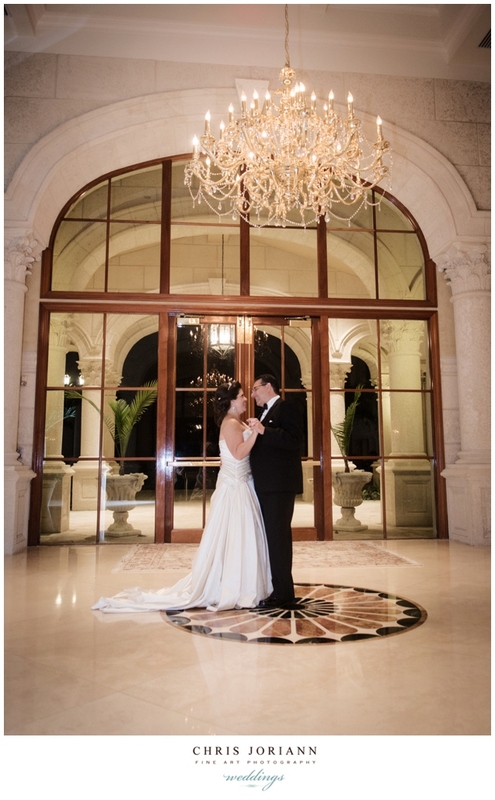 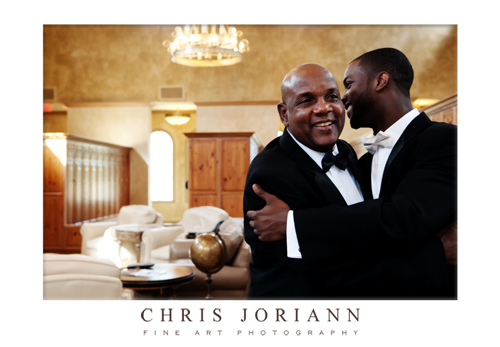 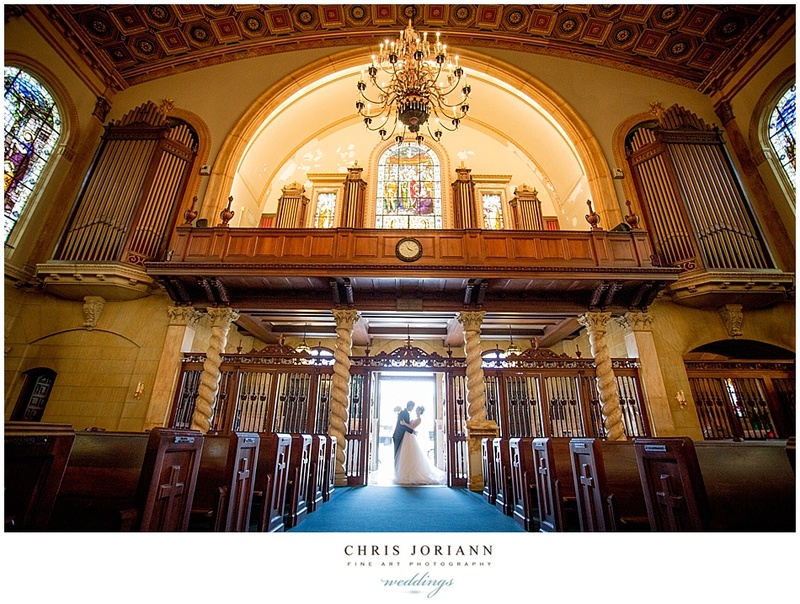 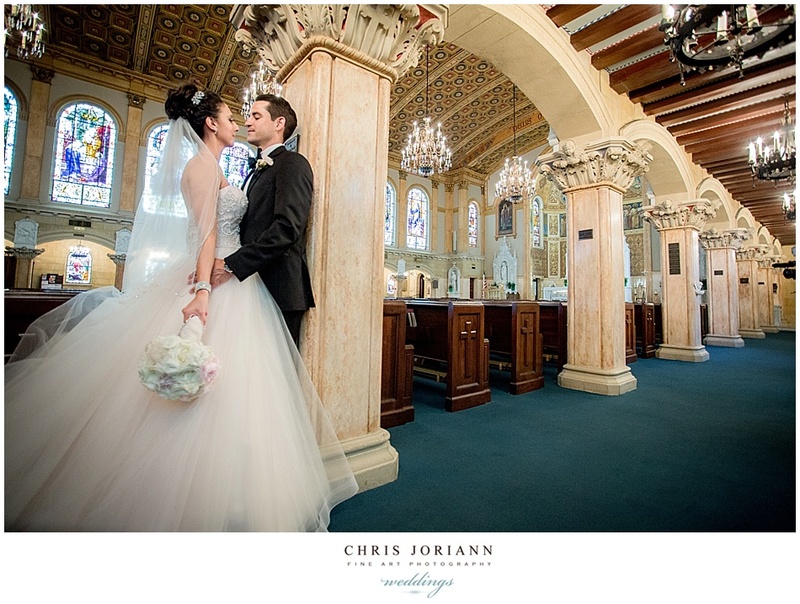 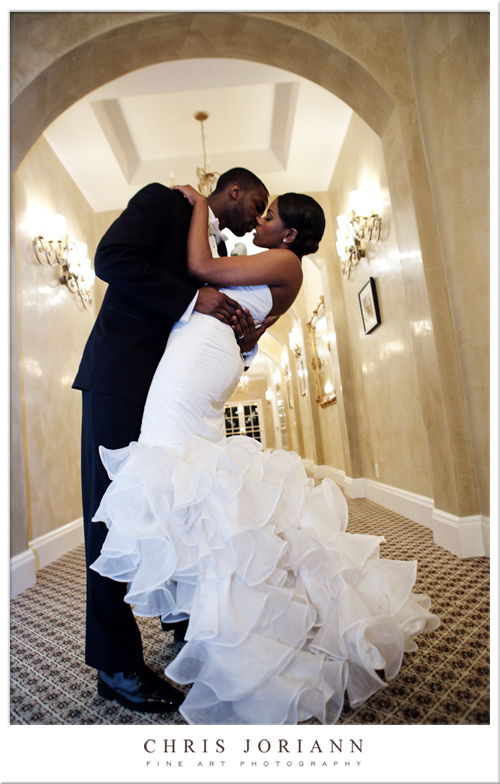 The newlyweds stole one last kiss, before entering the stunningly decorated ballroom. 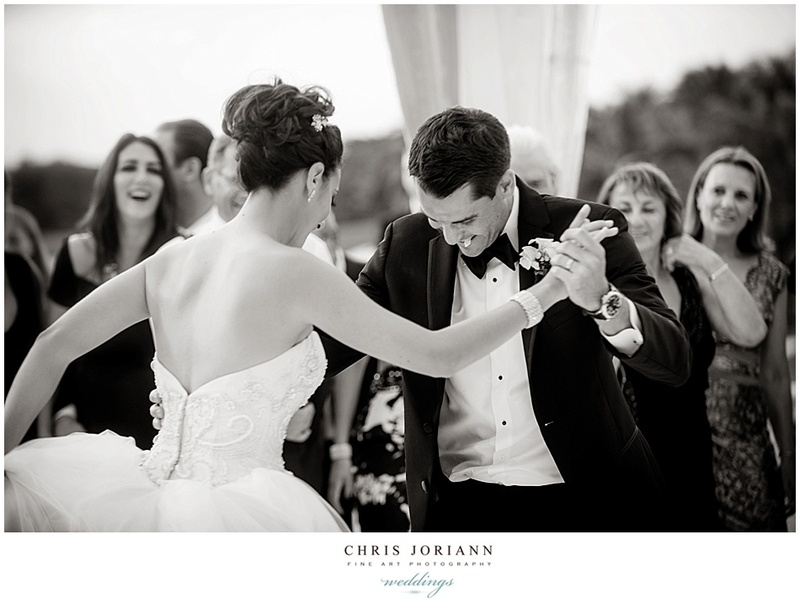 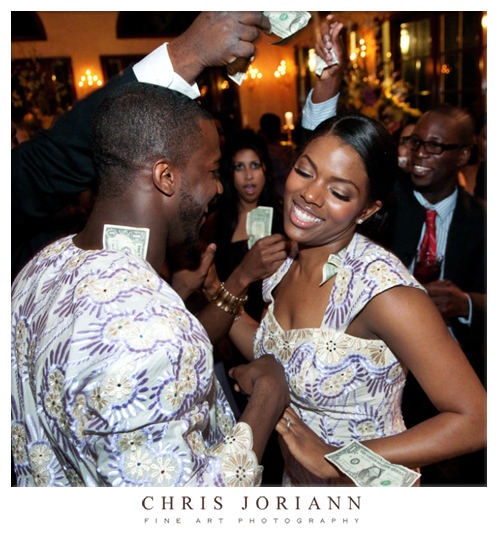 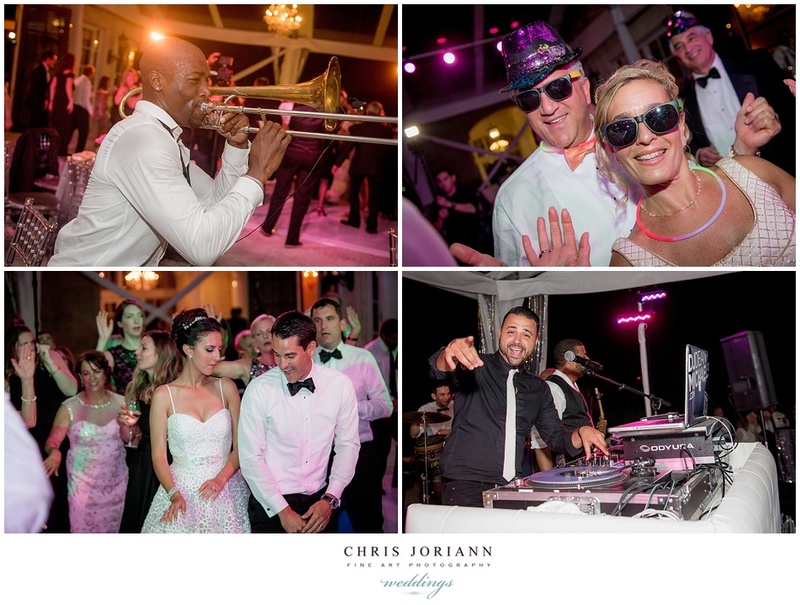 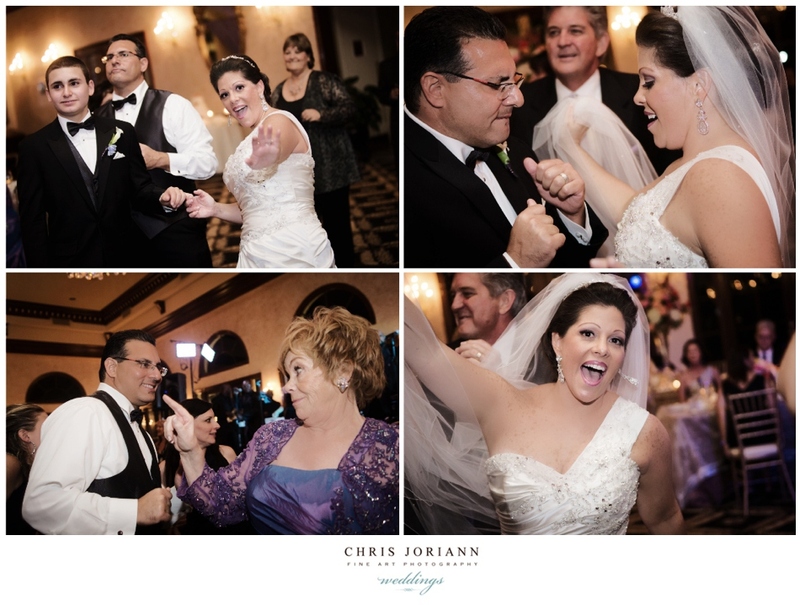 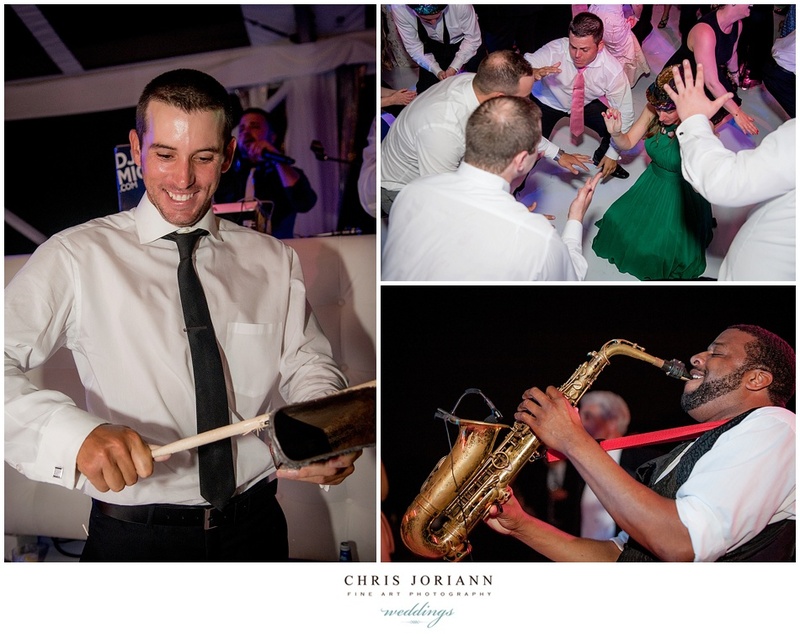 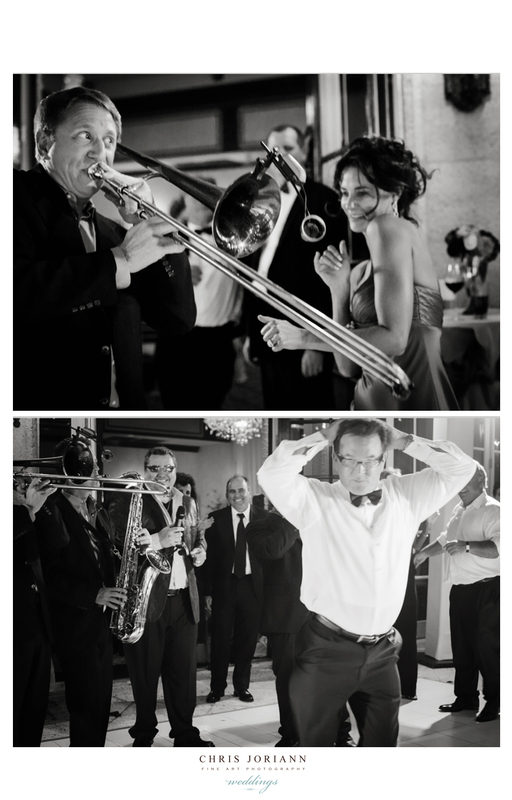 After the couples first dance… the party began.